After asking for an electronic device of his own to play cribbage and watch Super Mario videos on Youtube, Alan now has his very own Kindle Fire. 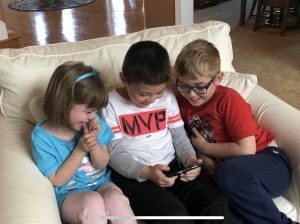 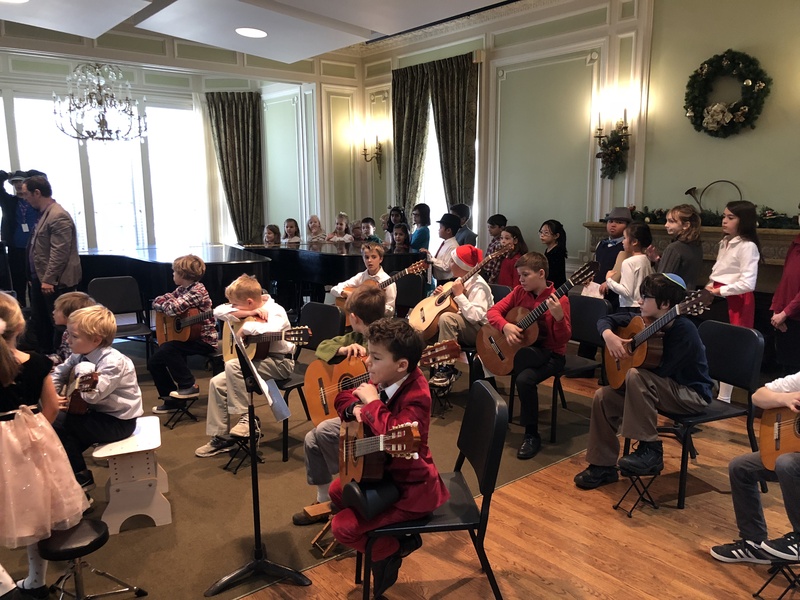 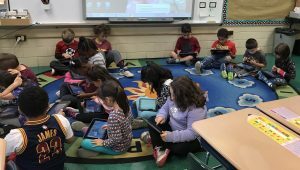 And since he got his Kindle, his violin teacher introduced him to a new app called “Score Creator” — which allows Alan to compose his own songs by combining music notes in an order of his liking. 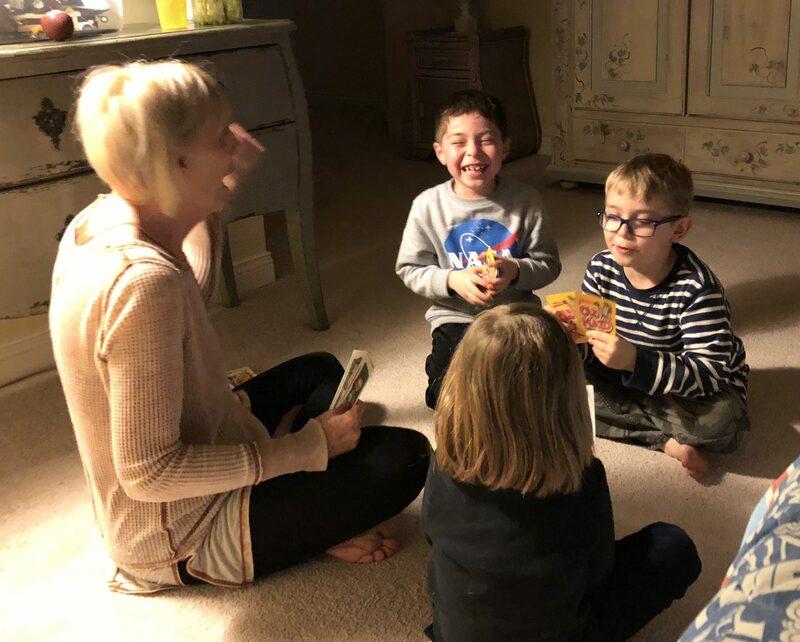 Tonight he let Carleigh and Tyler have a try at making music…and plenty of giggles ensued! 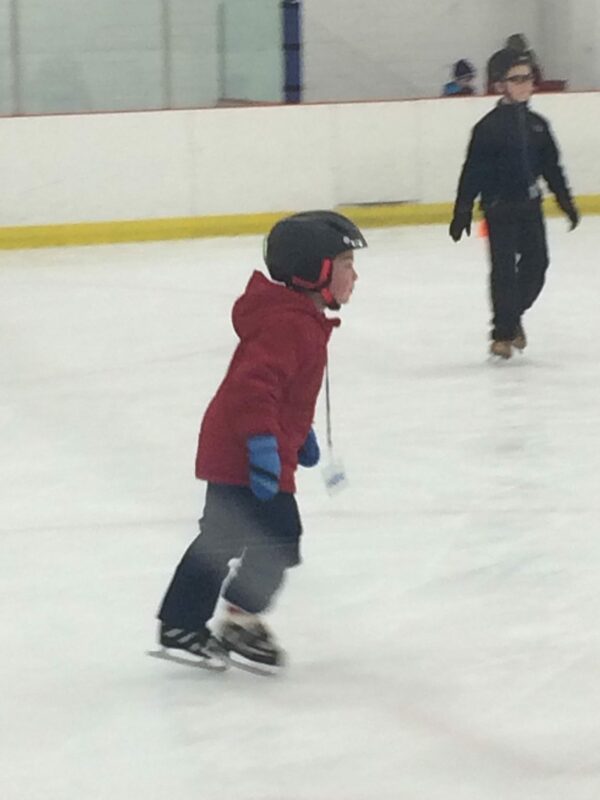 Alan has completed the transformation from beginner ice skater to speed skater! 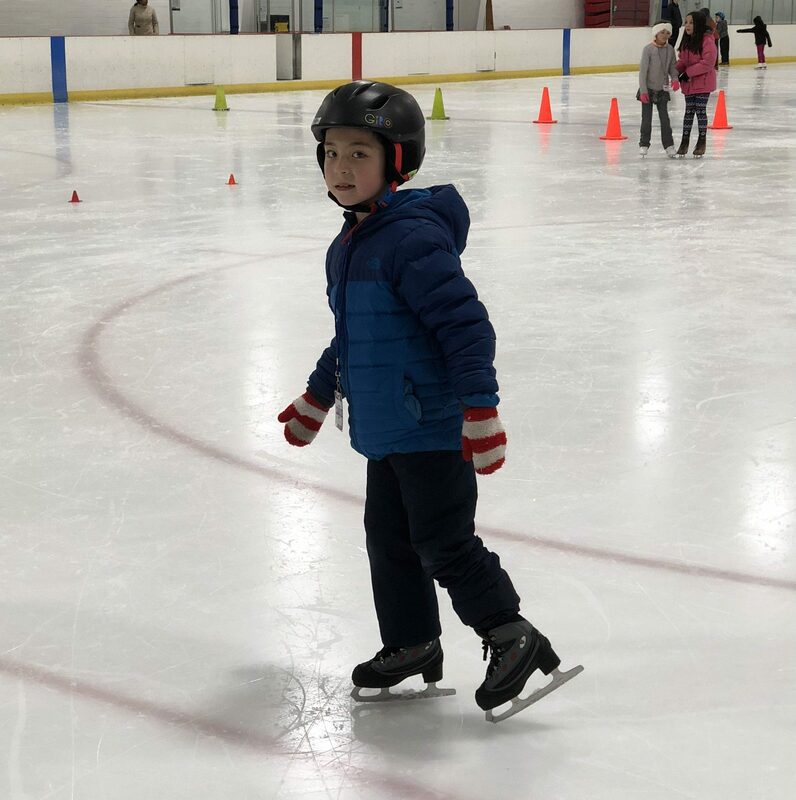 Now Alan can fly down the ice! He still enjoys his Friday lessons at Gilmour, which last through the school year. 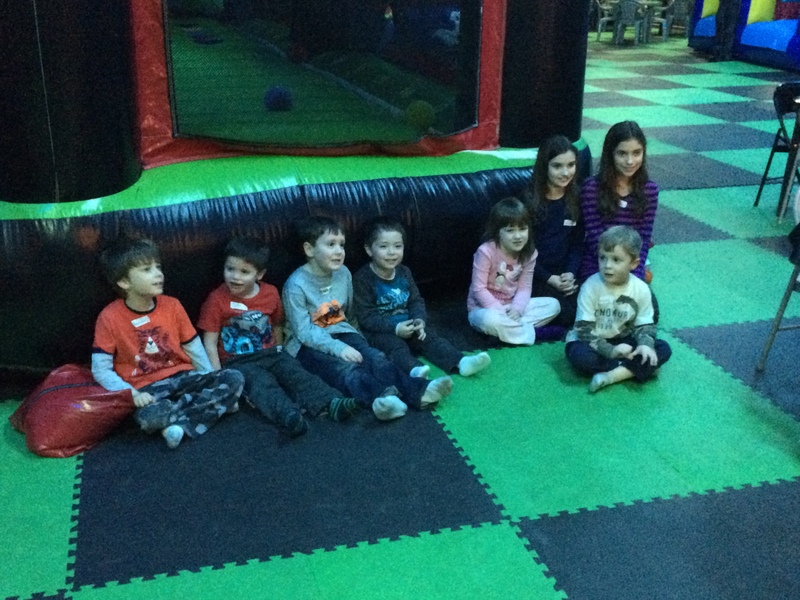 Tonight all the cousins got together for their first Fun ‘N’ Stuff meetup! 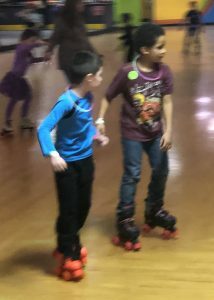 Alan and Mariah enjoyed roller skating. 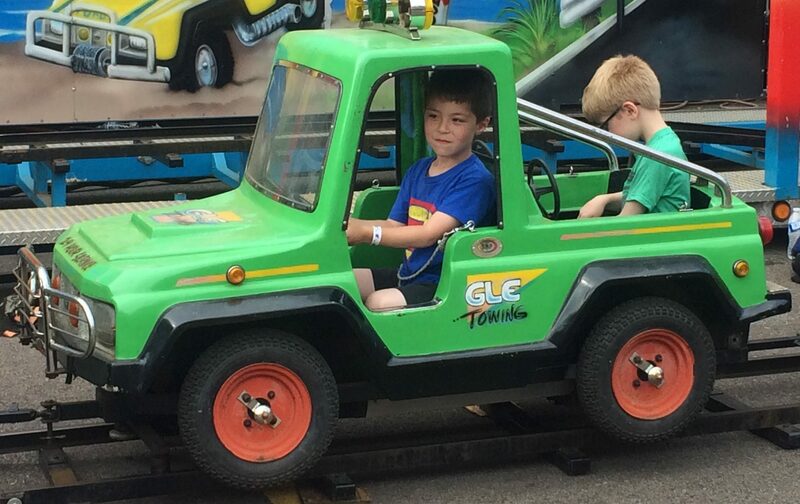 Tyler and Dominic enjoyed bumper cars. 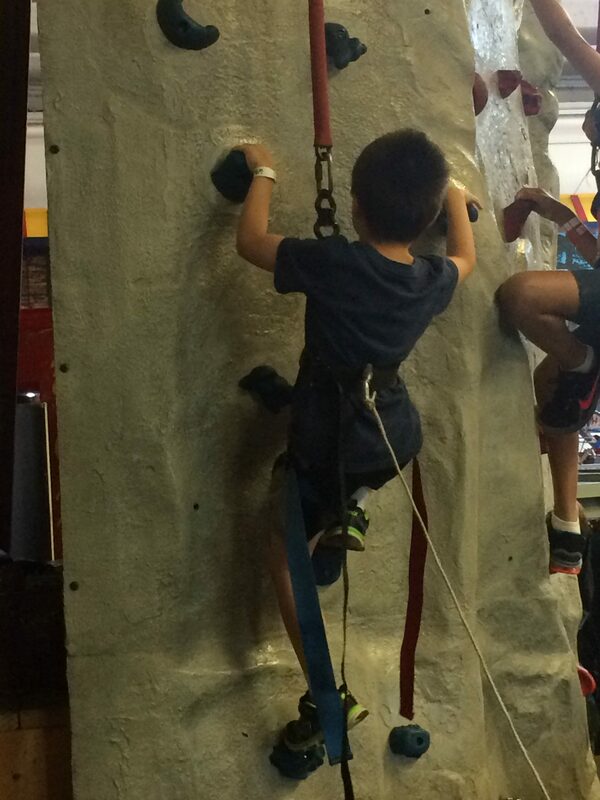 Carleigh (and Alan) enjoyed the ‘playground world.’ And they all really enjoyed eurobungy! 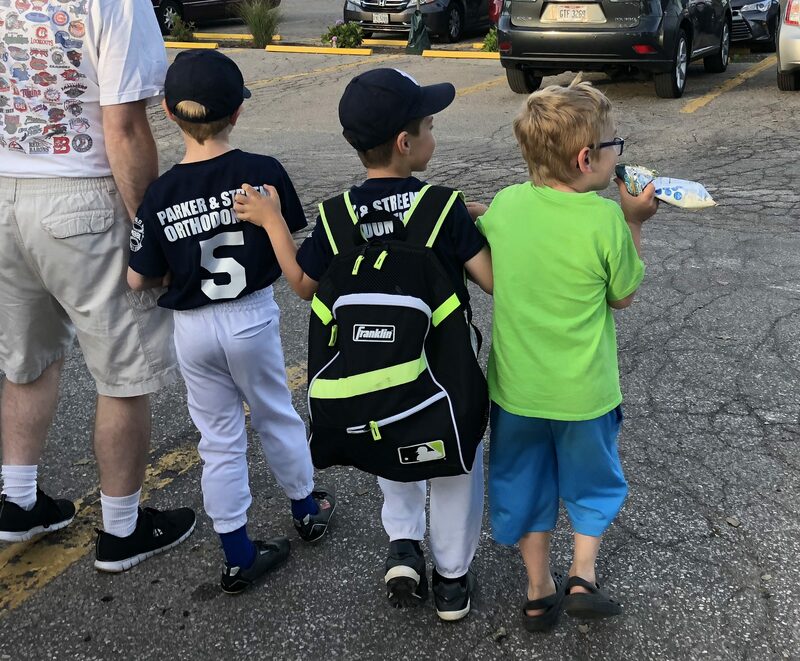 No doubt we’ll be back there together as a group! 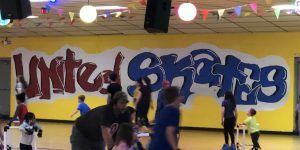 Tonight Alan was back at United Skates for a Millridge PTG Skating Party. 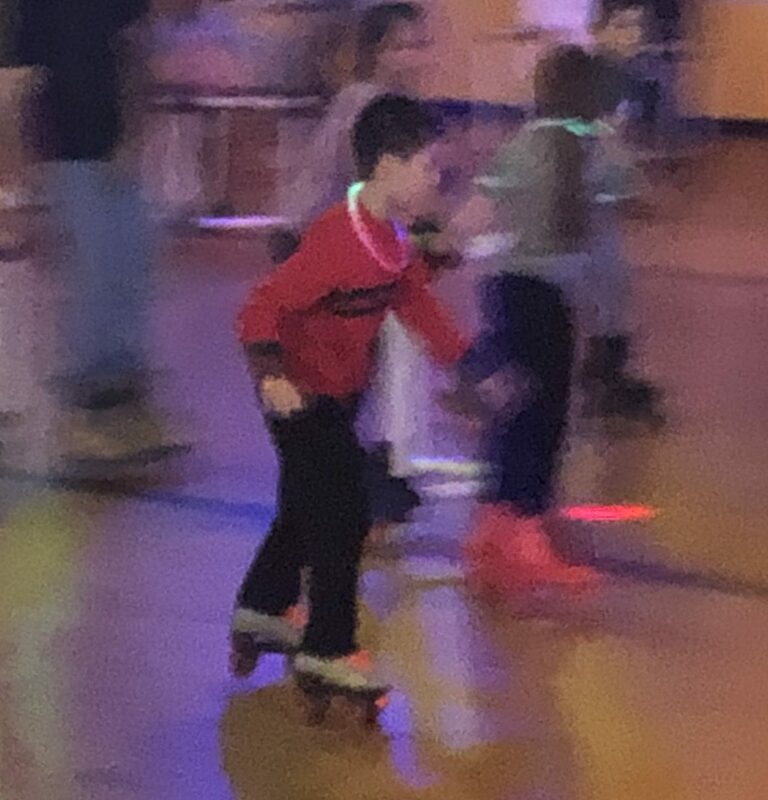 After the fun he had roller skating at De’Onta’s birthday party in January, Alan couldn’t wait to return to the rink. 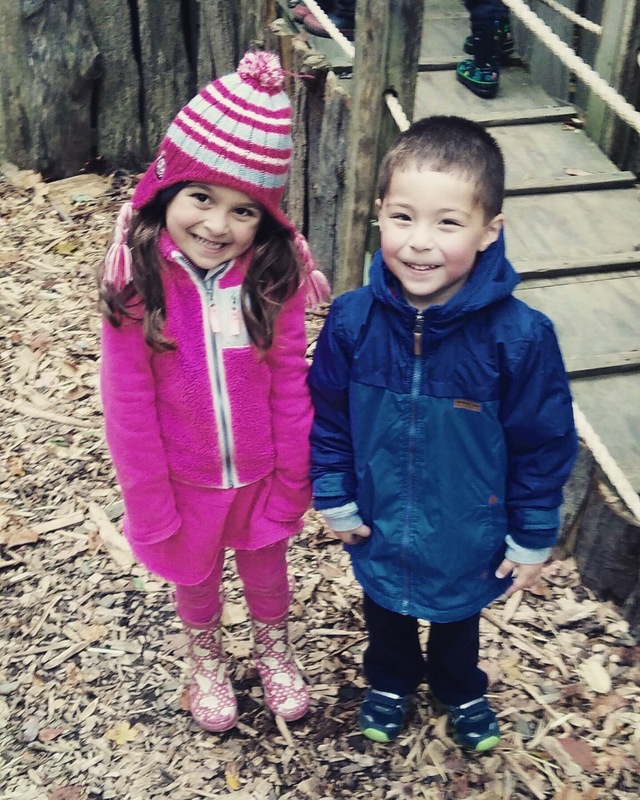 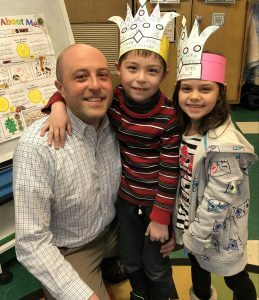 He saw fellow Blue House friends Gabriella and Nicki at the event, plus some other 2nd graders he knew. 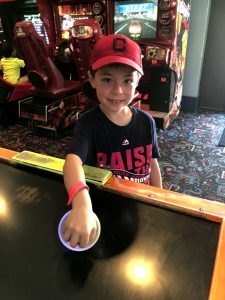 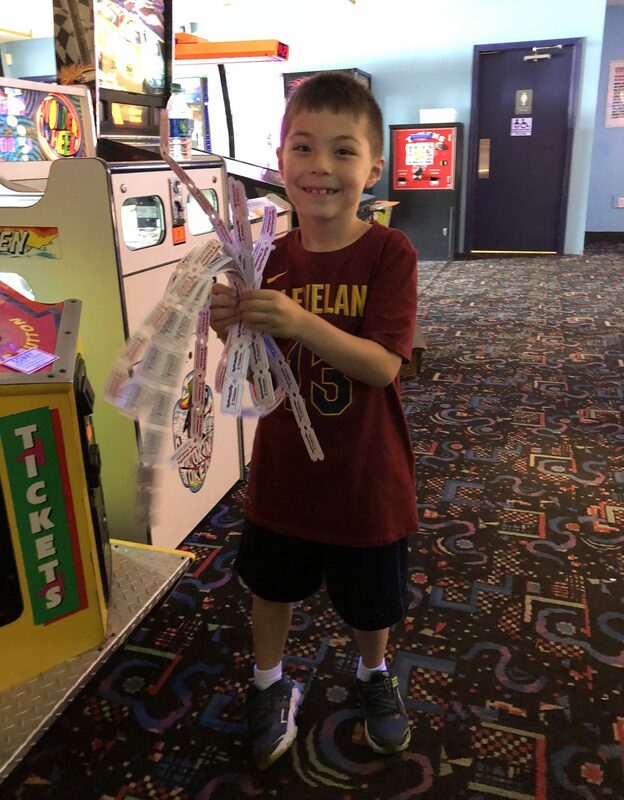 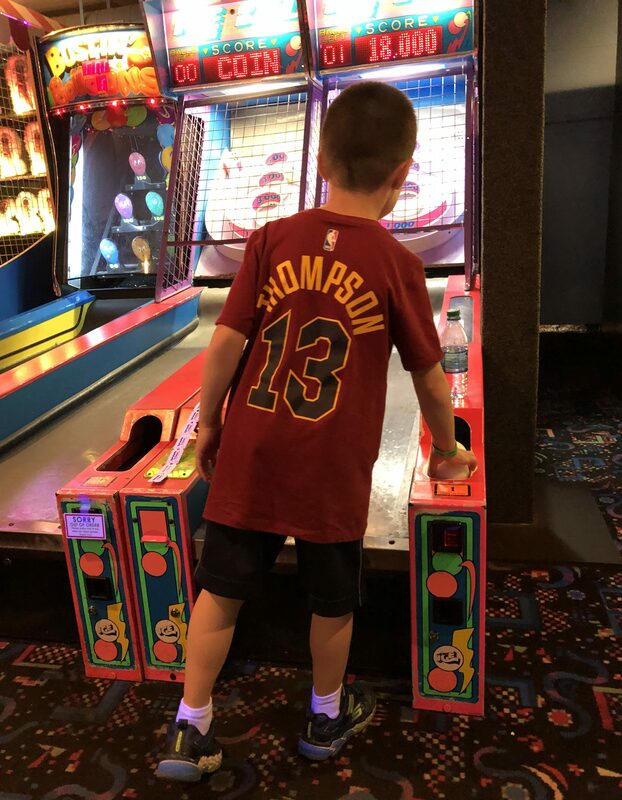 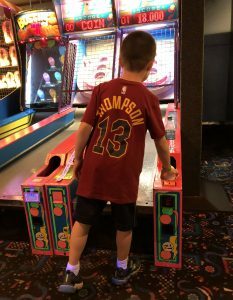 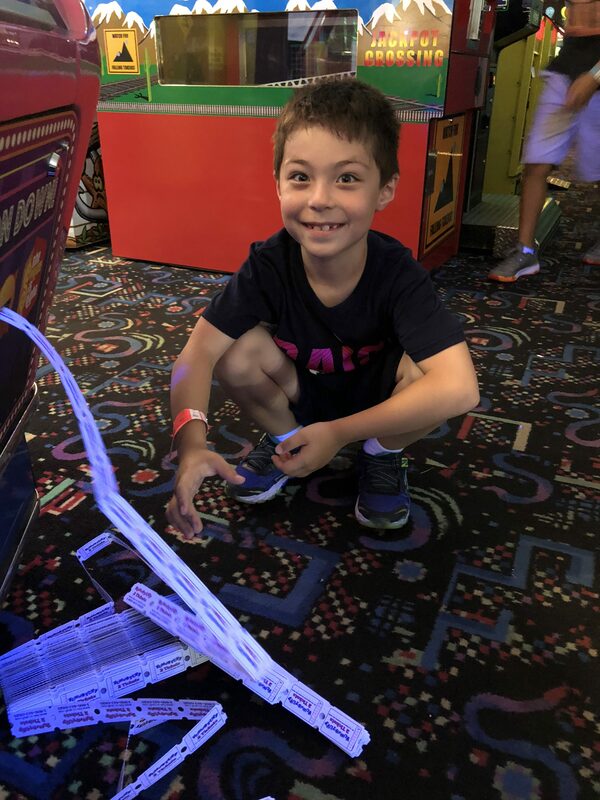 He had a great night skating and playing the arcade games! 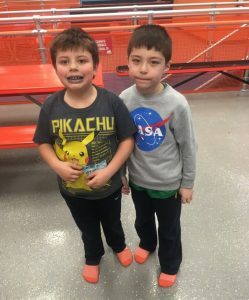 The cousins met up today to celebrate Dominic’s birthday at Sky Zone in Boston Heights. 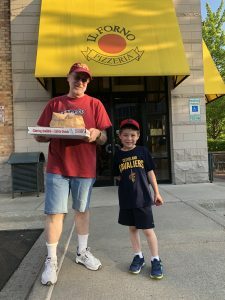 Alan had to be a little late due to piano and violin lessons, but Dominic & Co. waited for Alan to arrive before having cake (which made Alan very happy). Alan still ended up getting in a good two hours of jumping before the evening was over, even with the late arrival. 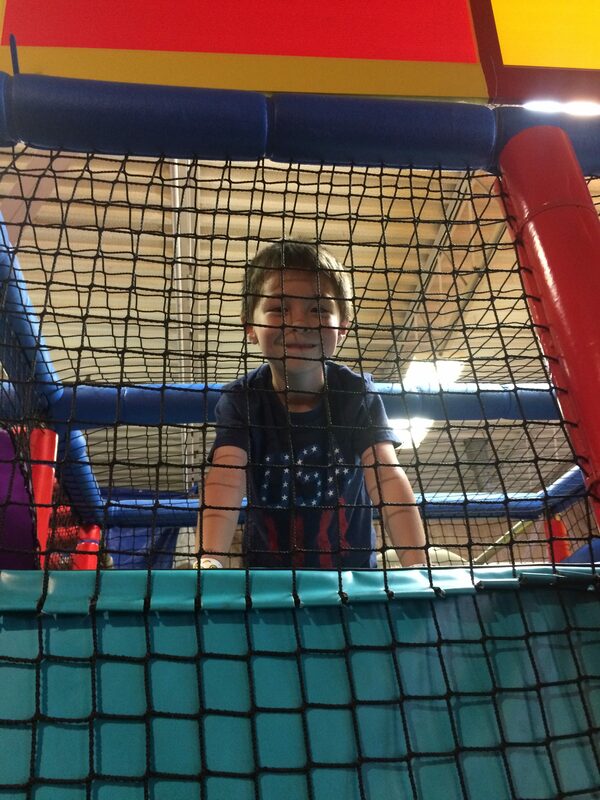 He showed off a new “360 move” and had fun in the pit! Alan finished up a successful first winter at Alpine today with his 6th and final lesson. 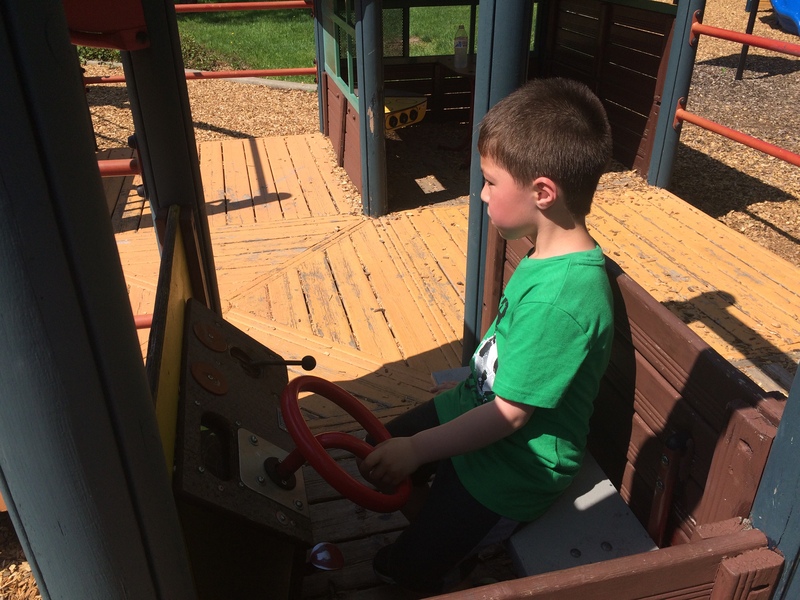 He practiced turns and went down the big hill with the light blue group on a seasonable day. 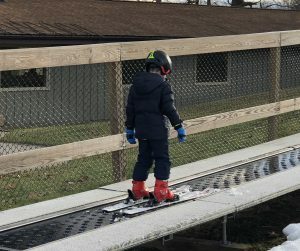 After class, he rode the lift three more times for three fast runs, before sliding to a final stop. 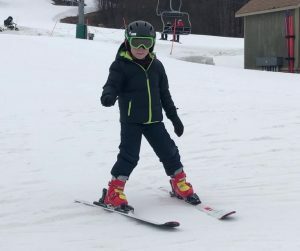 Alan did great for his first winter on skis! He’ll definitely be back next winter. 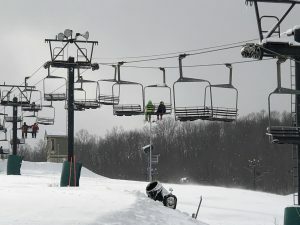 The pendulum swung back to unseasonably warm temperatures today at Alpine. 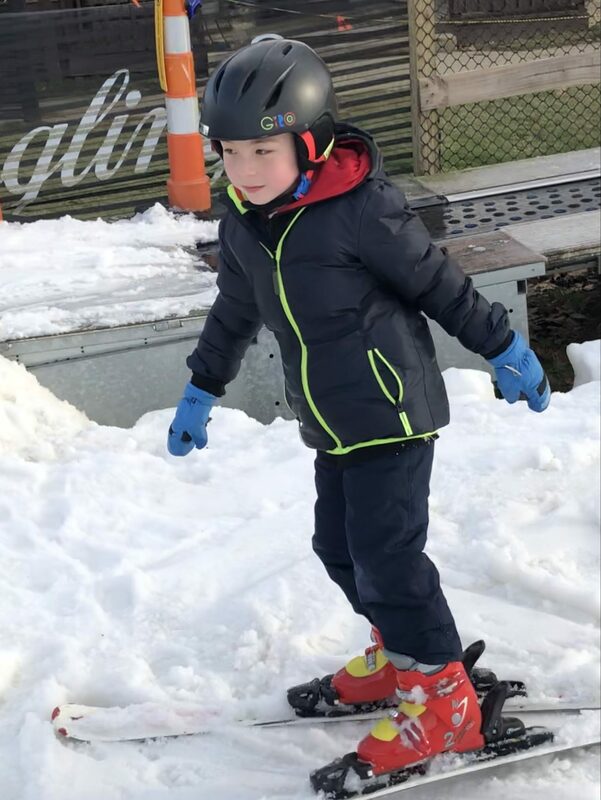 Fortunately lessons went on as planned. Alan maneuvered around cones and then was rewarded with a ride on the longer ski lift to an even bigger hill with Allister. 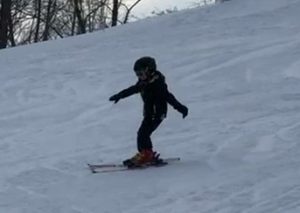 The top of the hill was out of sight so I could only record the end of his lengthy run. 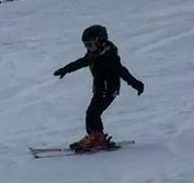 Alan advanced another level and will be skiing with the light blue group next week! 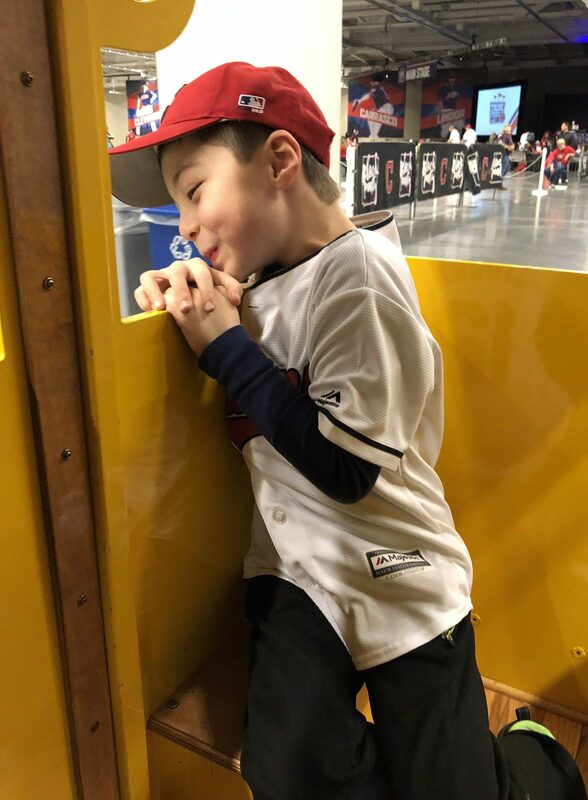 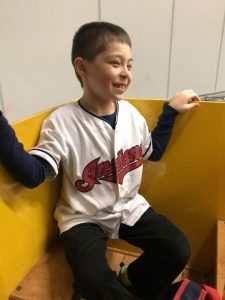 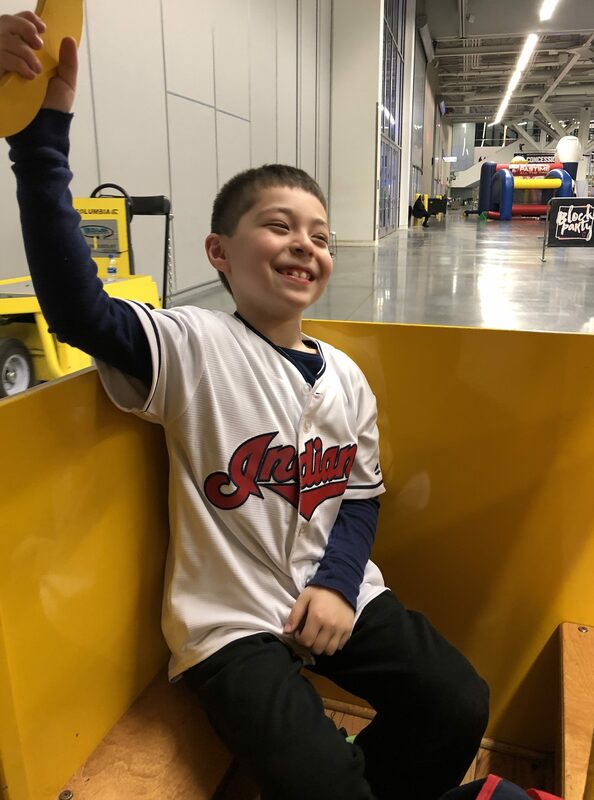 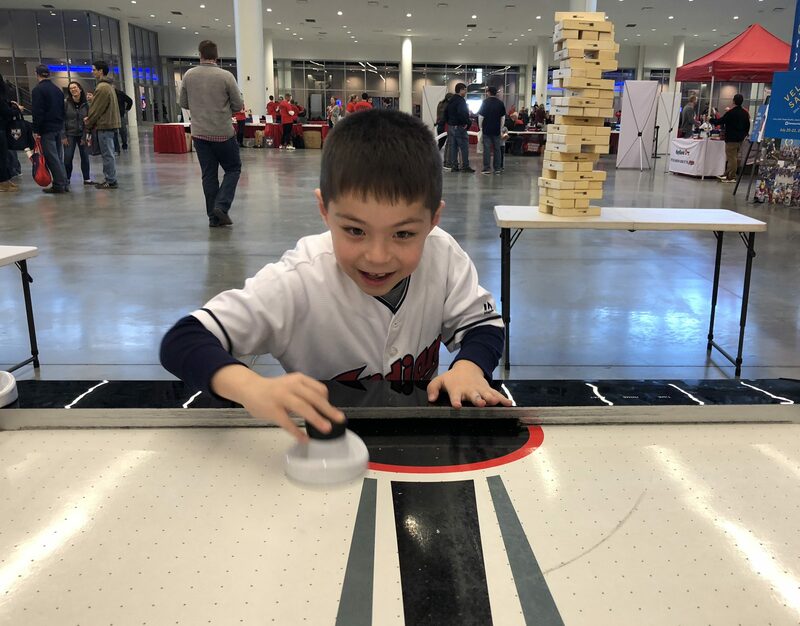 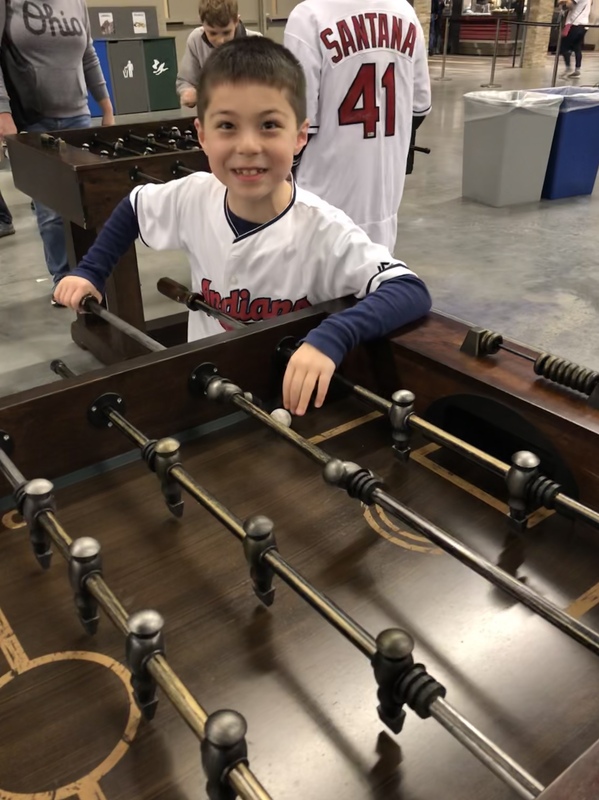 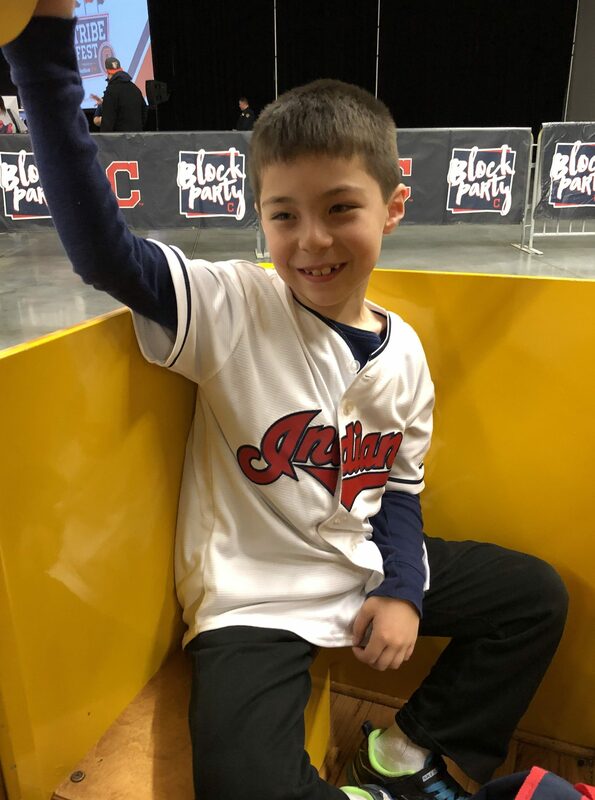 In what’s quickly becoming a favorite winter tradition, Alan attended Tribe Fest today at the Cleveland Convention Center. 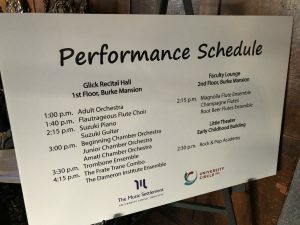 The other new event was a performance training course. 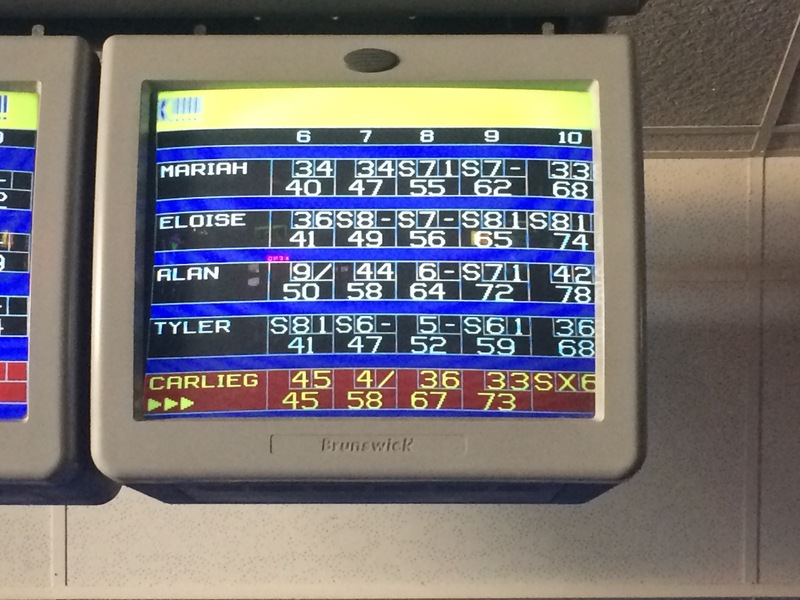 Alan ran a race against me, then held his own in a race against some bigger kids. 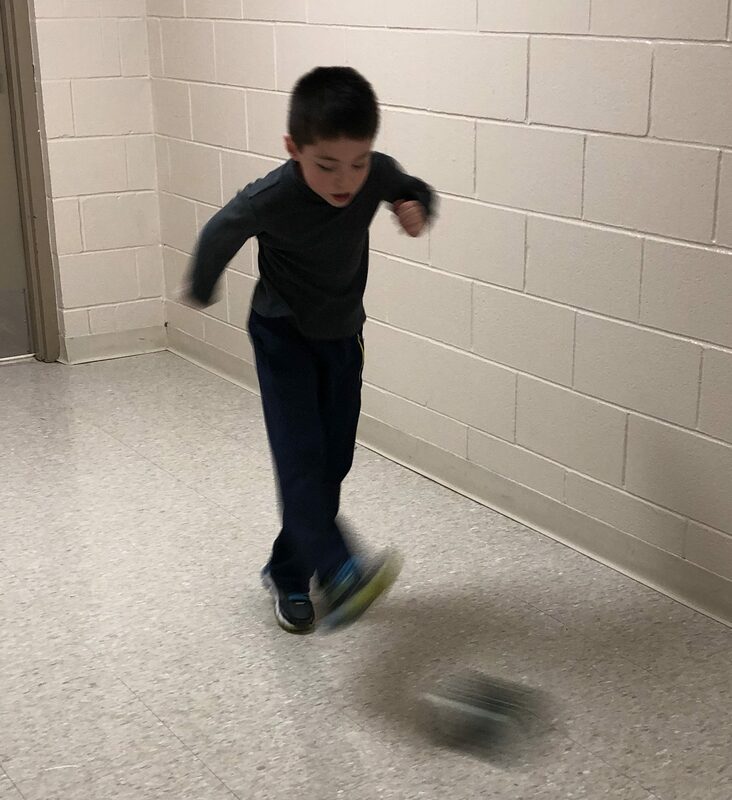 He never misses a chance to show off his speed. 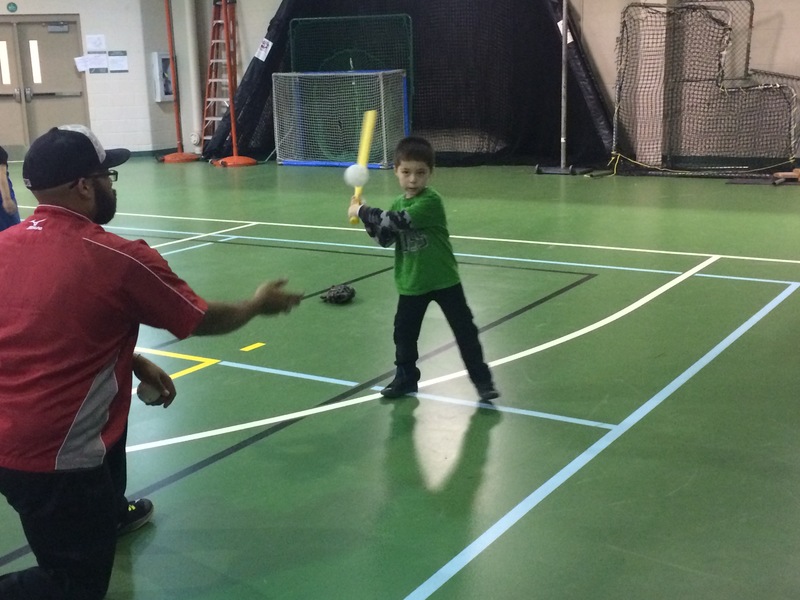 Alan practiced his throwing and batting too. 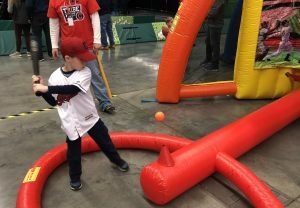 He continued his tradition of throwing a perfect strike at Tribe Fest not once but twice. 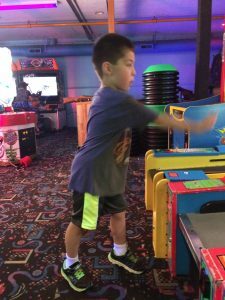 In the game area, Alan had to get in some rounds of darts, air hockey and foosball. Alan would’ve stayed all day if he could! Skis or skates, it doesn’t matter — Alan has it covered. 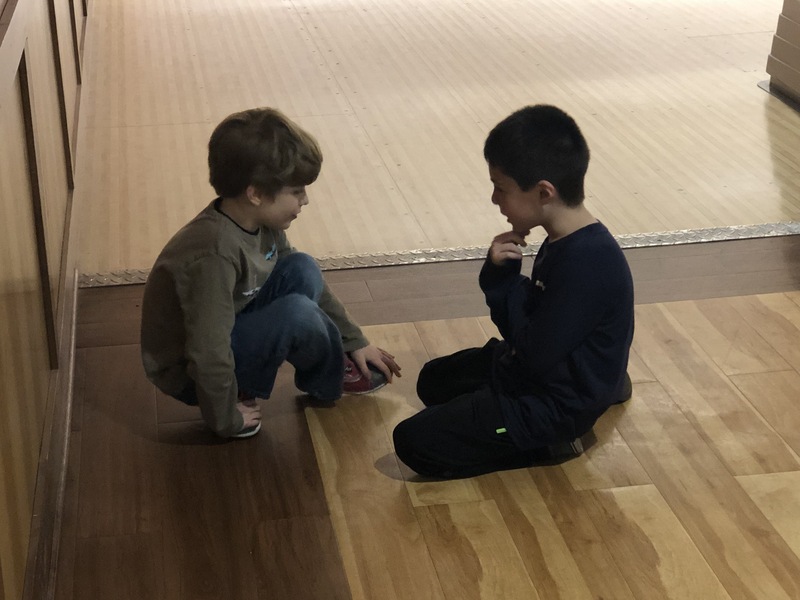 Solid footing is boring for Alan, so he took to the roller rink today for classmate De’Onta’s birthday party at United Skates in Wickliffe. 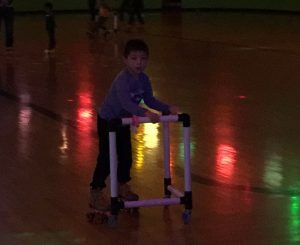 He took a little time to warm up, but before long Alan found his rhythm and skated smoothly. 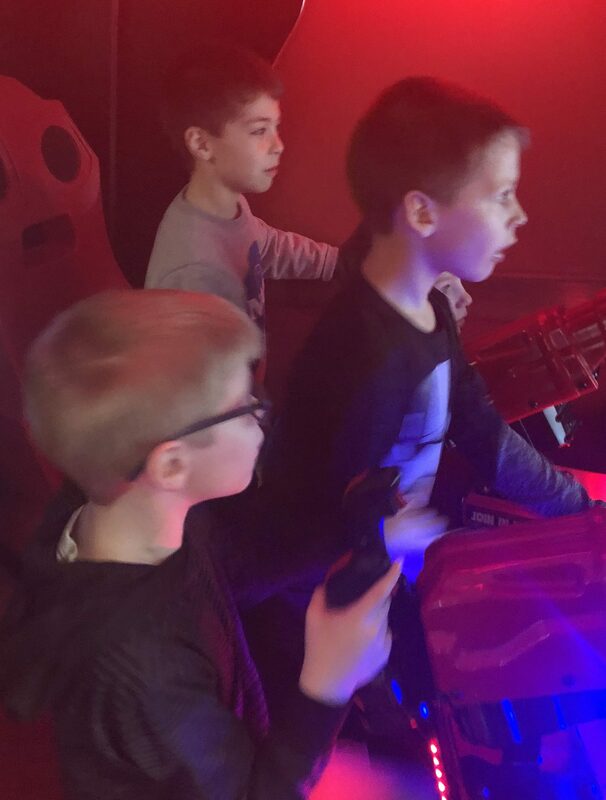 Alan also enjoyed the arcade games with his friends. 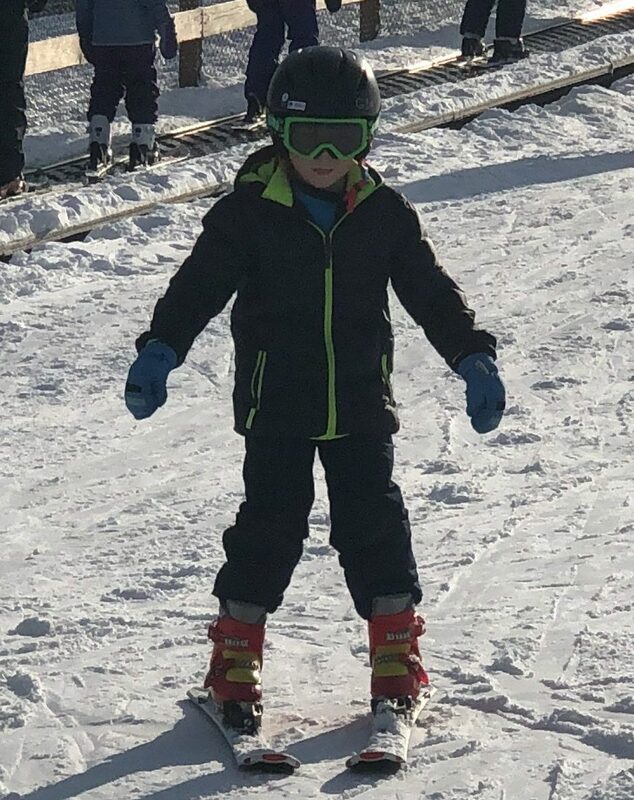 Alan made his debut on the slopes today and he did great! 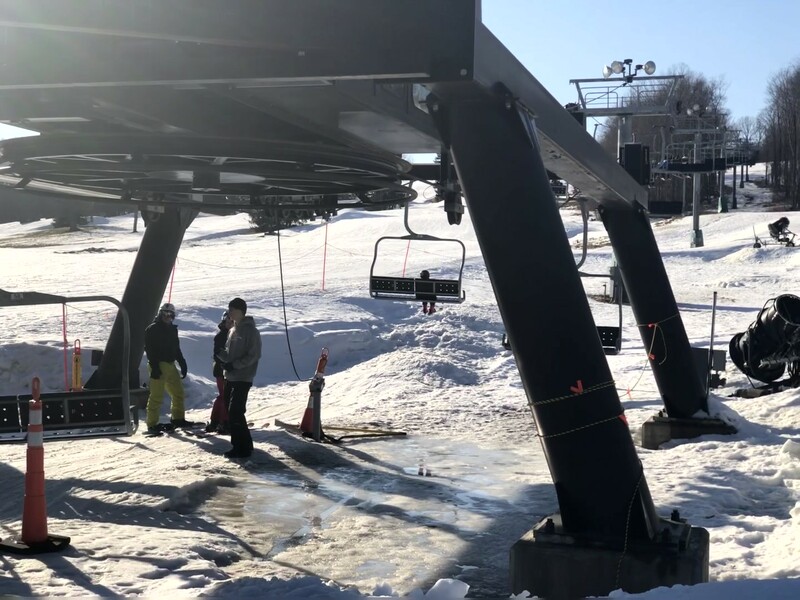 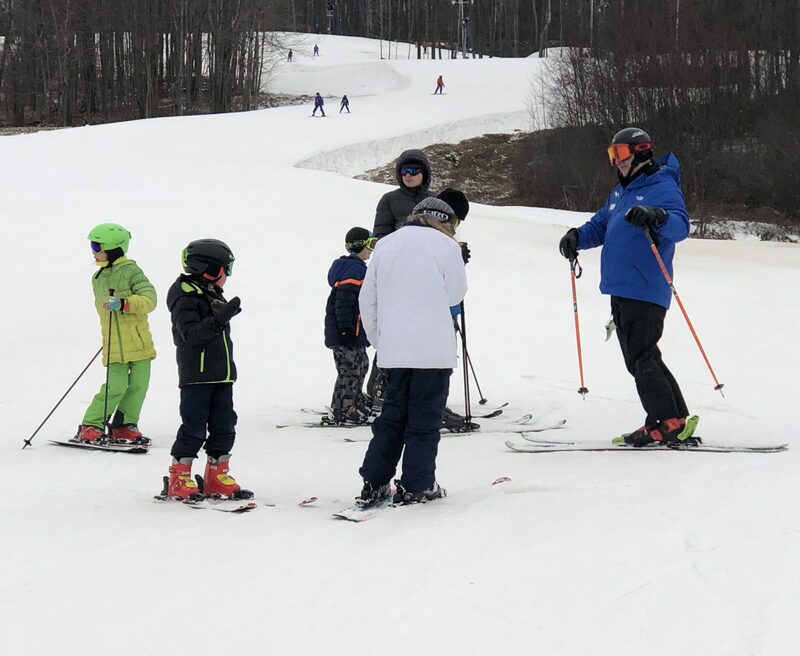 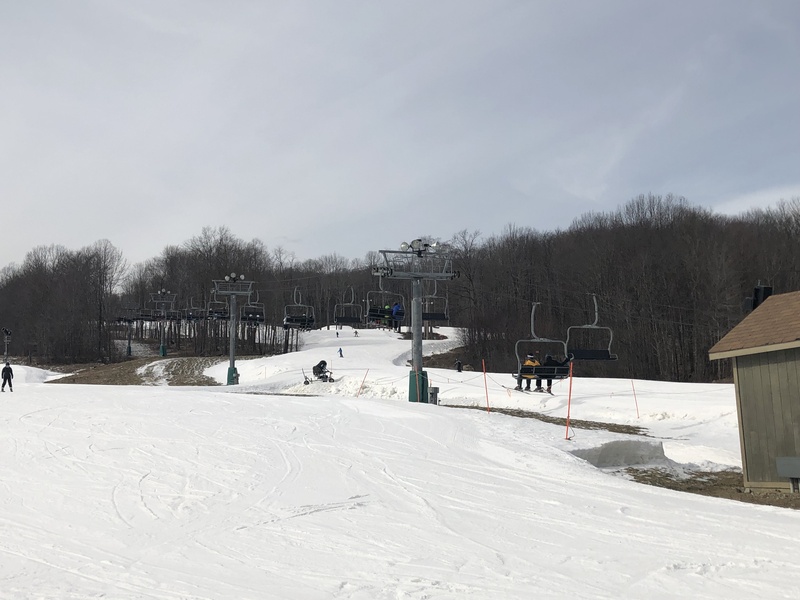 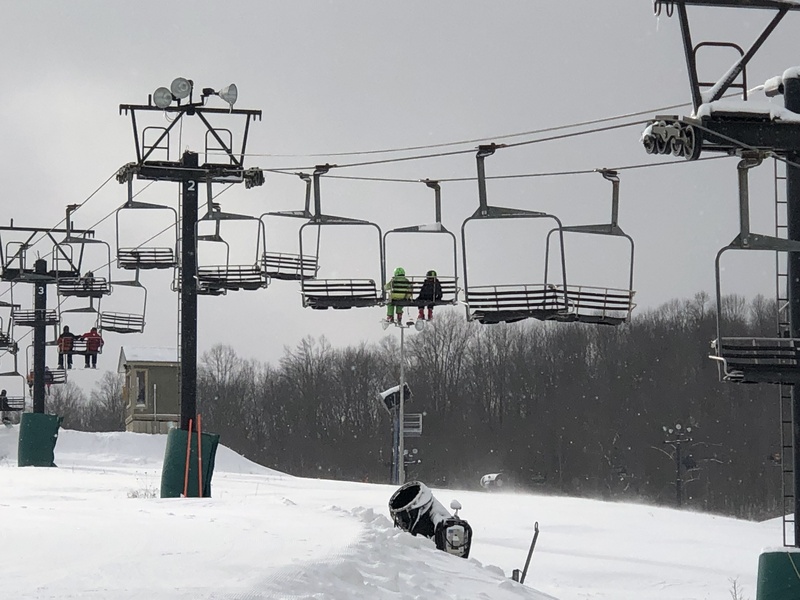 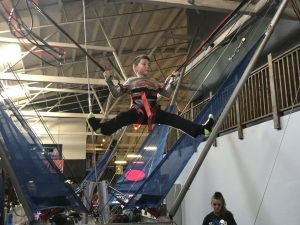 During the first of six Sunday afternoon sessions at Alpine Valley Ski Resort in Chesterland, Alan learned how to balance, move, and stop on skis. He appeared to have an edge over the other first time skiers in his group in ability to stay upright, perhaps because of the balancing skills he’s developed from ice skating. After the 2-hour lesson on an unseasonably warm day, Alan took the “magic carpet” to the top of the hill to show his parents that he could ski on his own. 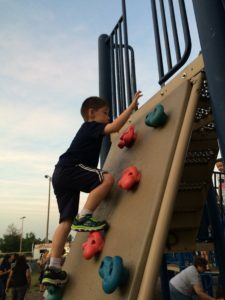 He was so brave! 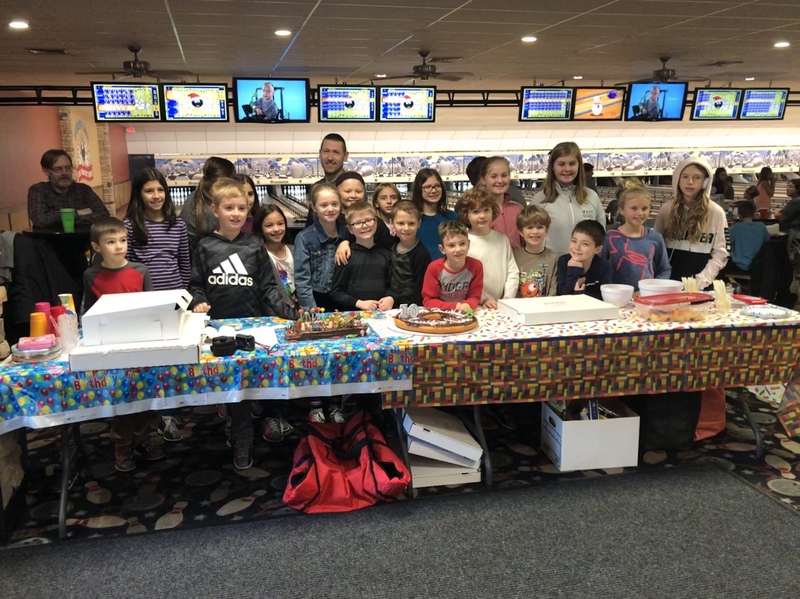 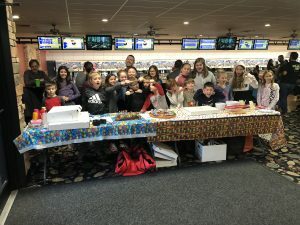 Alan returned to Wickliffe Lanes today for a joint birthday party for Cassidy and Xavier. The party date was picked to be in between Cassidy’s birthday (November) and Xavier’s (February). Alan picked up one spare on the day and had a great time seeing his friends, who he’s missed while on winter break. 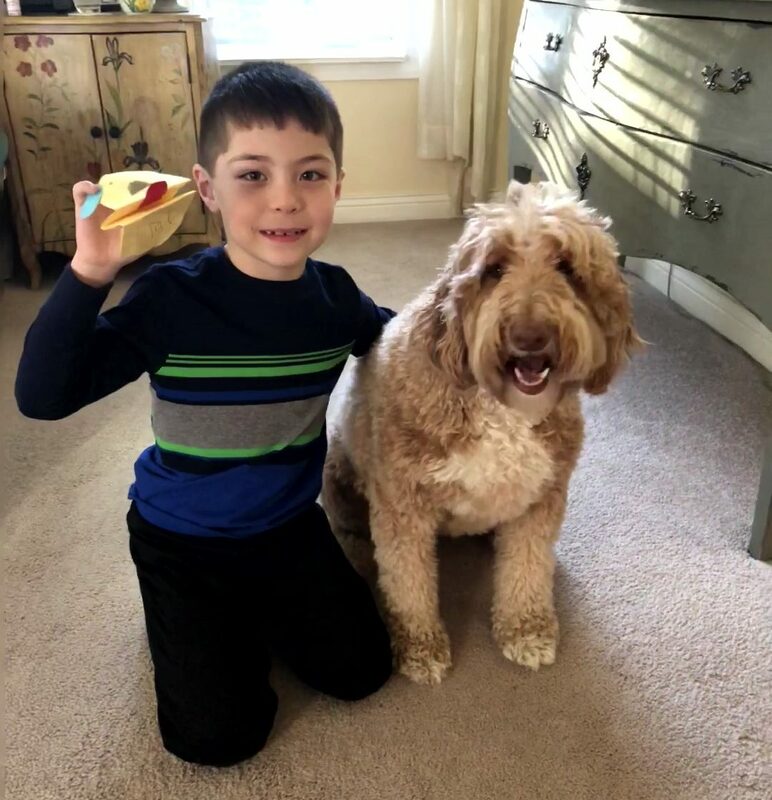 That includes Brady, who Alan set a play date with on January 2nd. 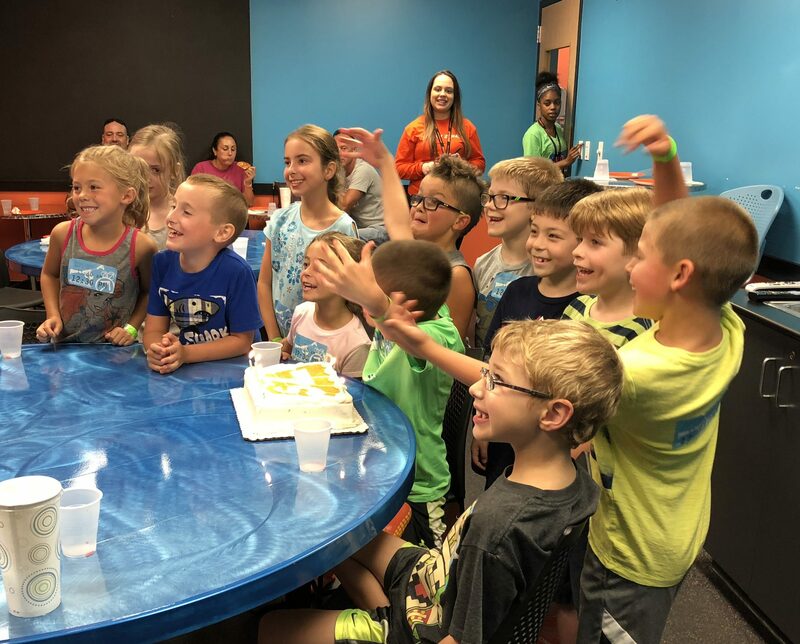 The kids took one serious and one funny photo before eating cake and the famous “giant donut” that is always a part of Xavier’s party. 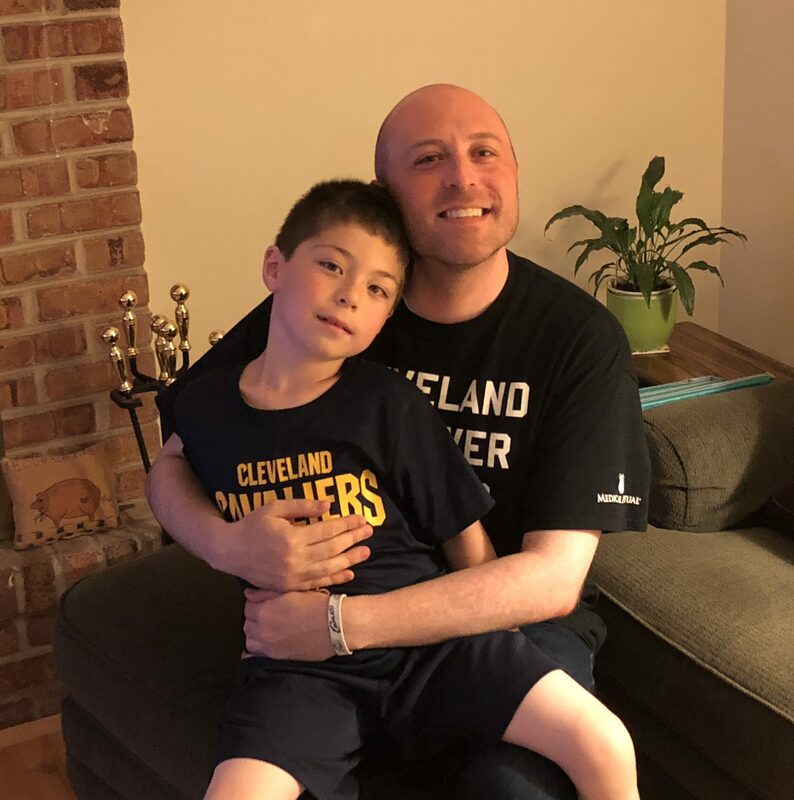 The Browns’ final game of the season was on TV during the party, and Alan celebrated when he saw the Browns score their first TD of the game. 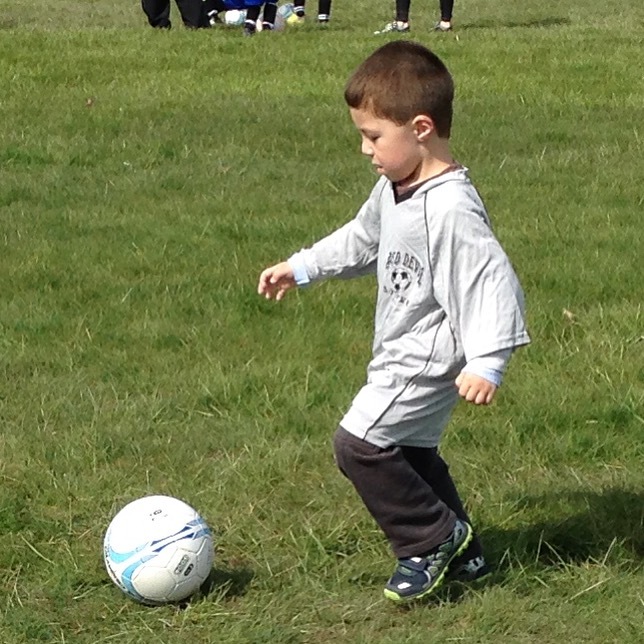 Alan will miss football this winter for sure. Since I was already off work for the Winter Workshop, next I headed over to Gilmour to watch Alan’s ice skating lesson. He had 30 minutes of free skating, followed by a 30 minute lesson, followed by 30 more minutes of free skating. Alan can sure skate fast now! The Year of the Sky Zone Birthday Party continued today with Noah taking his turn as host and birthday boy. 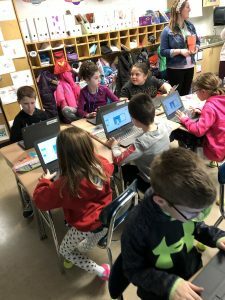 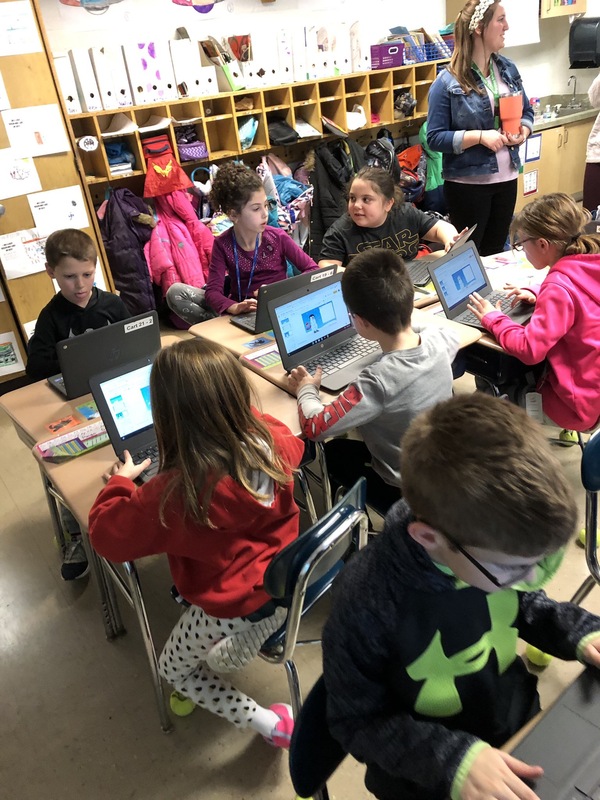 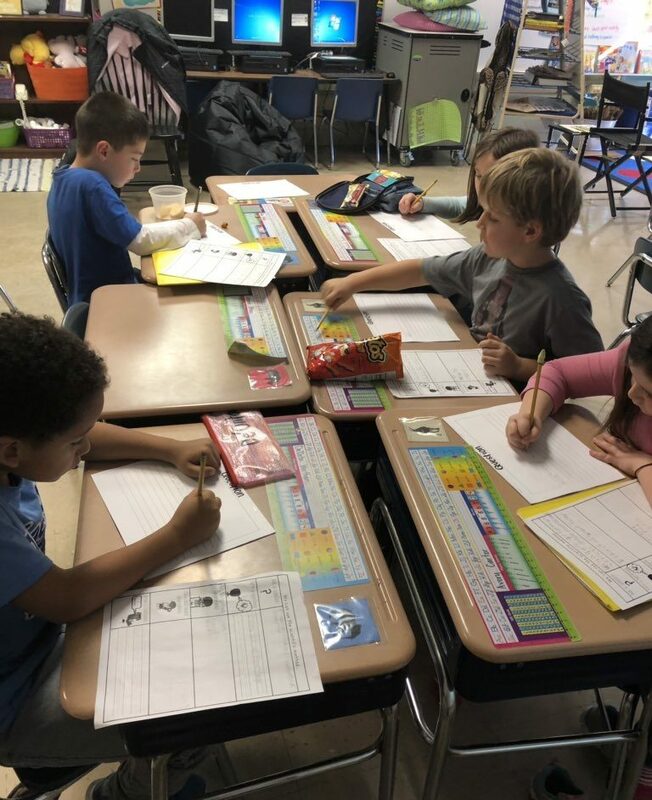 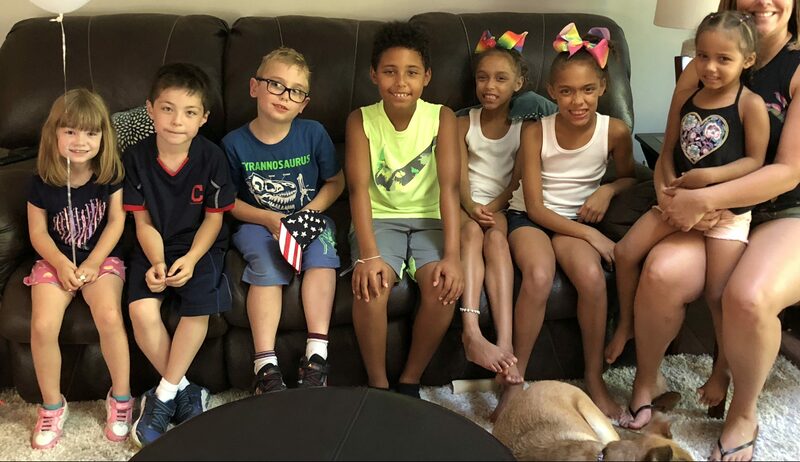 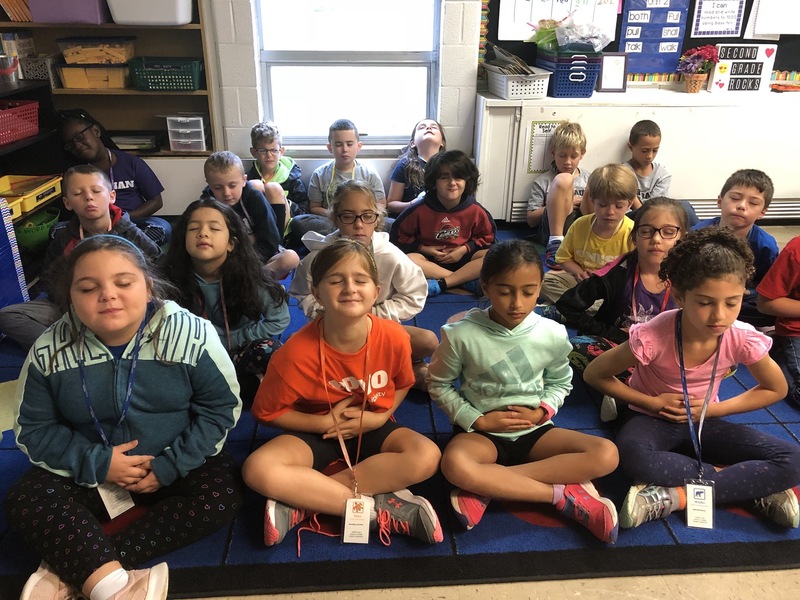 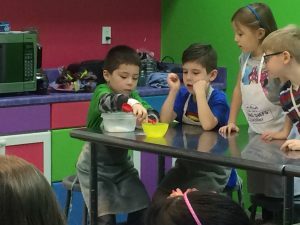 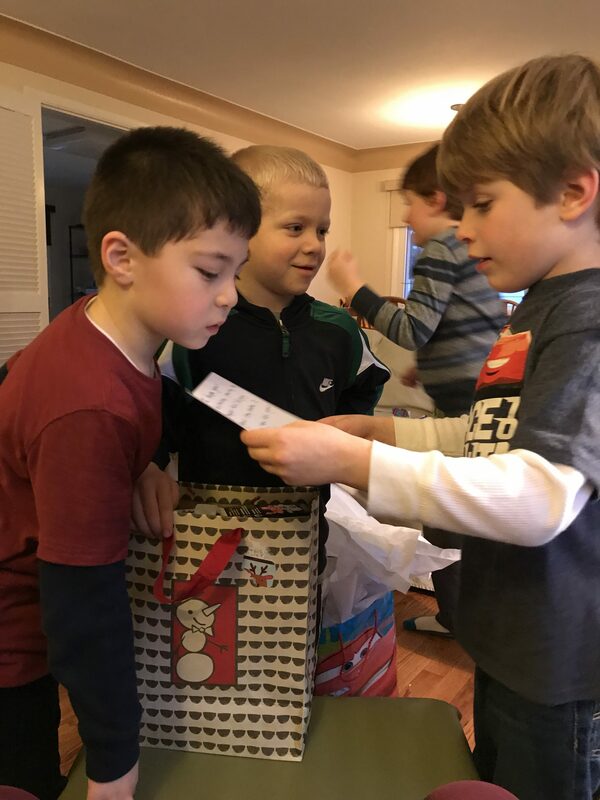 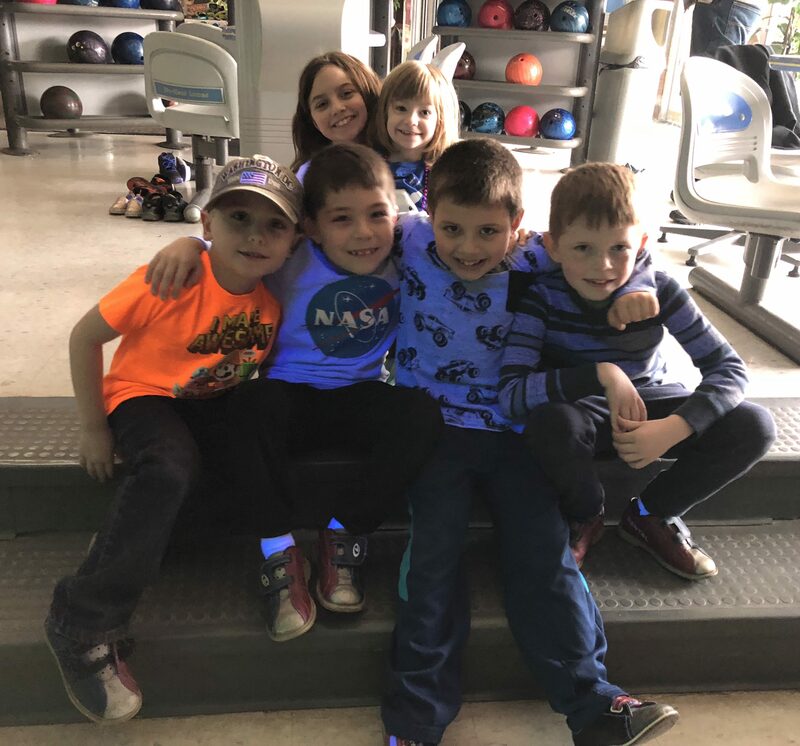 The usual suspects – Alan, Noah, Brady, Xavier and Grady – were together again, along with a few other Millridge second graders. After jumping and playing dodgeball, the kids played “Heads Up, Seven Up” while waiting for cake. 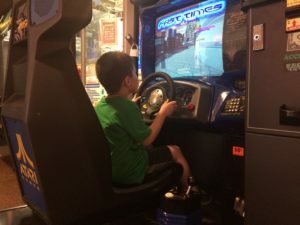 It was Alan’s first time playing, and he loved it. 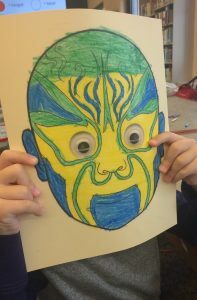 Turns out he has a pretty good poker face! 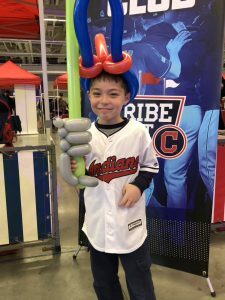 -Attending Indians games at Progressive Field! 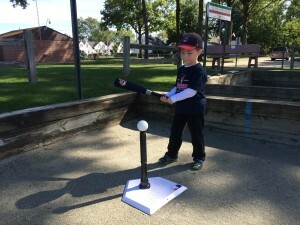 -Batting practice at the Mayfield Community Park and racing Daddy around the bases on every 5th hit. -The Cleveland National Air Show! 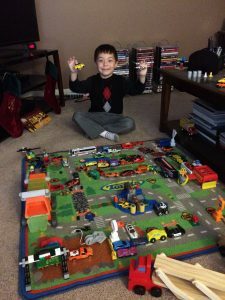 -Making Lego and train cities. 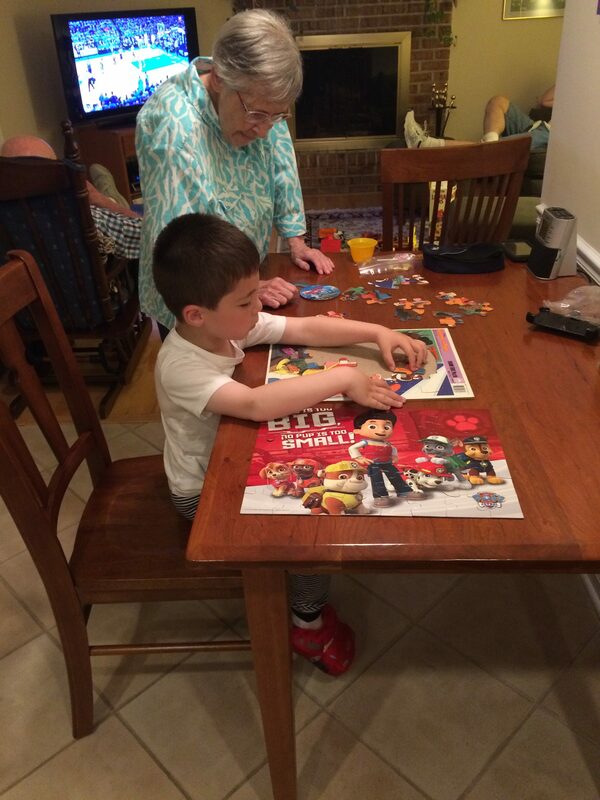 -Playing with Tyler and Carleigh Saturday nights at Grandma Debbie’s! 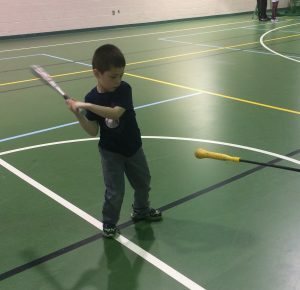 -Setting mini bat “matchups” of MLB teams every Monday and Friday nights during baseball season. 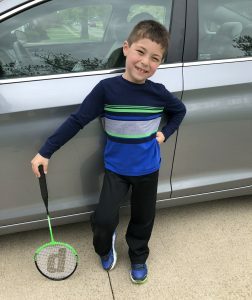 -Playing badminton and tennis with our new rackets. 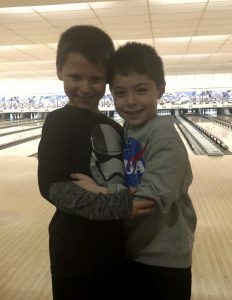 Alan and Brady, best friends in Mrs. Harris class during the week, got together twice this weekend too. 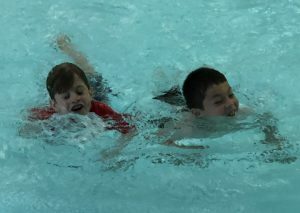 On Friday they swam together at the Mayfield High School pool. Then on Sunday Brady came by to see Alan’s Hot Wheels Super Ultimate Garage. 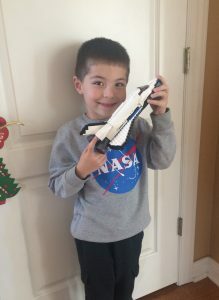 Alan had been waiting a long time to show it to Brady! 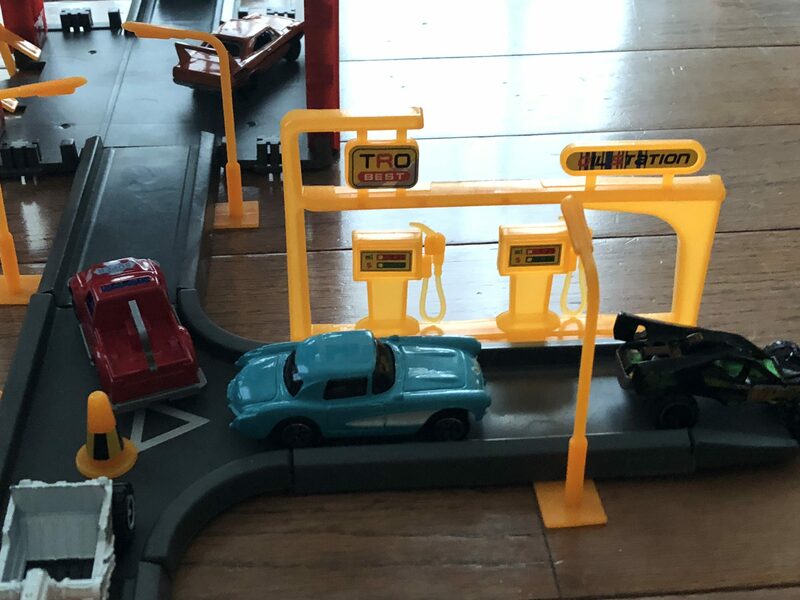 But they didn’t stop there. 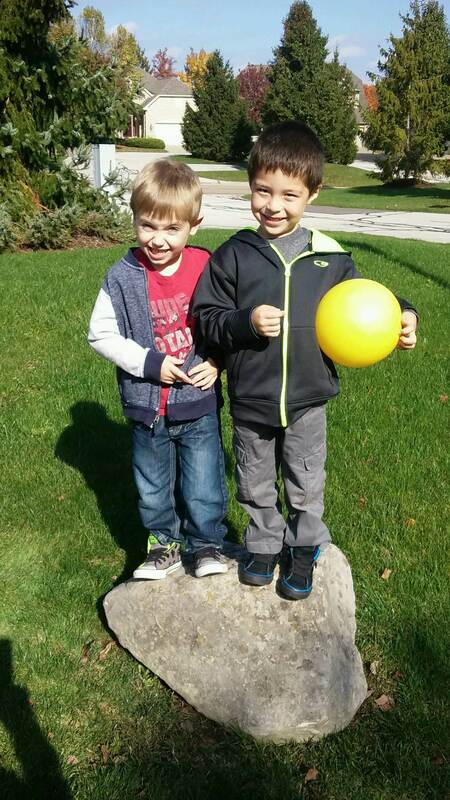 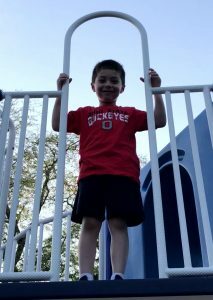 The boys played together on the Highland Heights playground, then played at Brady’s house for a couple more hours! 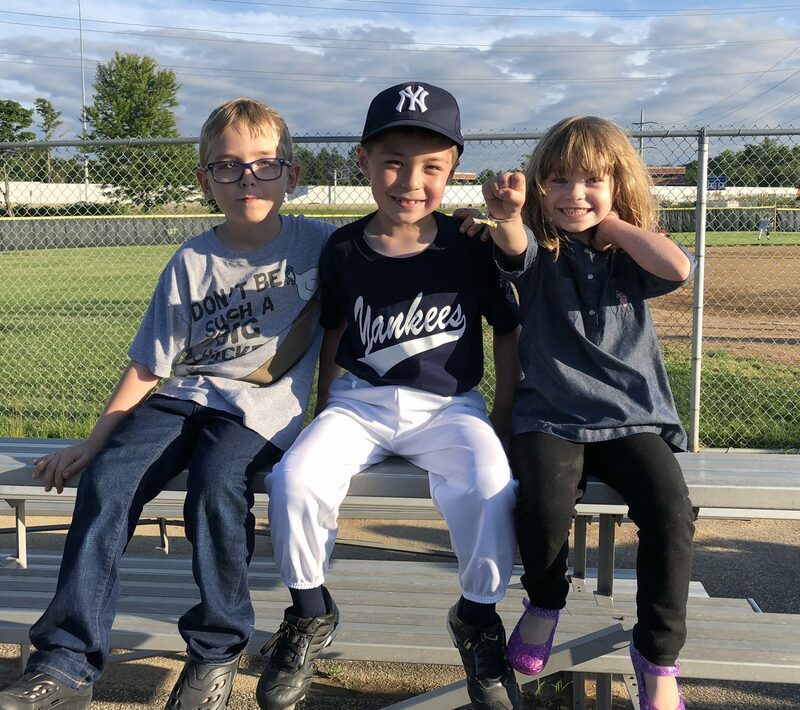 Tonight Alan, Xavier, and the rest of the 2018 Mighty Mites Yankees attended the annual Mayfield Boys Baseball League banquet at La Vera Party Center. Champions from all MBBL age groups were honored and prizes were raffled off. Alan and Xavier didn’t win a prize, but they entertained themselves all evening by following the Indians-Orioles play-by-play on ESPN Gamecast (Indians won 2-1). 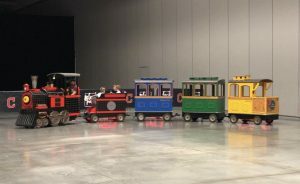 We didn’t know about this event last year, but we’re glad we found out this year and got to be together as a team one more time! 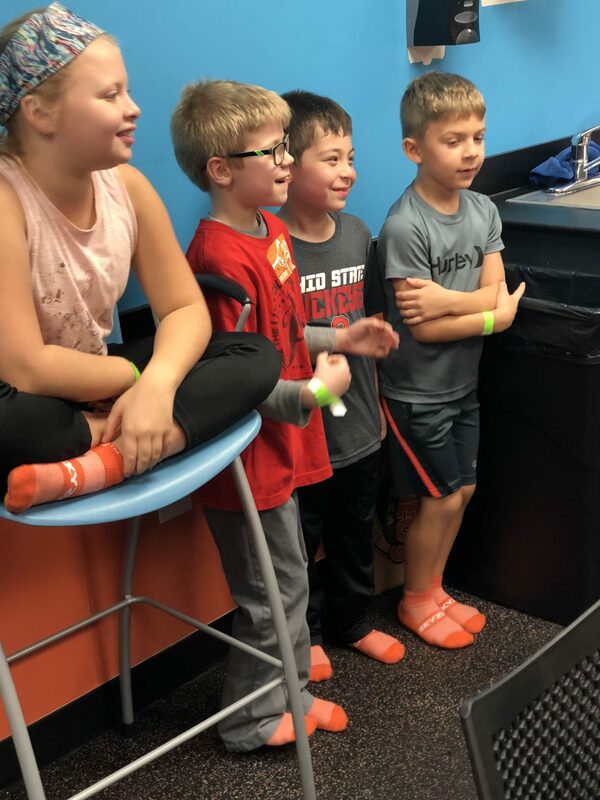 The big five “friends since Kindergarten” – Alan, Grady, Brady, Xavier, and Noah – got together today at Sky Zone for Grady’s birthday party. 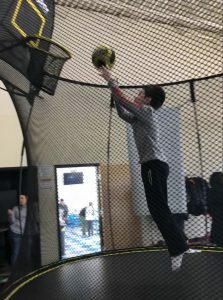 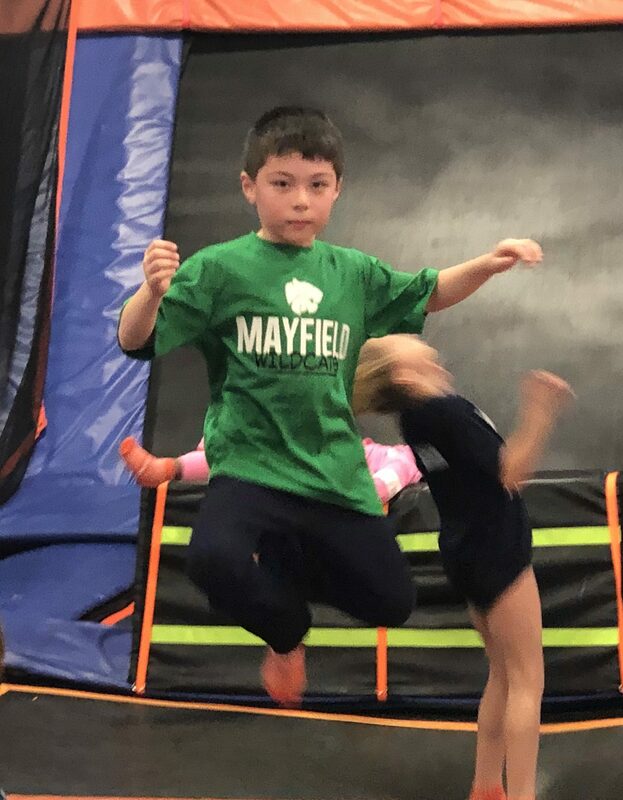 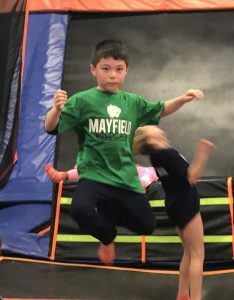 Alan had a great time jumping with Brady and seeing some other kids that he hadn’t seen since May. At the party we found out that Noah and Paige have Mrs. Harris with Alan and Brady too! 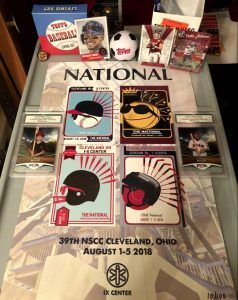 This weekend Alan and I made a two separate visits to the 2018 National Sports Collectors Convention at the I-X Center. 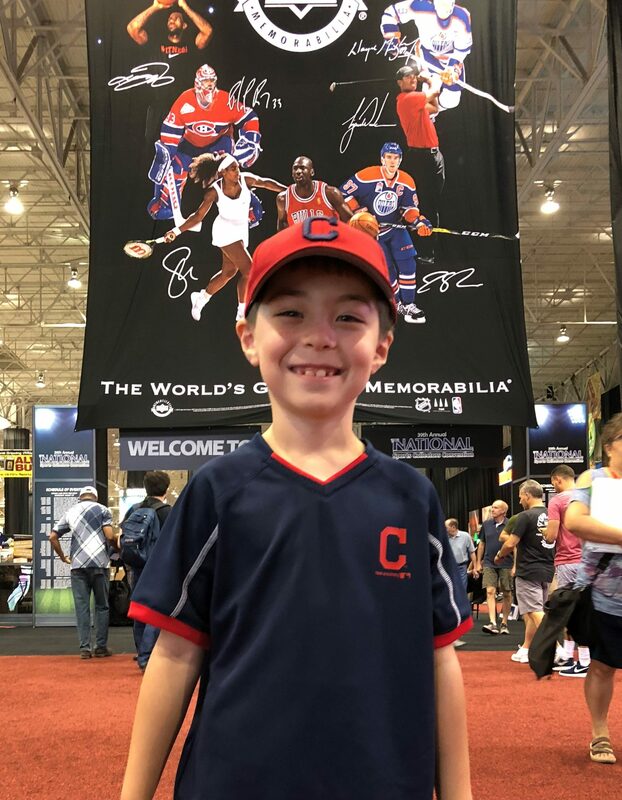 The event was held in Cleveland (Wednesday-Sunday) for the first time since 2014. 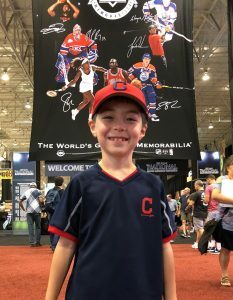 I attended that year and have been looking forward to bringing Alan to his first card show ever since. 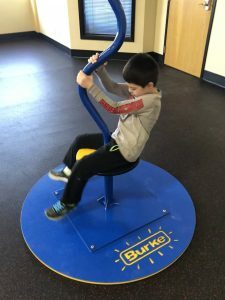 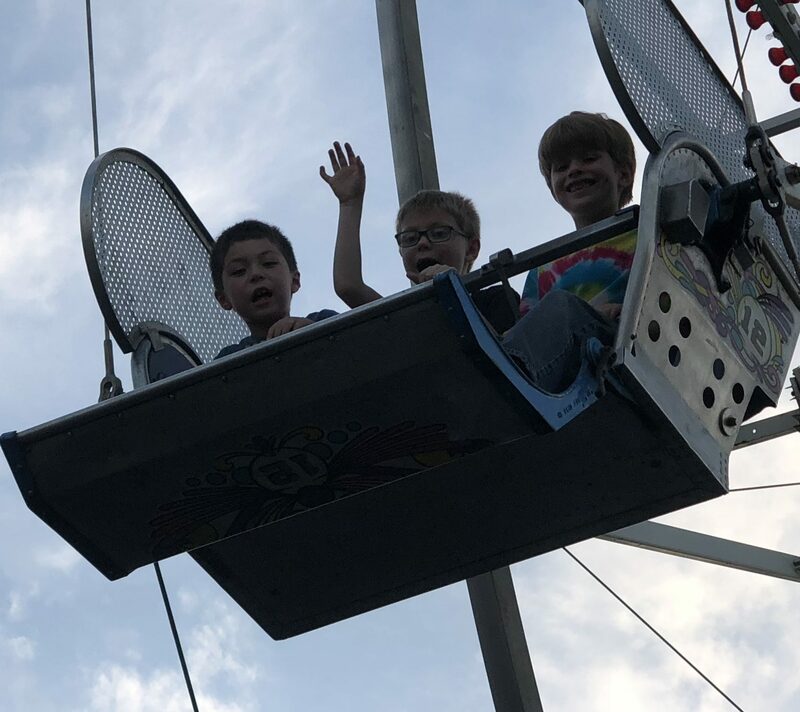 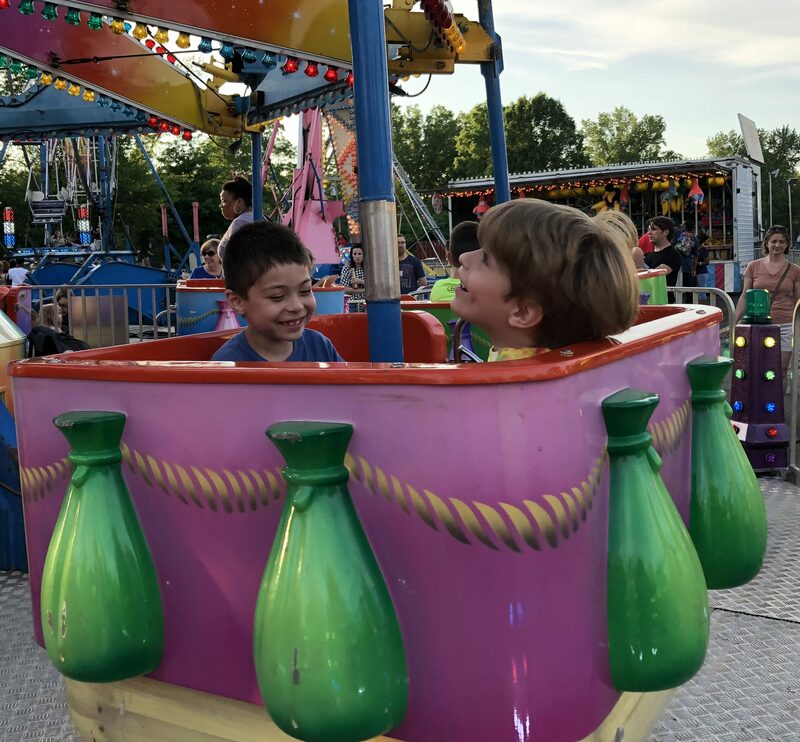 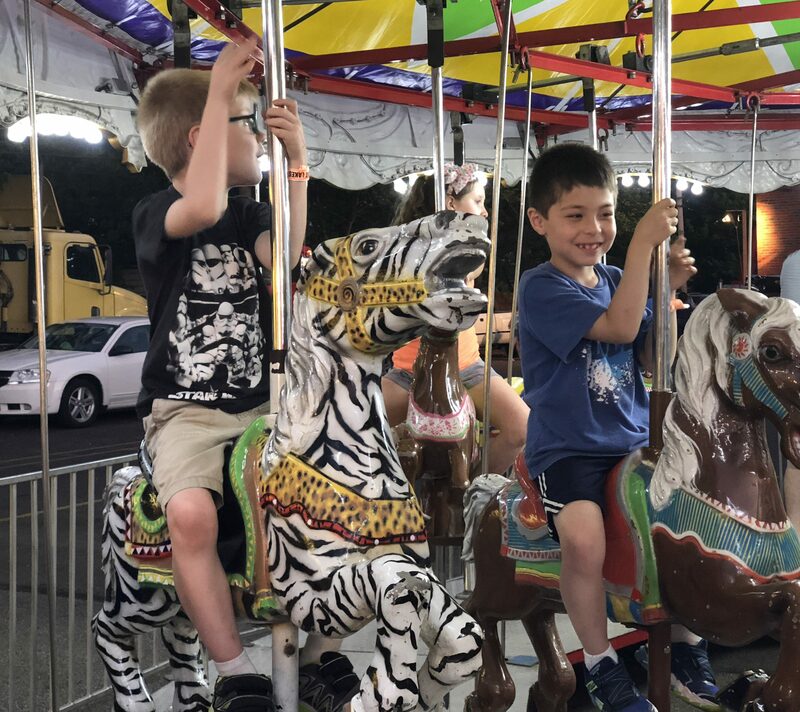 The next stop was Alan’s favorite activity – the indoor Ferris wheel. 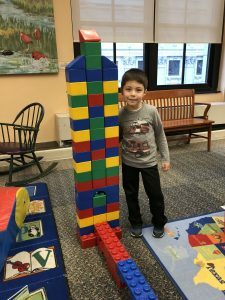 Alan loved how it peaked through the roof and allowed for a view of the neighboring airport. 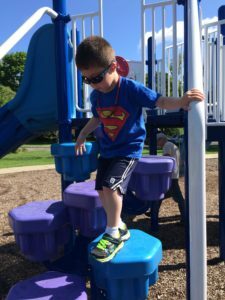 We looked out for planes at the top of each rotation! 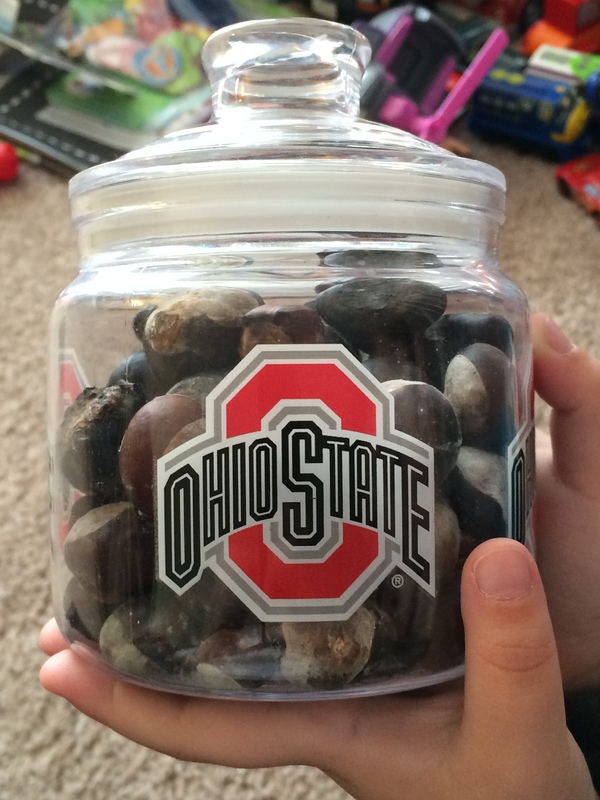 After the ride, we browsed the booths on the convention floor and picked up a 1948 World Series highlight DVD, a 1958 Rose Bowl game film DVD, and a 1975 OSU-Michigan radio broadcast CD. 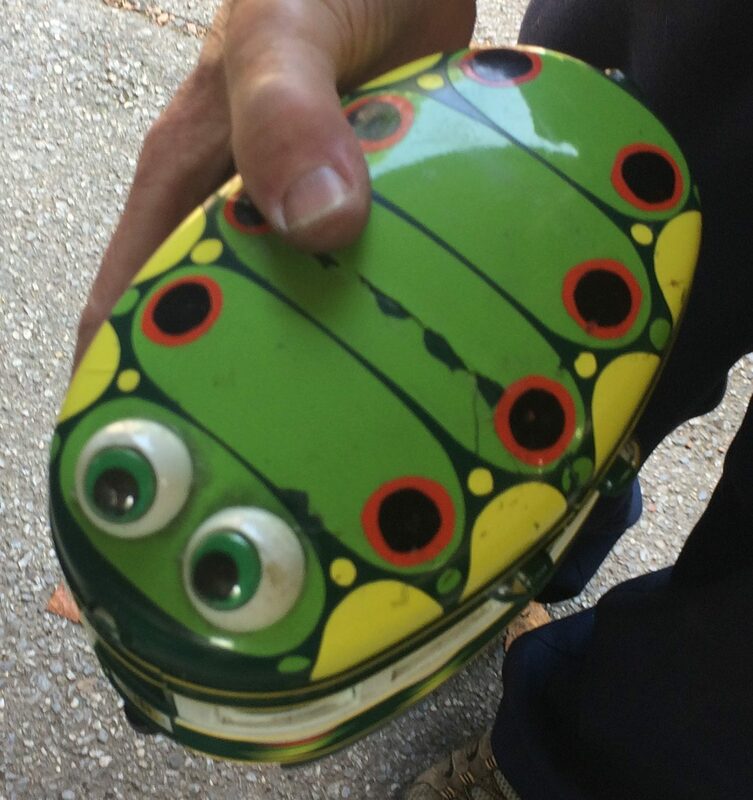 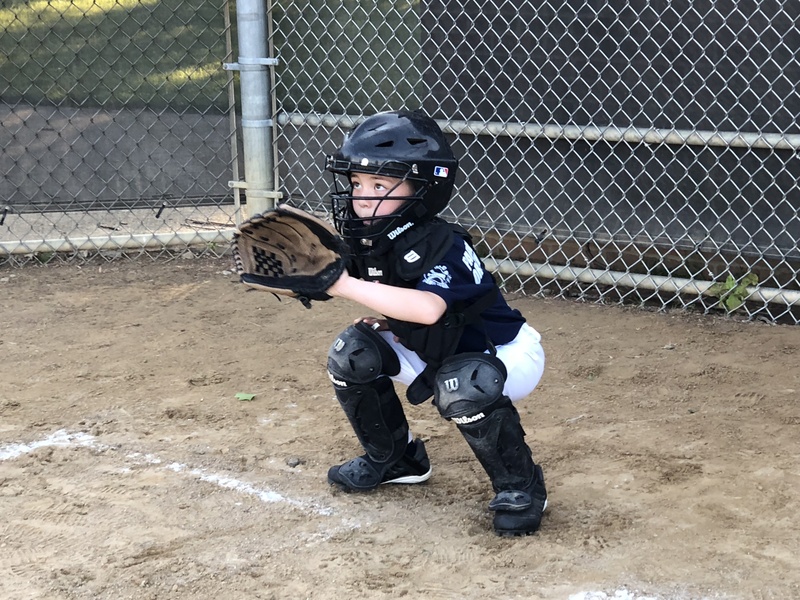 When we came across some vintage baseball equipment, Alan felt relieved that the catcher’s gear he wore this year has improved since the early 1900s model! On the way out we took a photo by the entrance/exit (LeBron is shown top left). 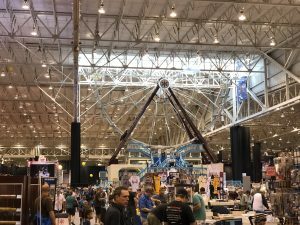 Alan and I decided that one day at the convention was not enough, so we returned again on Sunday morning. 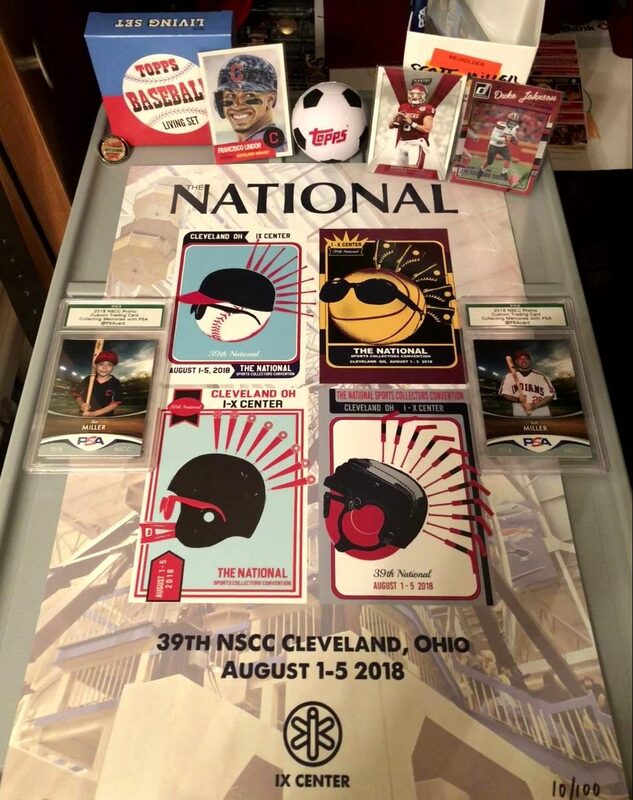 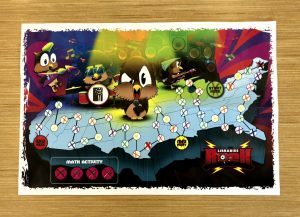 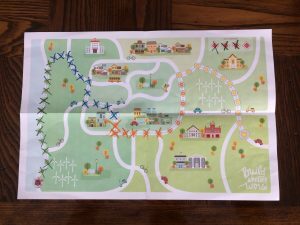 When we arrived, we bought two commemorative items – a convention pin and poster. While waiting in line, a Panini representative passed out a redemption card to Alan to turn in at the Panini booth. We found it was for a 10-card VIP set that included Baker Mayfield, along with 9 other top rookies in the NFL, NBA, and MLB. 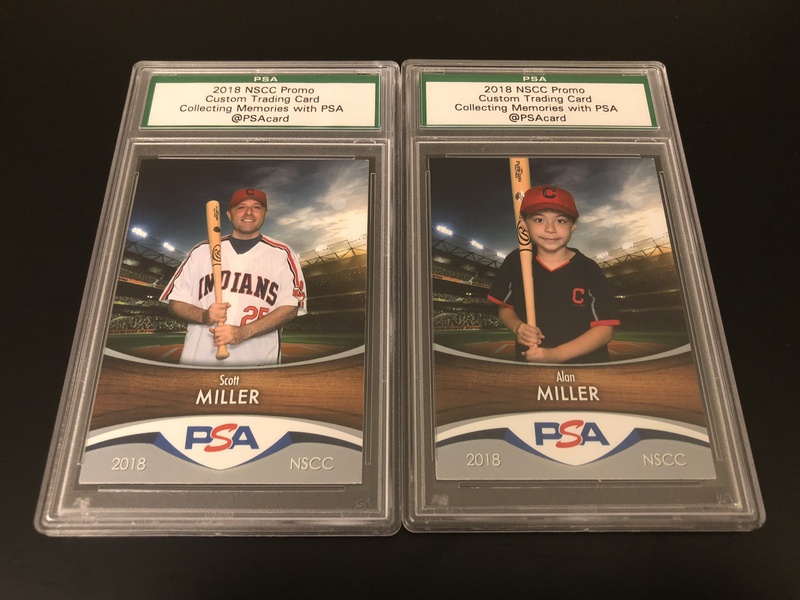 Being a kid at the convention definitely had its perks, as Alan also received free cards from two other booths. 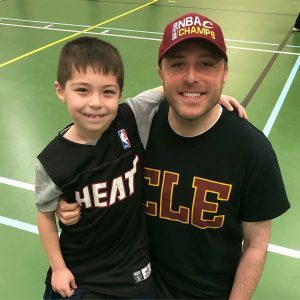 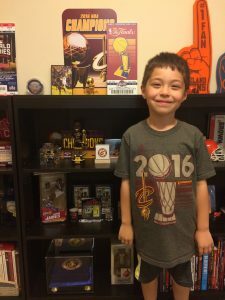 For the first time Alan got to experience the thrill of opening a pack of cards and getting a player from his team, as one of the packs contained a sharp Duke Johnson Donruss card. 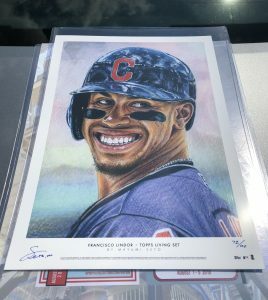 The only cards that we ended up having to purchase were the latest 3-card installment from the Topps Living Set that included Francisco Lindor! 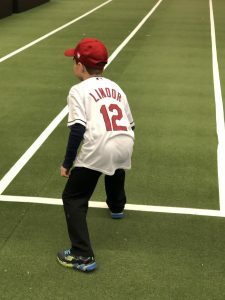 (along with Andrew Benintendi and Austin Meadows). 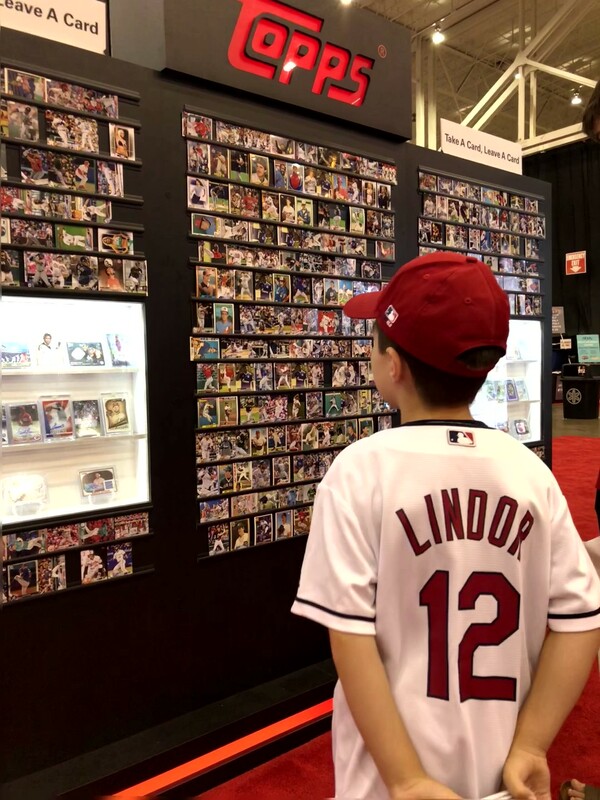 When buying the set the Topps booth we came across some great fortune, as the 3-card set we purchased included a redemption card for a 11×14 print of Lindor signed by the artist, Mayumi Seto. Of course we had to ride the Ferris wheel again too, after having so much fun with it the day before. 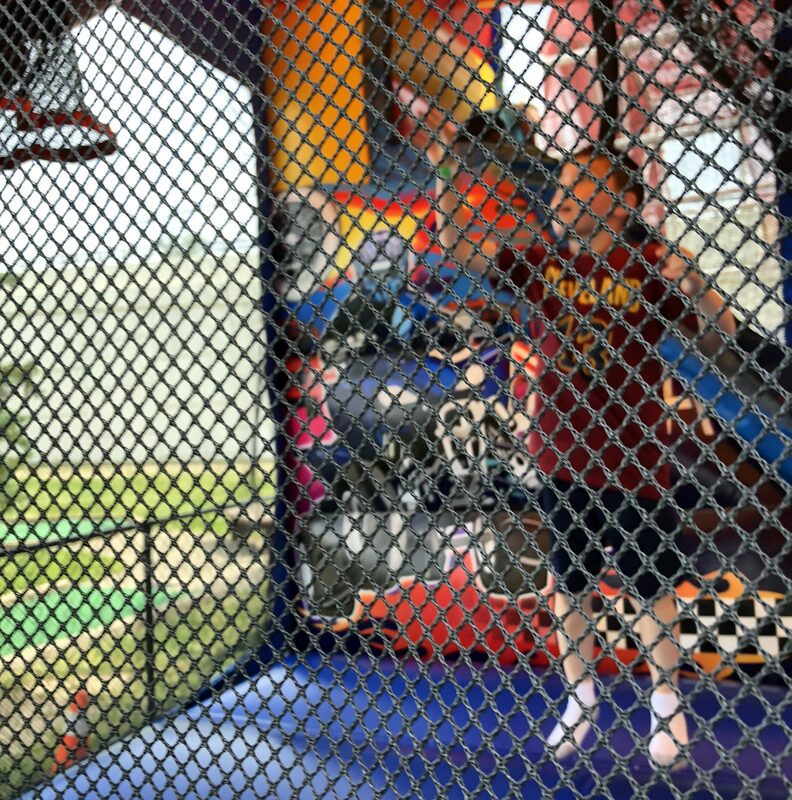 Alan also got a kick out of the fun house mirrors right around the corner from the Ferris wheel. 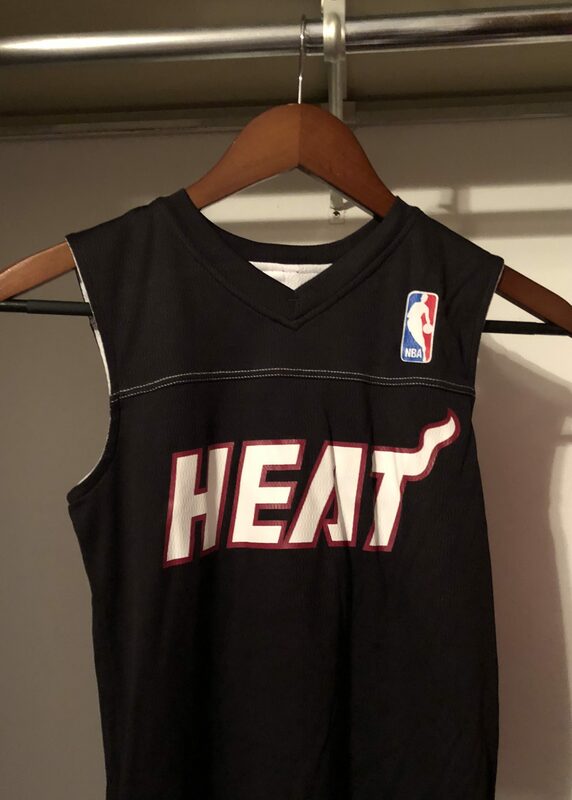 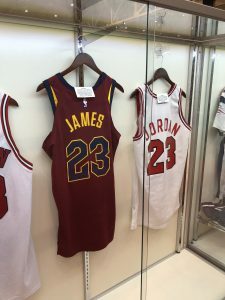 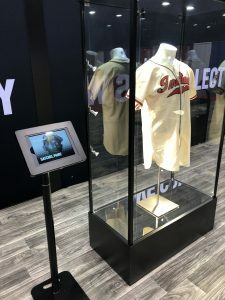 Before leaving, we viewed some more memorabilia, included some LeBron Cavaliers gear and a Satchel Paige game-worn Indians jersey! 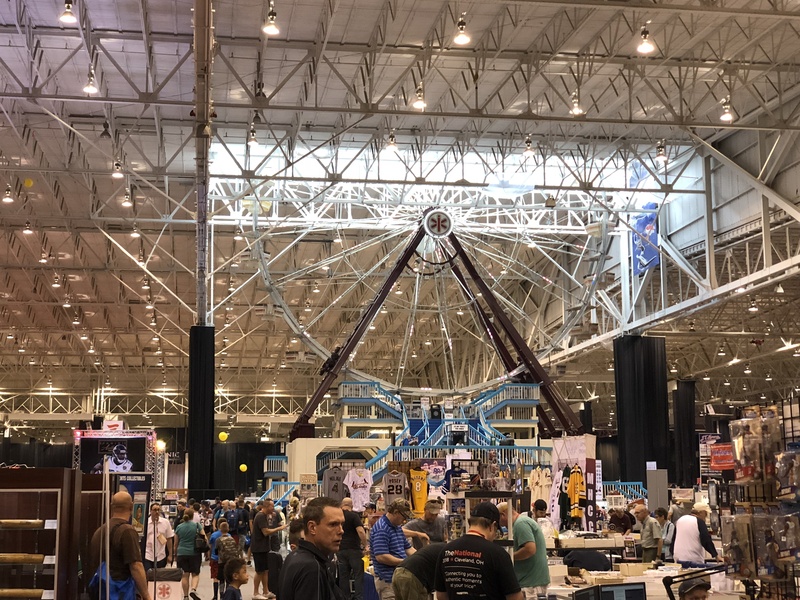 My hope is that this convention will spark Alan’s interest in the same hobby that I have enjoyed since I was his age. 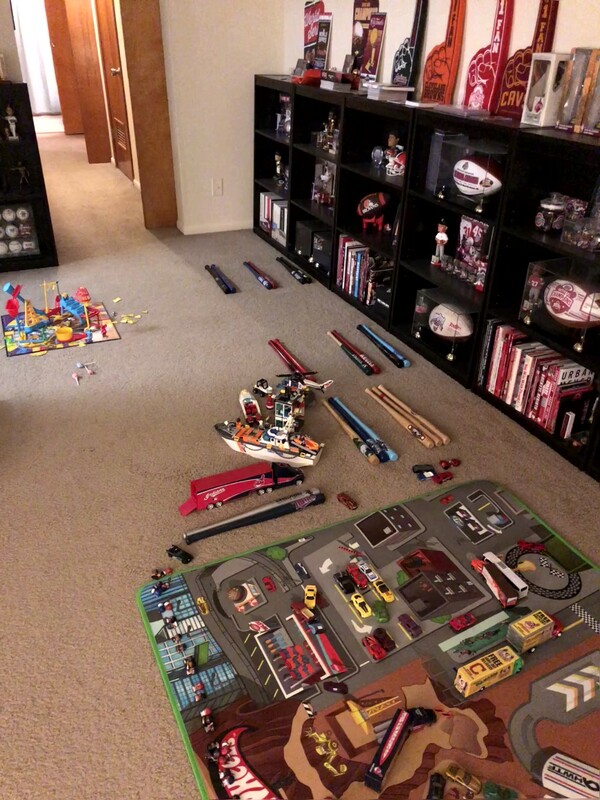 I think he definitely started to understand what I see in trading cards and sports memorabilia at least. 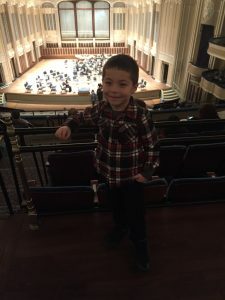 I think the odds are good that we’ll go to another show again someday! 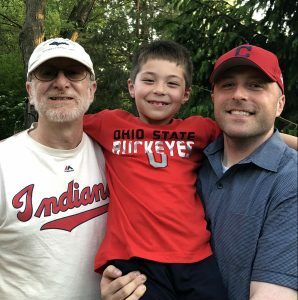 On 6/25/18, Alan went 2-for-4 with 3 RBIs (career high) and 1 run scored in a win over the Marlins. 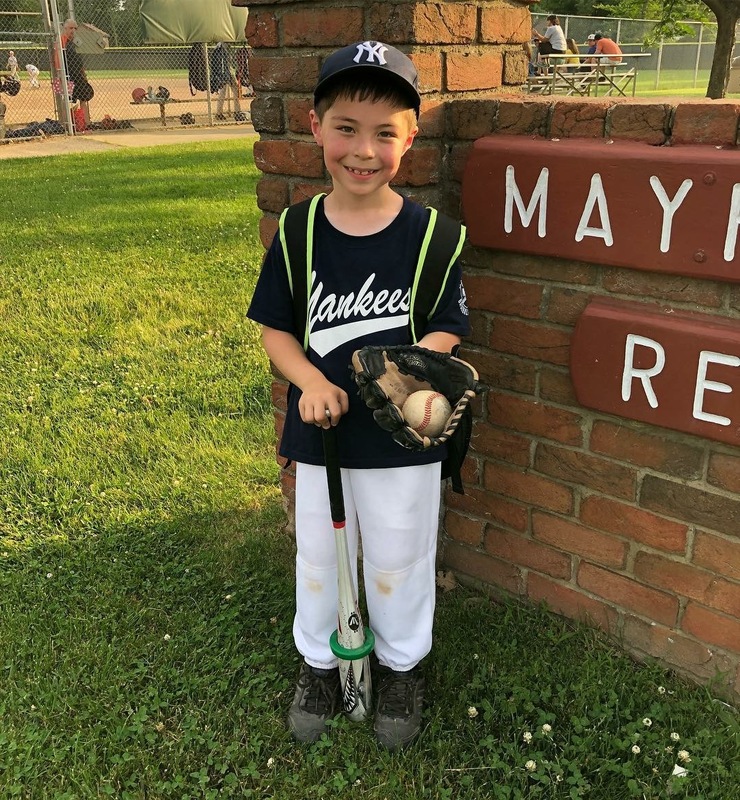 He also caught all 6 innings! 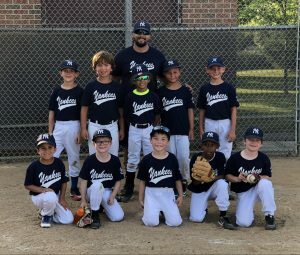 The Yankees spotted the Marlins 5 runs before coming back to win 15-13. It was a great end to the regular season, made even better by the fact that Tyler, Carleigh, Grandma Debbie, and Papa came for the third straight Monday night. Alan LOVED having them come this season! Alan’s cumulative season stat line reads as follows: 17-for-33 (.515) with 8 RBIs and 8 runs scored. He closed the year on an impressive 10-game hit streak and had multiple hits in six of those 10. 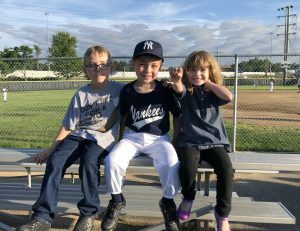 As a team, the Yankees closed the year with three straight victories to end the regular season at 5-6. That’s good for a third place finish out of five teams. 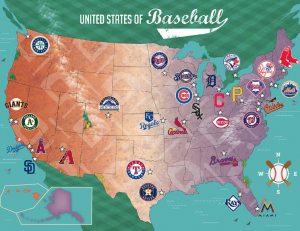 The order of finish was Dodgers-Red Sox-Yankees-Marlins-Giants. 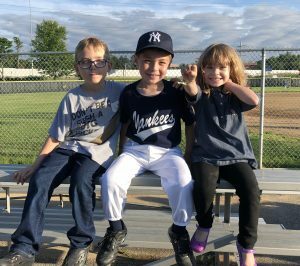 The Yankees will open the playoffs with a 1-game showdown vs. the Red Sox. 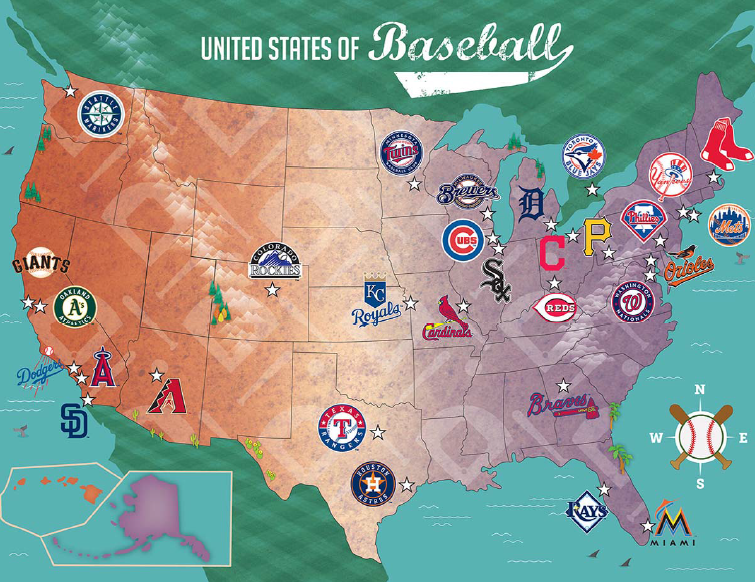 The winner will play a best of three series vs. the winner of Dodgers vs. Marlins/Giants. Alan had his best game of the season tonight in front of Grandma Debbie, Papa, Tyler, and Carleigh. 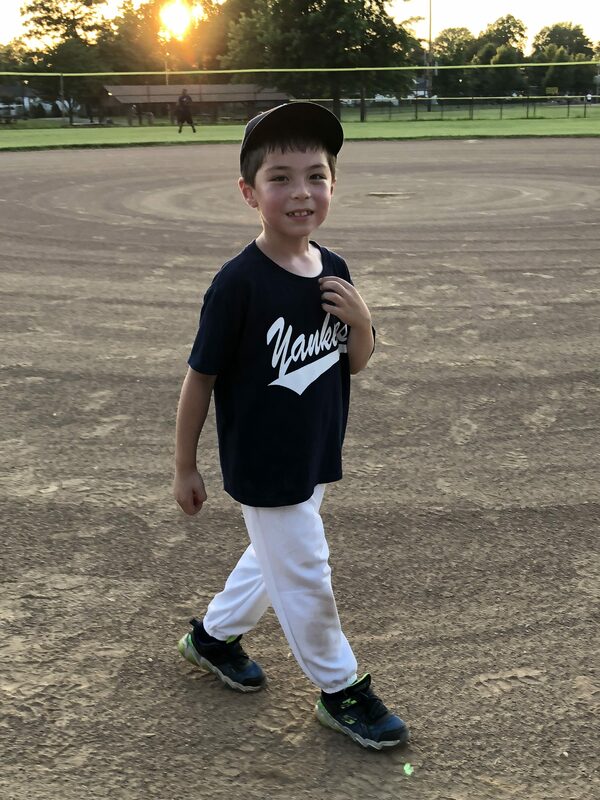 Alan earned his first career game ball and helped lead the Yankees to a win over the Giants! 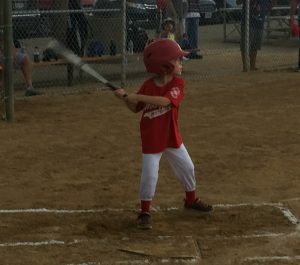 At the plate, Alan singled in his first at-bat. In his second at bat, he drove in 2 runs on an RBI ground out. 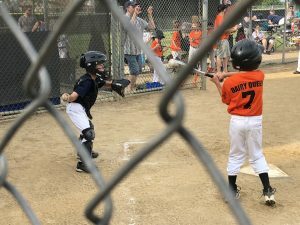 In his third at bat, he singled and would later come around to score. Alan was so locked in that he only saw 3 pitches over his 3 plate appearances. 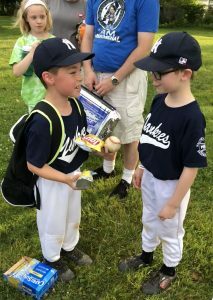 I coached first base for the first time this season (after being at third for all other games) and congratulated Alan each time. Defensively, Alan caught three innings (on a very hot night) and played one more in LF. 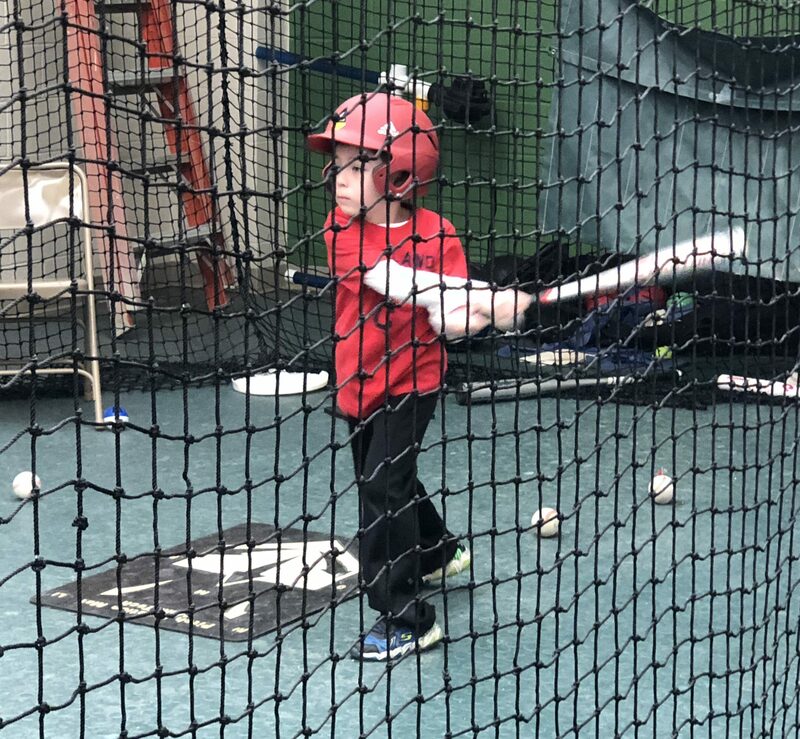 No one on the team enjoys putting on the equipment and catching right now more than Alan. After the game, Alan and Xavier were each presented with game balls. The ump originally gave the balls to me following the last out. When I handed them to our coach, he was consulting with the stat-keeper on the most deserving recipients. 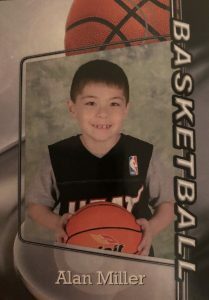 I heard him say Alan, so I had my phone ready to record the video of Alan receiving the game ball. Alan had been wanting so bad to receive a game ball and tonight he got his wish. 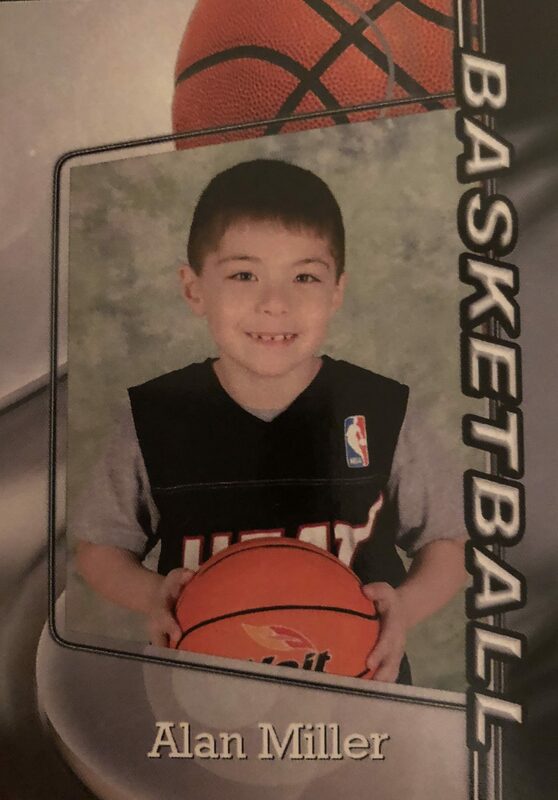 Both he and Xavier really deserved it tonight. 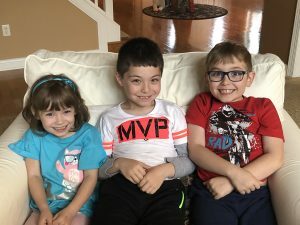 Afterwards Tyler and Carleigh greeted Alan with a big hug. 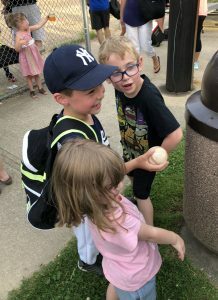 Alan proudly showed them the game ball, then showed Grandma and Papa too. It was a very special night for Alan and he was thrilled to share it with his family! 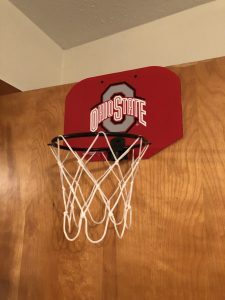 At home Alan asked if he can have a case for his game ball, and I agreed. 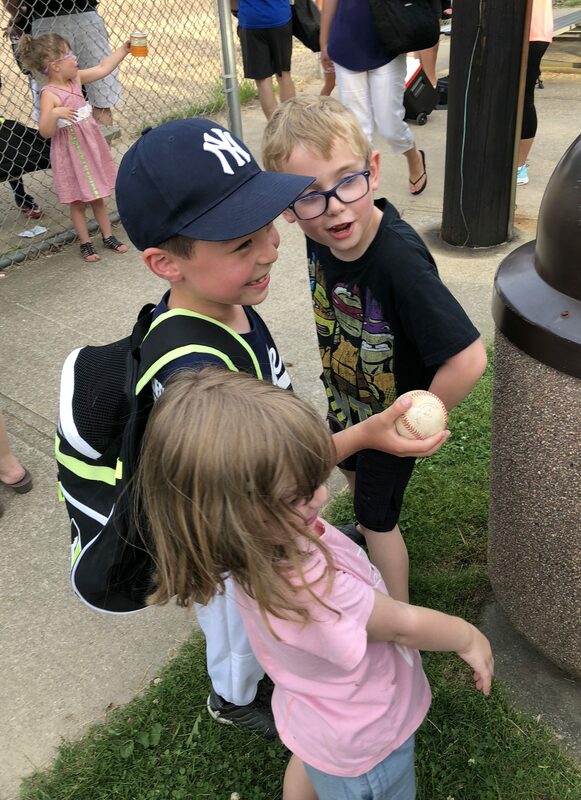 We’ll be displaying that ball for sure! Following a rain-out on 5/22/18, Alan went 1-for-3 in a win over the Marlins – the team’s first victory of the season! 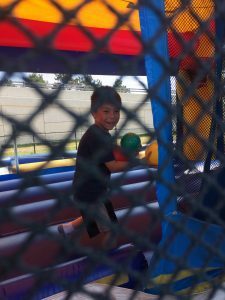 – on 5/29/18. 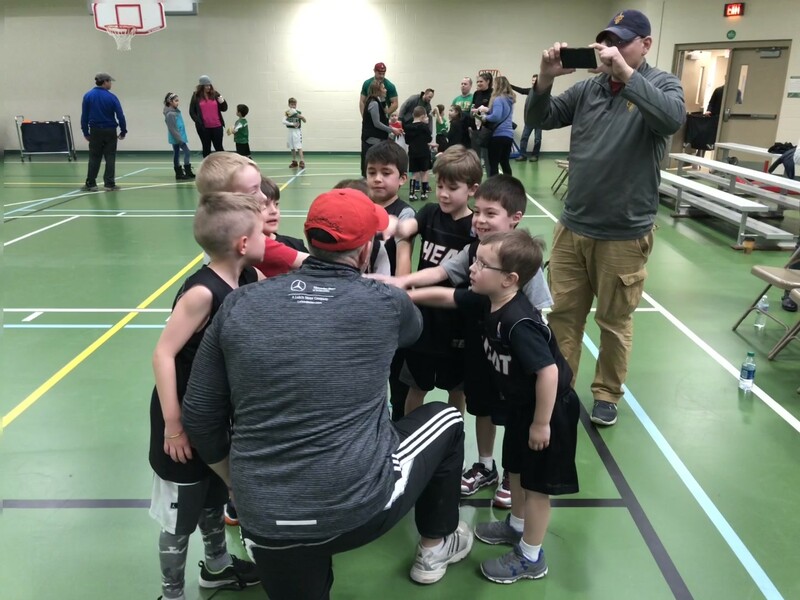 Starting with this game, the team starting playing the same positions regularly. 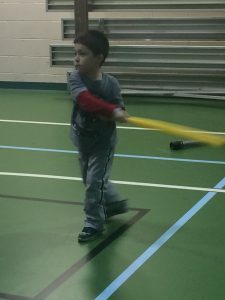 Alan is the team’s consistent right fielder. 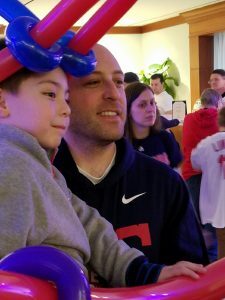 On 5/30/18, Alan again went 1-for-3 in a loss to the Red Sox. 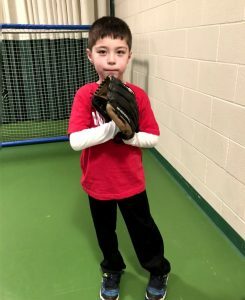 Alan has been learning that when he hits the ball towards the left side of the infield he can usually beat out a hit, but it’s a lot harder to reach first base safely on a grounder to the right side of the infield. 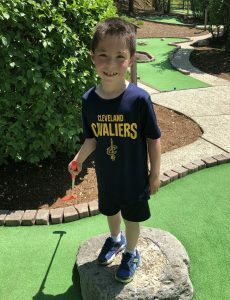 But he’s been doing a great job putting the ball in play all season. 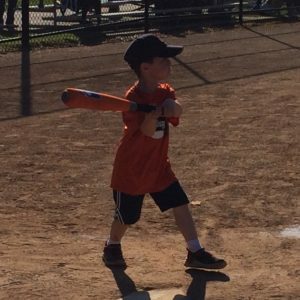 On 6/4/18, Alan went 1-for-3 with a run scored in a thrilling 1-run win over the Giants! 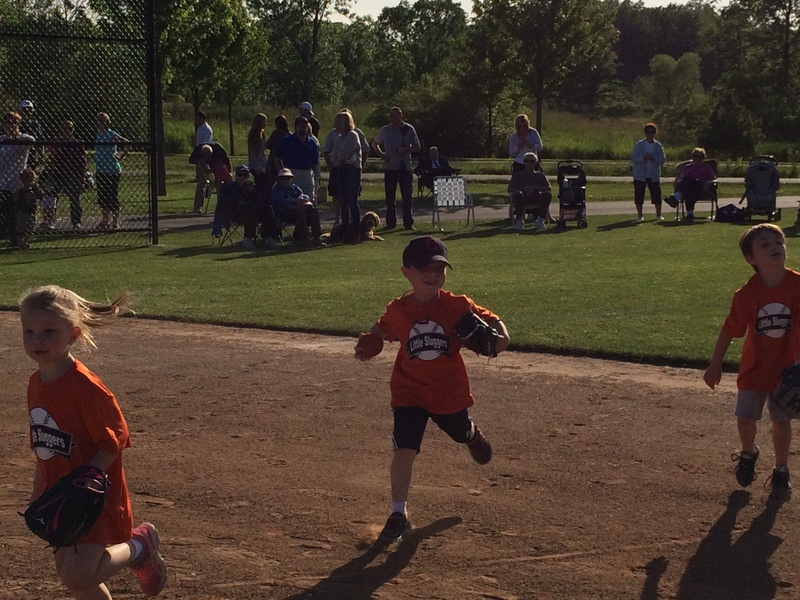 The highlight of the game was when Alan and Xavier manufactured a run by themselves in the middle innings. With two outs and nobody on base, Alan singled and advanced to second base on an errant throw that only barely got away from the first baseman. Then Xavier singled home Alan, who hustled home to score on a ball that never left the infield! 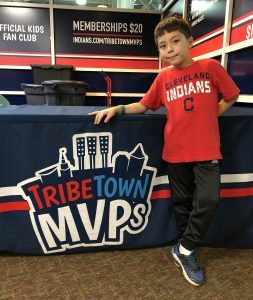 On 6/11/18, Alan went 2-for-4 with a run and a 9-4-3 outfield assist(!) 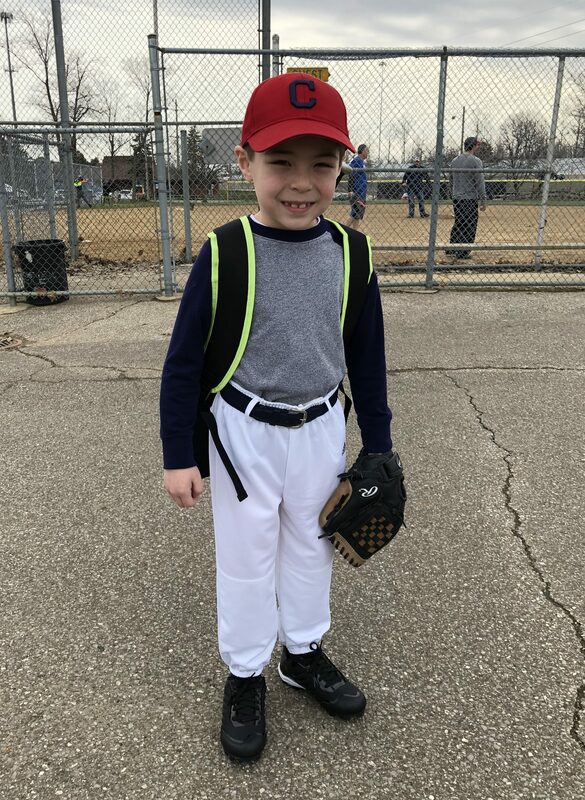 in the 1st inning of a narrow loss to the league-leading Dodgers (He helped catch a runner caught between first and second). 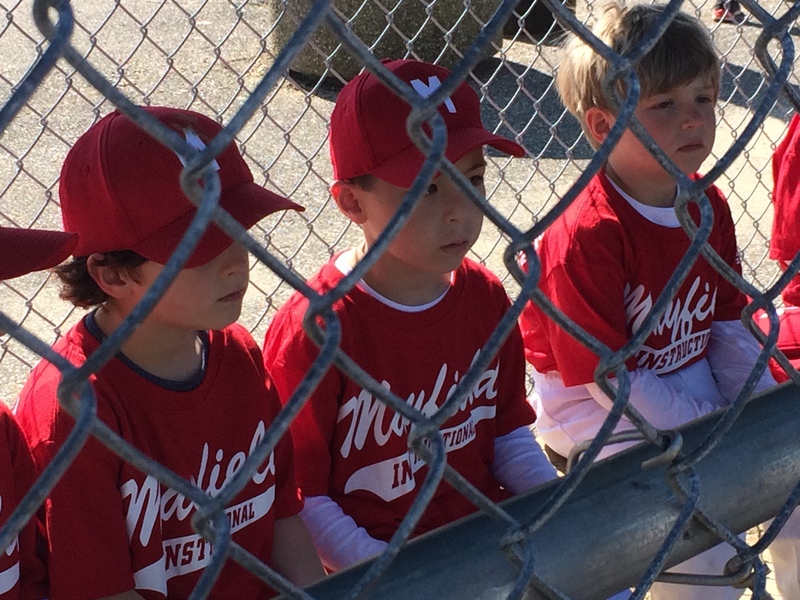 The highlight of Alan’s game, though, was Grandma Debbie, Papa, Tyler and Carleigh coming to watch him play. 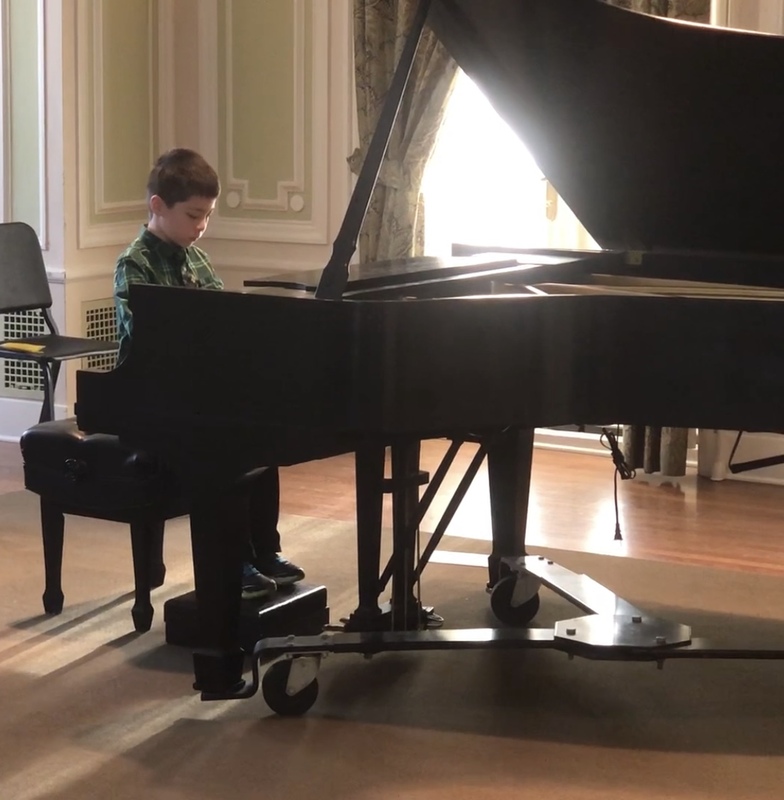 Alan was very proud to play in front of his family! On 6/12/18, Alan went 1-for-3 with a run and an RBI in a loss to the Dodgers. One of the Yankee coaches commented to Alan that he must have been practicing because he’s been making good contact at the plate. 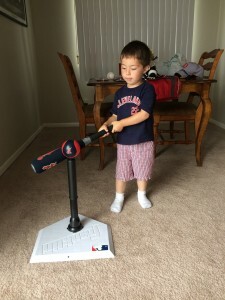 It’s true in fact — all week Alan has been practicing in the backyard with his “Nagoon.” One hitting session in the morning and one in the afternoon. 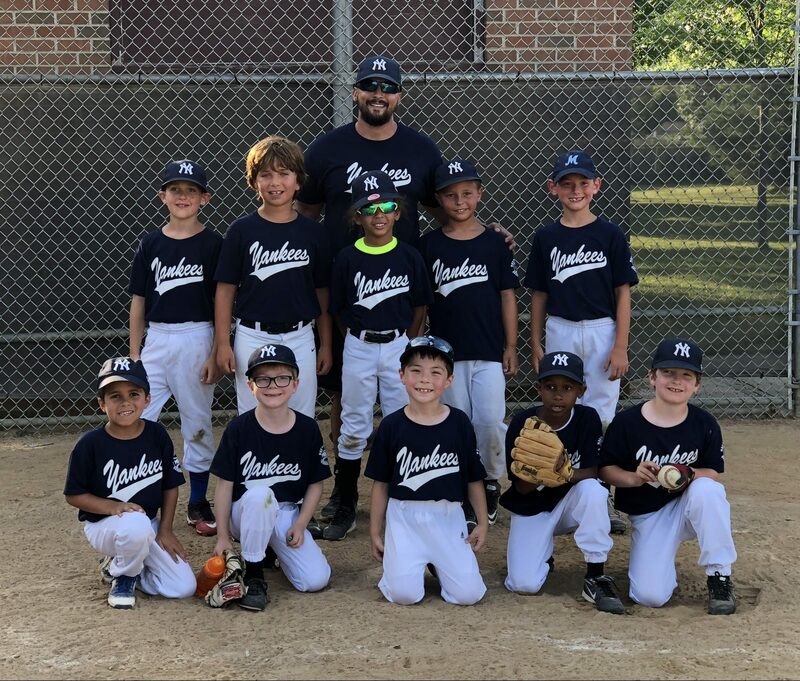 Despite the loss, the Yankees played well against the league-leading Dodgers for two straight nights and were upbeat after the game. 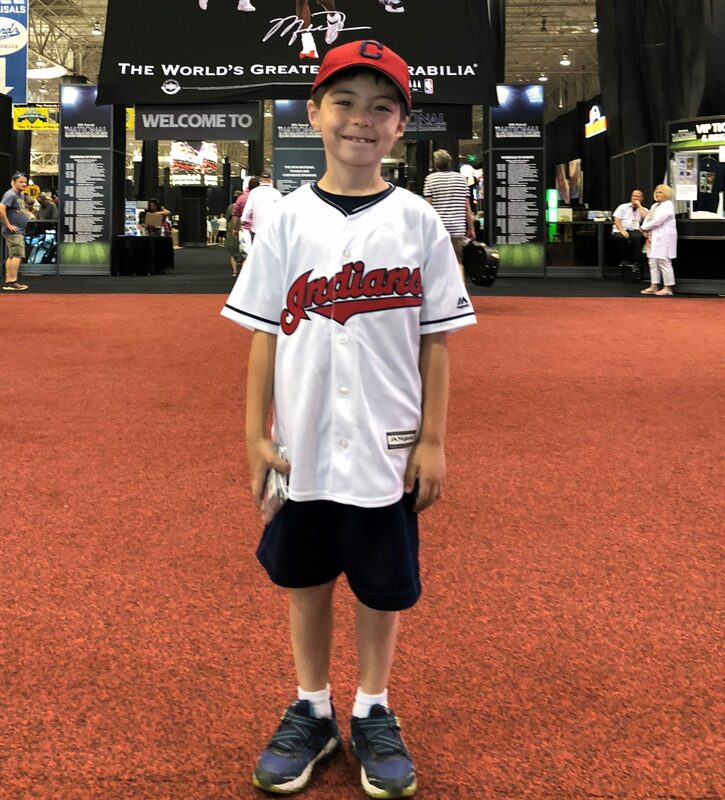 On 6/13/18, Alan went 2-for-2 with an RBI in a loss to the Marlins. 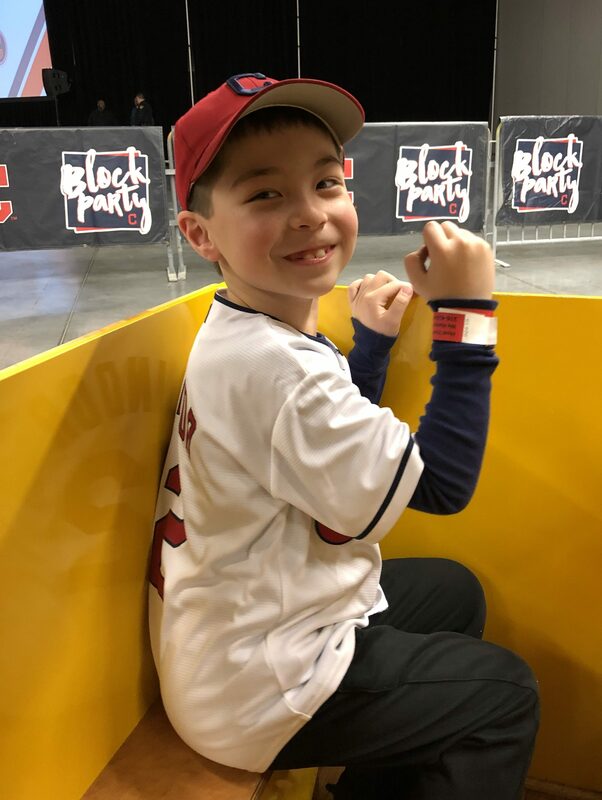 The team looked worn out from its 3rd game in 3 days, but Alan did his part to bring the energy at the plate and behind it. 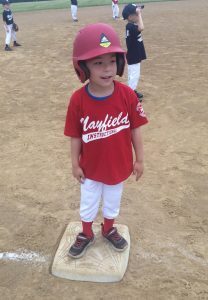 He made his debut at catcher and caught all 4 innings of the shortened game (run spread rule). 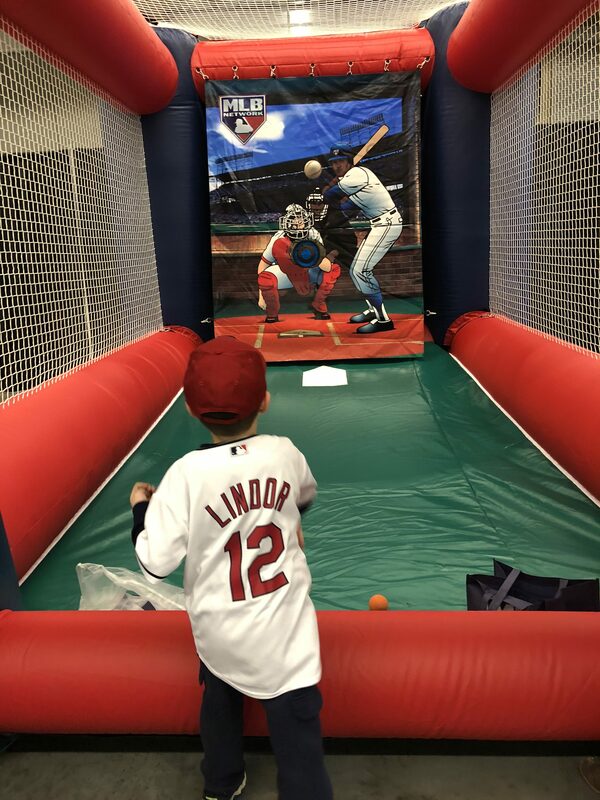 He enjoyed catching so much that he wants to catch the next game too! 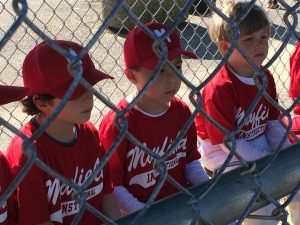 The Mayfield Mighty Mites baseball season is officially underway. 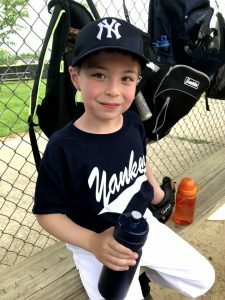 Alan’s team — the Yankees — played through a rain-soaked and shortened opener on 5/12/18. 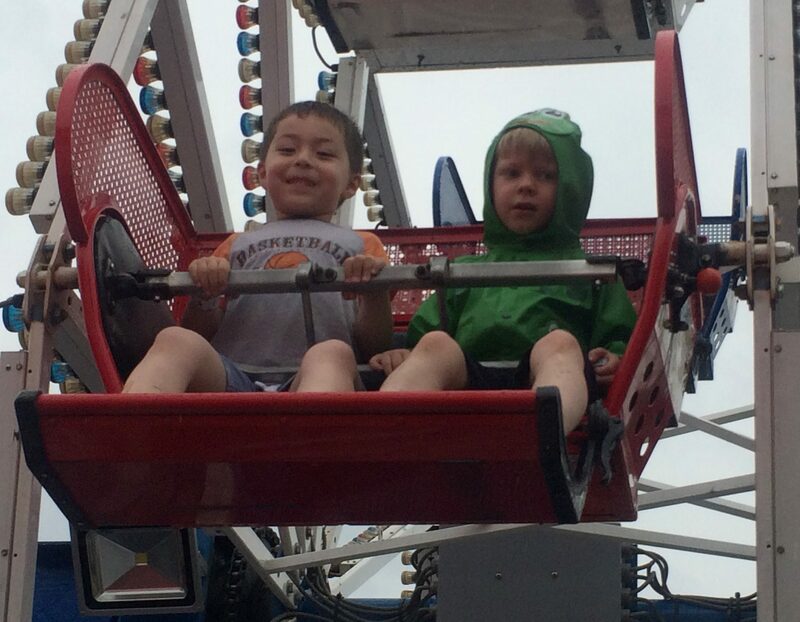 Then they were rained out completely on 5/14/18. 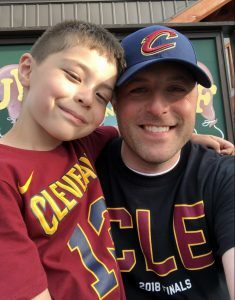 So today’s game felt more like the true kick-off to the season. 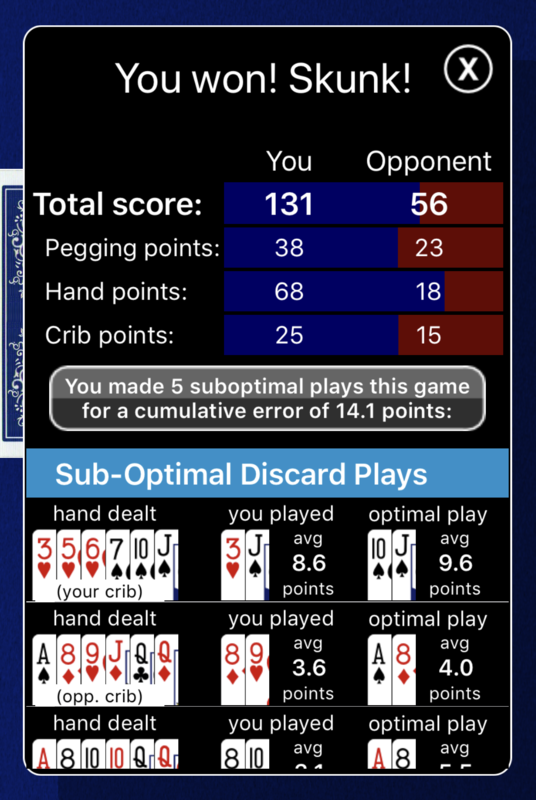 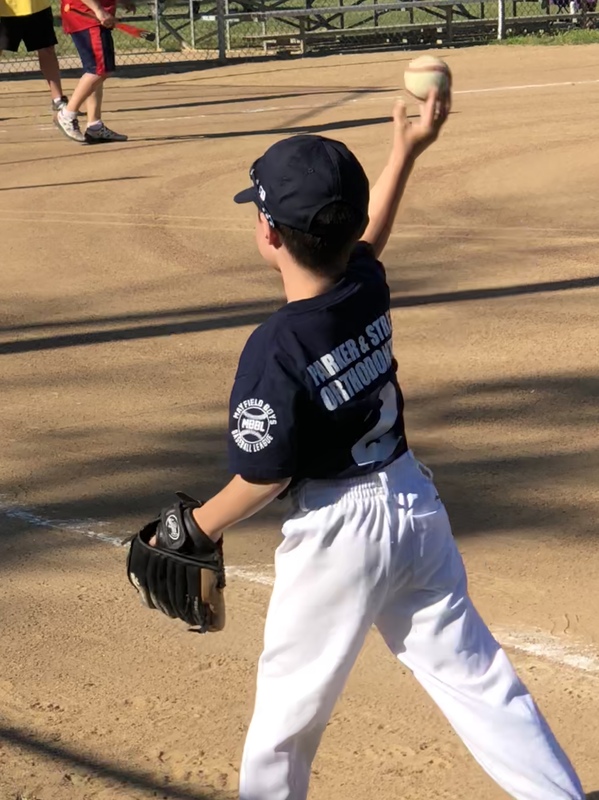 On 5/12/18, Alan put two balls in play but was retired on great plays by fielders. In the field, he played RF and pitcher’s helper, as the coach likes his ability to field ground balls. 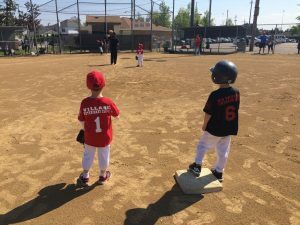 The result of the game was a loss to the Giants. Today, 5/21/18, Alan went 2-for-3 with two singles and a fielder’s choice ground-out. 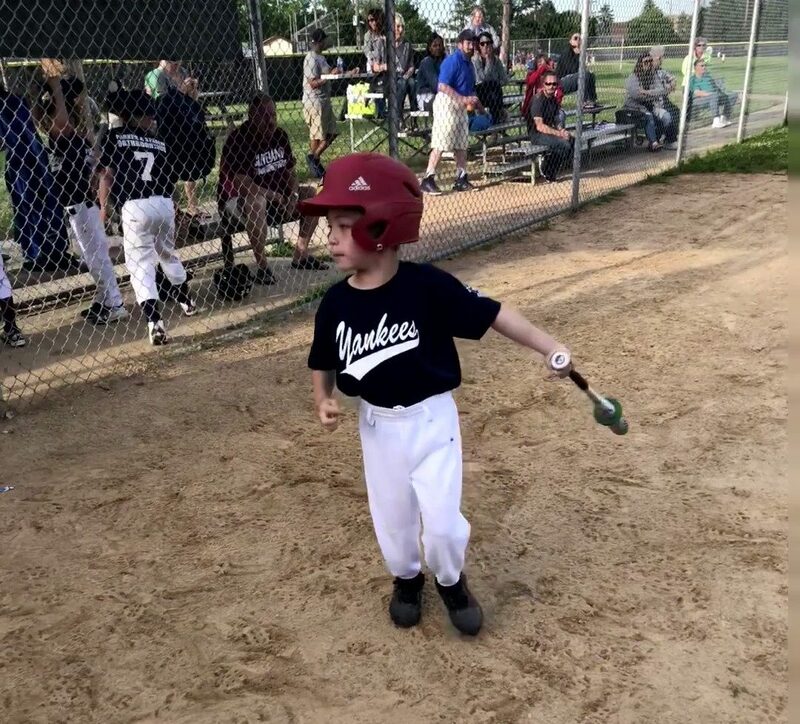 He was excited to run the bases three times, and even scored from 2nd on a single for his first run scored of the season. I coached third and waved him home! 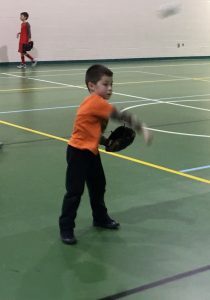 In the field, he played RF and LF and got the ball into the infield quickly on a couple hits. 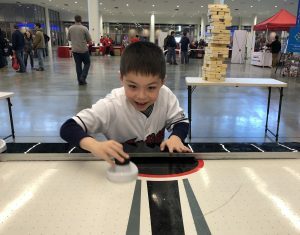 The result of the game was a loss to the Red Sox. 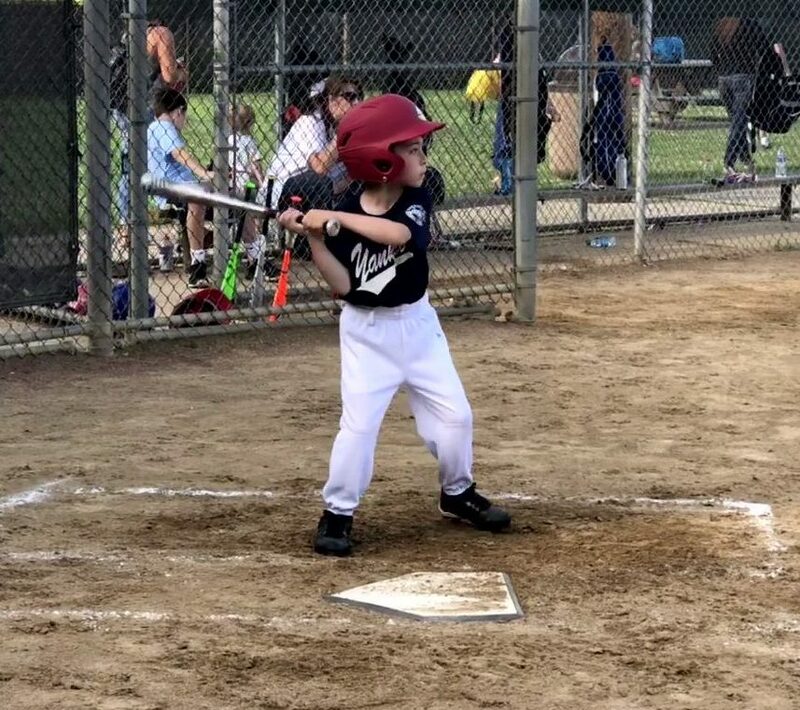 Note: Alan is wearing #2 for the Yankees this year, which he wanted because it’s his second year playing in an organized baseball league. 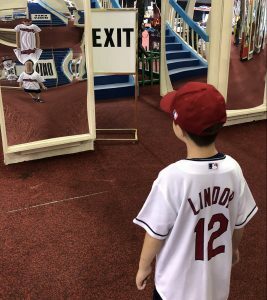 He wore #1 last year. Today Alan wrapped up another session of ice skating lessons at Gilmour Academy. He demonstrated gliding and backwards skating, showed off some spin moves, and had fun participating in a skating line. 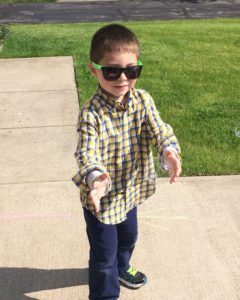 He’s looking pretty good! 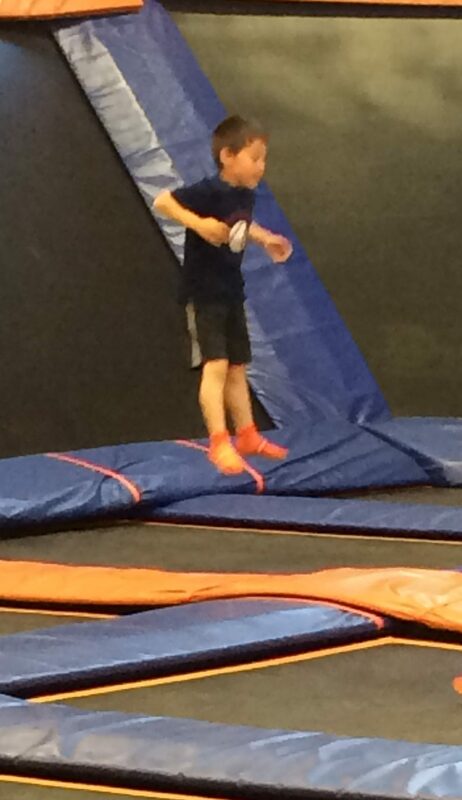 On Fridays next fall he’ll be onto Basic Skills Level 5. That look you have when your new shoes and new badminton racket both happen to match the shirt you put on in the morning. 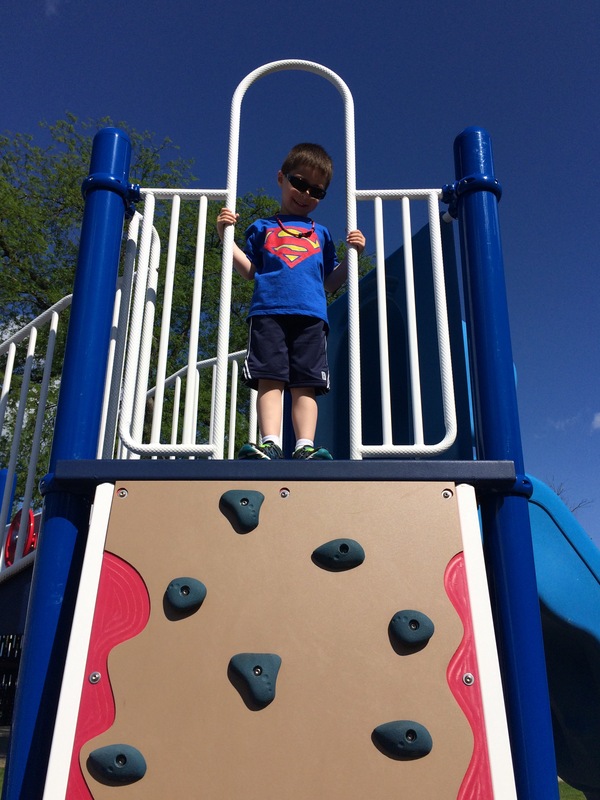 This weekend was the first weekend of spring with warm weather and no rain, and Alan took full advantage. He practiced hitting at the community park on Friday night and Sunday afternoon, with a Saturday morning team practice mixed in between. 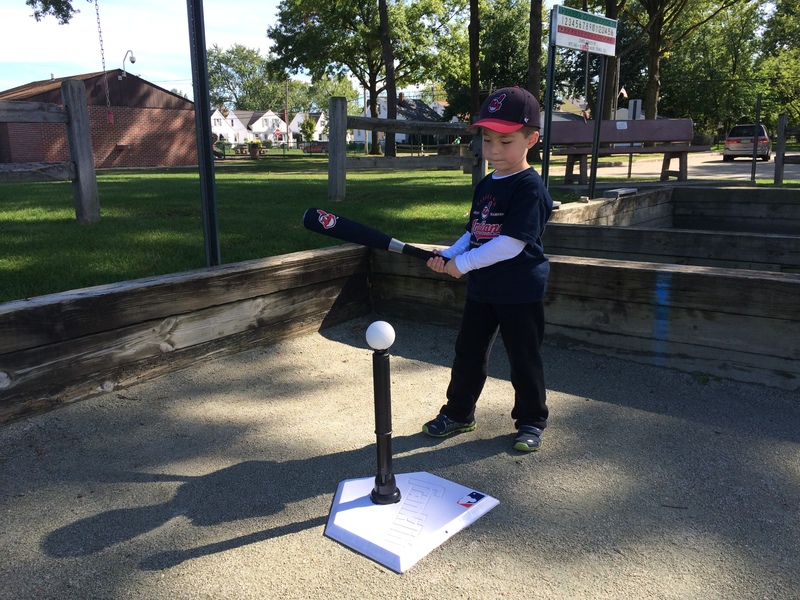 After practicing hitting, Alan played at the nearby playground – one of this favorites – each time. 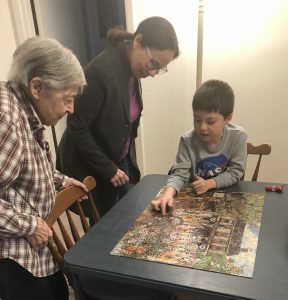 Also, on Saturday night, Alan played outside by Grandma Debbie’s pond with Tyler and Carleigh. 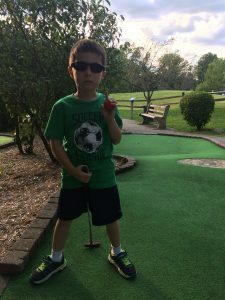 Alan’s favorite part was throwing rocks into the pond. 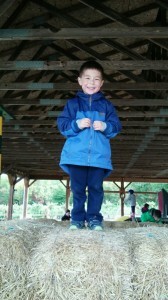 Alan found it funny when one of Tyler’s throws didn’t go far enough and splashed them both with mud. It won’t be long until Alan will get to play outside every weekend! -Texting. Yes, it’s true. 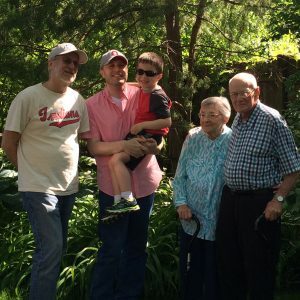 Particularly with Dad, Mom, Grandma Debbie, and Shane. 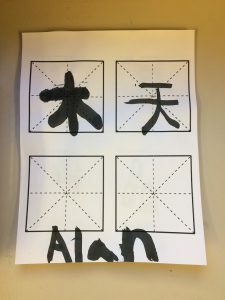 Alan loves sending emojis! 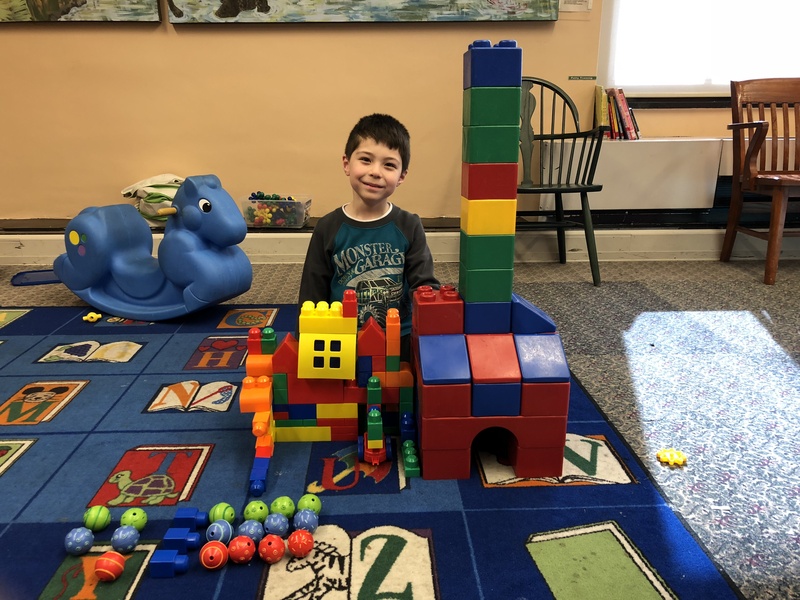 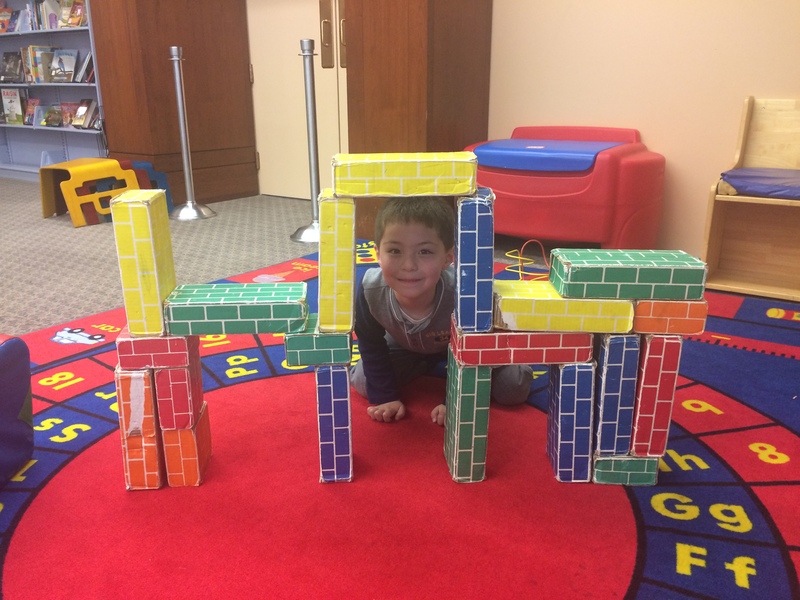 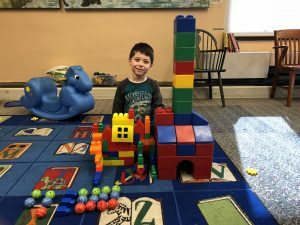 Before and after Chinese class, Alan loved building with blocks in the Children’s area on the 4th floor (conveniently located across the hall from the Foreign Language room). 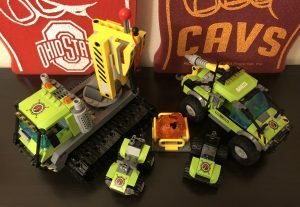 Here are a couple of his best creations. 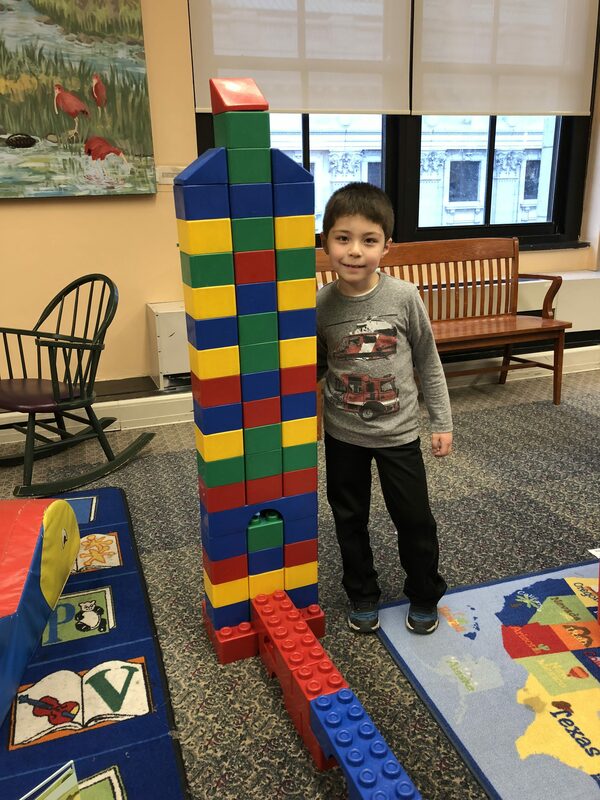 Above is a tower with a bridge to the entranceway. 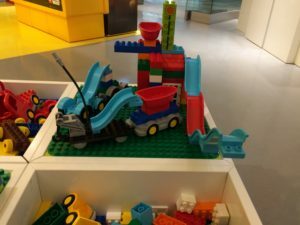 Below is a pair of houses. 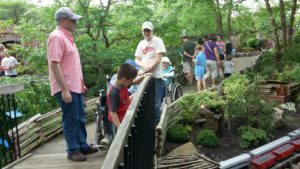 The first house even has its own garden in the front yard! 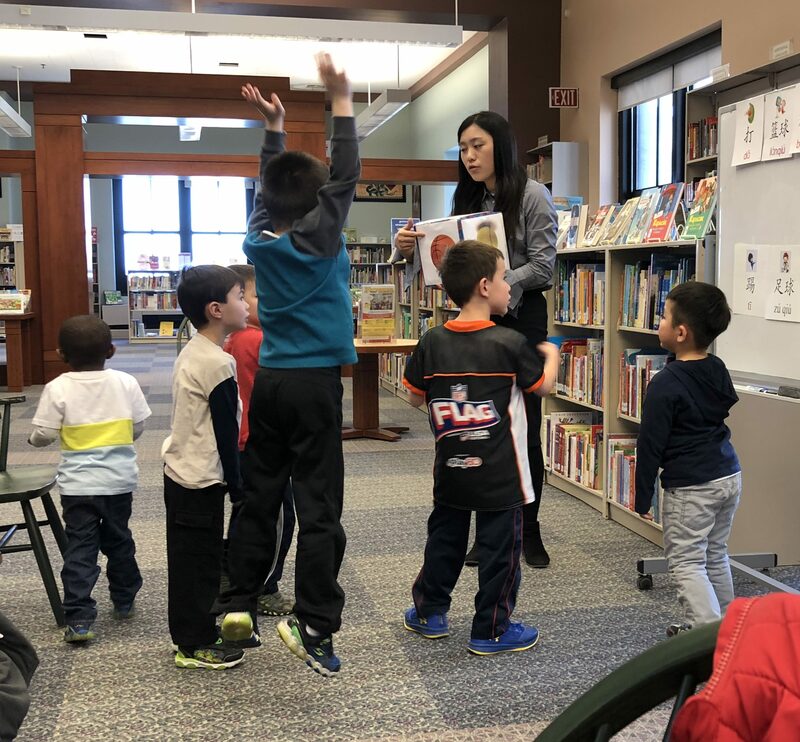 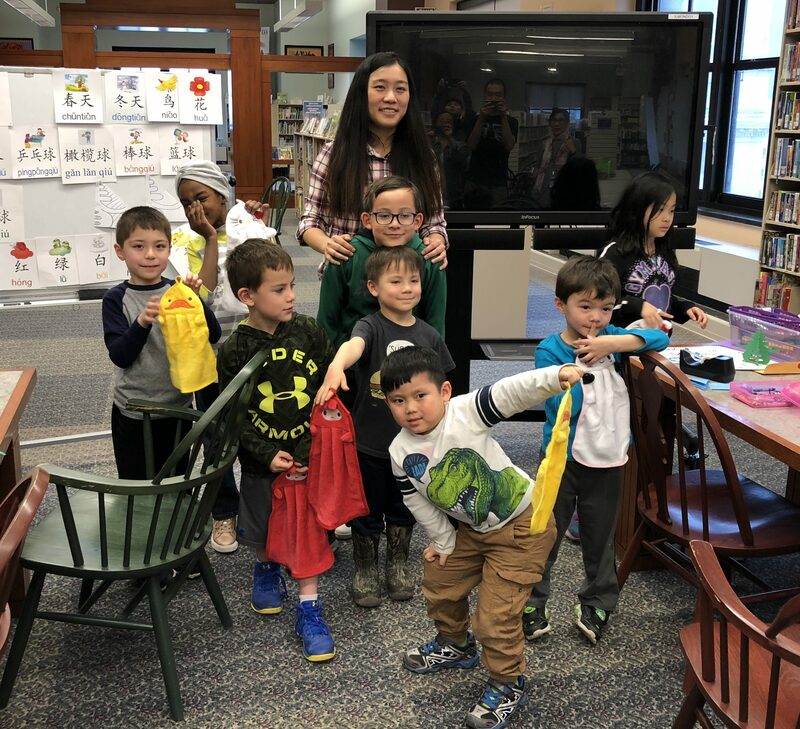 The Spring session of Chinese (Mandarin) class at the Cleveland Public Library came to a close today. 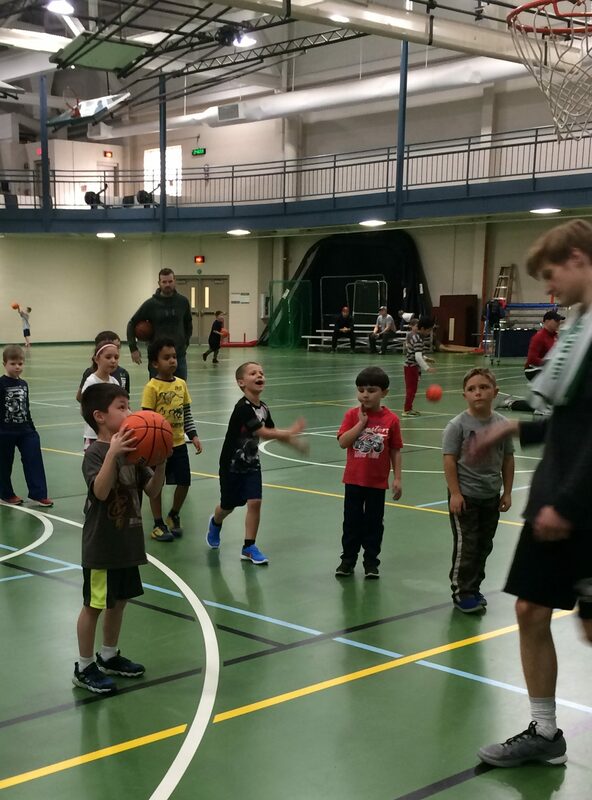 After missing most of the Fall session because of basketball, Alan returned this Spring without missing a beat. 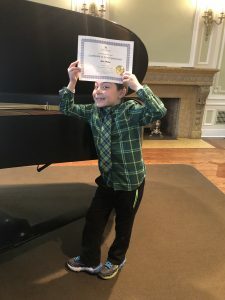 Alan paid attention very well and was one of the best students of the class. 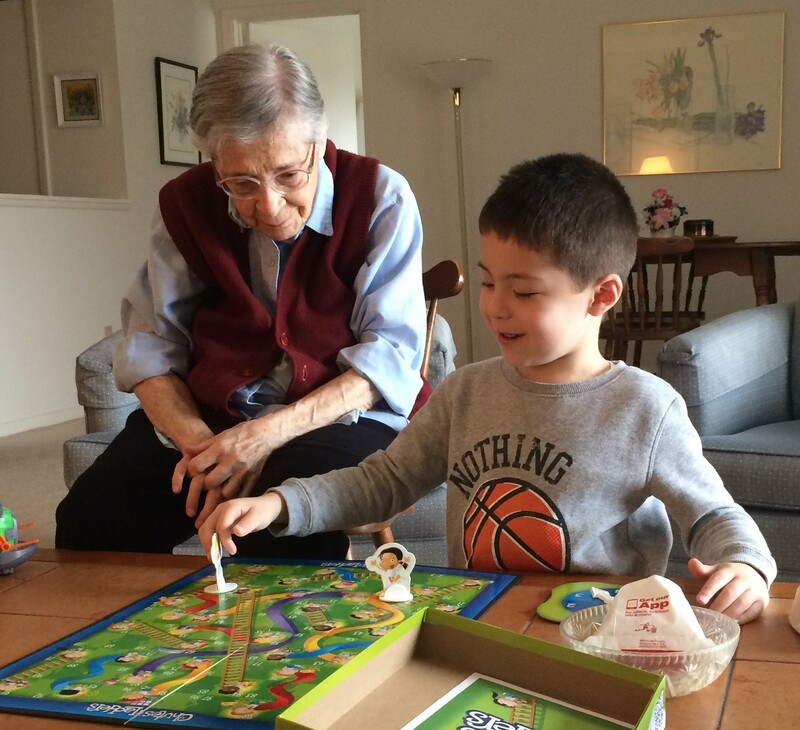 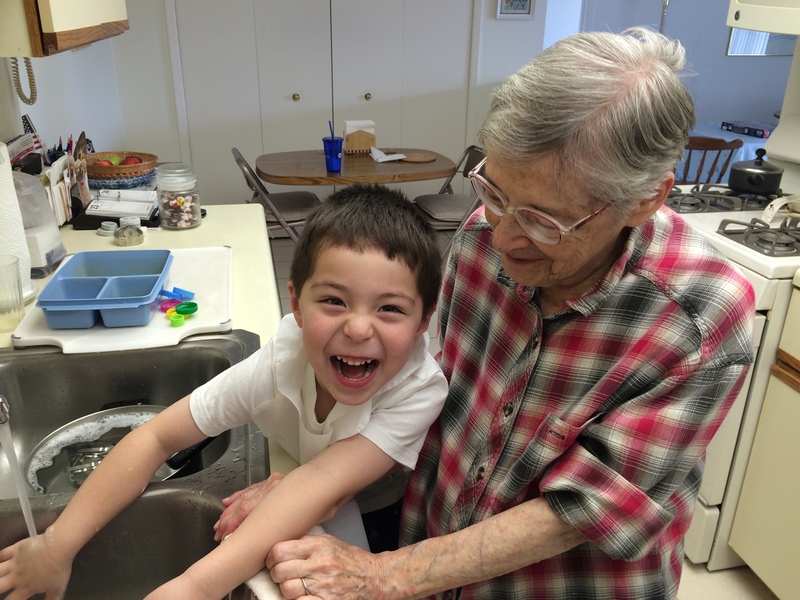 It was no easy task with class sandwiched between piano lessons and fun evenings with Grandma, Tyler and Carleigh. 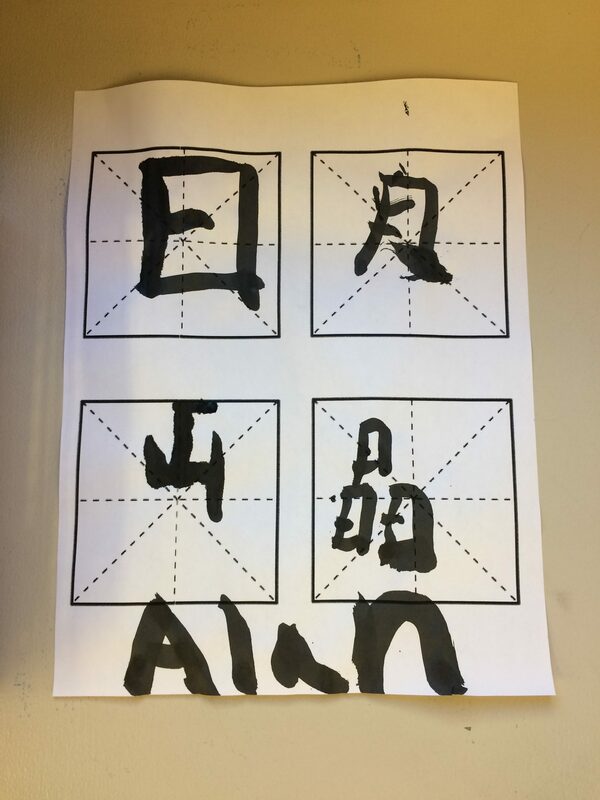 Over the last 4 weeks, Alan learned…. 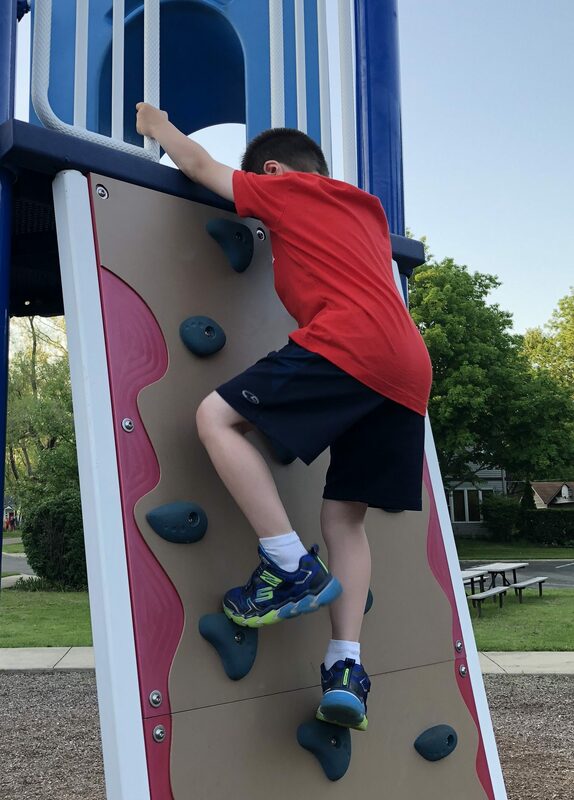 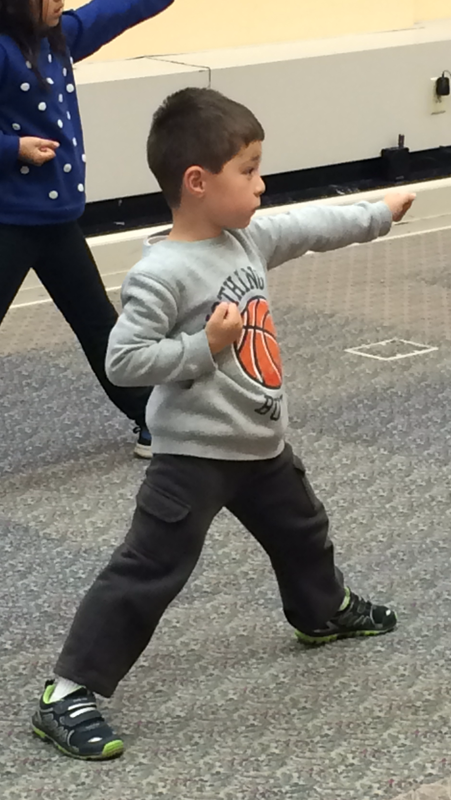 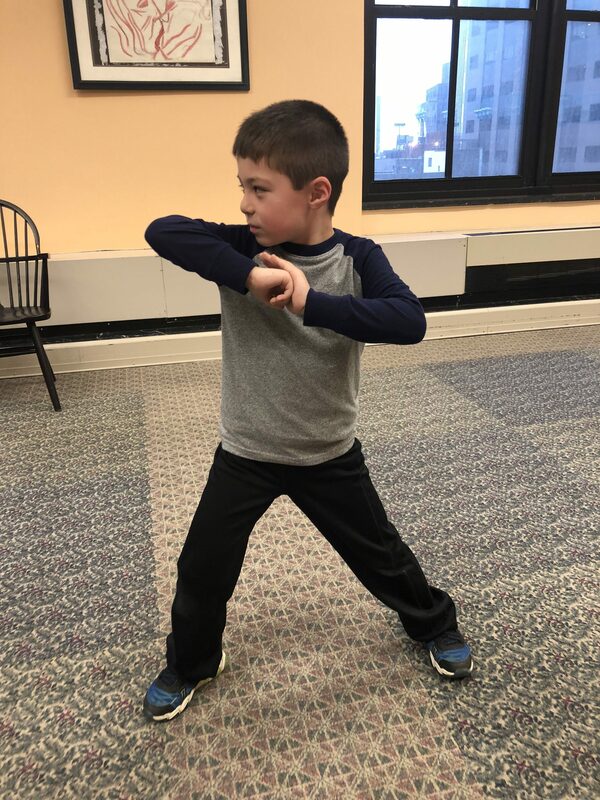 Alan learned a lot during language study time (first hour of class), but perhaps his biggest accomplishment of the Spring was how well he did with the martial arts portion (second hour of class). 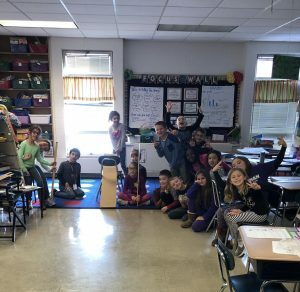 Sometimes the class played games during the second hour. 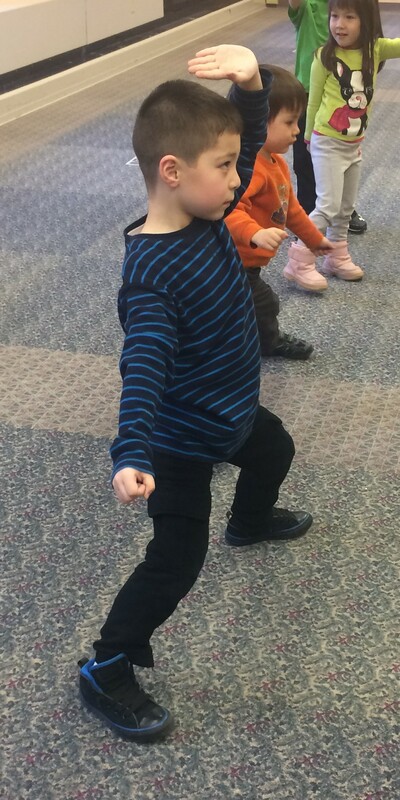 Other times they were serious about learning martial arts. 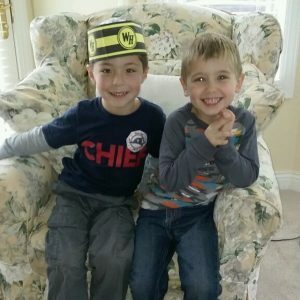 Alan hosted another friend today. 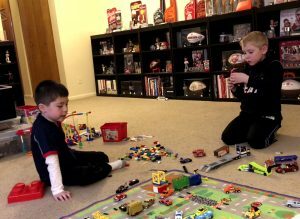 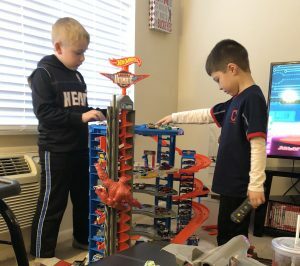 This time it was Noah who came over to see Alan’s Hot Wheels Super Ultimate Garage and play with Legos. 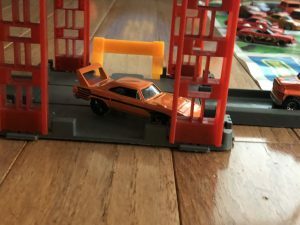 But they actually had the most fun playing with the new Hot Wheels mat. 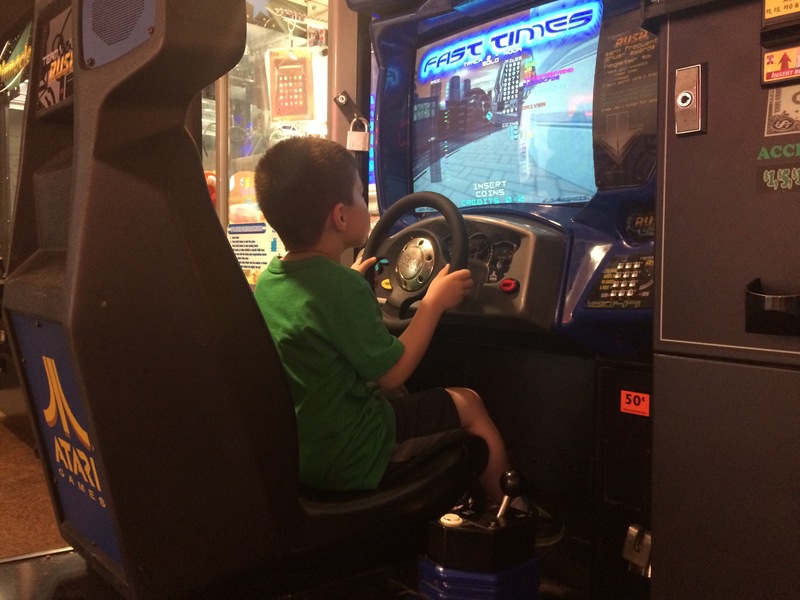 Alan drag-raced cars while Noah played the role of announcer! 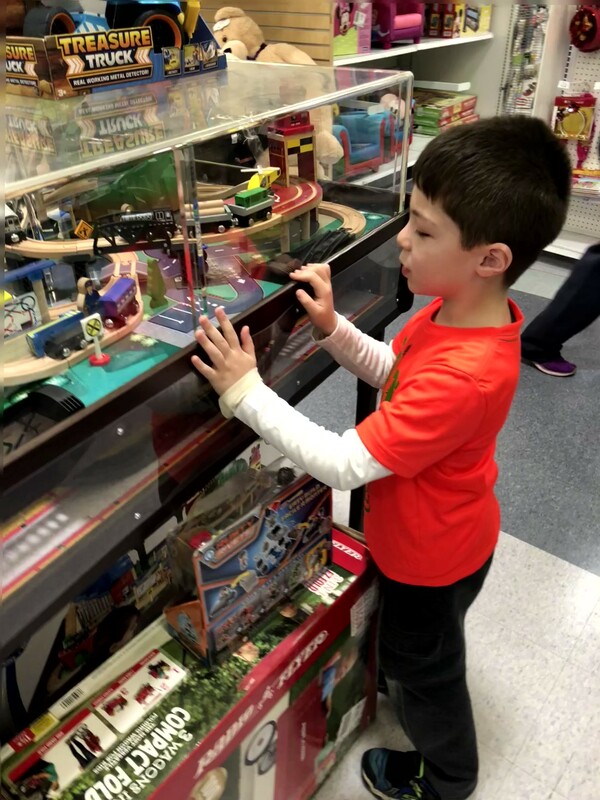 Following the news that Toys “R” Us was going out of business, Alan and I decided to make one last visit to the Mayfield Heights store – where Alan first fell in love with trains during his toddler years. 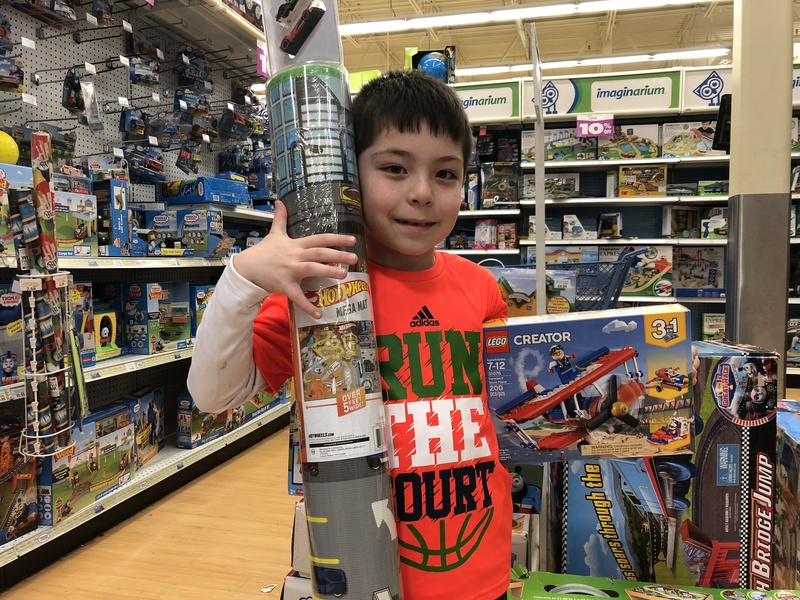 After we walked up and down all the aisles for one last memory, Alan picked out a Lego and a Hot Wheels car mat. 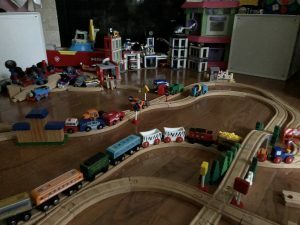 Then we took the photo above at the same train aisle where we used to spend many Saturdays playing with the Thomas the Train display table (see: http://alans-story.grilledshane.com/?p=57). 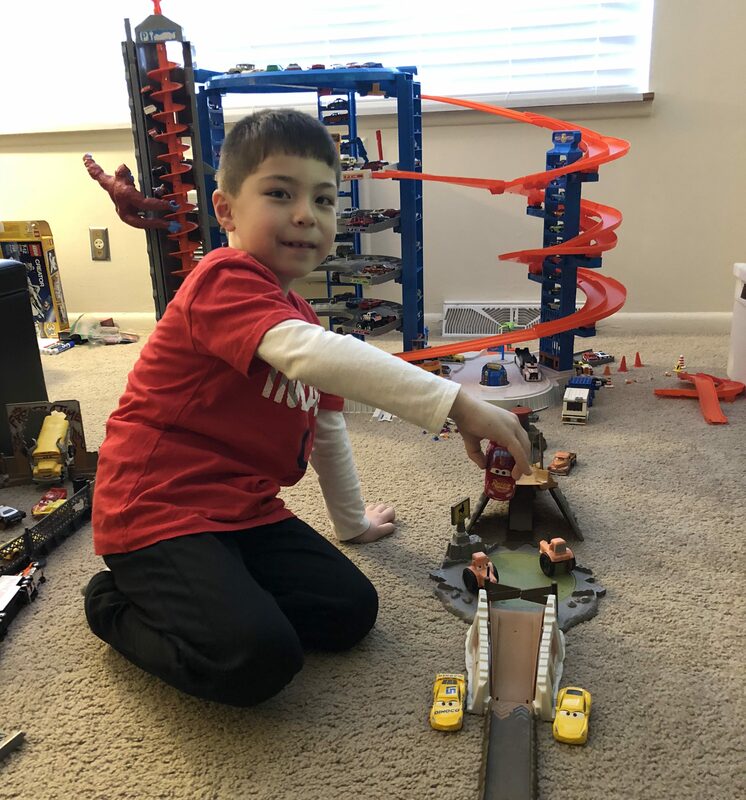 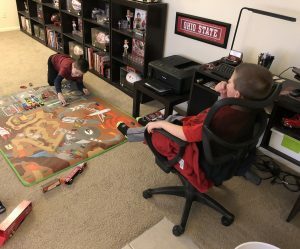 Alan invited Josh over today to see his Hot Wheels Super Ultimate Garage. Alan’s been asking for a while to invite a friend over so he can show it off. 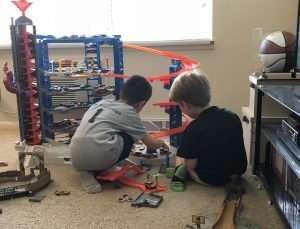 They had fun playing together. 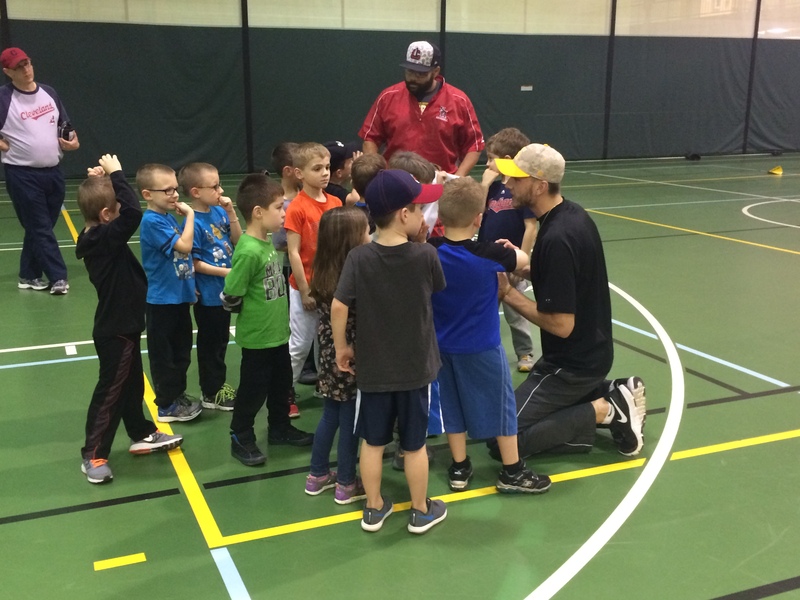 Alan kicked off year 2 of his Mayfield Boys Baseball League (MBBL) career today at the Wildcat Fitness Center. 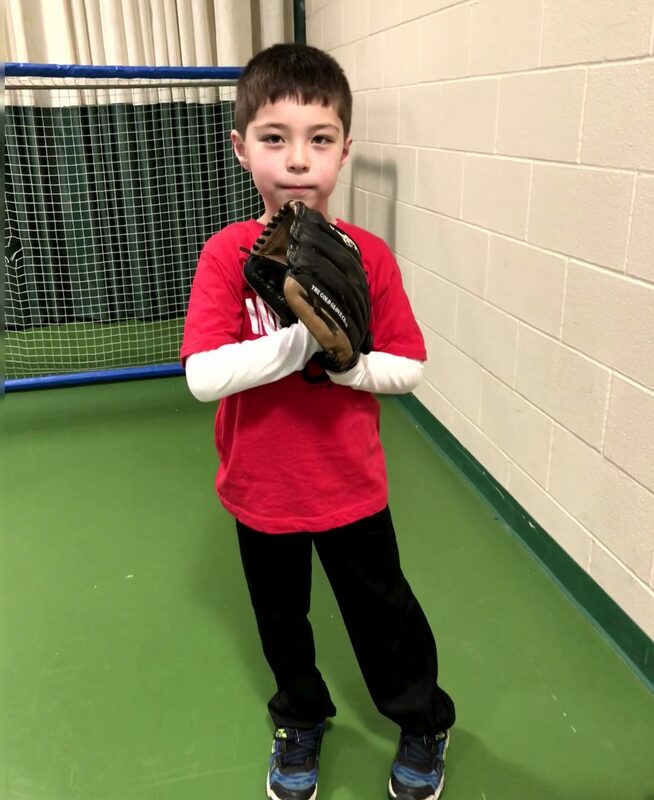 This season Alan has moved up to the Mighty Mite division (7-8 year olds), after playing in the Instructional division (5-6 year olds) last season. 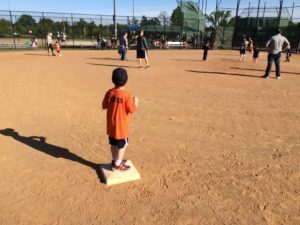 It’s still a coach-pitch division, but it’s a step up in competition. Today Alan came in for a talent evaluation. 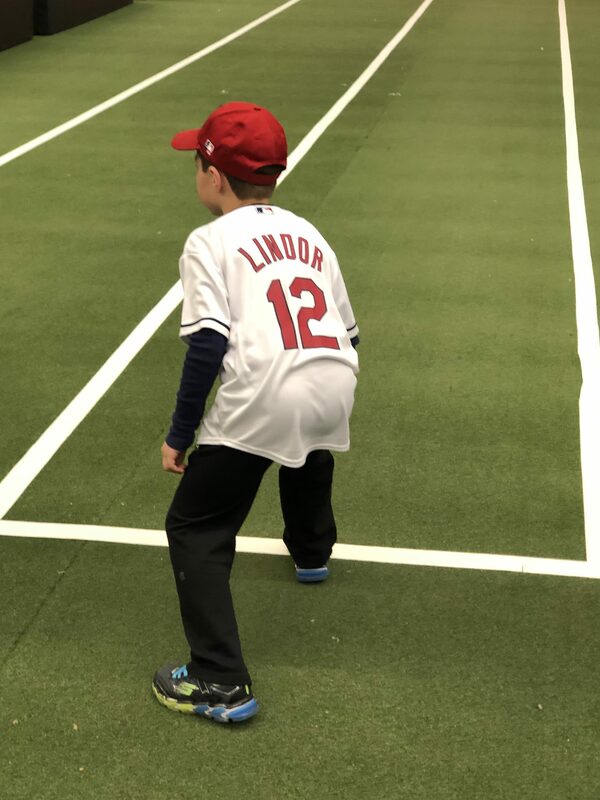 He started off by fielding grounders, throwing to a coach, and catching pop-ups. 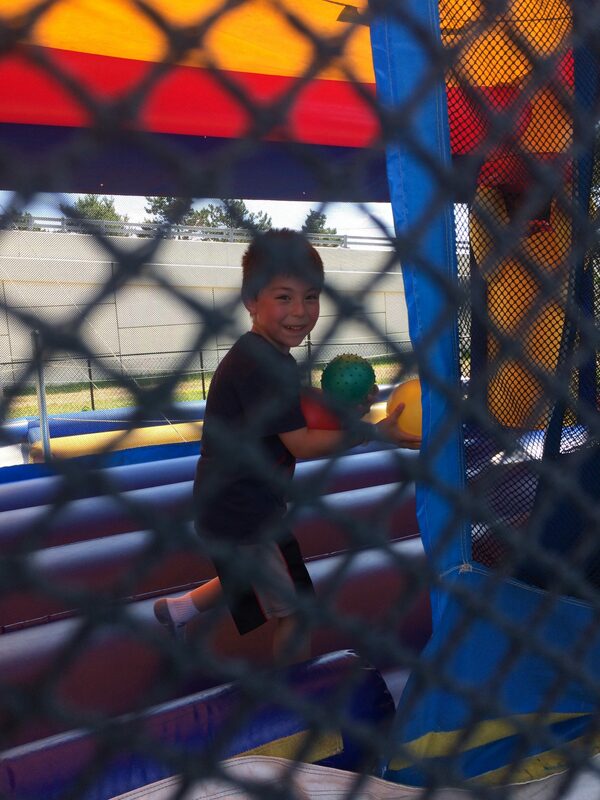 Afterwards, Alan took some batting practice in the batting cages. 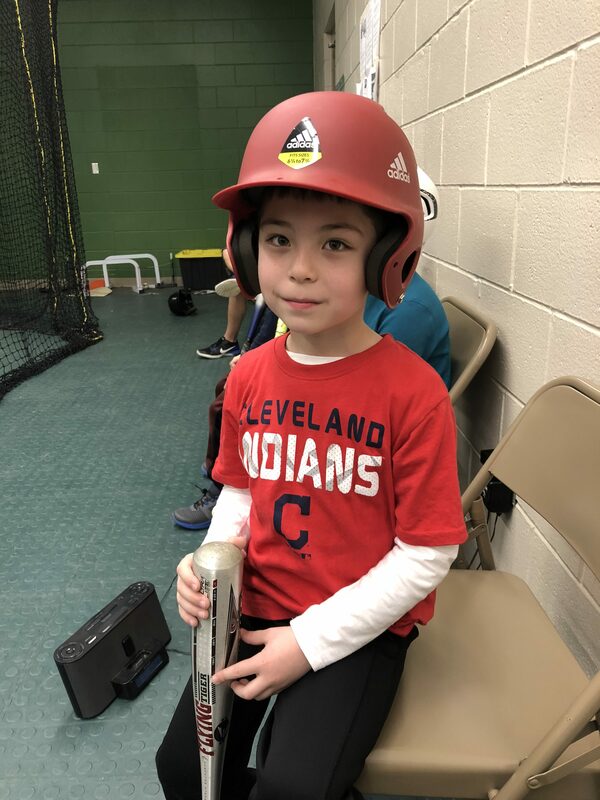 He did pretty well for his first swings of the season. 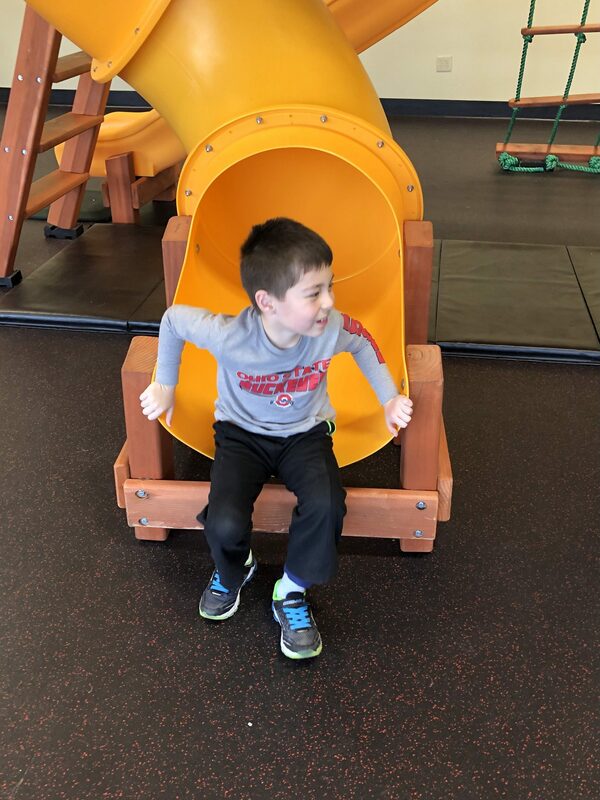 Alan was thrilled to see first grade classmates Logan and Jonah at the Fitness Center. 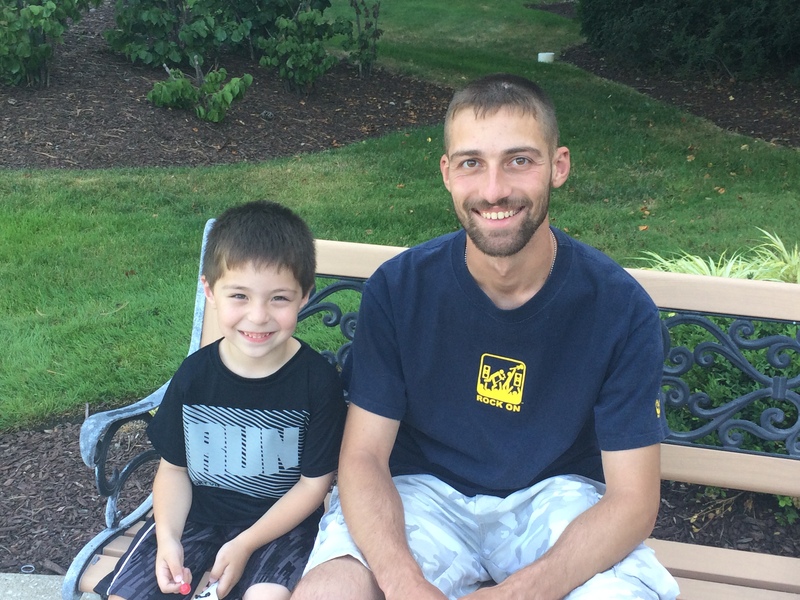 He also saw two teammates from last season – Chris and Connor. It figures to be another fun summer on the diamond! 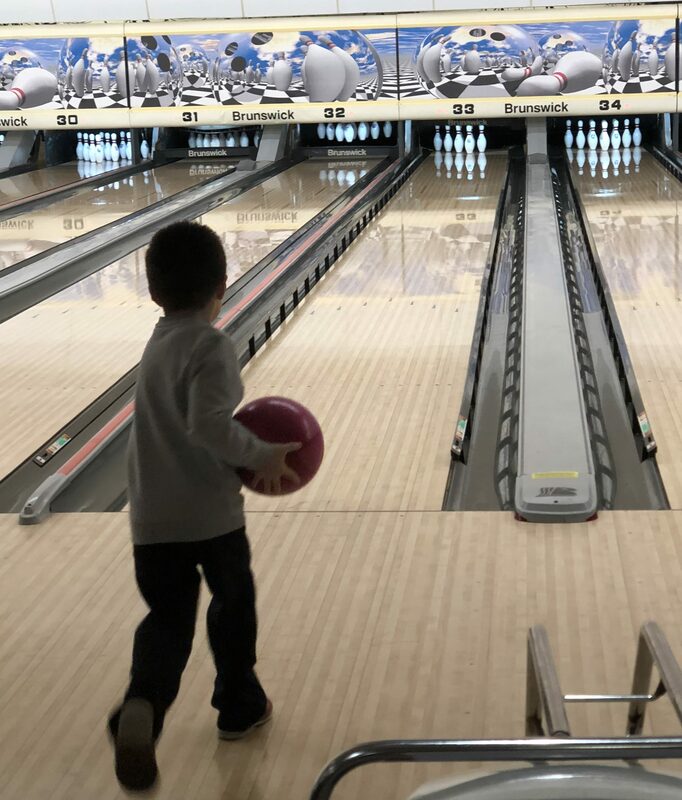 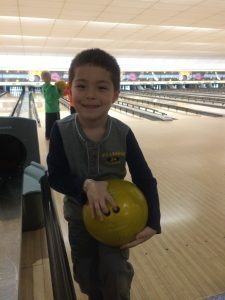 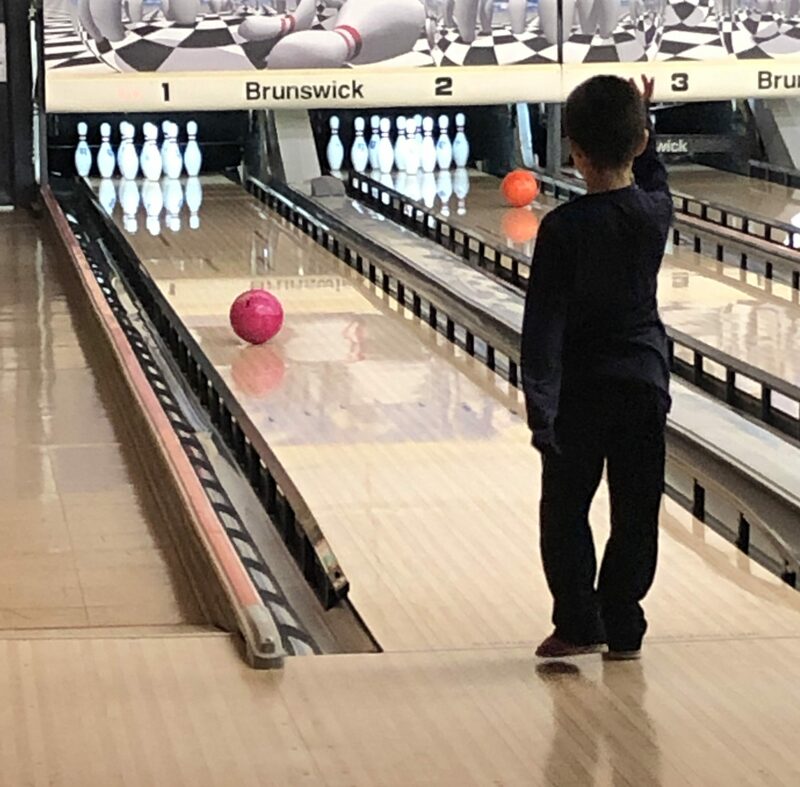 Alan was back at Wickliffe Lanes today for the first time since his 7th birthday party. 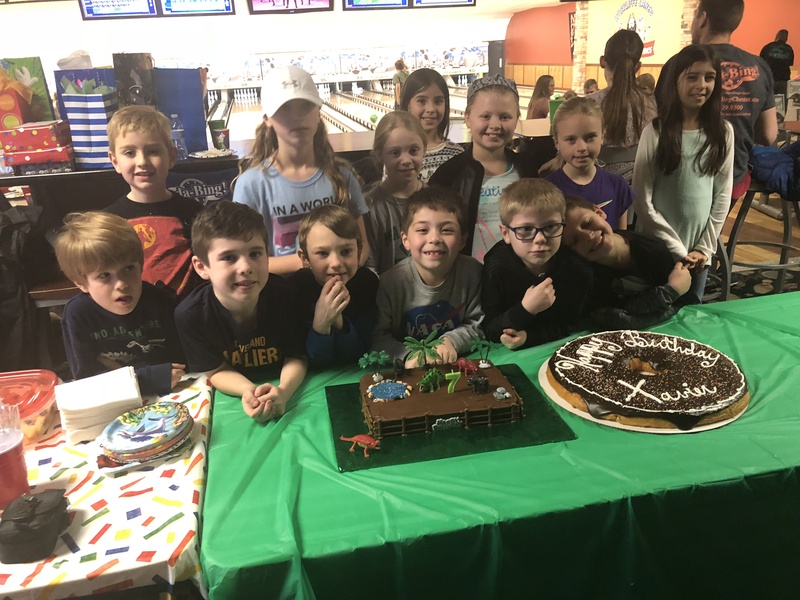 The gang got together for the second weekend in a row – this time to celebrate Xavier’s birthday. 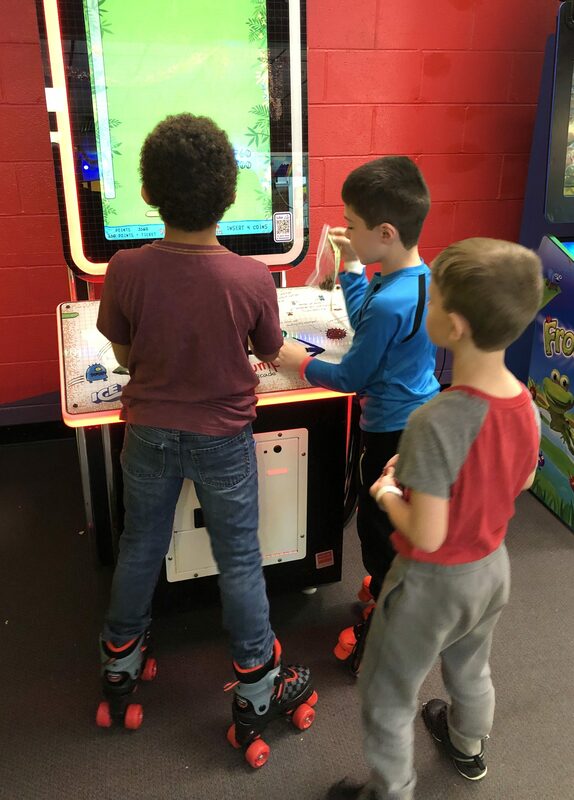 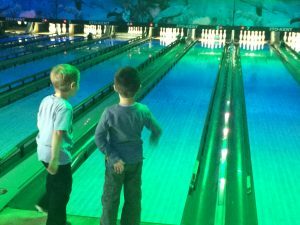 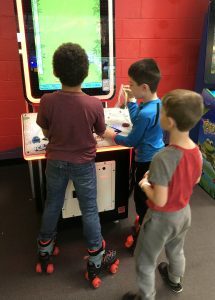 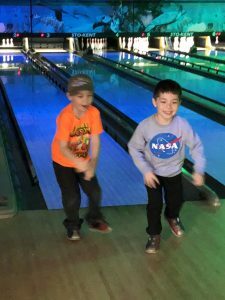 There was plenty of bowling again, but this time the kids found a fun arcade game that really grabbed their attention (I believe they were fighting aliens). 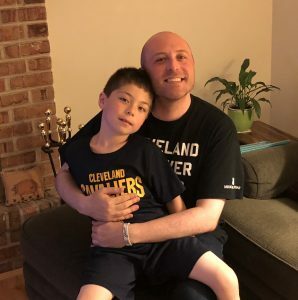 Once Xavier came over with a few dollars, they enjoyed that game more than anything else. 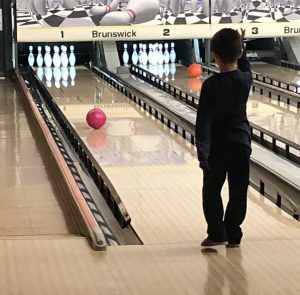 While bowling though, Alan picked up a spare! 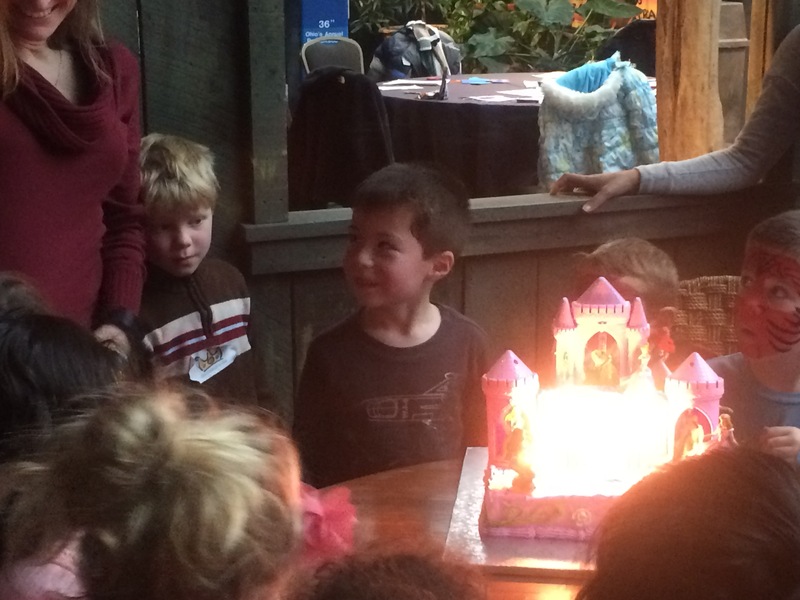 Alan’s winter birthday party tour continued today at Brady’s house. 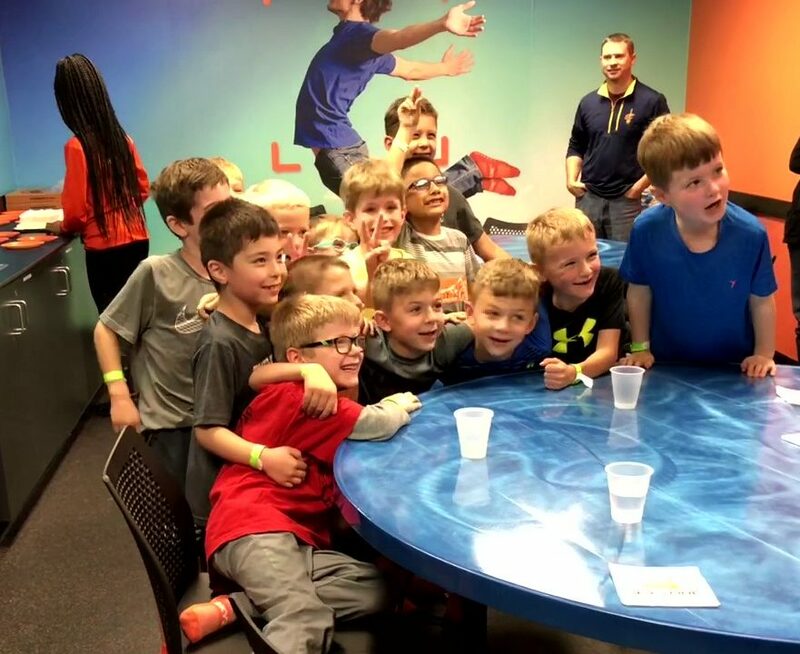 Brady invited over Grady, Xavier, Anton, Liam, and Alan to celebrate his 7th birthday. The kids ate popcorn and watched Cars 3! 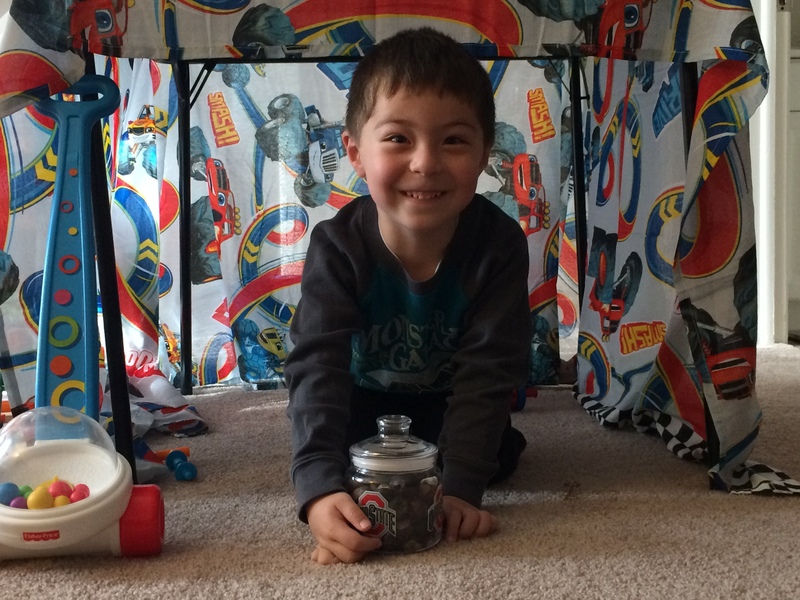 Alan even got to build a pillow fort, which he loves doing. According to Alan, Brady is his very best friend. They play together every day at recess and, on occasion, they swim together and play together at Brady’s house. 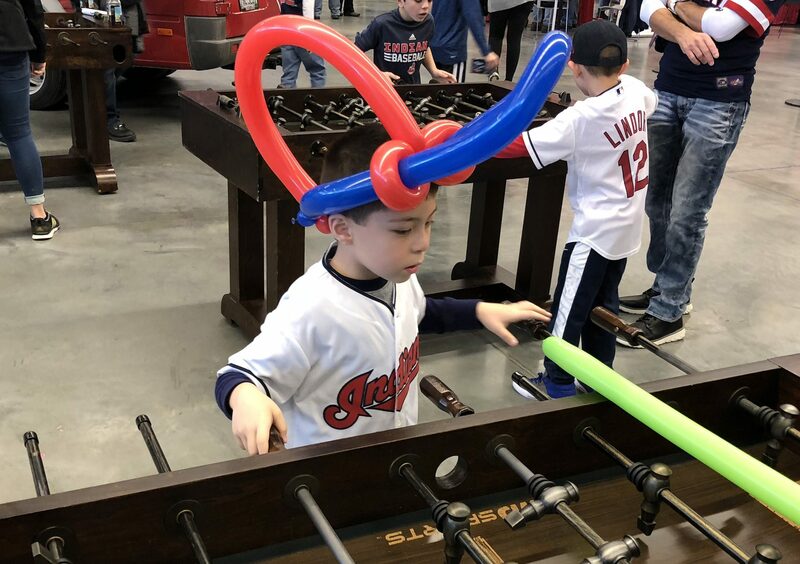 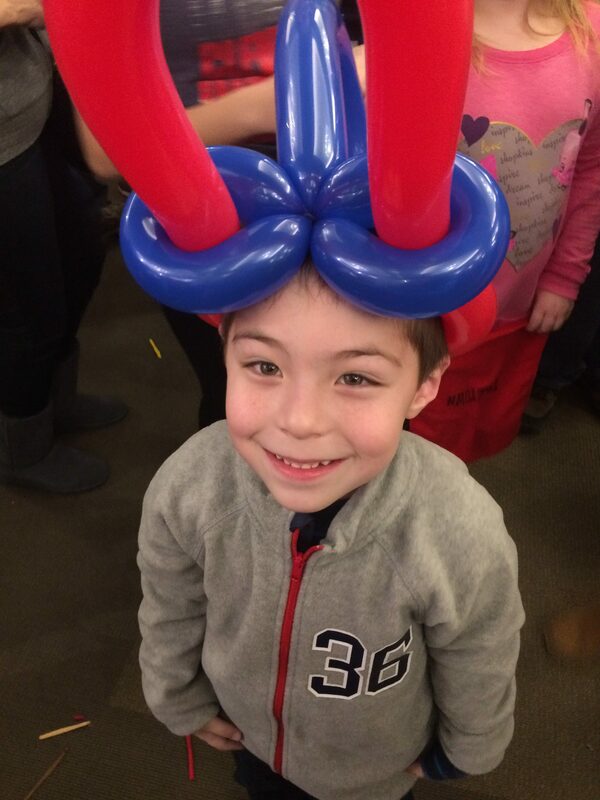 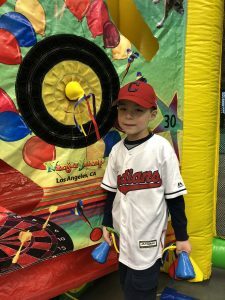 -Getting balloon animals at Tribe Fest! -Championship races on the Super Ultimate Garage racetrack! 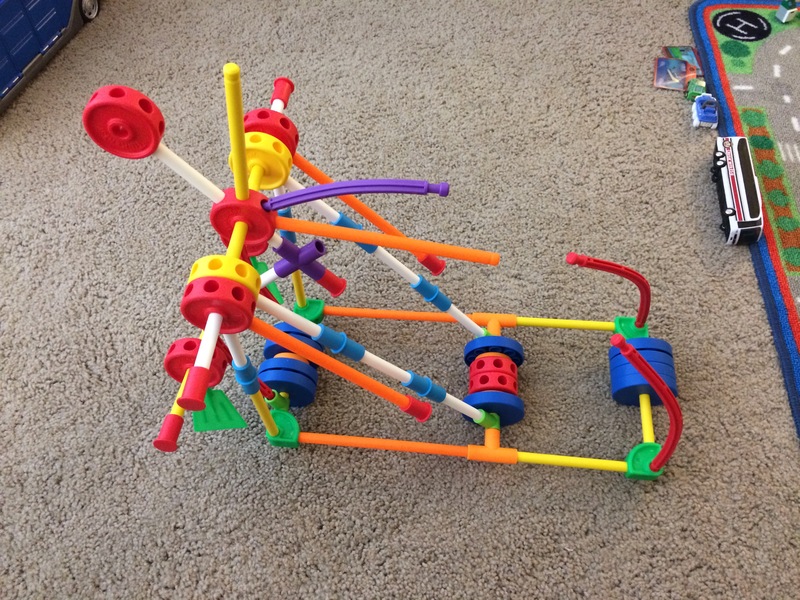 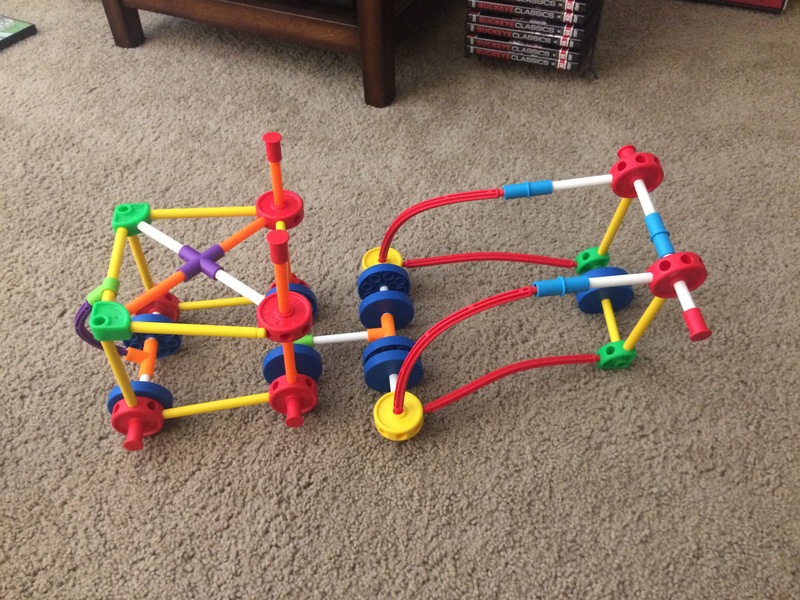 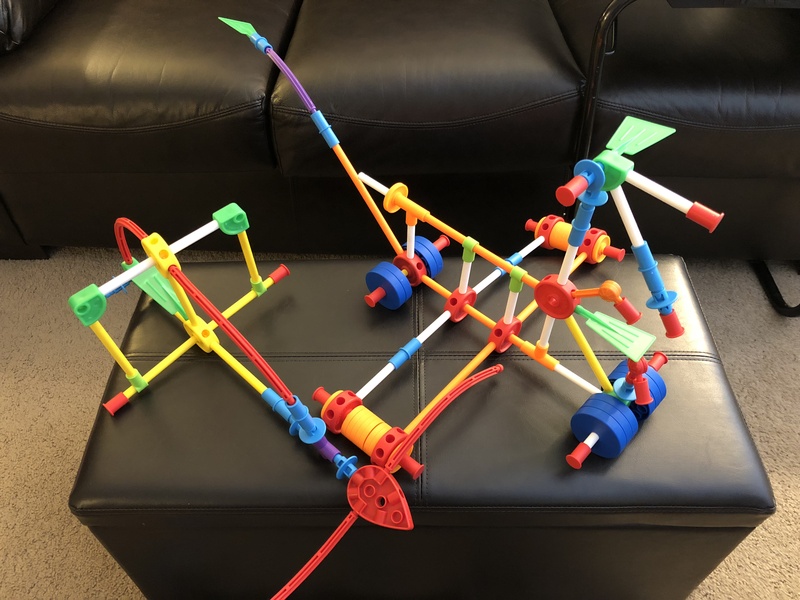 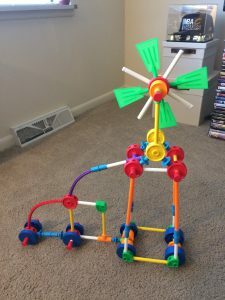 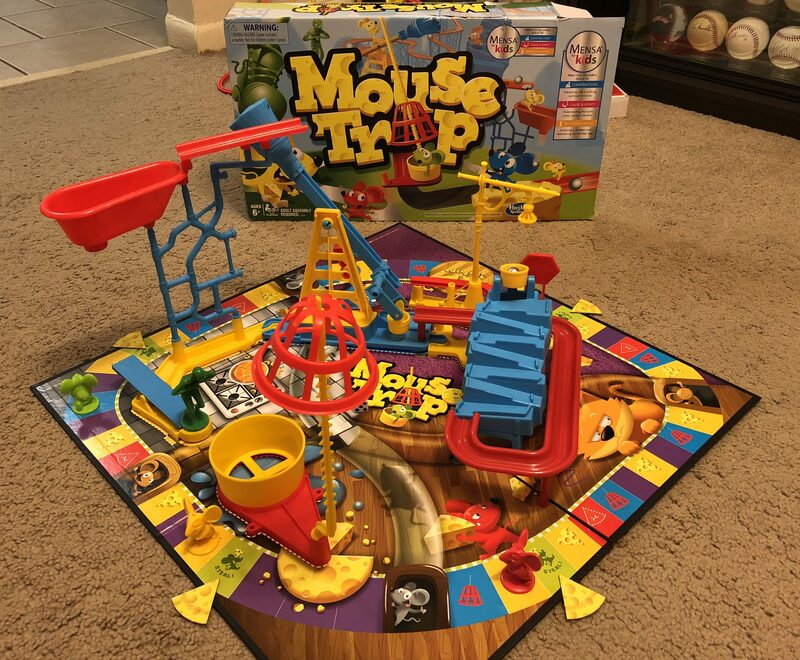 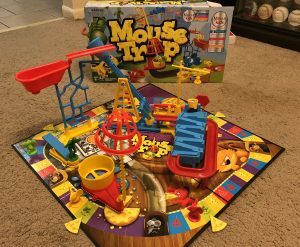 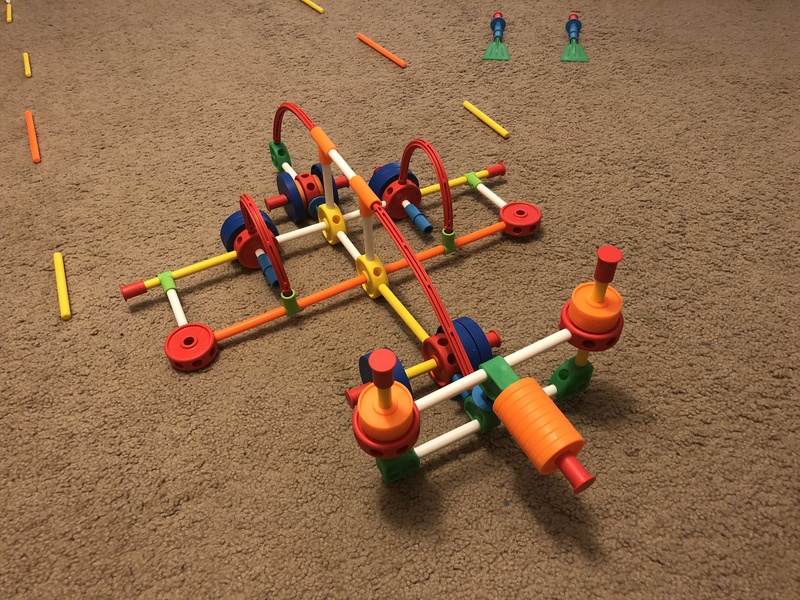 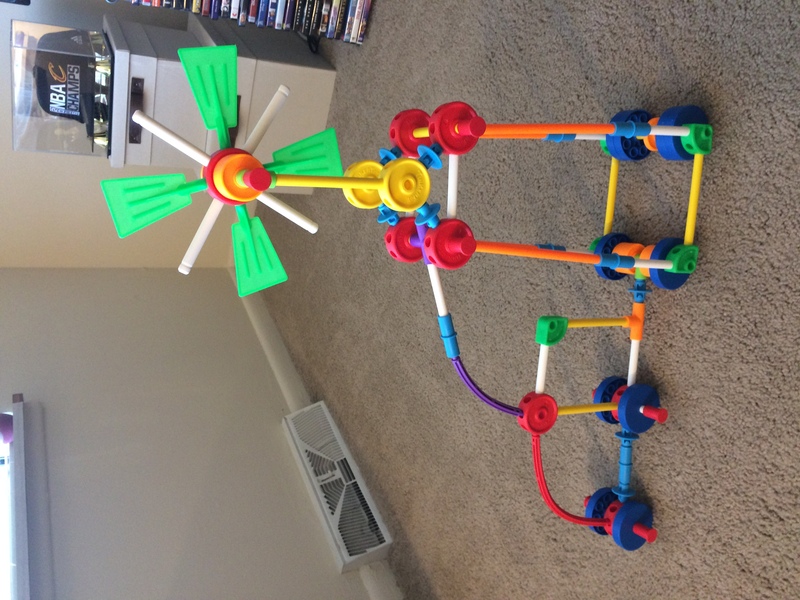 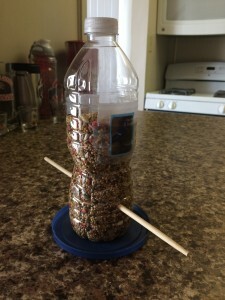 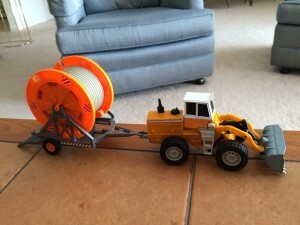 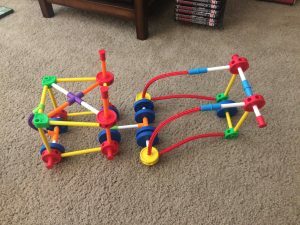 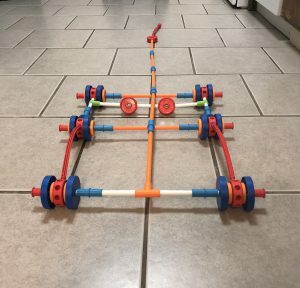 -Making new creations with Tinker Toys! 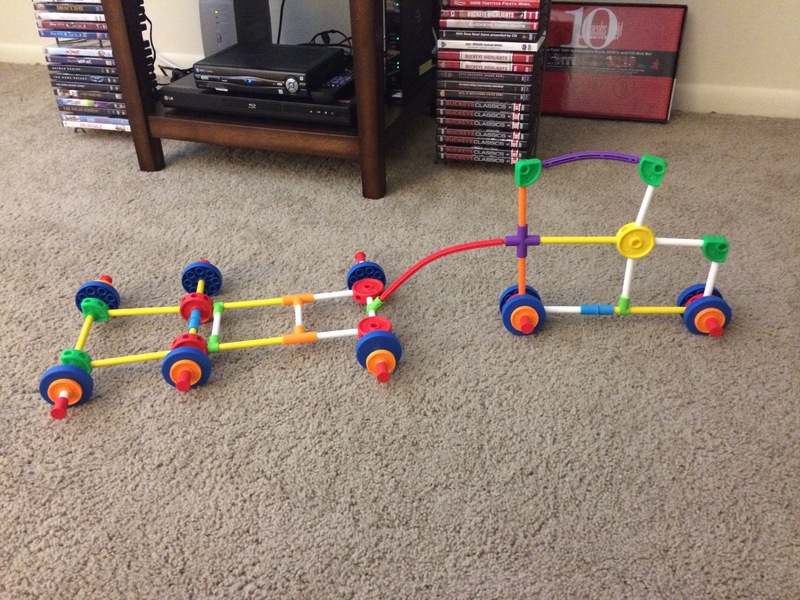 Propeller airplane (left) and moon rover (right). 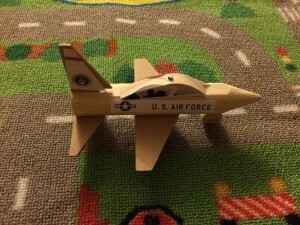 Passenger airplane. 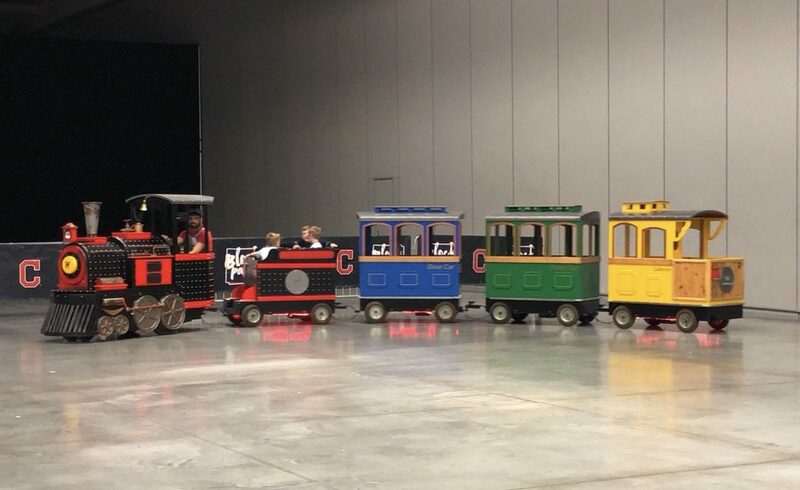 Also pictured: runway and runway crew batons. 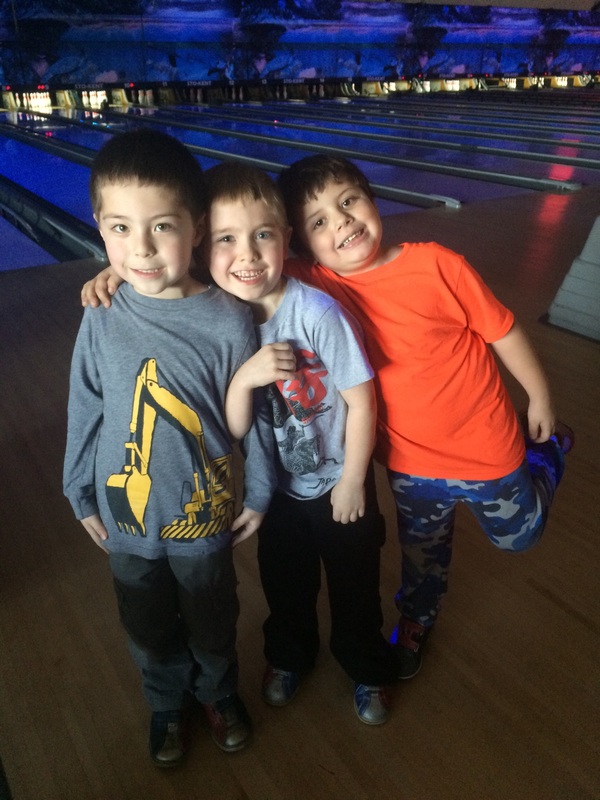 The cousins (plus one of Dominic’s friends) were together again today at Dominic’s birthday party at Stow-Kent Lanes. 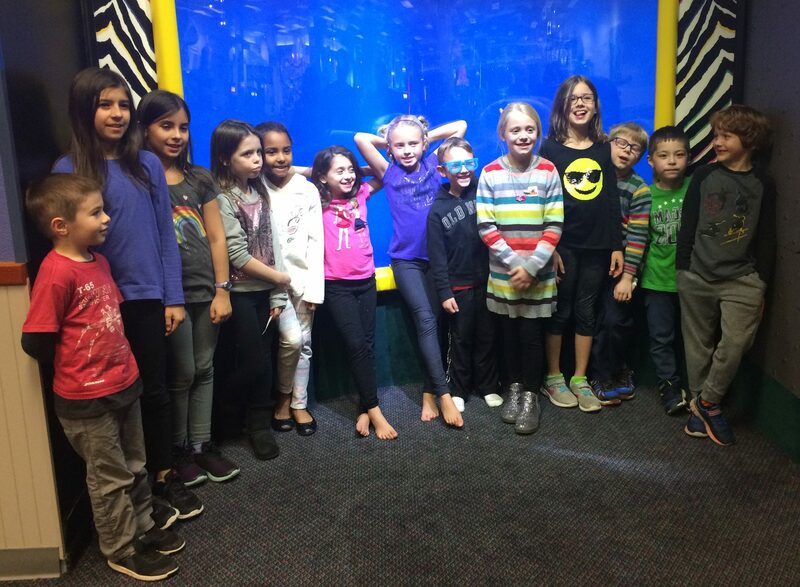 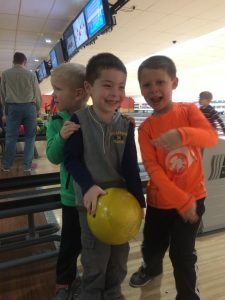 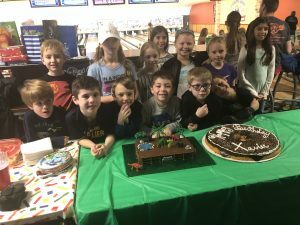 The gang had a fun time enjoying pizza, cake, and bowling. Alan picked up 4 spares on the day and won the second of two games played! 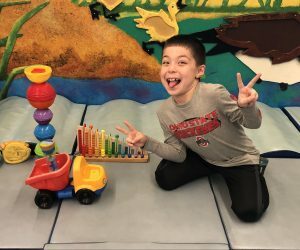 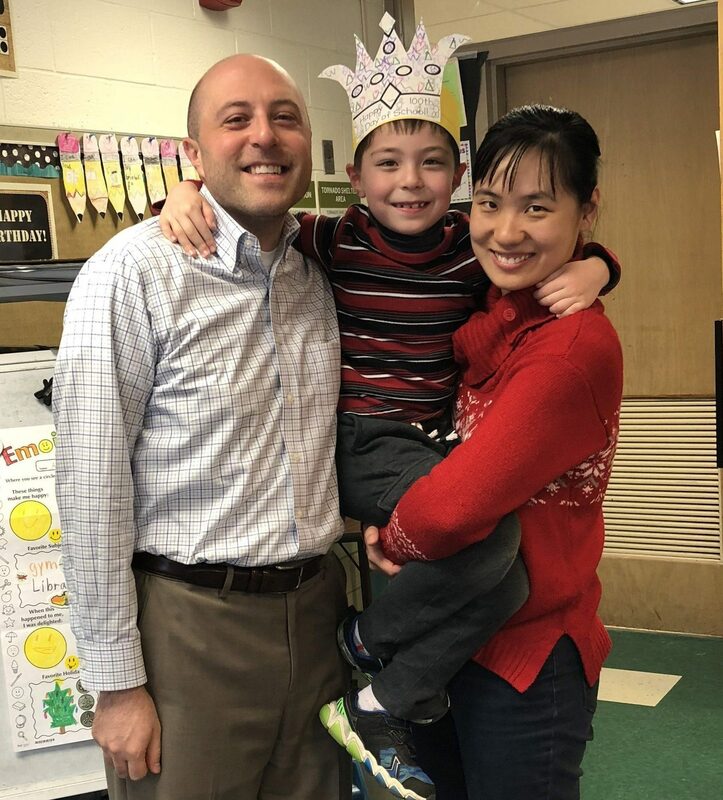 The week of January 29th through Feb 2nd was Alan’s week to be the featured student of the week in Mrs. Russo’s class! 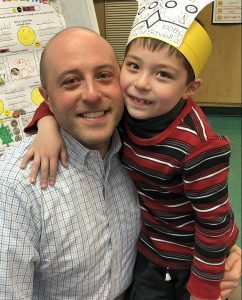 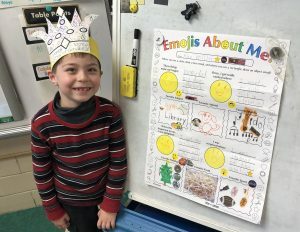 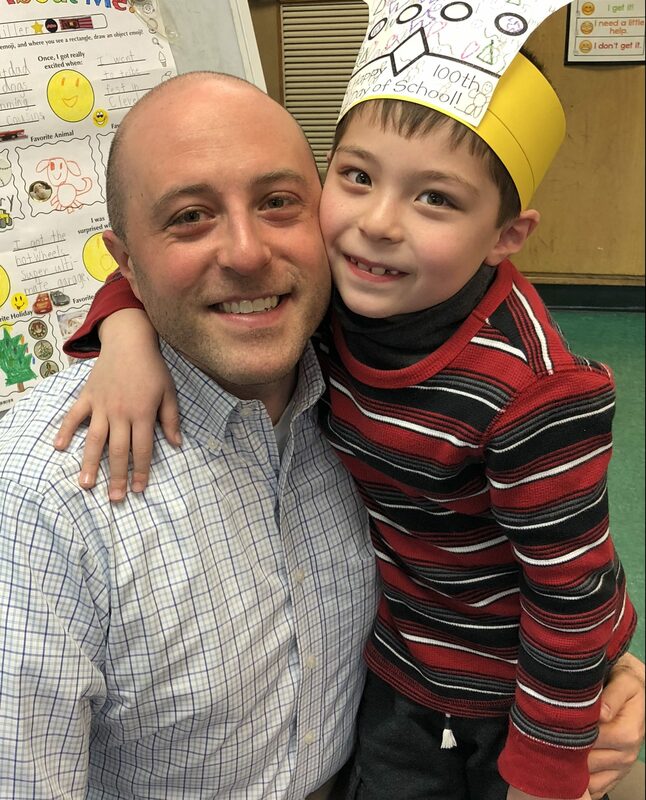 On Monday, Alan turned in his “Emojis About Me!” poster, in which he revealed his favorite subject (tie: gym and library), animal (Lulu), hobby (learning music), holiday (Christmas), food (Chinese bean sprouts), and sport (tie: baseball and basketball). 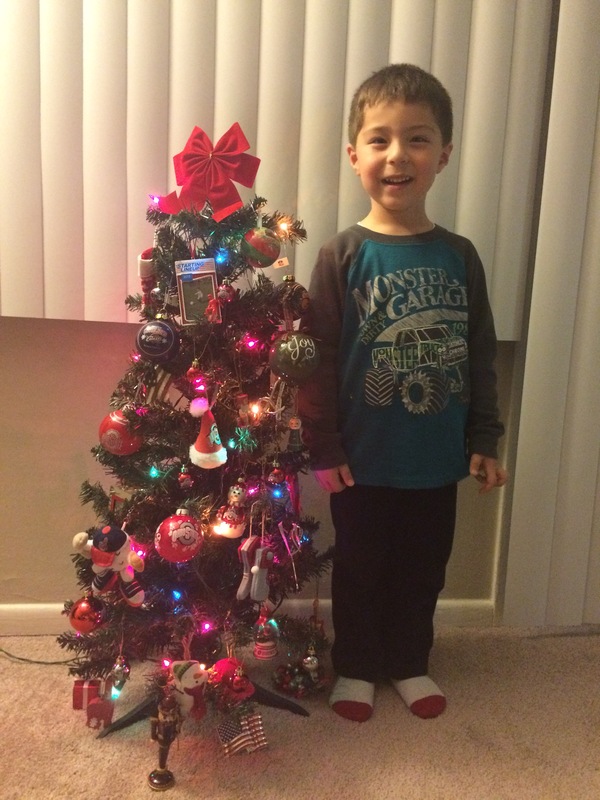 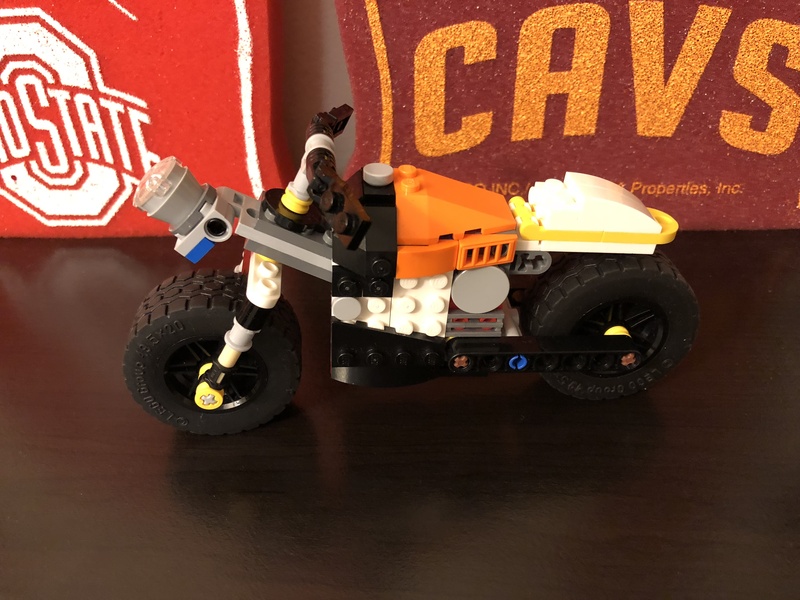 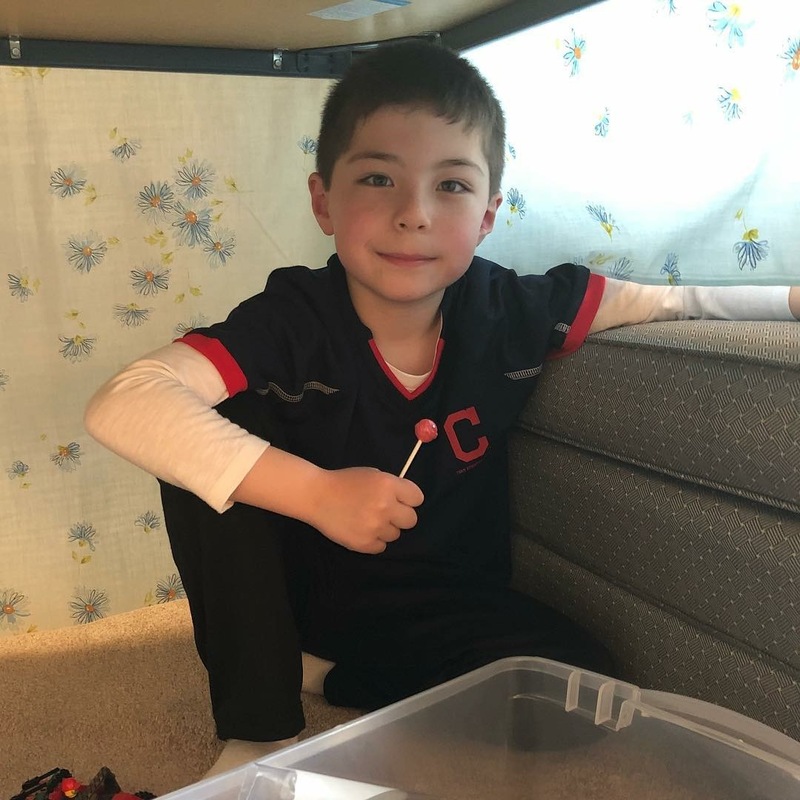 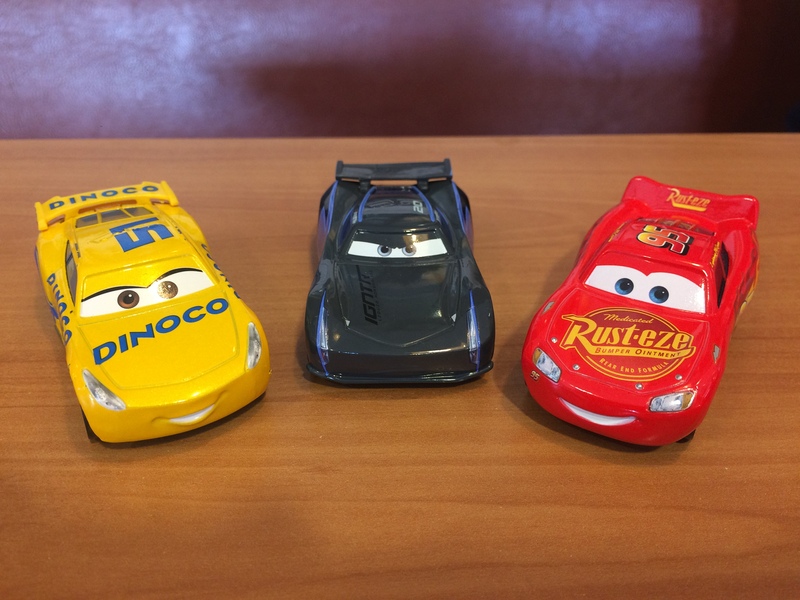 Alan also worked in stickers/mentions of some of his other favorites, including parents, cousins, swimming, Cars 3, the Hot Wheels Super Ultimate Garage, and Tribe Fest! On Tuesday, Alan brought in one of his “Lava Crawler” Lego vehicles (pictured on the far left below) for show-and-tell. 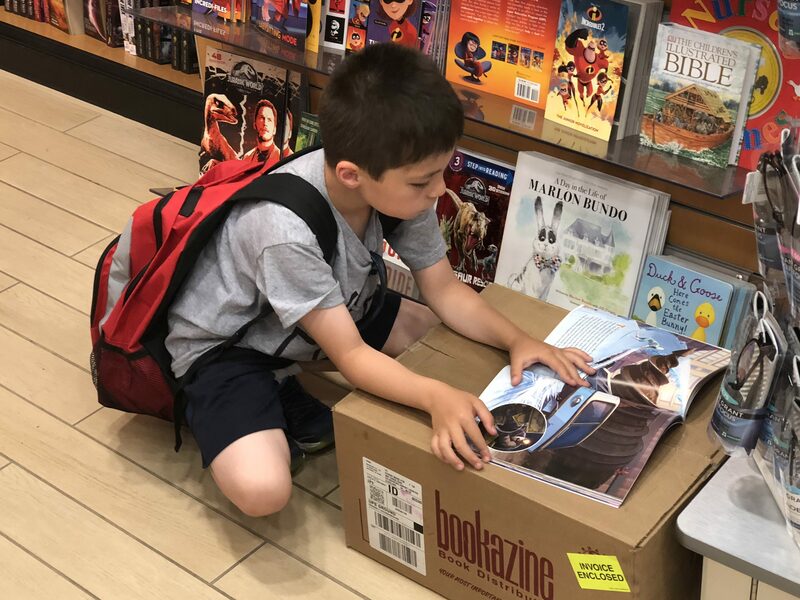 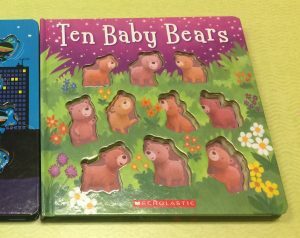 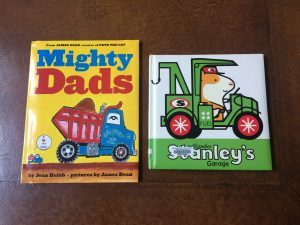 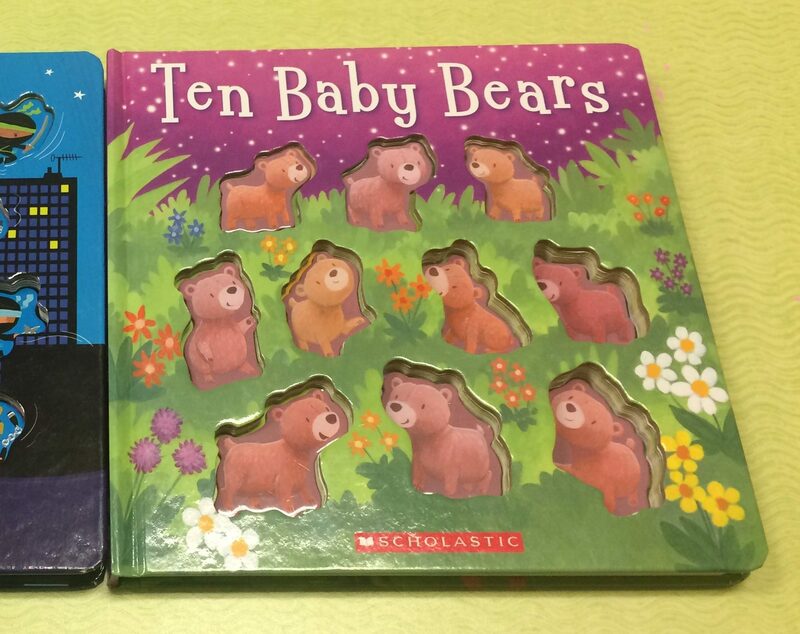 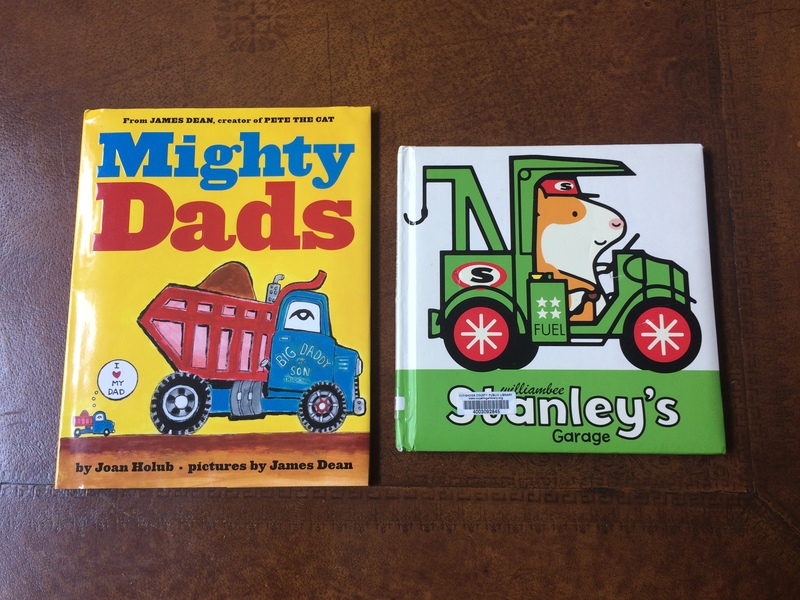 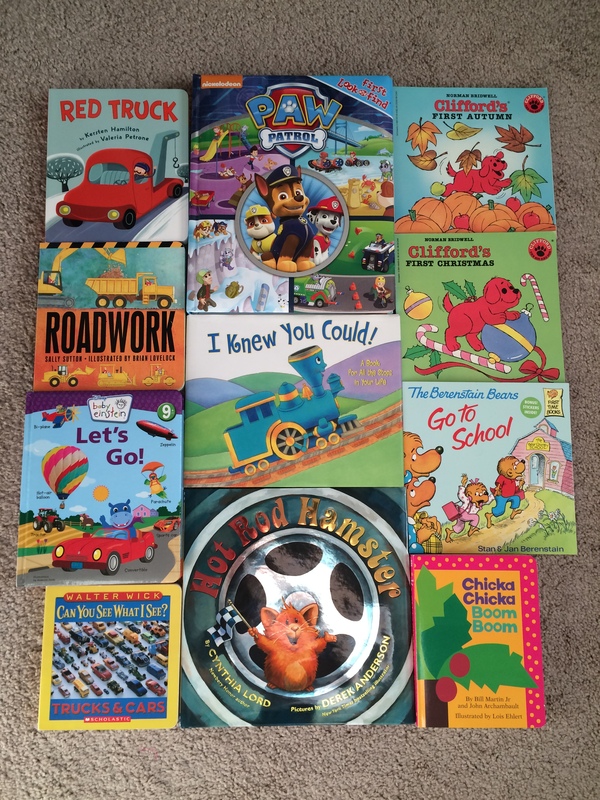 On Wednesday, Alan brought in one of the books we bought at last fall’s book fair – Ten Baby Bears – to share with his class. 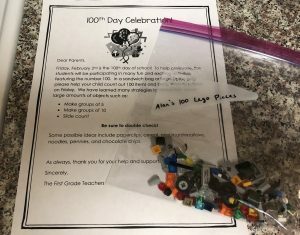 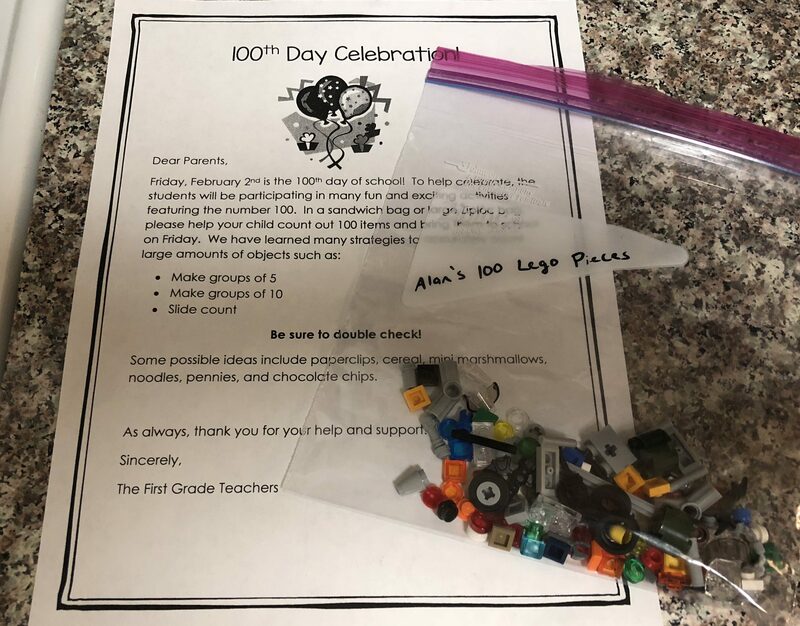 On Thursday night, Alan compiled 100 loose Lego pieces as part of a homework assignment to collect and bring in 100 items in honor of the 100th day of school (Friday)! 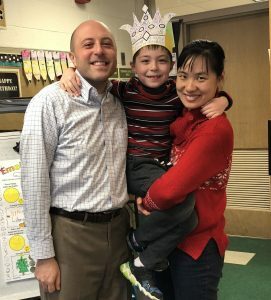 On Friday, Alan’s big week culminated with his parents visiting class to help him present his poster. 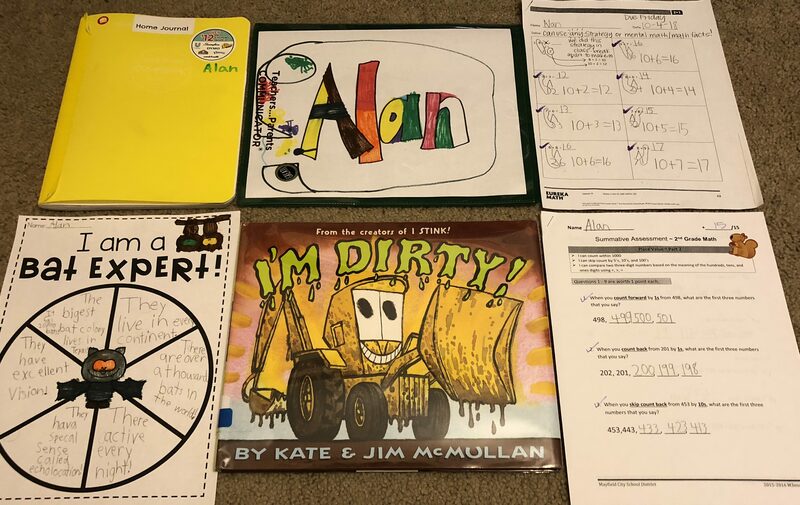 We shared pictures and told stories about Alan. 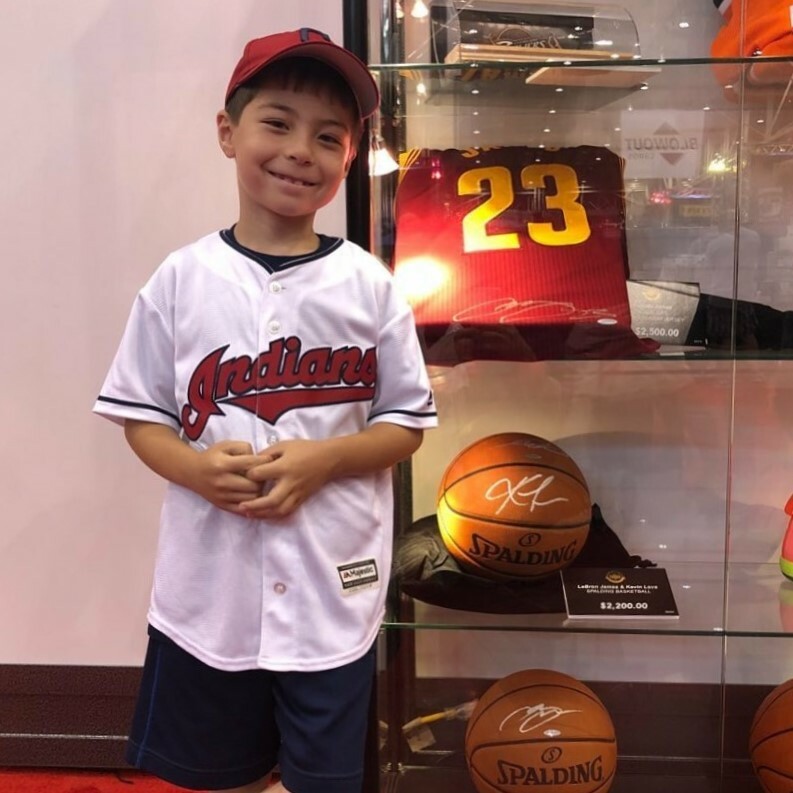 I made sure to bring pictures of Tyler, Lulu & Rosie, the Super Ultimate Garage, Alan meeting Jose Ramirez, and Alan in his LeBron jersey. Then the class presented Alan with a “star student” book that they made. It was full of nice comments about Alan, which he loved to hear. Alan was all smiles with his arm around either Mom or Dad the whole time. 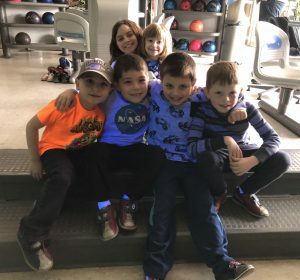 When I took out my camera, some of his friends, especially Ella, wanted in the pictures too! 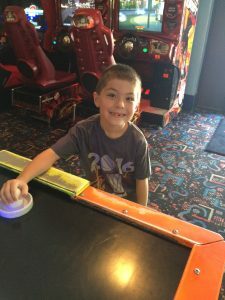 Afterwards I got to take Alan to lunch. 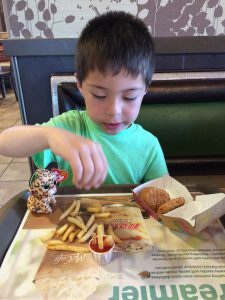 He picked McDonald’s of course – our favorite hang out spot! 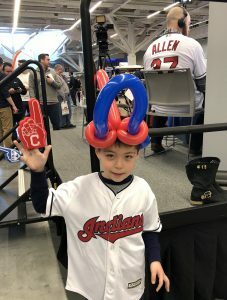 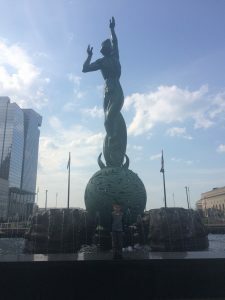 Today Alan attended Tribe Fest for the second year in a row – this time at the spacious Cleveland Convention Center. 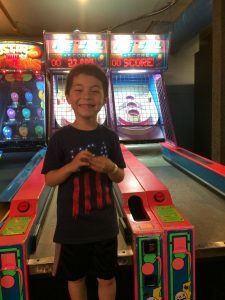 With the added space came the opportunity for additional activities for kids, including air hockey (our favorite), foosball (where Alan broke into a Happy Dance when he scored a goal), and darts (where Alan scored a bullseye!). 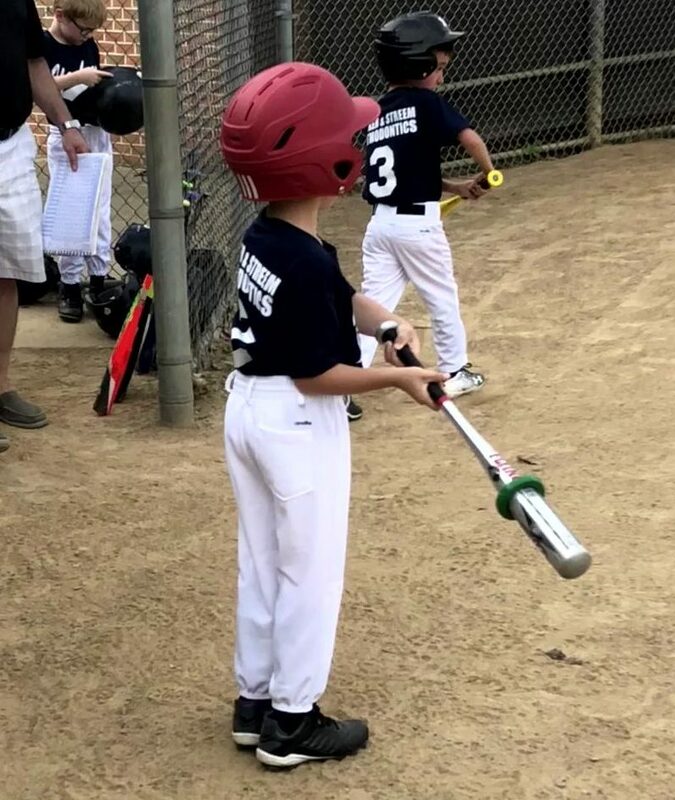 But of course there was still hitting and pitching. For the second straight year at Tribe Fest, Alan excelled with the accuracy of his pitches. 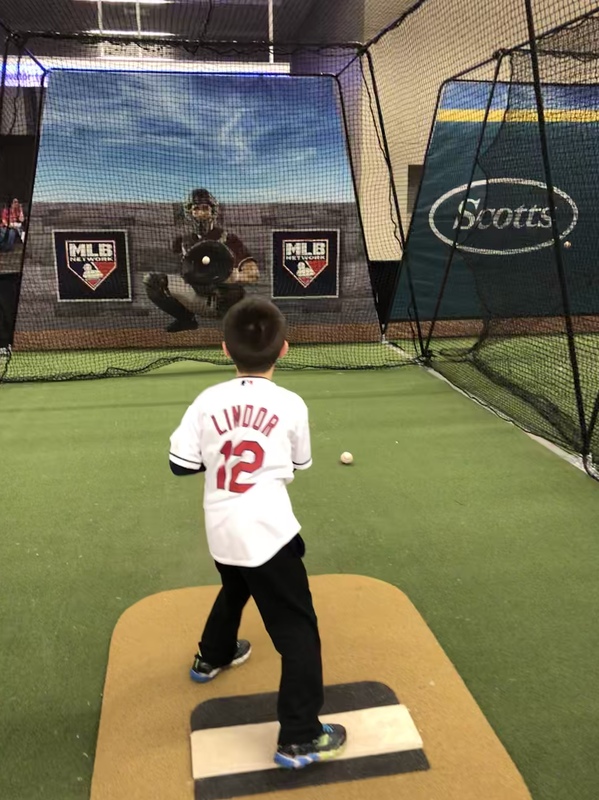 He threw three straight strikes, capped off by a perfect pitch! It would appear that he’s going to grow up to be a control pitcher. 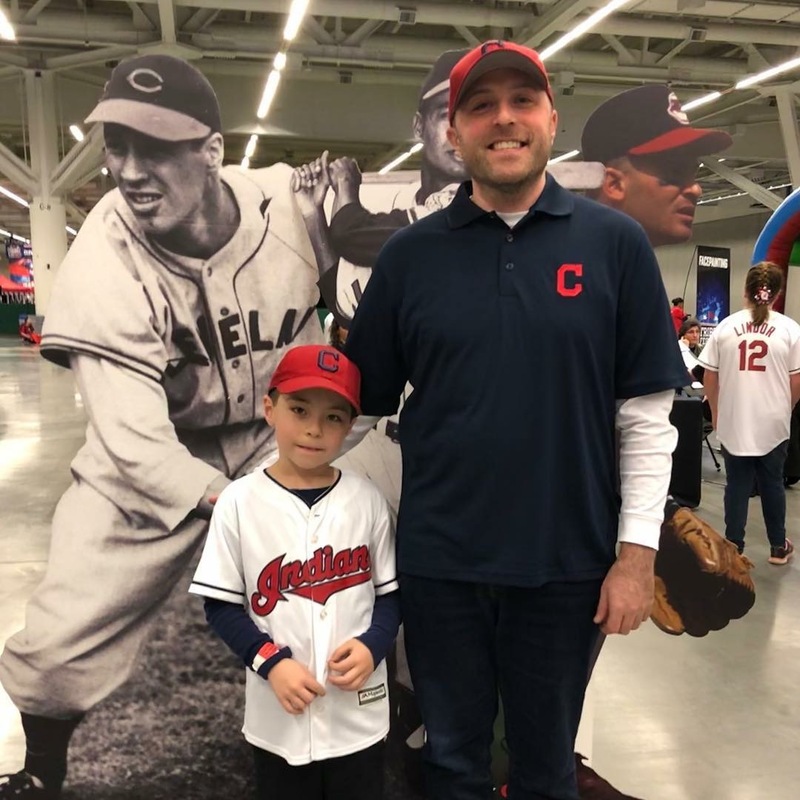 To conclude a great day, Alan took a picture near one of his favorite Indians (at least favoritely-named), Cody Allen, as he was being interviewed by Channel 3. This evening Alan celebrated De’Onta’s birthday at a roller skating party. 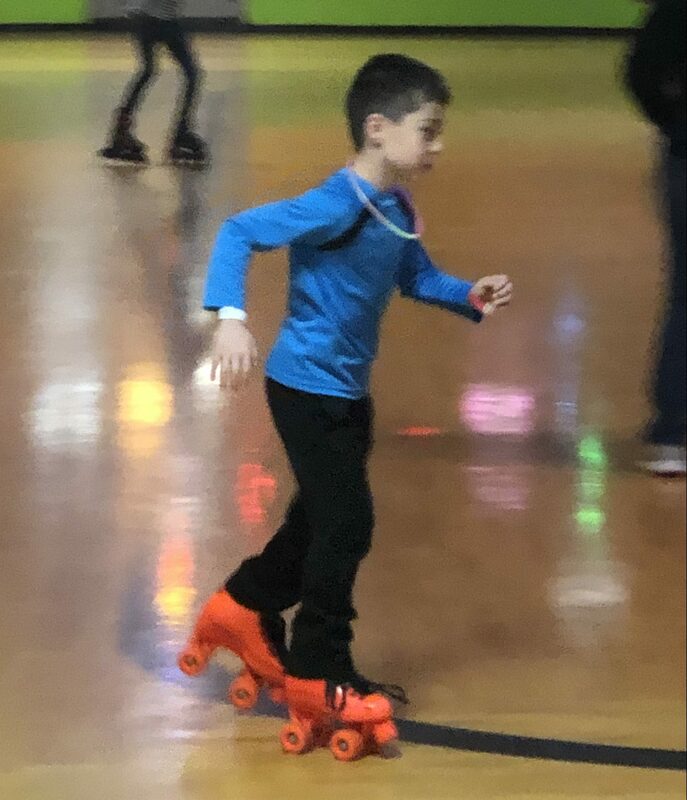 It was Alan’s first time roller skating. The kids were there a good 3 hours before calling it a night. It made for a late night for Alan by the time he caught up with his cousins for their usual Saturday night play time. 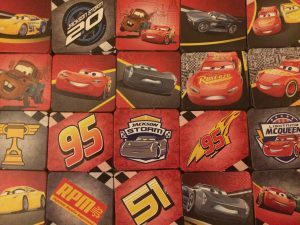 -Anything and everything related to Cars 3! -Lulu & Rosie…and Lacey too! 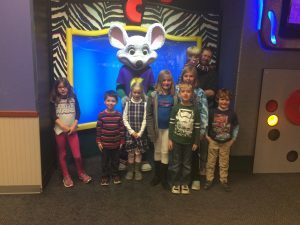 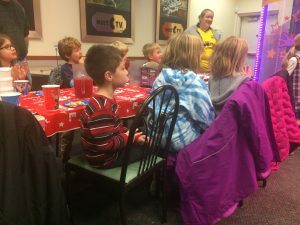 For the second year in a row, Cassidy’s birthday party was held at Chuck E. Cheese’s. 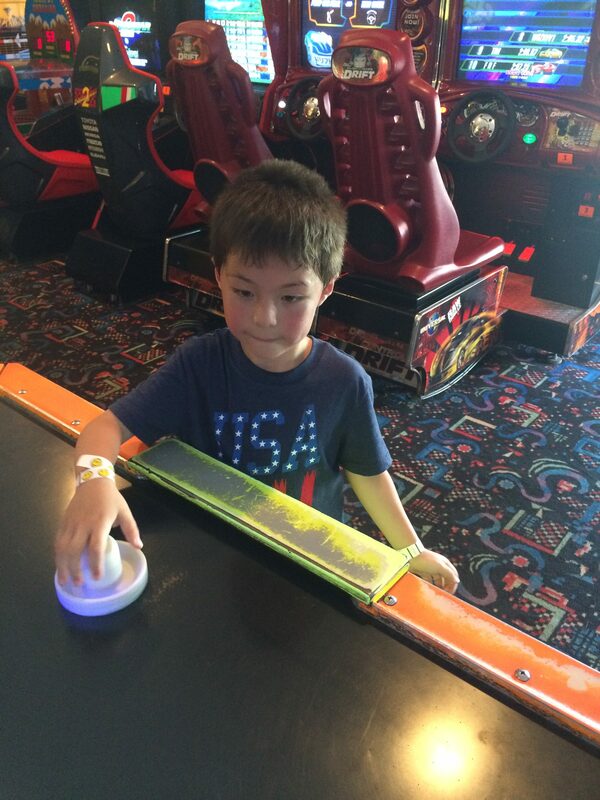 Alan and I loved it because we got to play air hockey together. 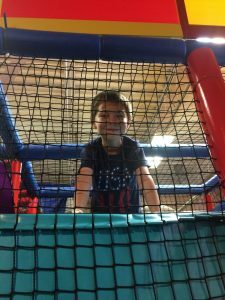 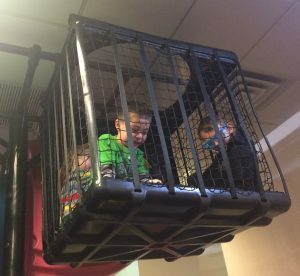 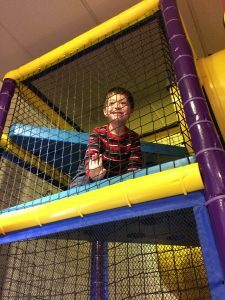 Later on, after the kids ran out of tokens, Alan, Xavier, and Josh entertained themselves by running through the play area and hanging out in their cage hideout. 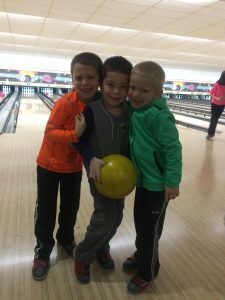 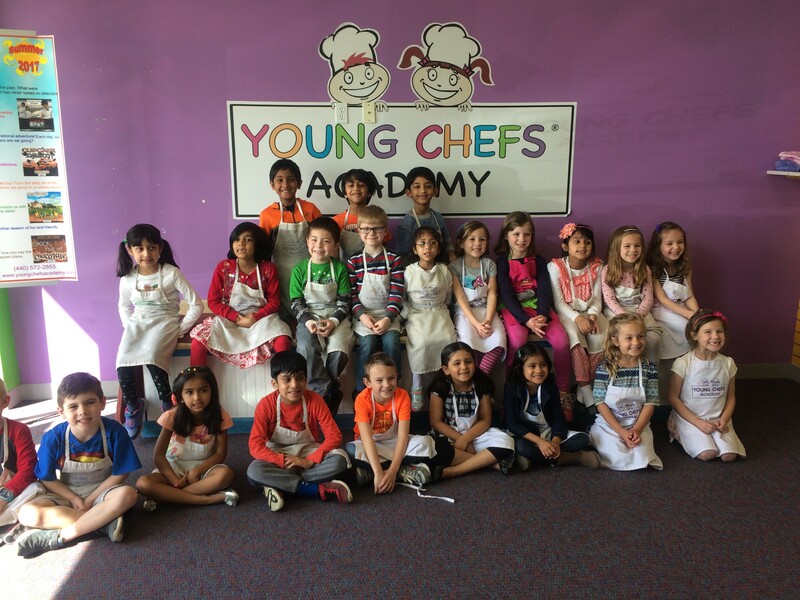 They had so much fun that they closed the place down for the second year in a row! Cars 3 is now out on DVD, and Alan became a proud owner of a copy the first day it was available. 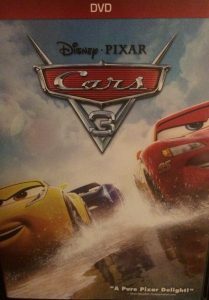 We have been waiting since the summer for this DVD to come out, and we wasted no time in having a movie night together last night! 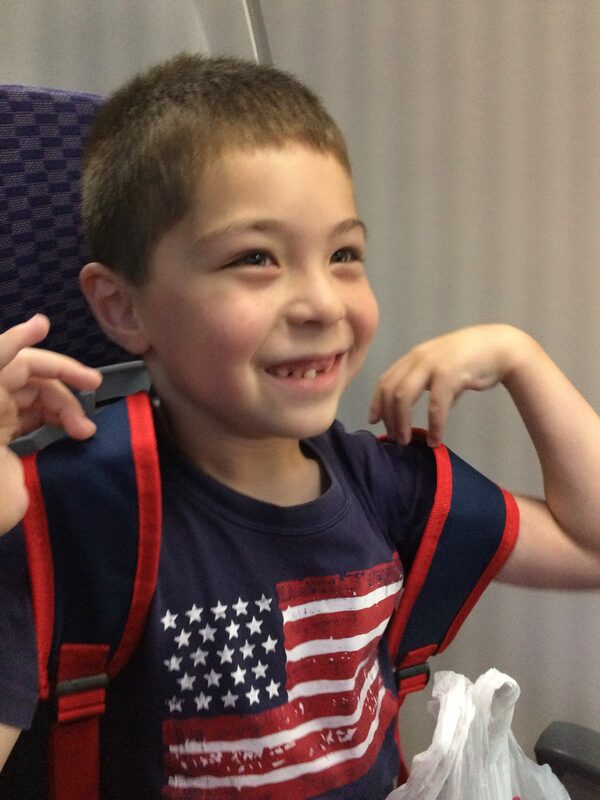 It’s fitting that Alan also lost another tooth yesterday (next to front big right tooth). Nothing has defined Alan’s first grade year more than Cars 3 and losing teeth! 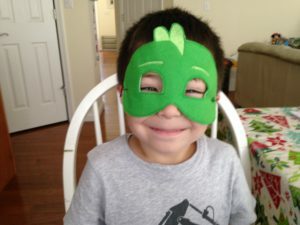 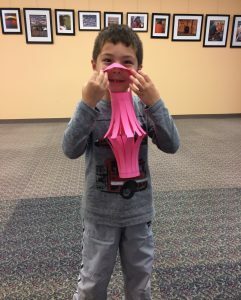 Today Alan made a colorful Beijing Opera Mask at Chinese class. 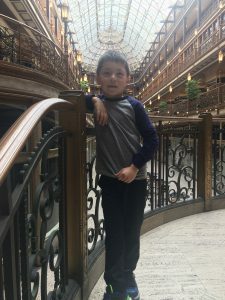 Beforehand, he visited the historic Cleveland Arcade for the first time! 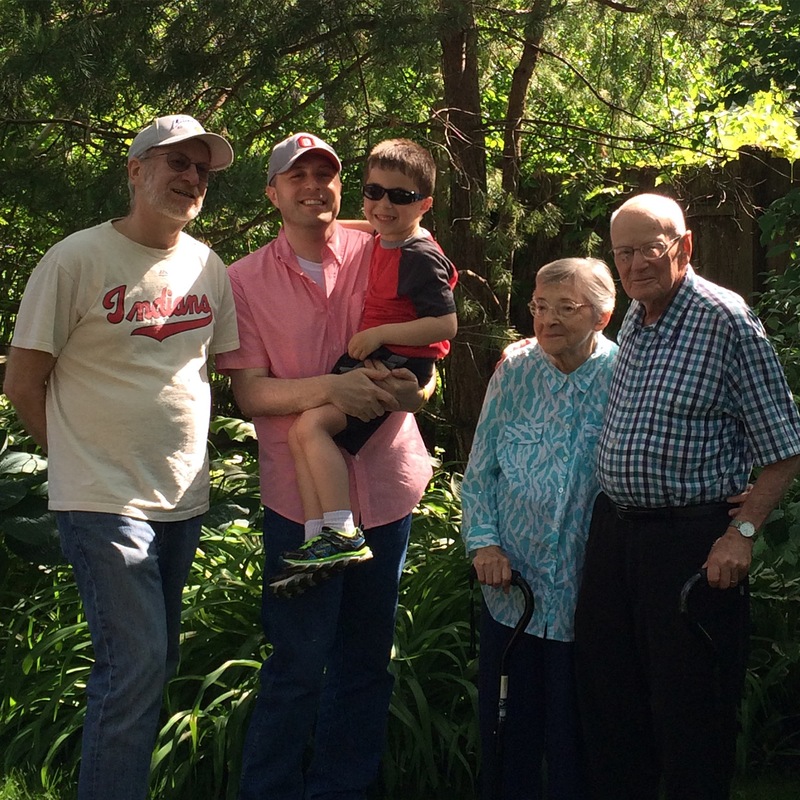 Family (Tata, Papa, Robbie, Jill, and David) came over to visit today. 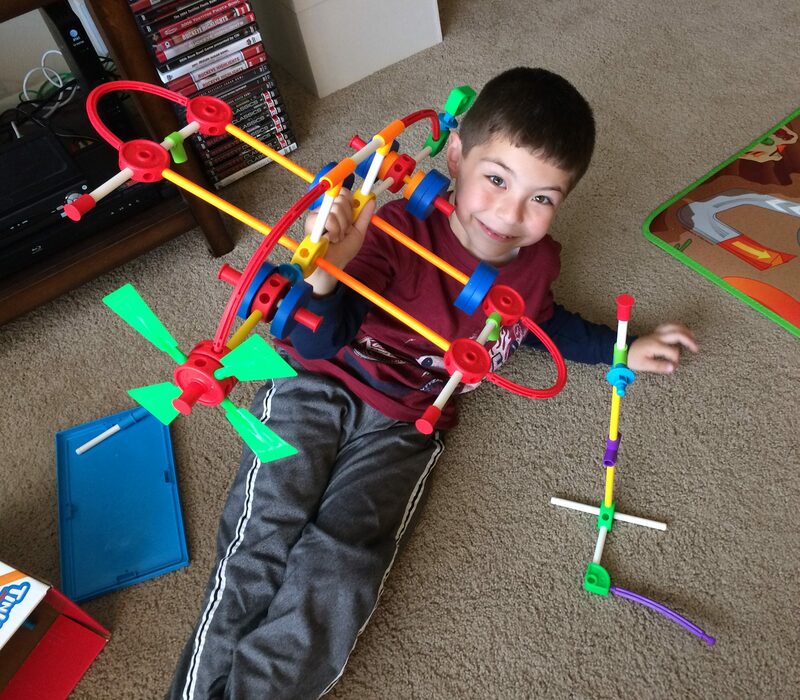 Alan showed off his Tinker Toy propeller plane that he designed this weekend. 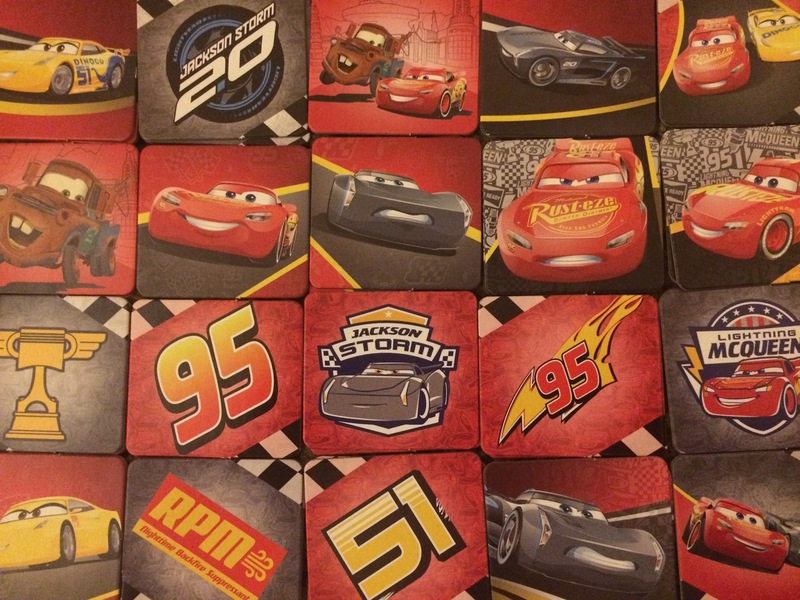 And he also got to play his new Cars 3 matching game with Jill! 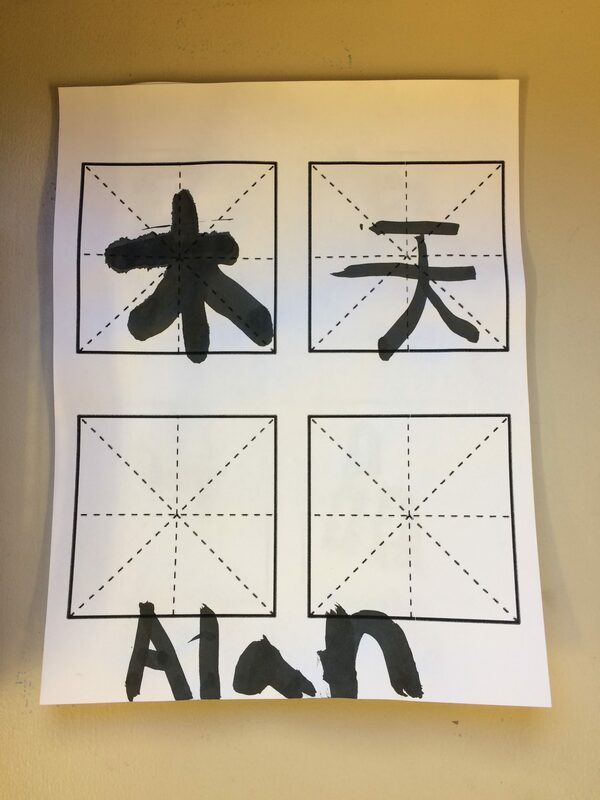 Alan’s getting pretty good at it. Alan now has a fidget spinner for each of his favorite teams. 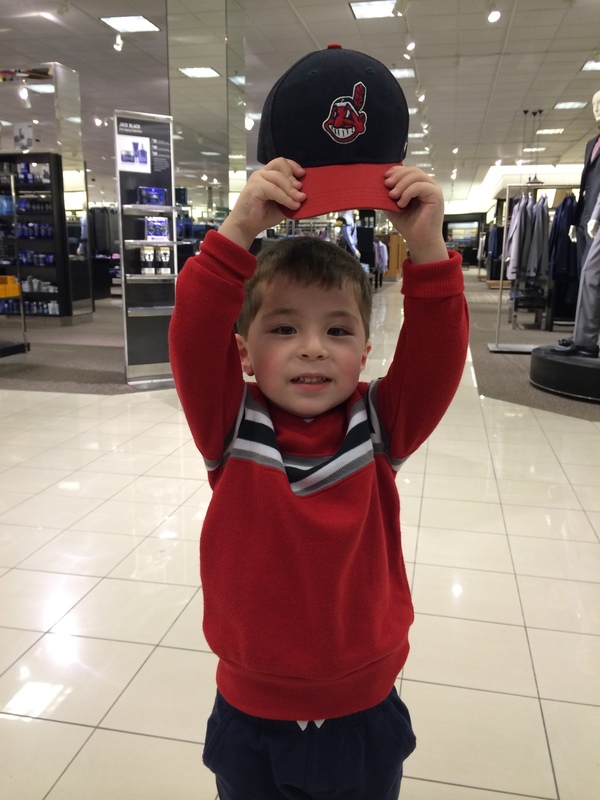 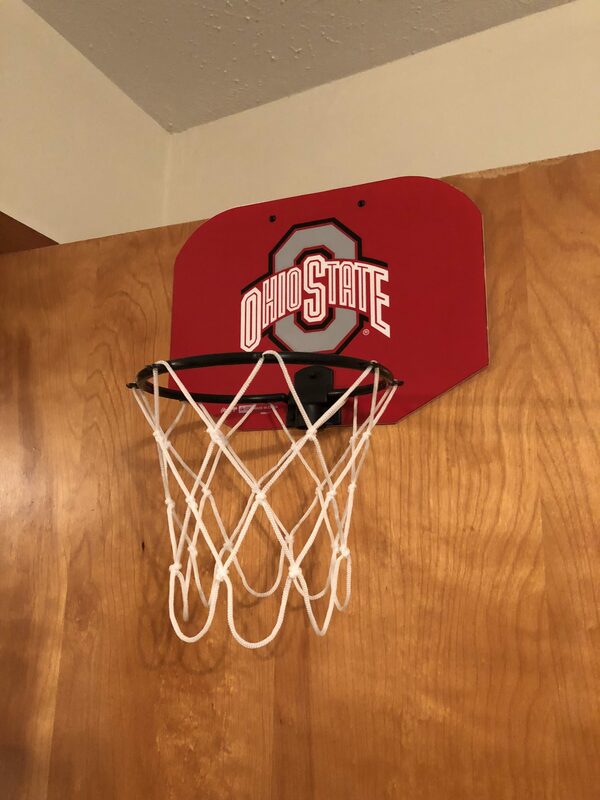 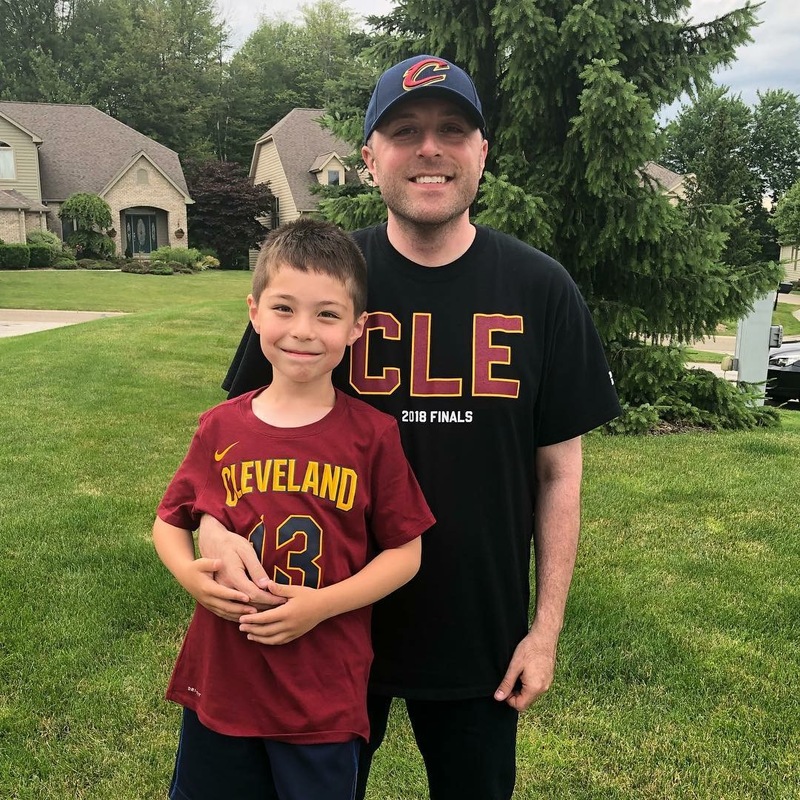 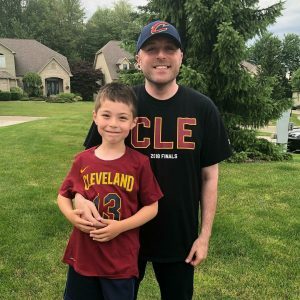 After picking up a Cavs spinner at Giant Eagle a couple weeks ago and an Indians spinner at the Tribe game last week, we got OSU and the Browns at Kohl’s this week. 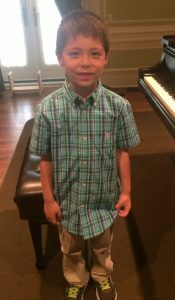 Alan takes his fidget spinners to school and has “fidget battles” with his friends before the morning bell rings. 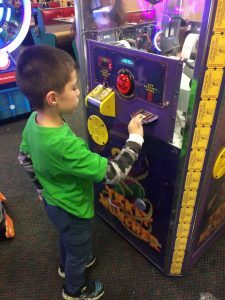 During these battles, each participant spins their spinner and then bangs them into their opponents’ spinner. 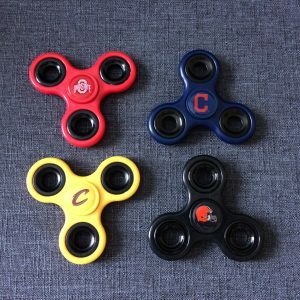 The person whose spinner stays spinning the longest is declared the winner! In other news, Alan lost his right front tooth today! 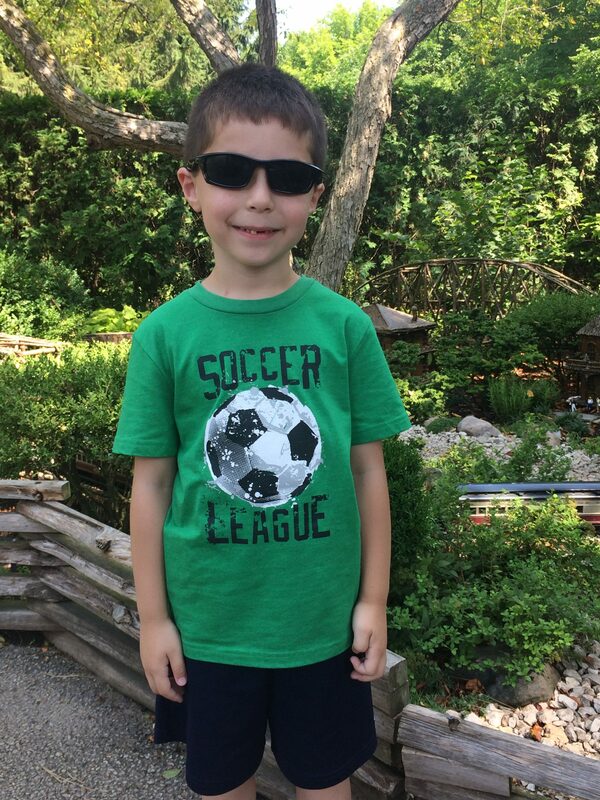 The new left one has not grown in all the way yet, so Alan says his mouth feels funny without any front teeth. 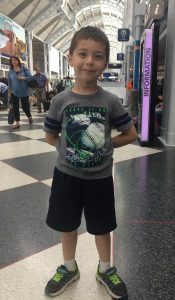 This weekend Alan and I traveled to Chicago for our annual trip. 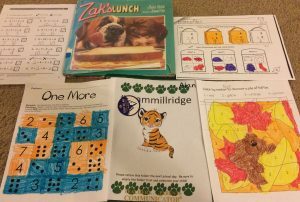 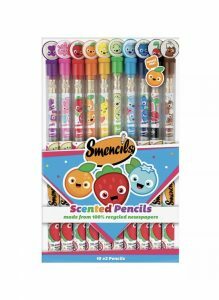 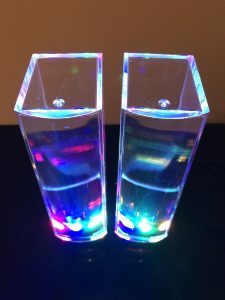 Below are the highlights. Alan and I flew together for the first time, arriving at O’Hare airport a little after 9:00pm CST on Friday night. After a quick stop at Target for Alan’s food (and a Peppa Pig train that somehow got in the shopping cart), we arrived at the house. 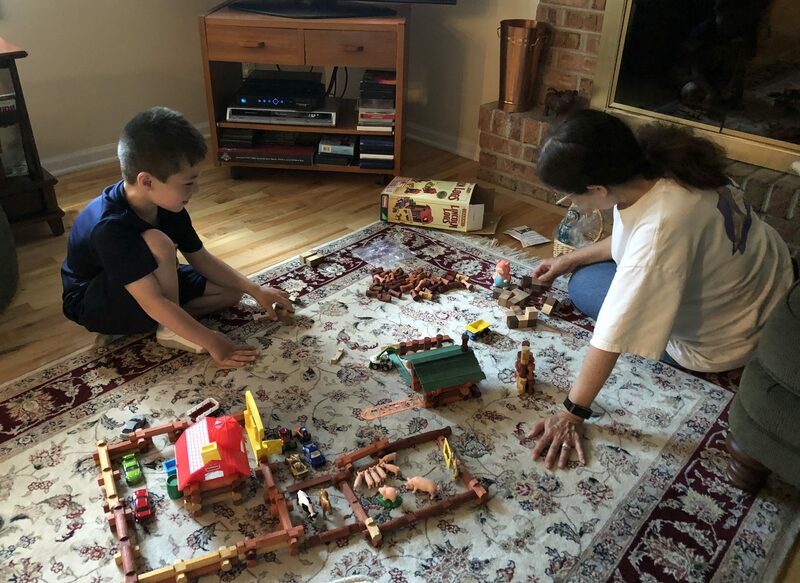 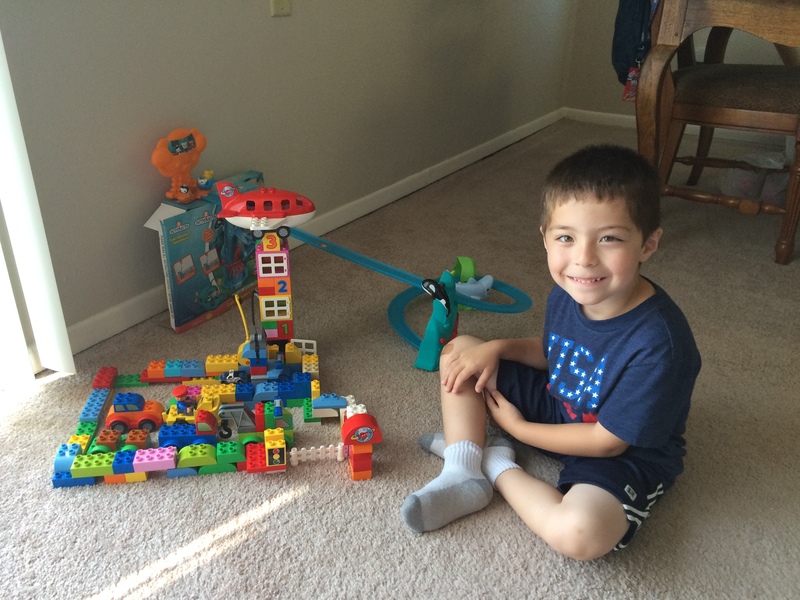 Alan’s first request was to bring out the Lincoln Logs – a favorite from our last trip! 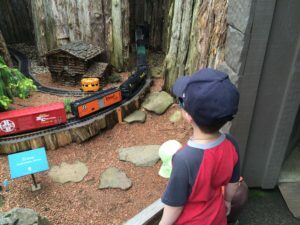 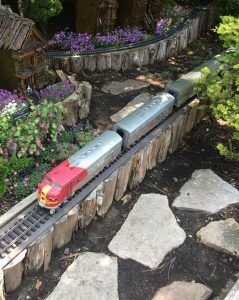 Afterwards we headed to the Chicago Botantic Garden to see the train display. 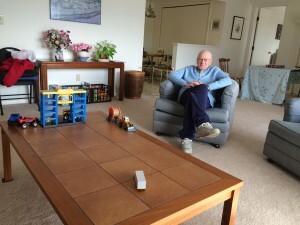 Alan waited all year to see his favorite model trains again, and he was in train heaven once he arrived. He told me his favorite train this time was the passenger train (shown below). However, he certainly got a kick out of the engine that got separated from the rest of its cars too. 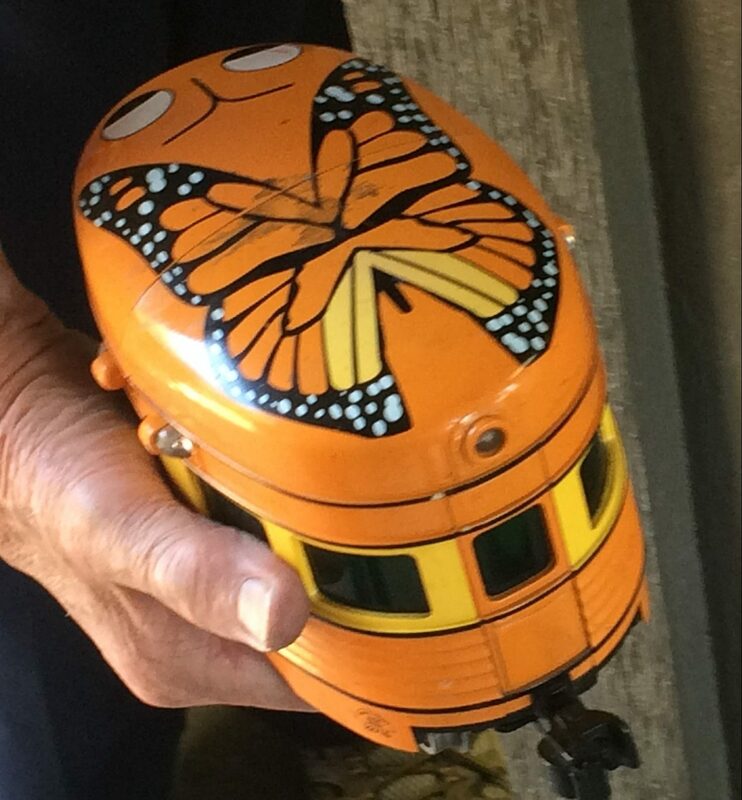 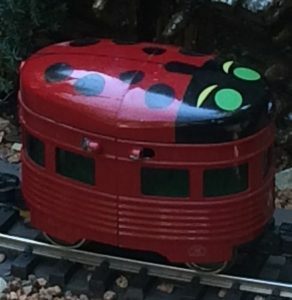 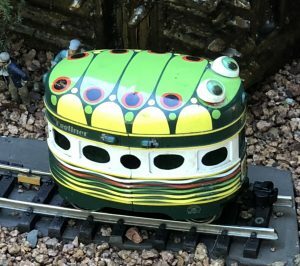 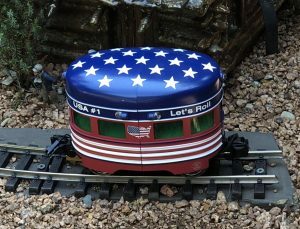 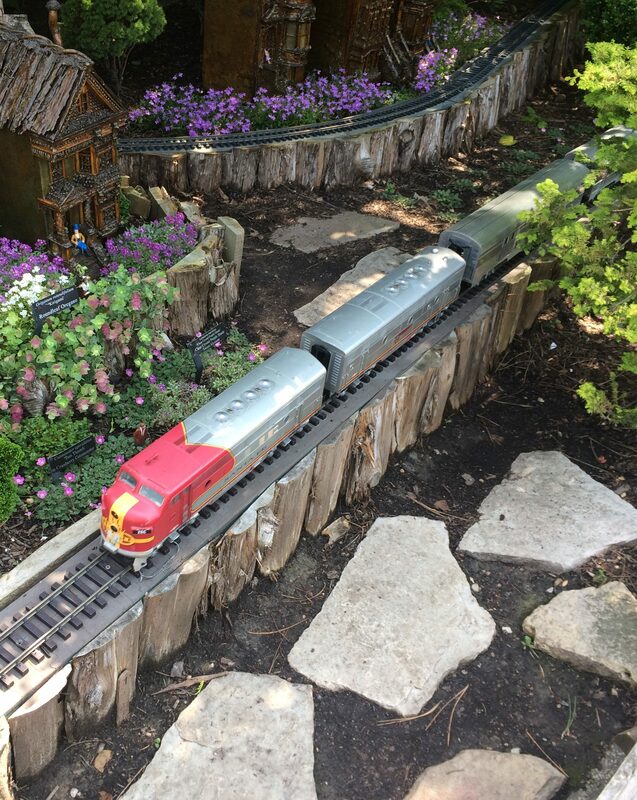 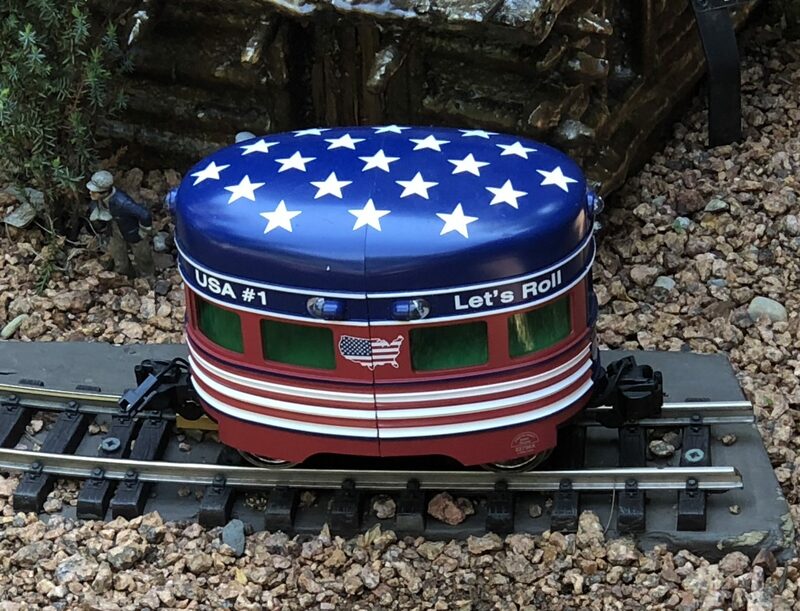 When we went looking for the butterfly train car – a favorite from last year – we were surprised to find a lady bug train car in its place. 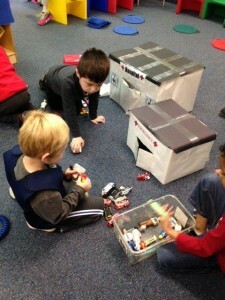 We later learned that the butterfly car rotates with both a lady bug car and a caterpillar car! Alan requested that we see the other two that were in storage. He ultimately kept the butterfly at the top of his rankings. 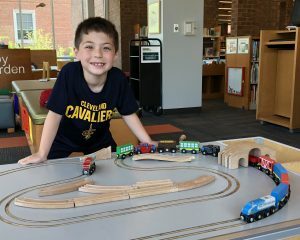 Following the Garden, we headed to the Deerfield Public Library, where Alan played with more trains! 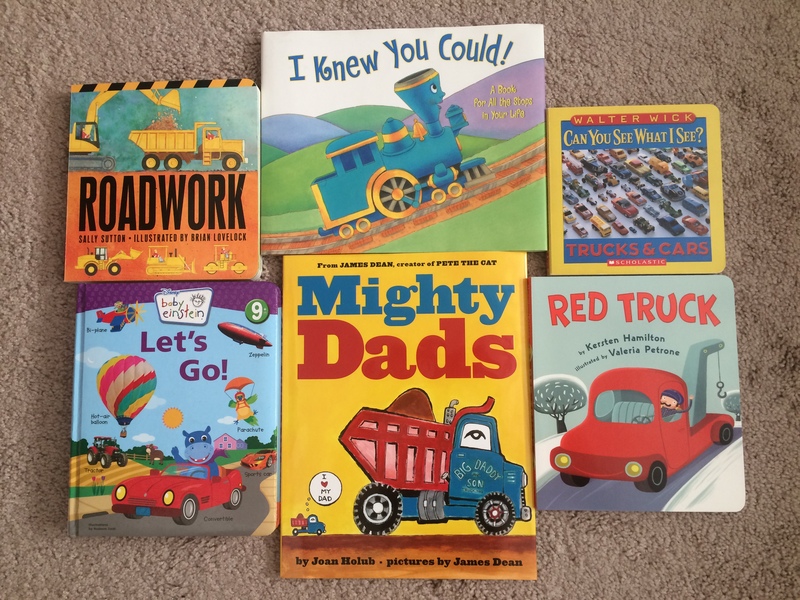 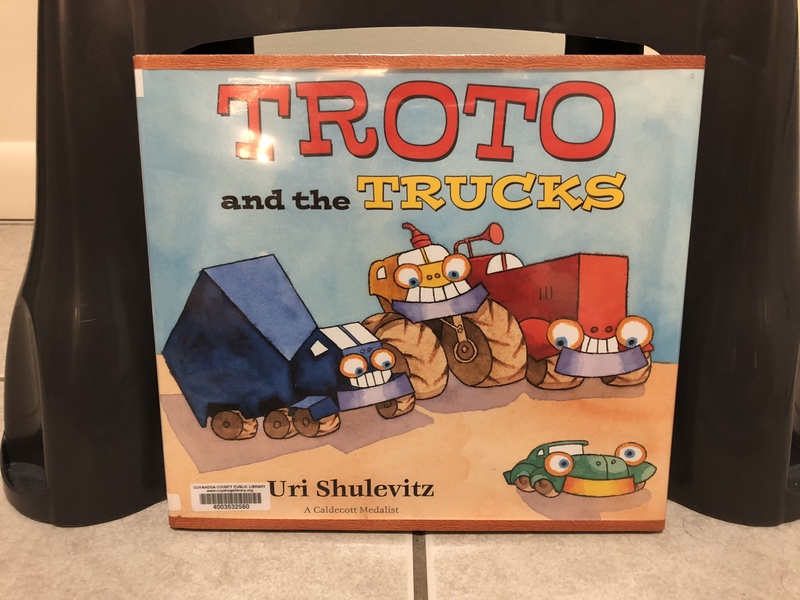 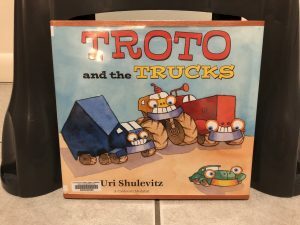 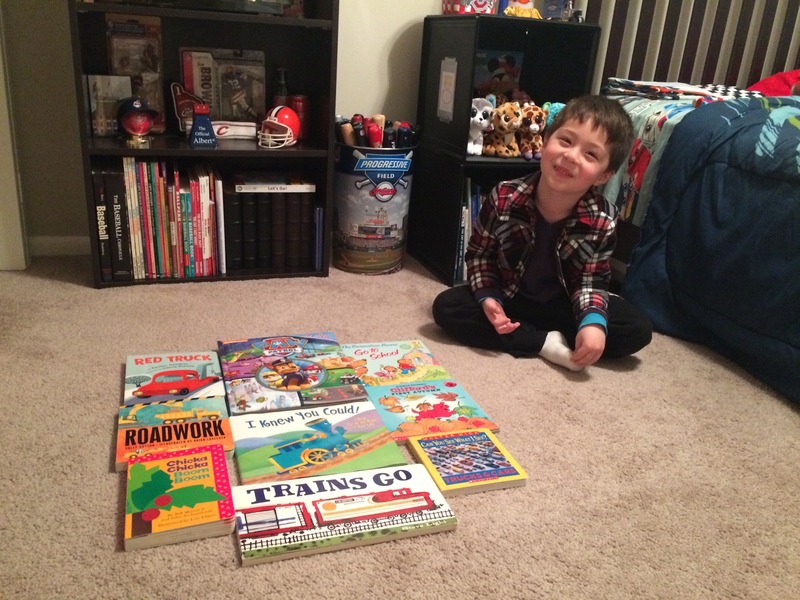 He also checked out a book on transportation-related songs and poems and bought two other books involving transportation. 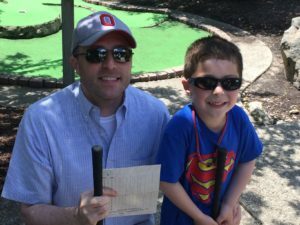 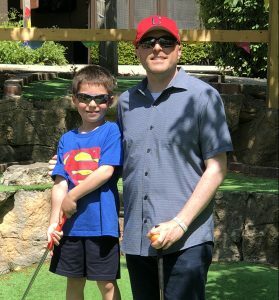 After lunch at Rhapsody Café, it was on to mini-golf at Highland Park with Robbie. Alan started off on fire — scoring 2’s four times on the front nine! 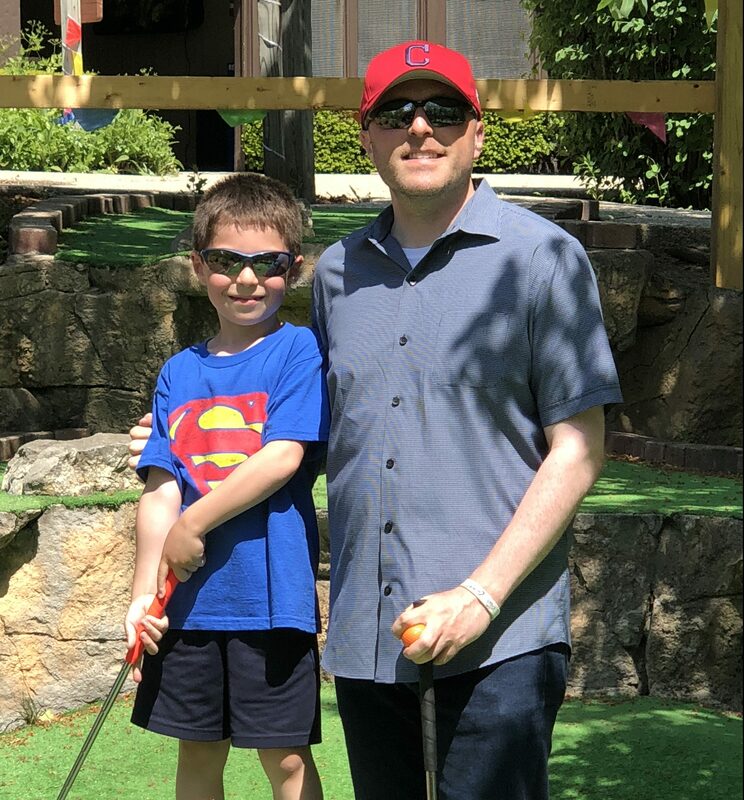 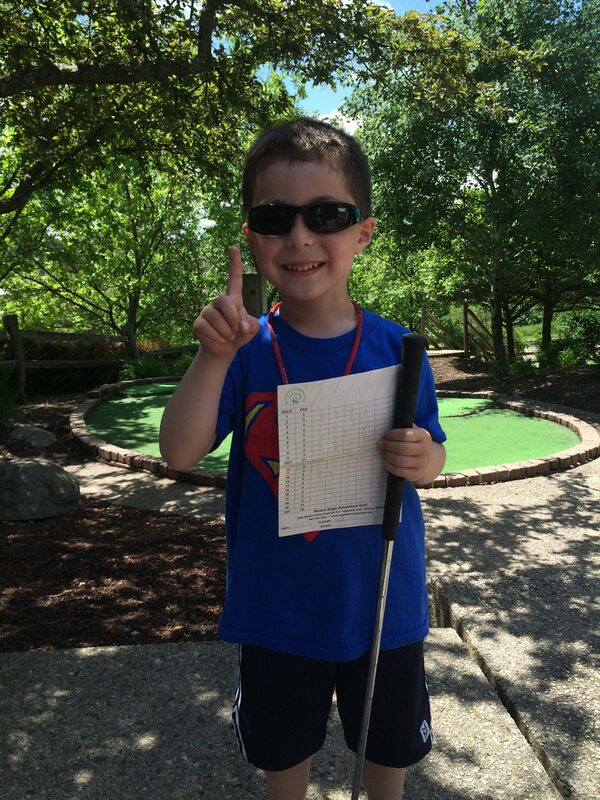 He led me by 1 stroke after nine (while trailing Robbie by just 1) and was hanging in through twelve holes, but then requested that we stop keeping score for the rest of the day. At the conclusion of golf, Alan called a ‘do-again’ of sorts. 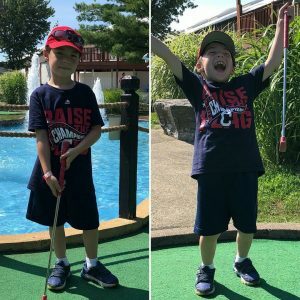 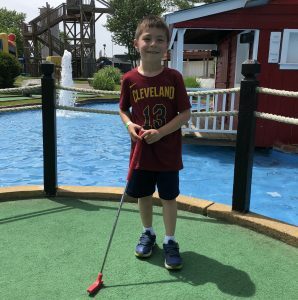 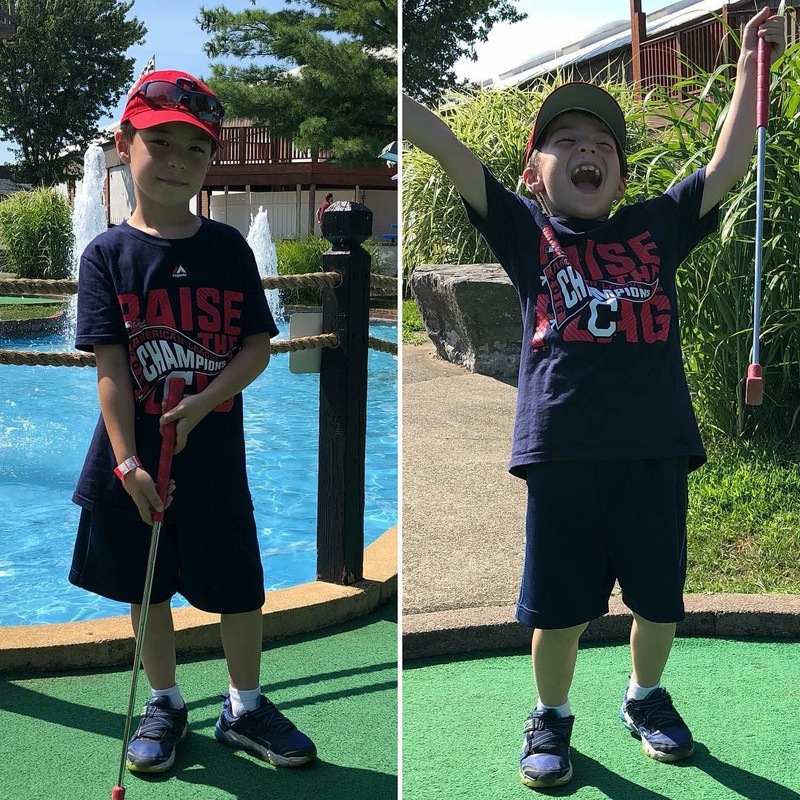 He had so much fun in the morning that he requested a second visit to the Garden (our tickets were good for the whole day) and a second round of mini-golf. 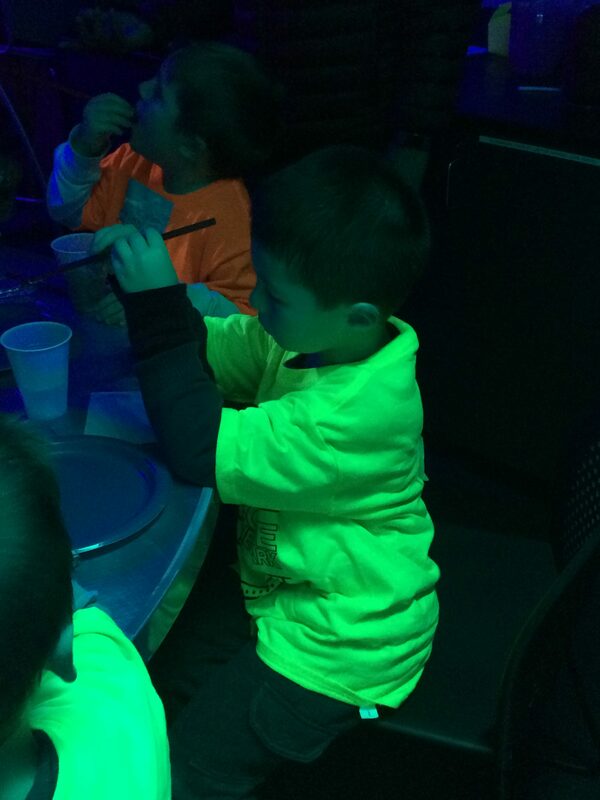 We obliged, and Alan got to experience the fun all over again! During the evening we also took our annual photo at the famous backyard tree (see photo at beginning of post). 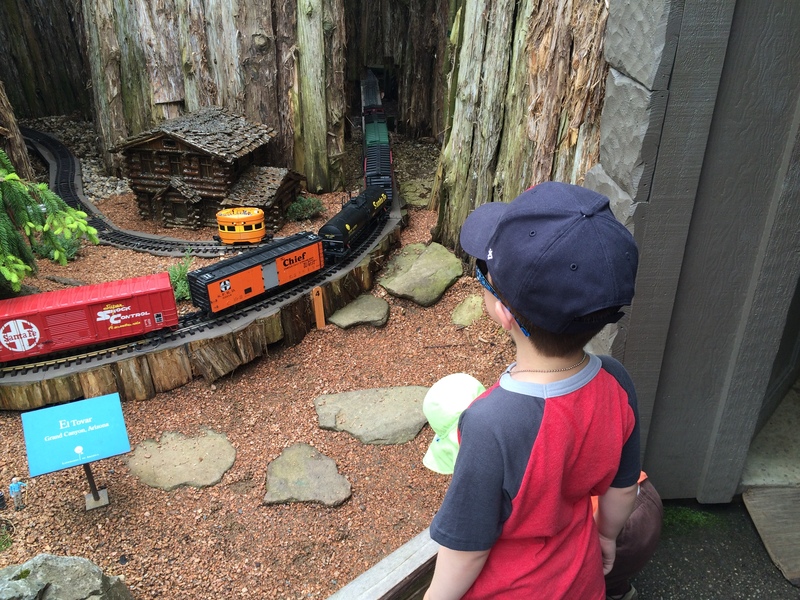 Sunday started with a real train ride for Alan! He rode with Jill from Deerfield to North Glenview. Alan requested riding on the 2nd level of the 2nd car. 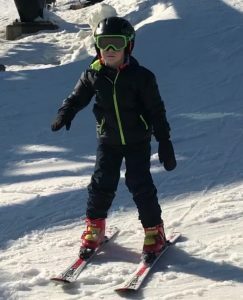 That was important to him after riding on the 1st level last year. 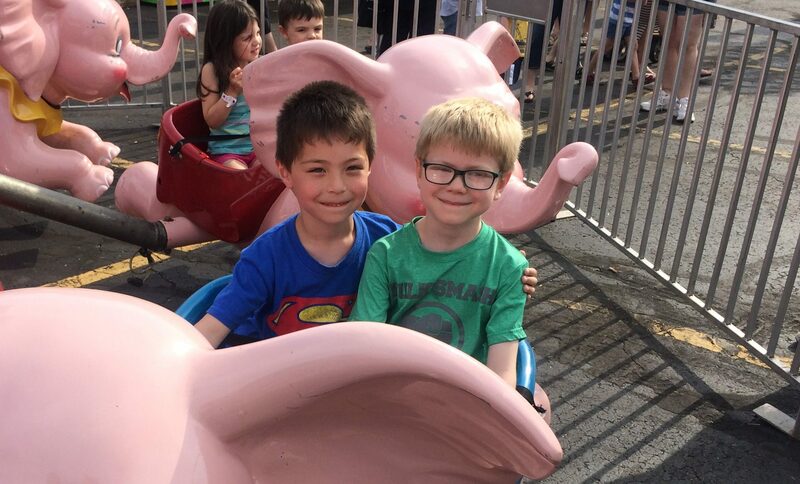 He loved the ride, of course. 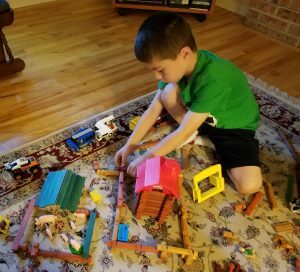 We returned home by mid-morning and Alan continued building with Lincoln Logs. This time he and Jill built one house, one barn, and two garages. 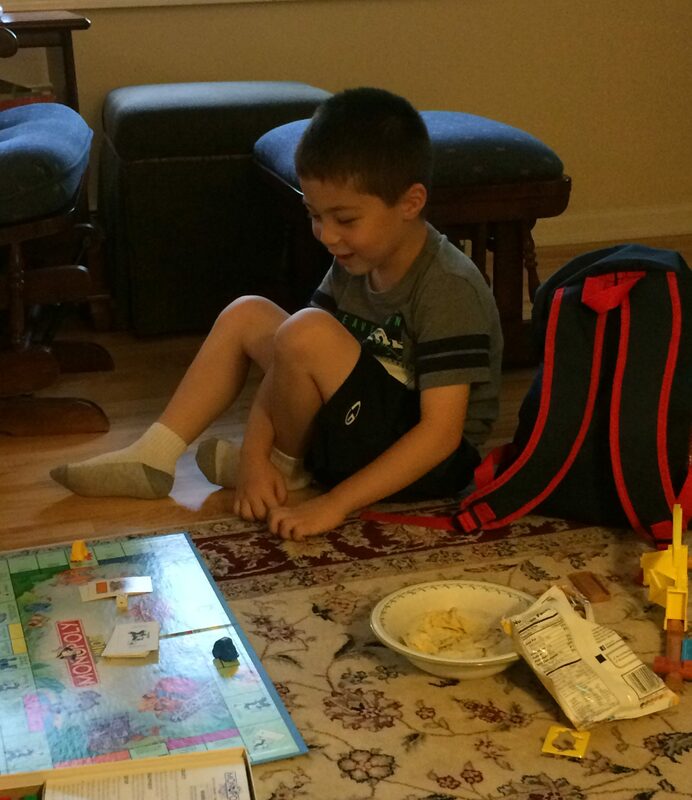 Then he played Monopoly Junior for the first time with Jill. They played with modified rules, but it was a great first exposure to the game for Alan. 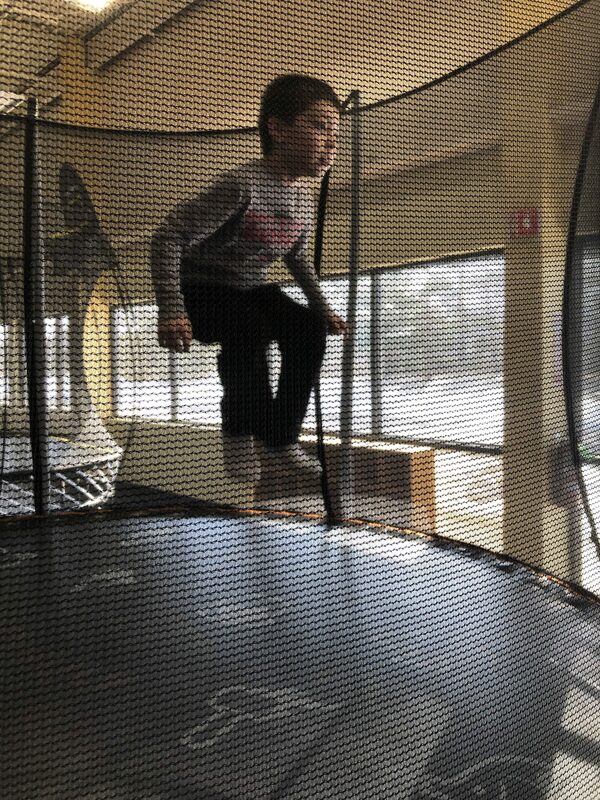 Then it was off to lunch at the Deerfield Square. 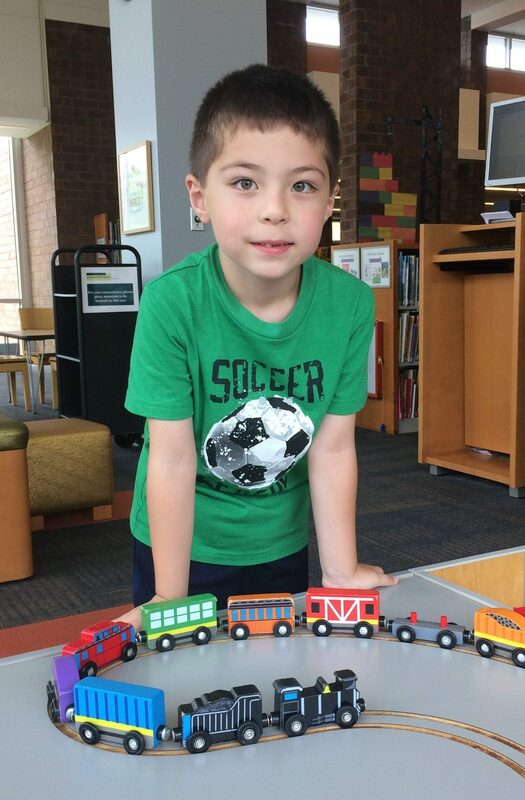 After our outdoor lunch, Alan called for a second visit to the Deerfield Public Library. 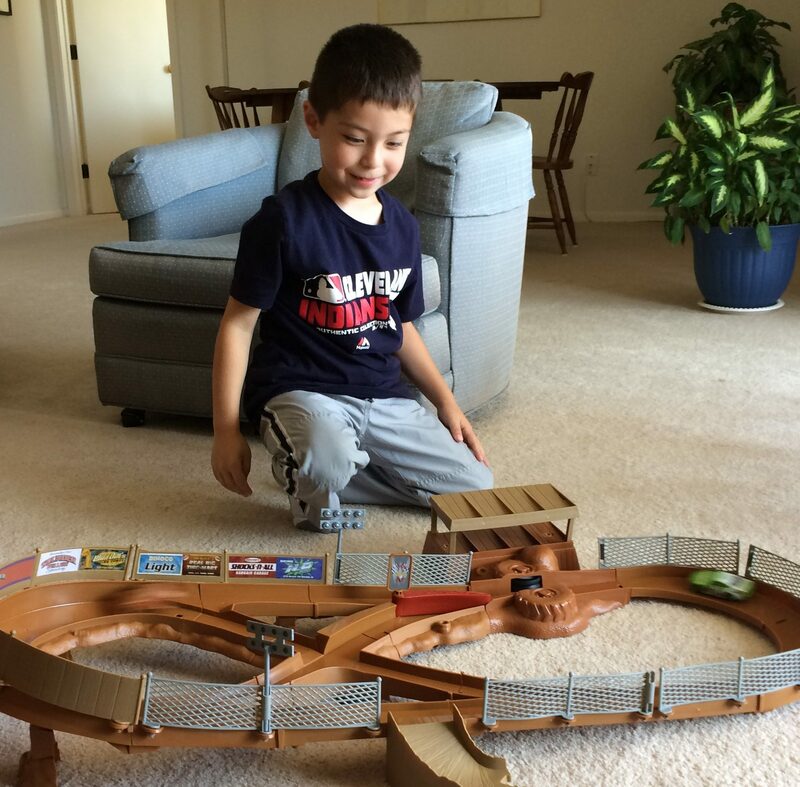 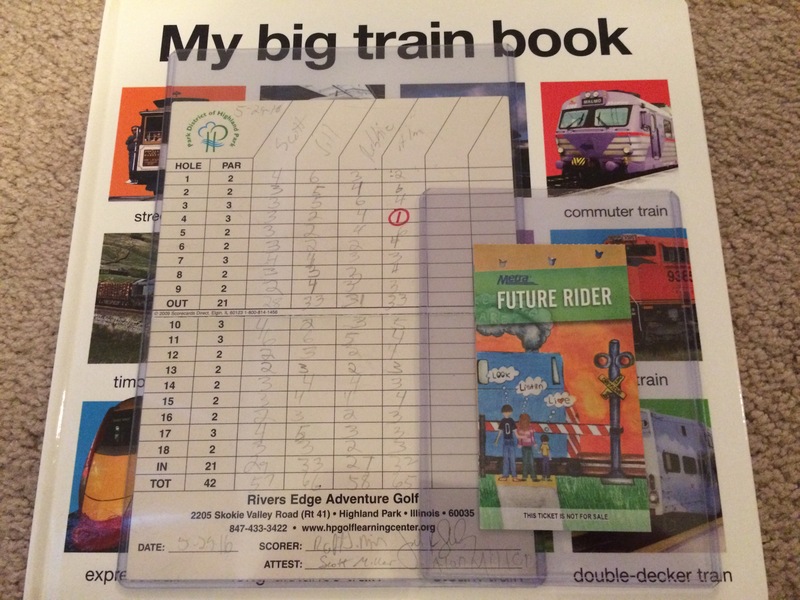 There, Alan played with his trains, as well as the word game pictured below. 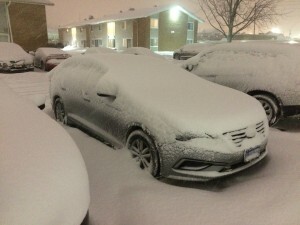 Afterwards, Alan and I unfortunately had to catch our 4:30PM CST flight home. 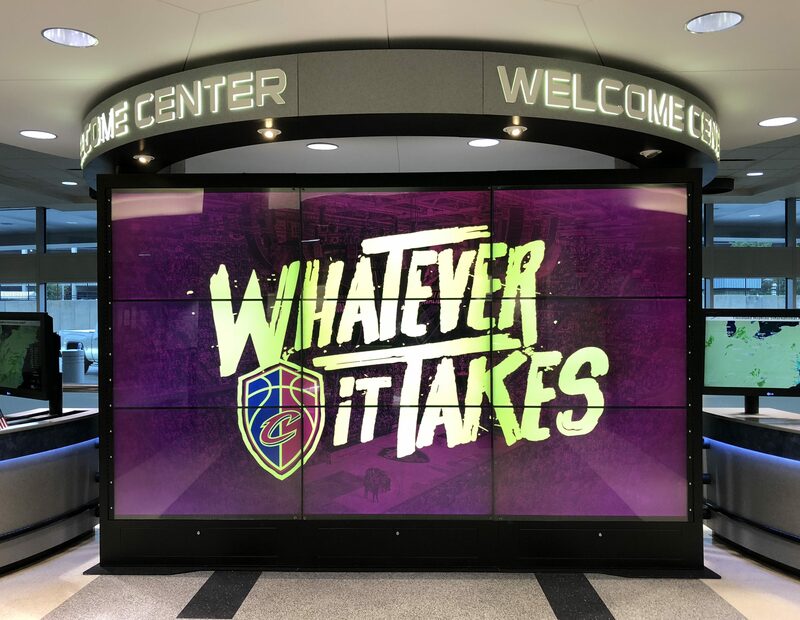 But not before we snapped the photo below at O’Hare. 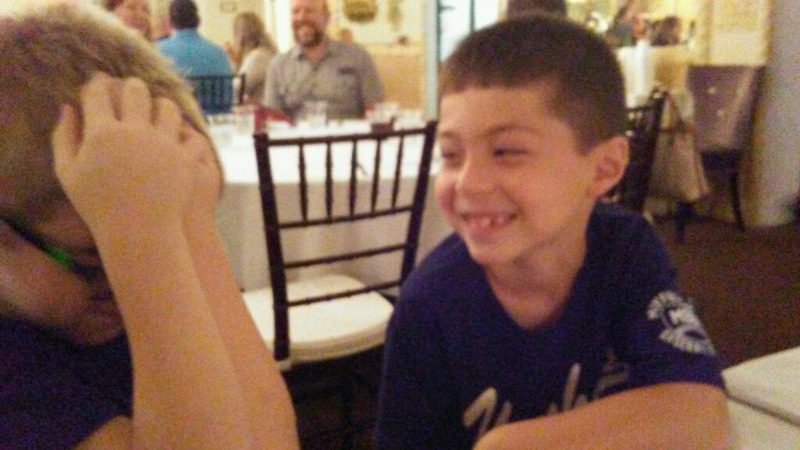 While waiting in line for the plane, Alan made a friend named Ashlyn. 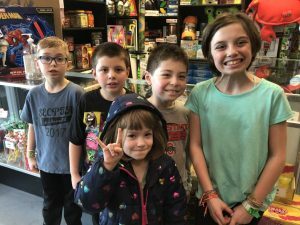 She had her Lady (from Lady and the Tramp) stuffed animal chase the Lightning McQueen car that Alan had just purchased, to the delight of several onlookers. 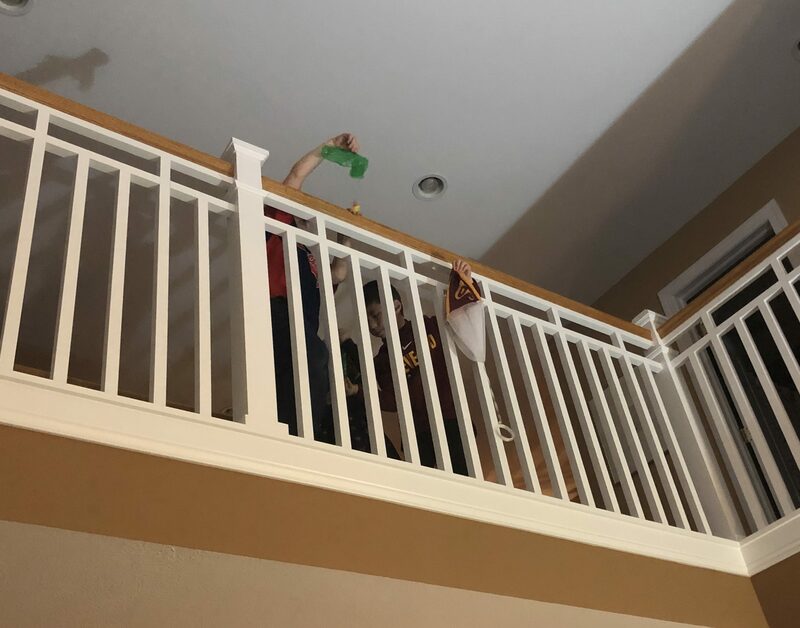 Thanks to Robbie and Jill for hosting us for another fantastic weekend. 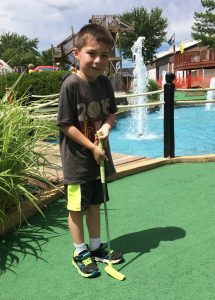 Alan’s already looking forward to returning next Memorial Day! 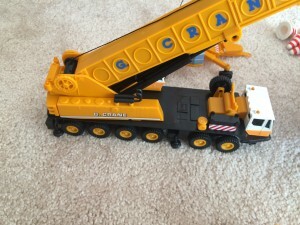 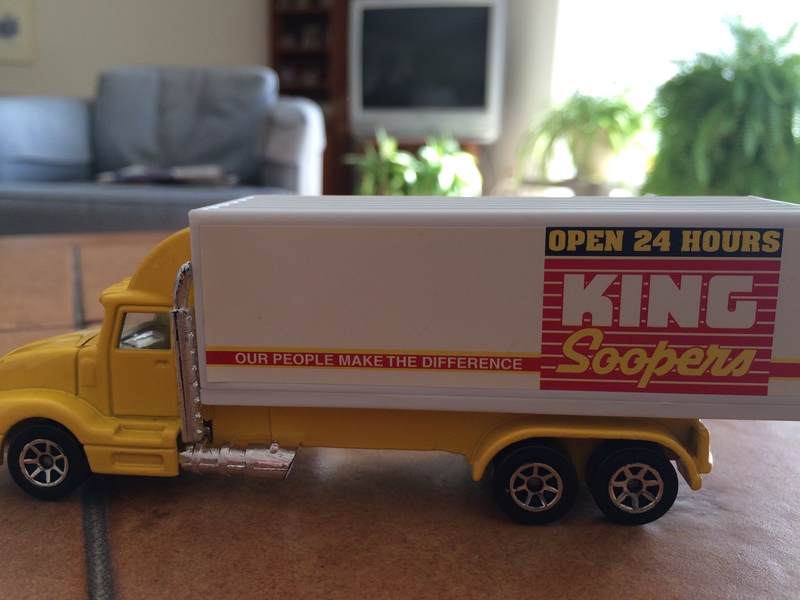 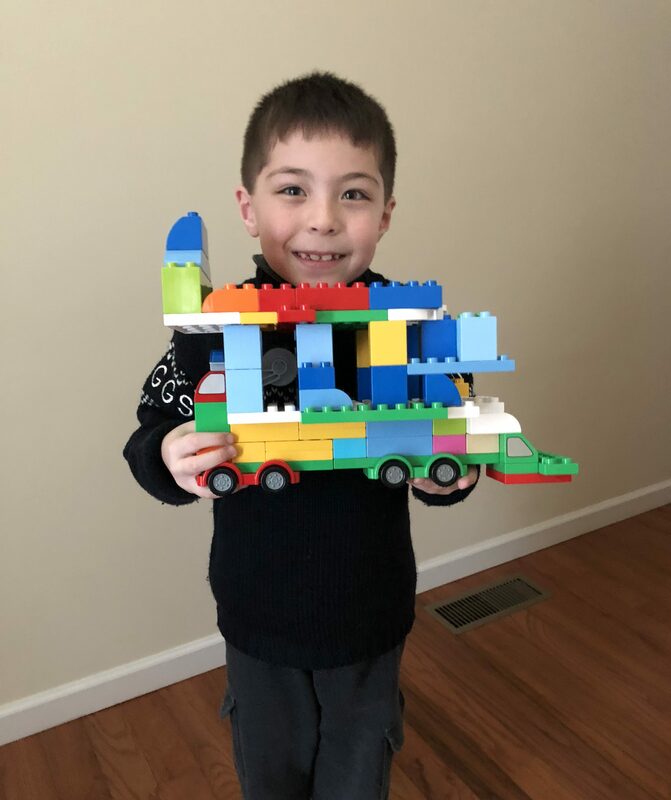 All “Alan originals.” He loves to create trucks using his imagination. Last night Alan’s summer fun continued with a sleepover with Tyler at Grandma Debbie’s. 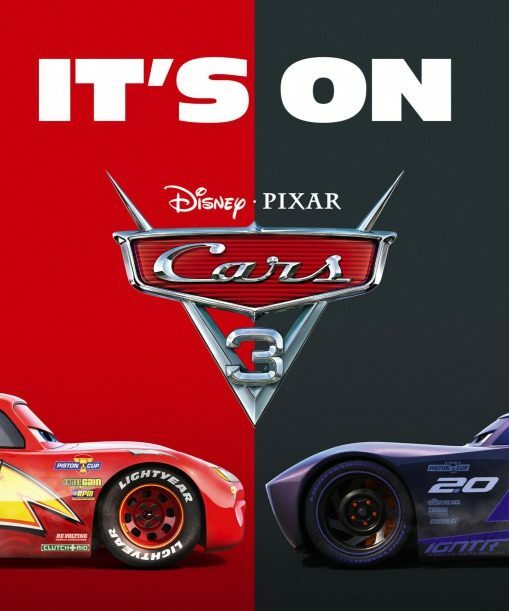 The highlight of the night for the duo was seeing the movie Cars 3 at the Aurora movie theater. 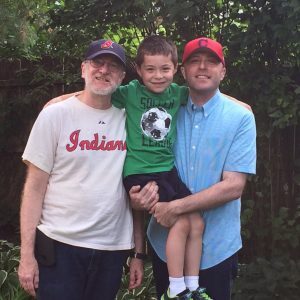 It was Alan’s first trip to the theater at night and Tyler’s first trip overall. 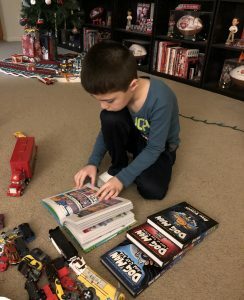 Alan’s always been a fan of the Cars series, and he enjoyed the new character, Jackson Storm, too. 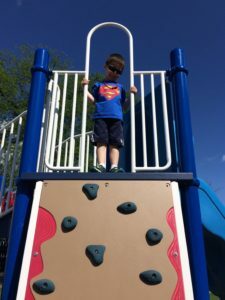 Today the kids went to an elementary school playground and McDonald’s. They also played some computer games together. 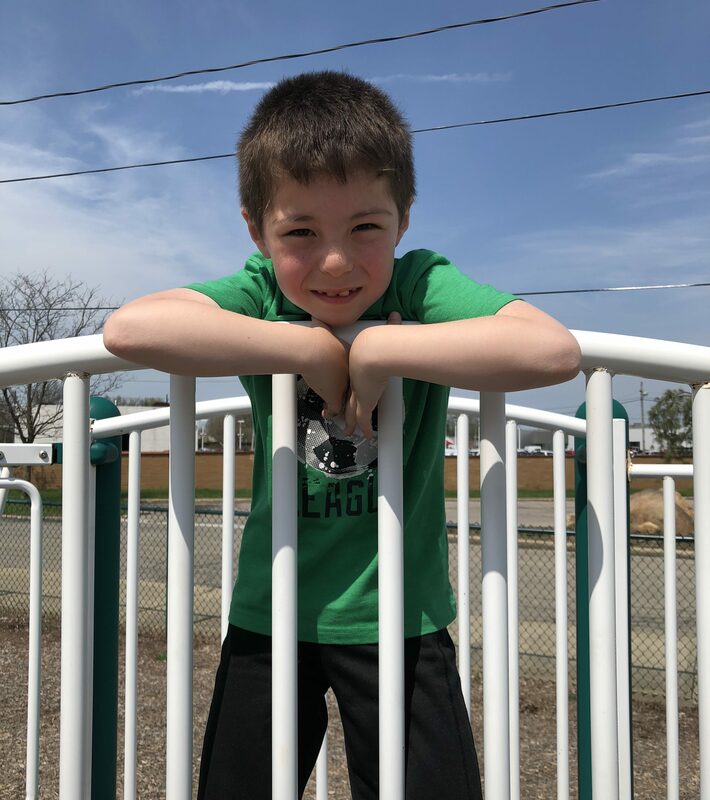 Alan usually doesn’t like to go more than two weeks without seeing Tyler, and they’d play together all day if it was up to Alan. 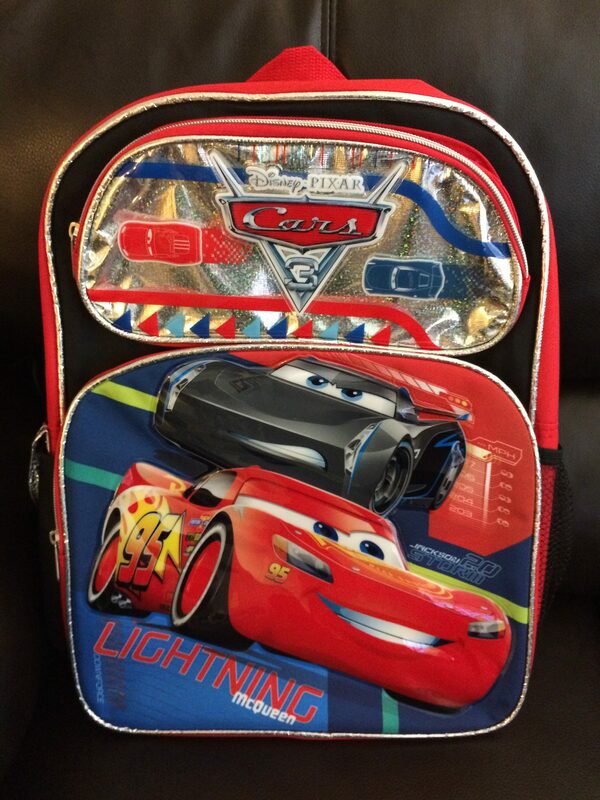 7/15/17 Update: Alan picked out a new Cars 3 backpack to use in first grade! 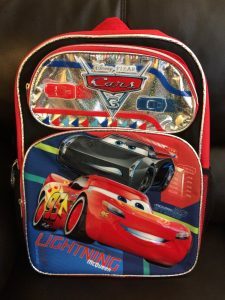 Both Lightning McQueen and Jackson Storm are featured on it. 6/9 – Alan goes 3-for-3 and plays 3B and P. He makes his mark fielding from the pitcher position, and is established as a regular there – a prime fielding position for this league. 6/23 – Game rained out. 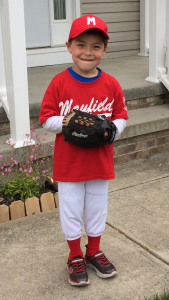 6/30 – Alan goes 1-for-1 and plays 2B before the rain comes and postpones the game after one inning played. 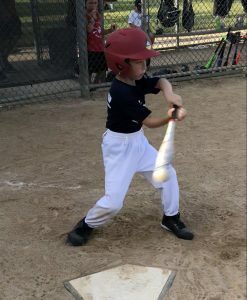 Alan finishes the season batting 1.000! It was a great debut season for Alan in MBBL play. 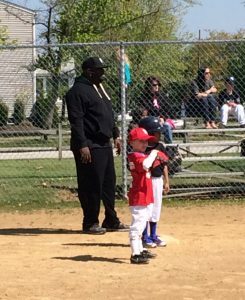 I loved coaching third, managing the lineup for the kids, and standing in the field with Alan. 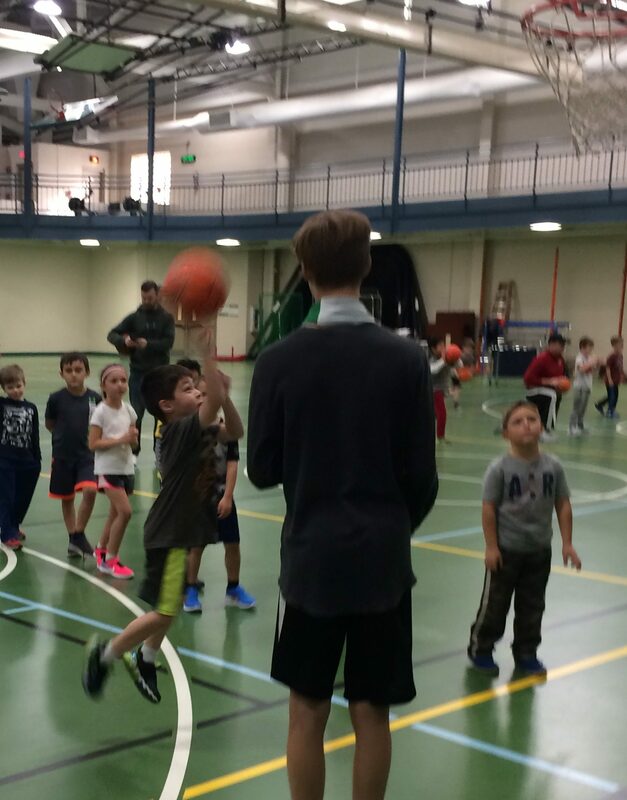 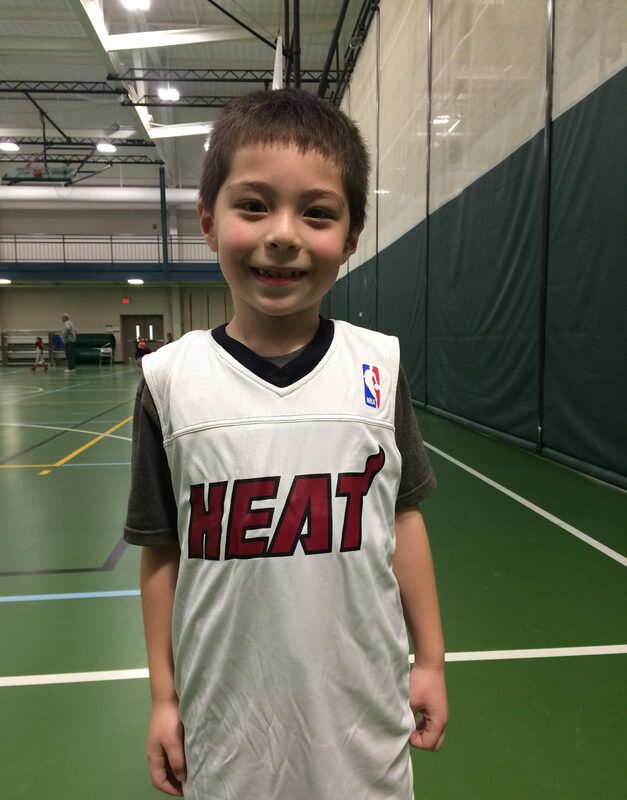 Next summer Alan will move up to the league for 7 & 8 year-olds. He’s ready! 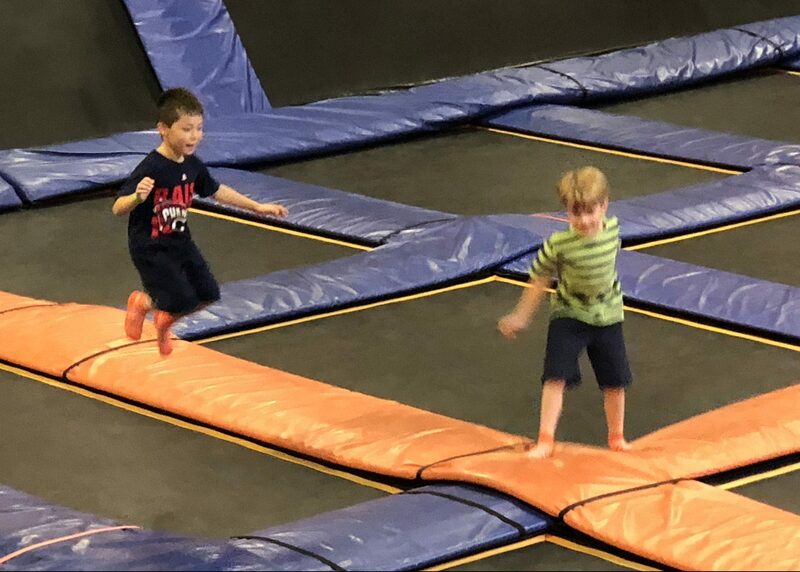 Alan met up with his cousins today at Sky Zone in Boston Heights! 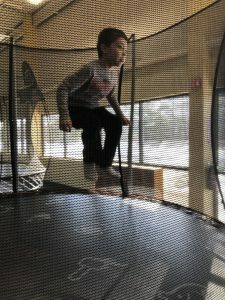 They alternated between jumping on the trampolines and diving into the foam pit. 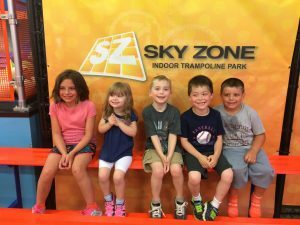 Alan had been asking to go to Sky Zone ever since Paige’s birthday party last February. 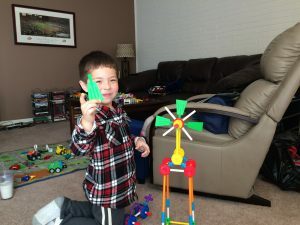 Once I heard Dominic was a big fan too, it seemed like the perfect place to hold a cousins gathering! 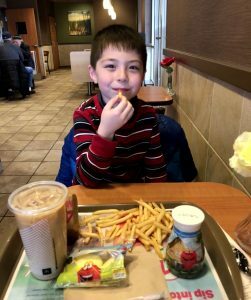 This guy loves going to McDonald’s and ordering chicken nuggets and fries. 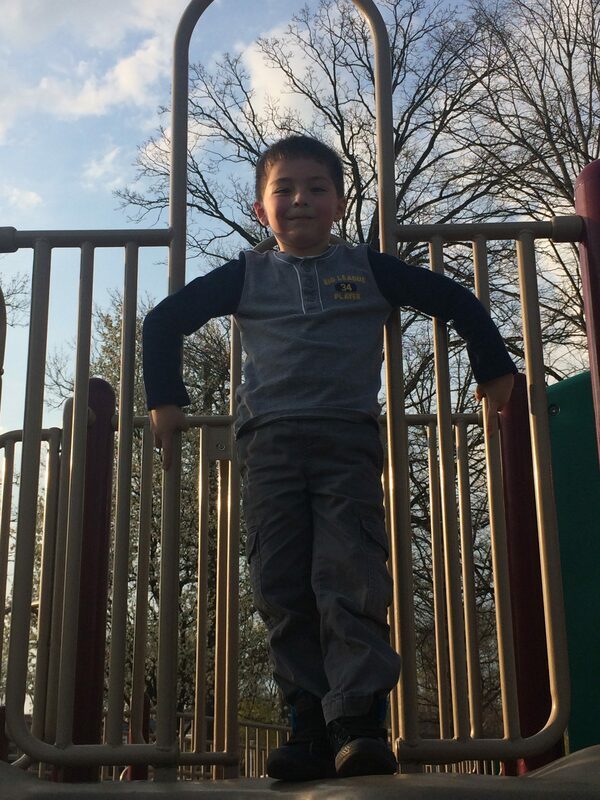 I love joining him and hanging out. It’s our special time together. 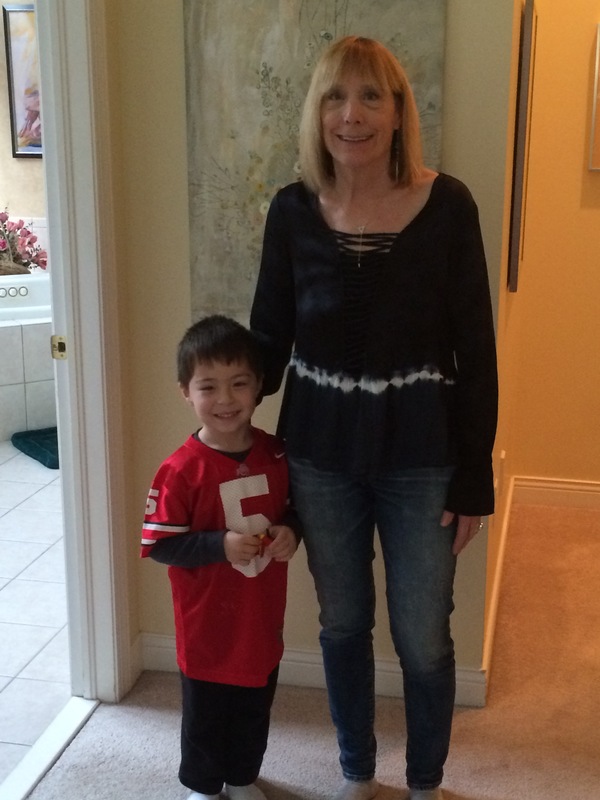 Today we went prior to his piano recital. 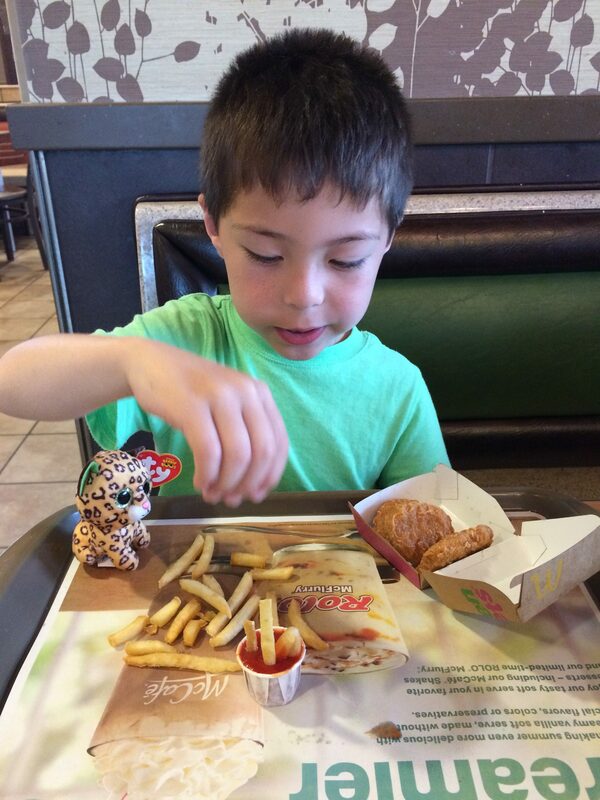 As always, Alan picked the table, carried the tray, and got the ketchup on his own. 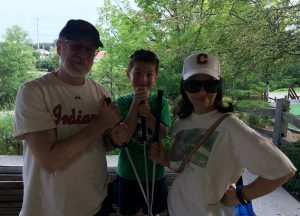 We also picked up a “beanie boo” named Freckles! 5/13 – Alan goes 2-for-2 and plays 2B. 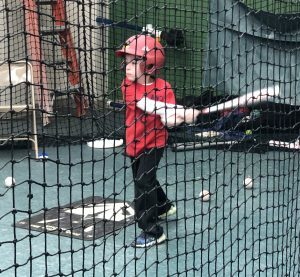 He gets a big kick out of me waving him home for the first time (it was the first time he’s seen the motion of a 3B coach). 5/19 – Alan goes 3-for-3 and plays 2B and 3B. 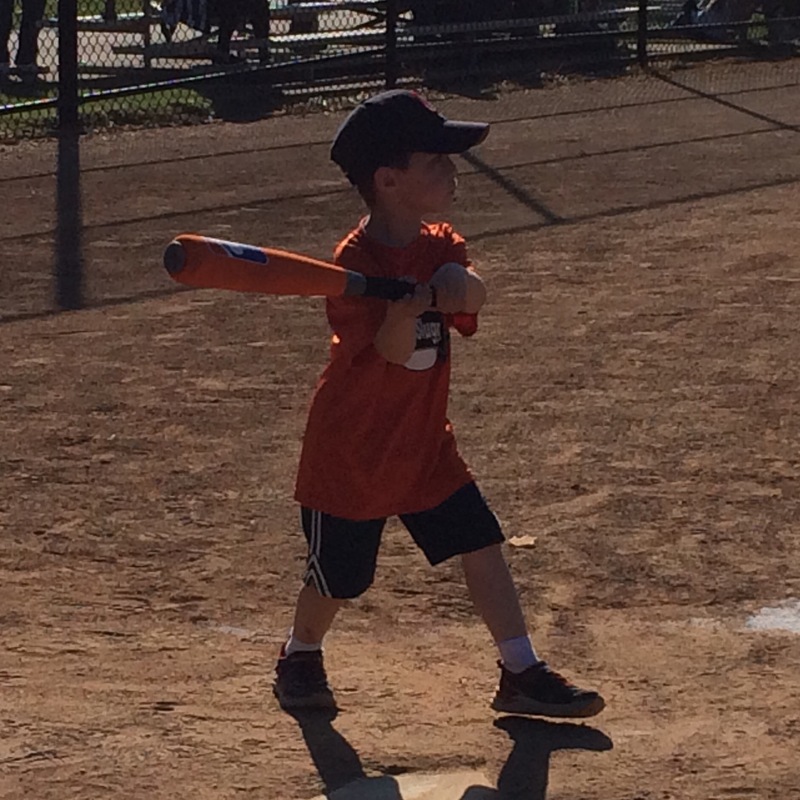 At 2B, he fields a hot shot grounded on a real nice play. 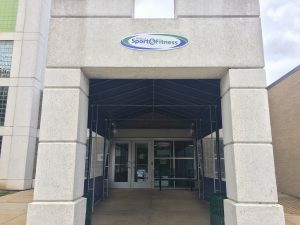 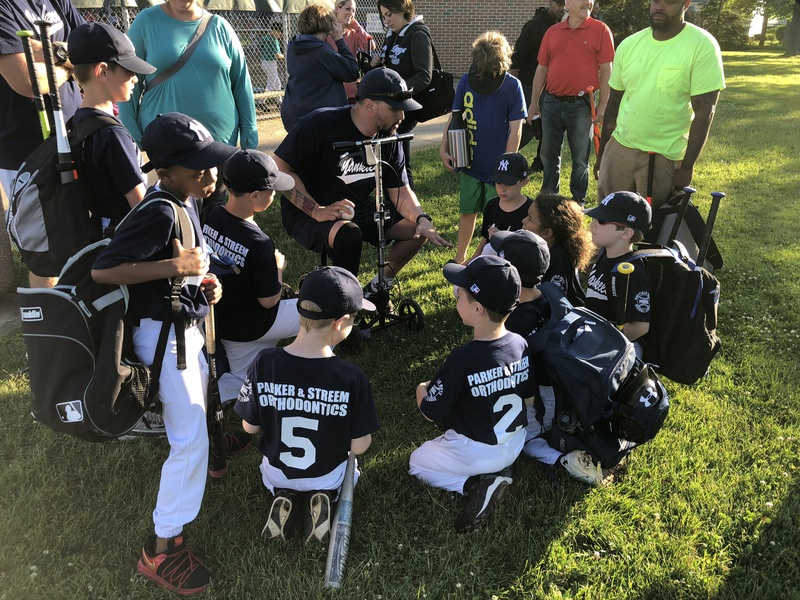 5/26 – Game rained out. 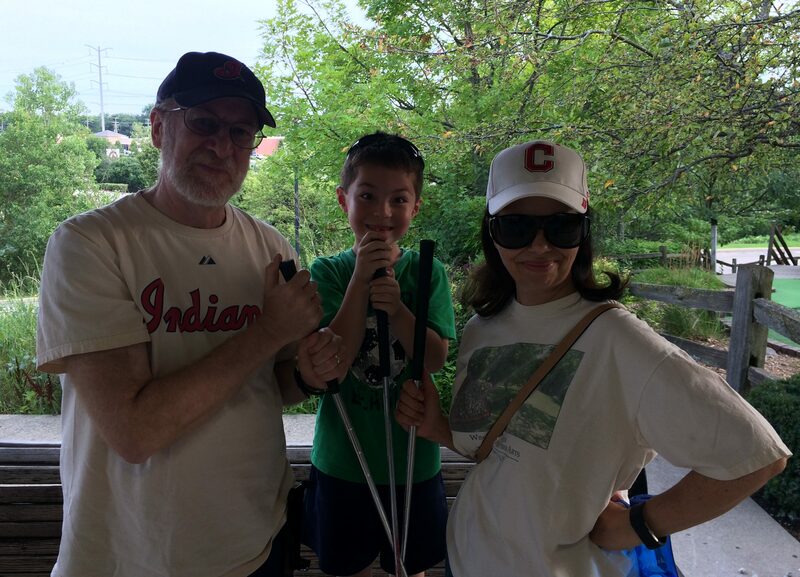 6/2 – Alan bats leadoff and goes 4-for-4 with his whole family in attendance. 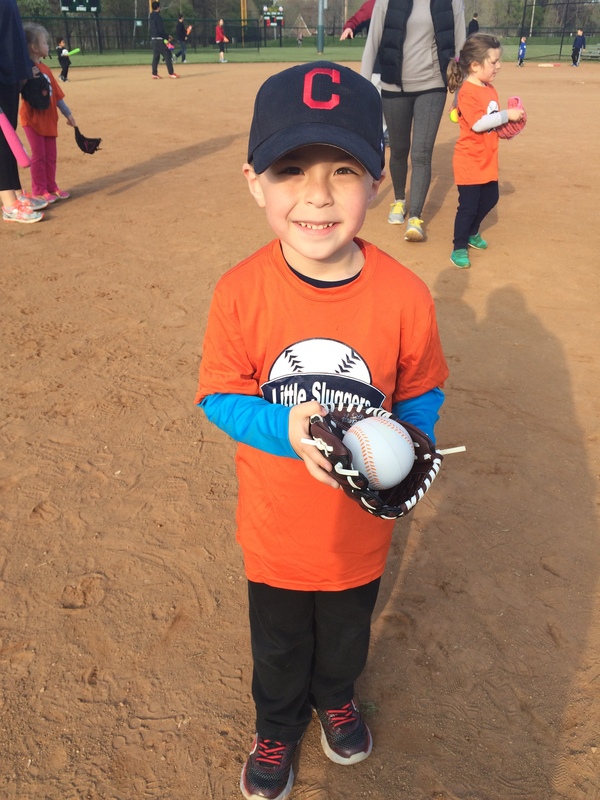 He plays SS and P, where the ball finds him on several occasions. Alan continues to field the routine grounders. 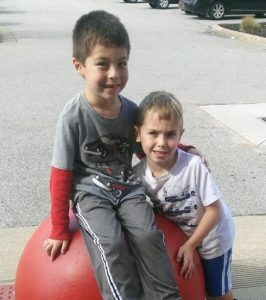 He’s also commended for helping up players off the ground, including his new buddy and teammate, Tommy. 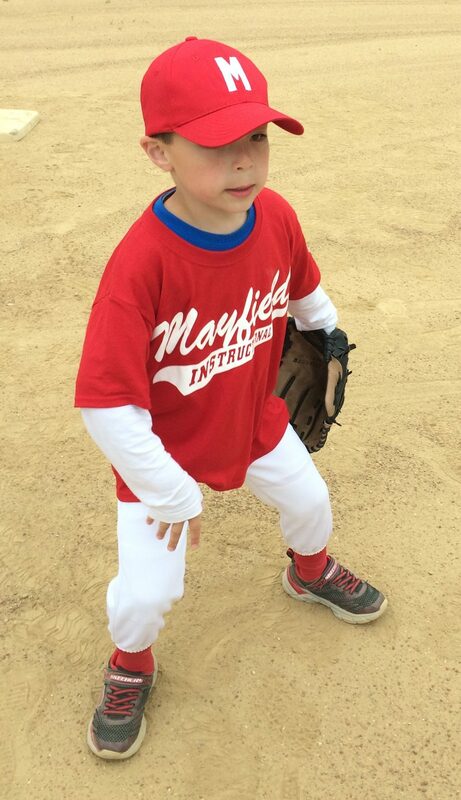 Alan made his Mayfield Instructional League debut today in the 5 and 6 year-olds “coach-pitch” division. He played great, getting two solid hits to left field and splitting time at pitcher’s helper and second base in the field. 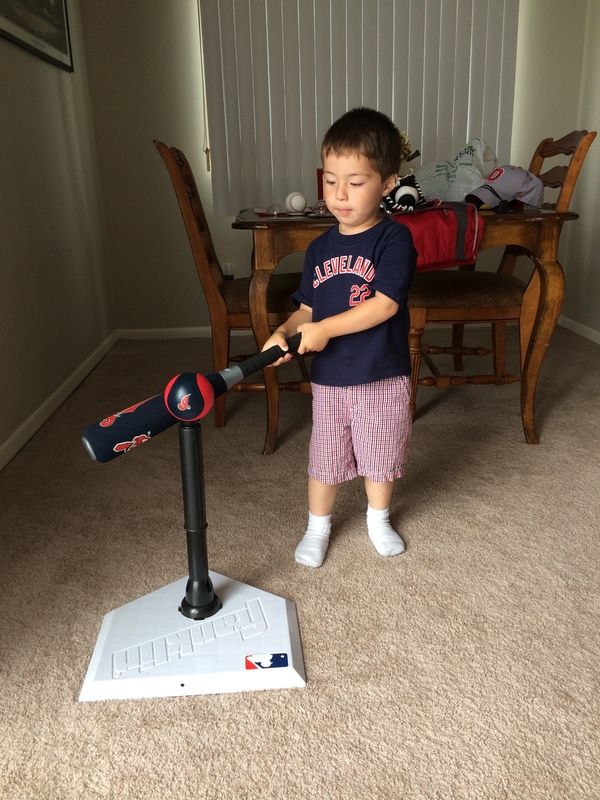 Alan was excited to receive quite a few grounders from the pitcher’s helper position. And he encountered best friend Grady while covering second. 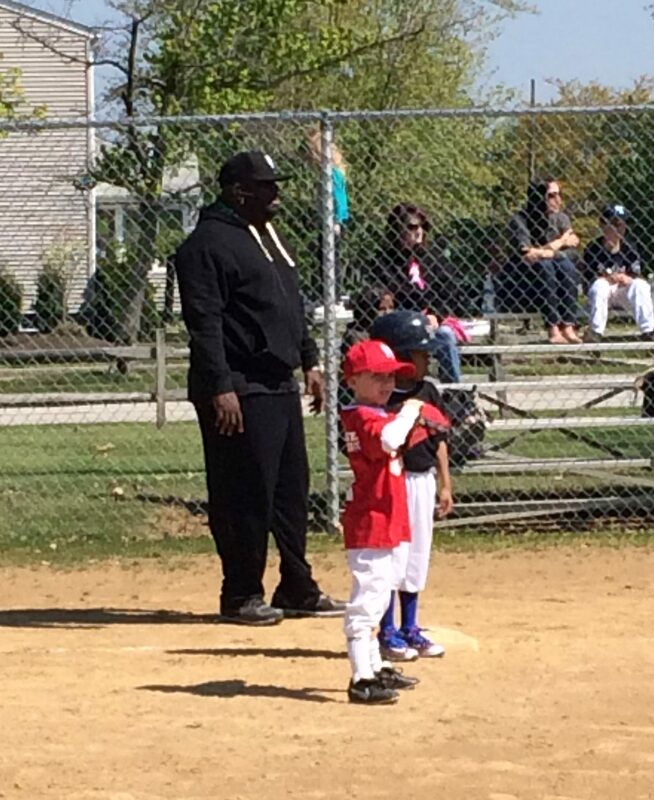 Alan plays for the Village Vet Clinic team and the opener was against the Mo Vaughn Trucking team. 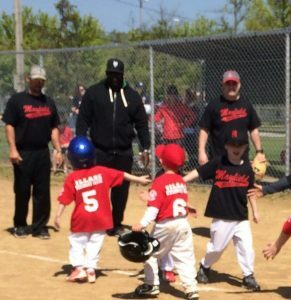 Yes, that Mo Vaughn – the former Red Sox, Angel, and Met first baseman who slugged 328 home runs between 1991 and 2003. Alan and I both shook his hand in the handshake line following the game. 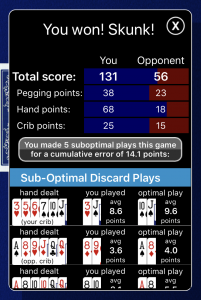 Final score: A 16-16 tie. 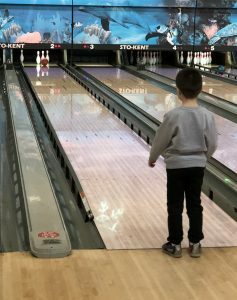 Another day, another bowling-themed birthday party for a 6-year old! This time instead of bowling with cousins, Alan bowled with classmates. Alan’s best friend and neighbor, Xavier, was the birthday boy today. 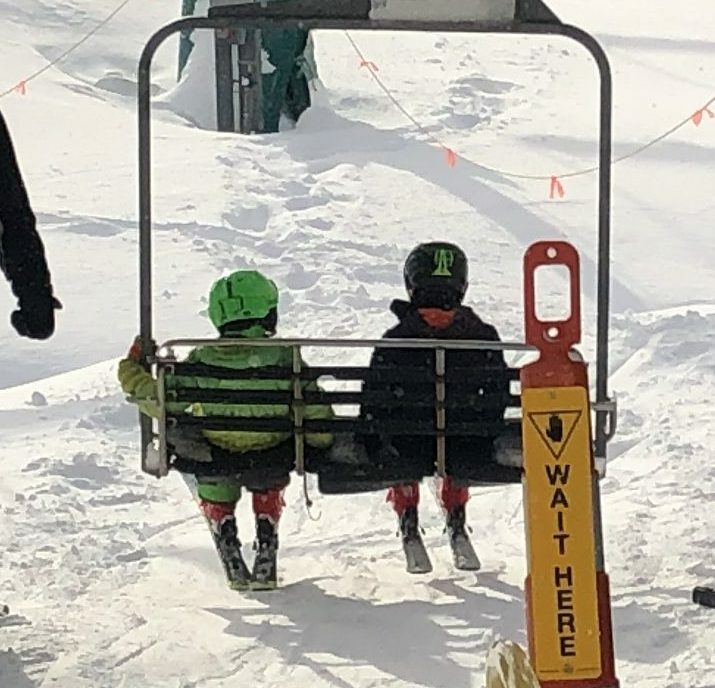 Pictured below are Noah (orange) and Anton (green). Alan, Tyler and Dominic were together again today at Dominic’s birthday party at Stow-Kent Lanes. The trio had a fun time together as usual! In Alan’s first career bowling appearance, he recorded a spare on the 6th frame and won his lane with a score of 78! 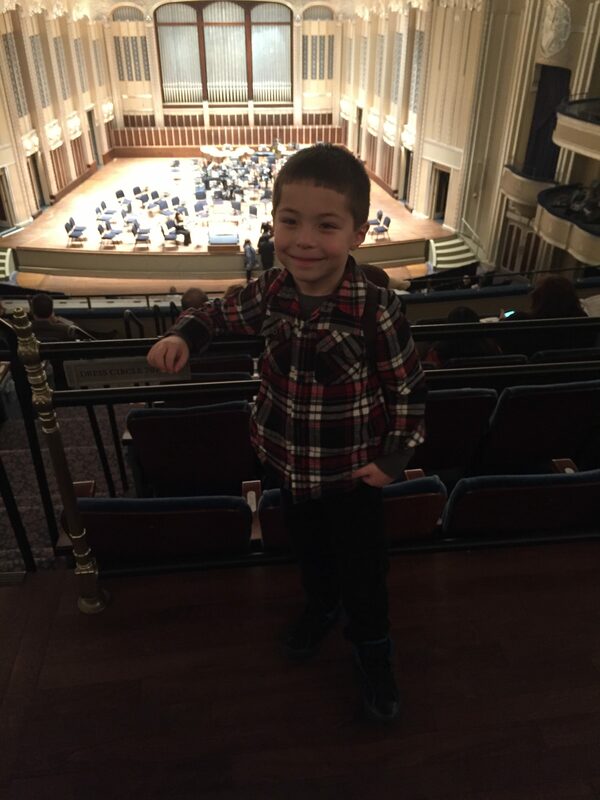 Alan ventured out to Severance Hall tonight to see the Cleveland Orchestra! 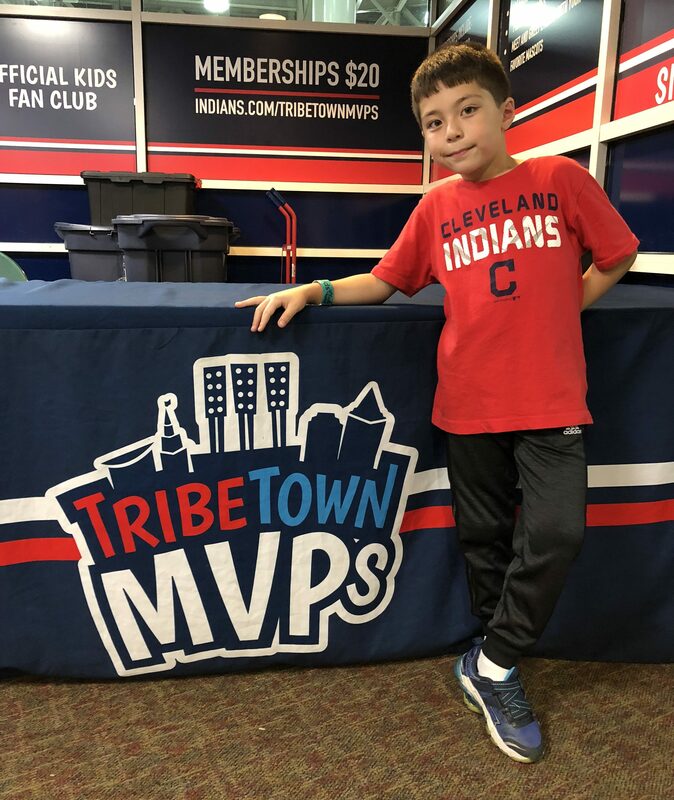 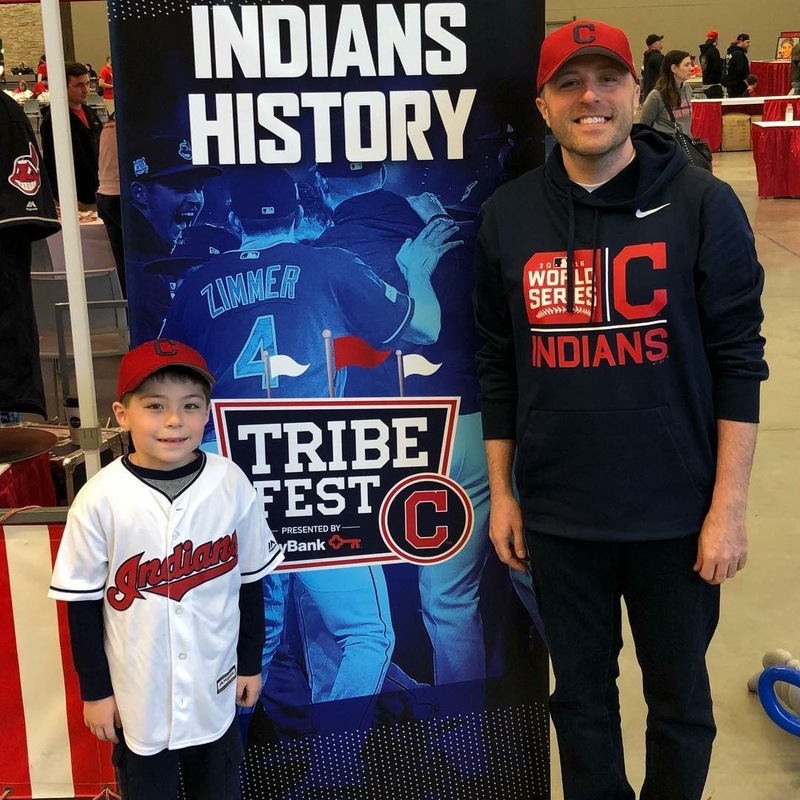 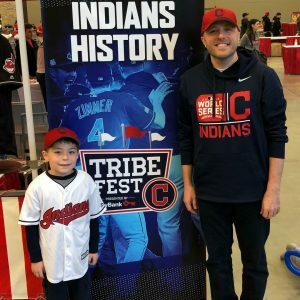 Today Alan attended Tribe Fest for the first time! 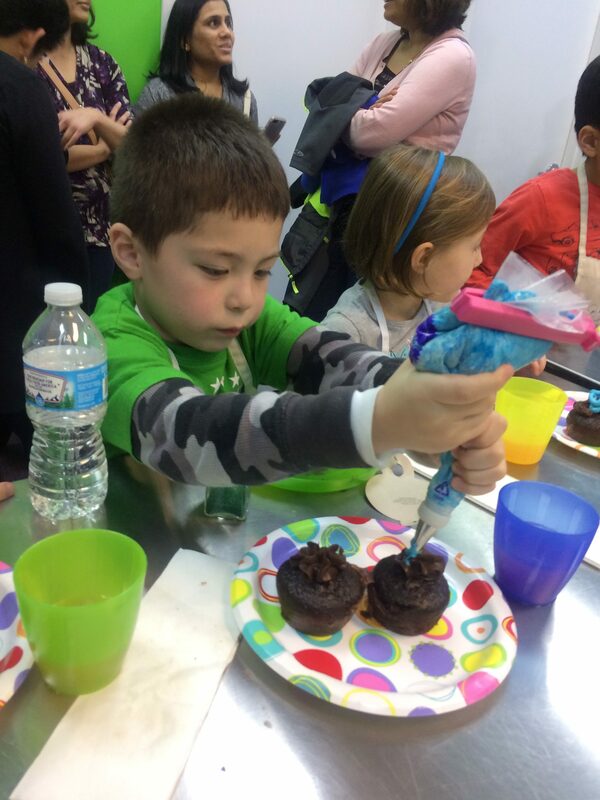 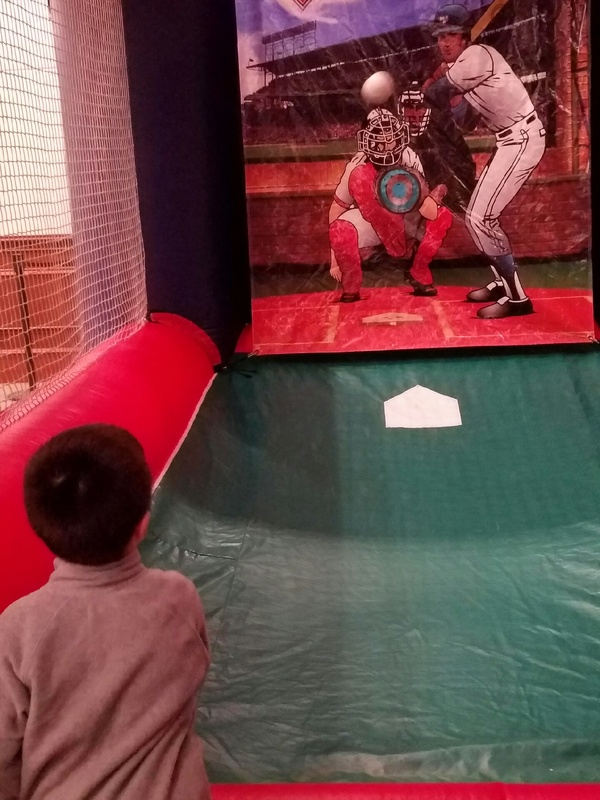 We went straight for the kids activities — Lego building, a pitching accuracy game, and balloons! 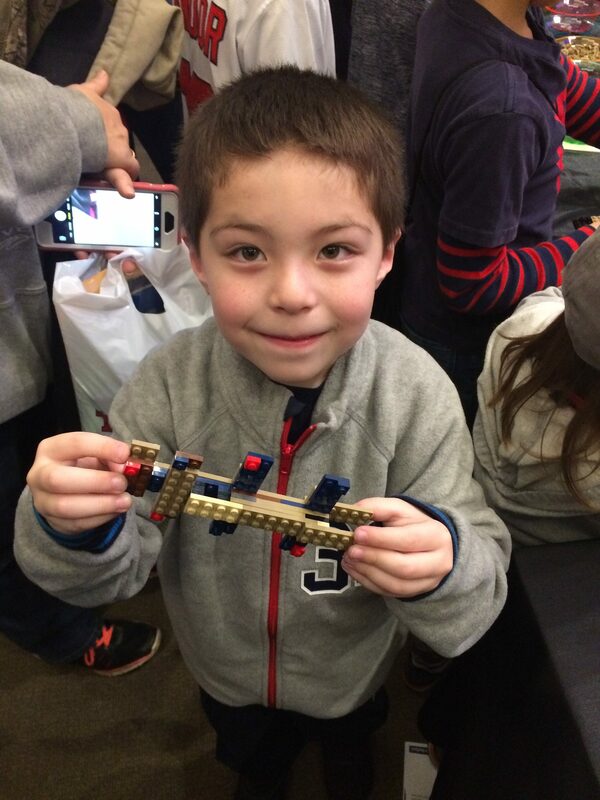 At the Lego table, Alan built an awesome airplane with his imagination. At the pitching activity, Alan picked up 2 bullseyes and many more strikes! Once we finally found the balloon station, Alan requested a baseball hat and a sword…and he played with them all night long afterwards. Can’t wait for the return of baseball season! 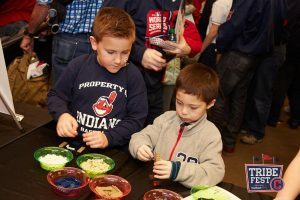 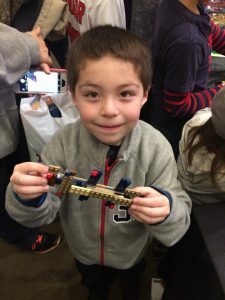 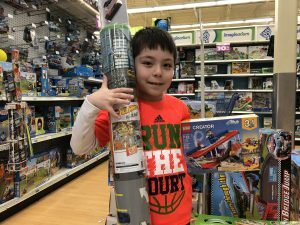 11/17/17 Update: When Robbie went to purchase tickets for Tribe Fest 2018, he found a photo of Alan playing with Legos in last year’s gallery! 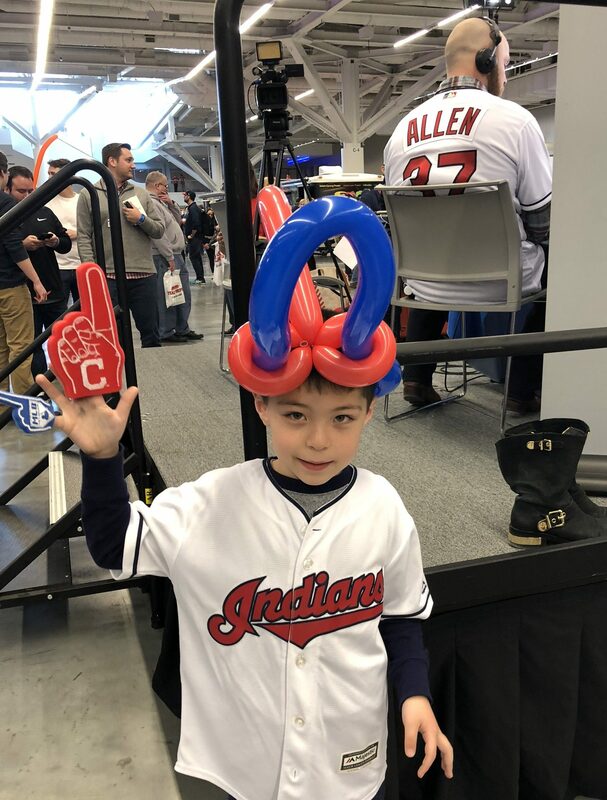 Turns out this photo was actually Alan’s debut appearance on the Indians website. 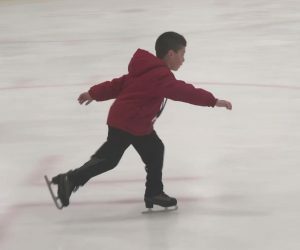 Look at how much Alan has improved at ice skating. 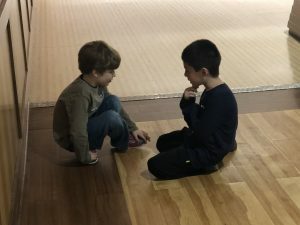 This is just lesson #5! 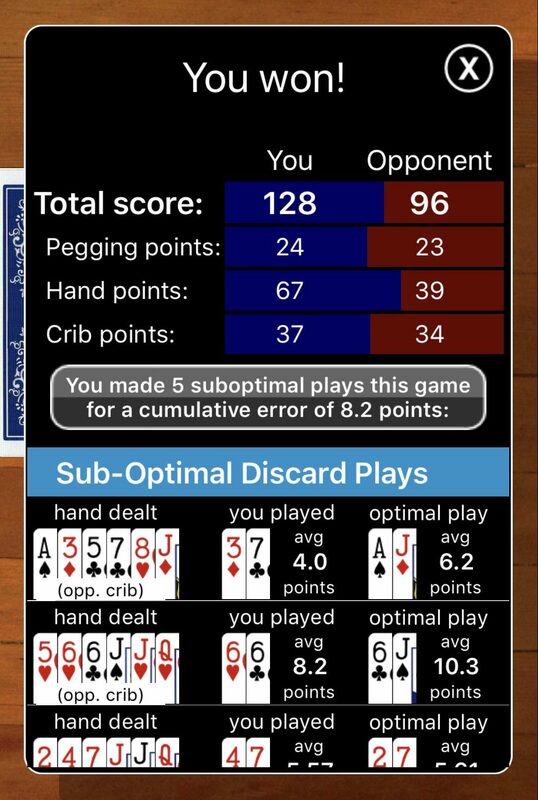 Love how he splits the cones at the 1:05 mark especially. 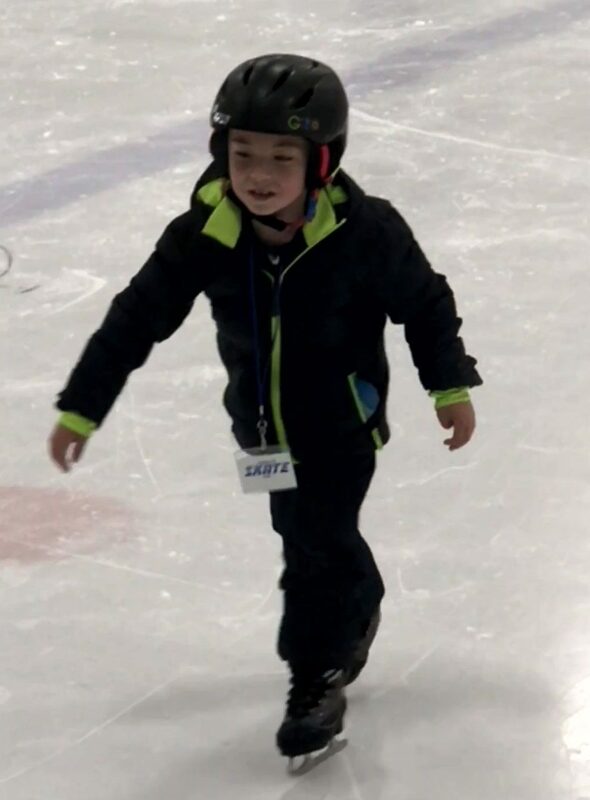 As of today, Alan has officially taken up ice skating! 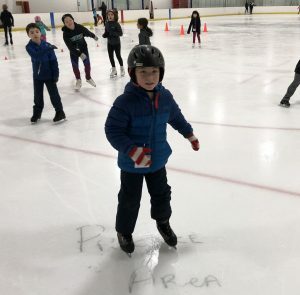 He participated in his first of five “learn-to-ice-skate” sessions at Gilmour Academy. He took a bus with his friends from Millridge after school, and he had a great time learning to skate! 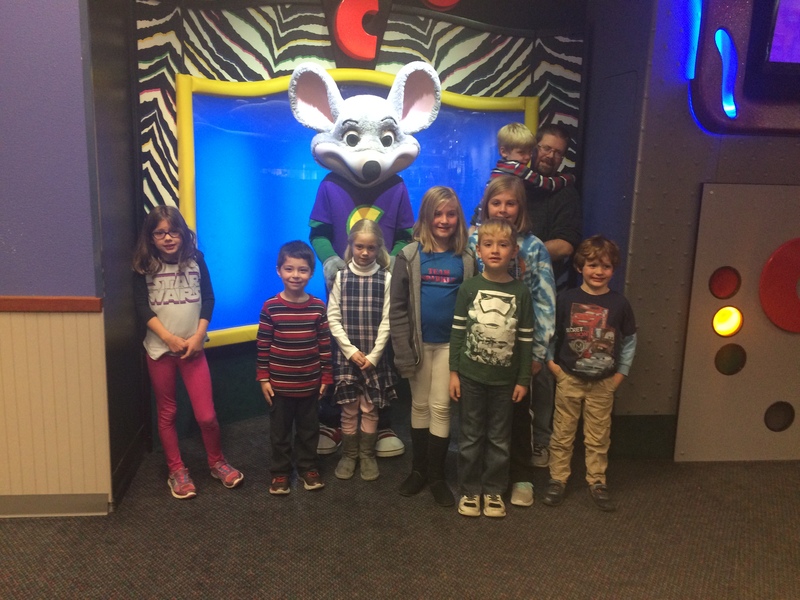 The partying continued today, as Alan celebrated Cassidy’s birthday at Chuck E Cheese’s. 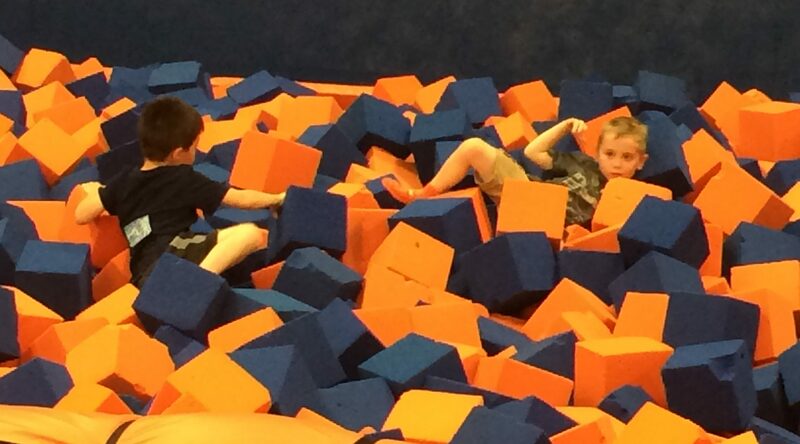 The kids ran and played and climbed for 3 hours. Alan cashed in his tickets at the end of the night for a race car! Today Alan celebrated Clara’s birthday at the zoo! 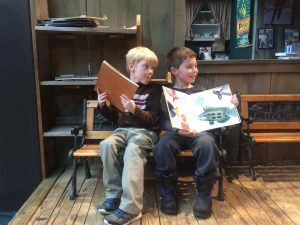 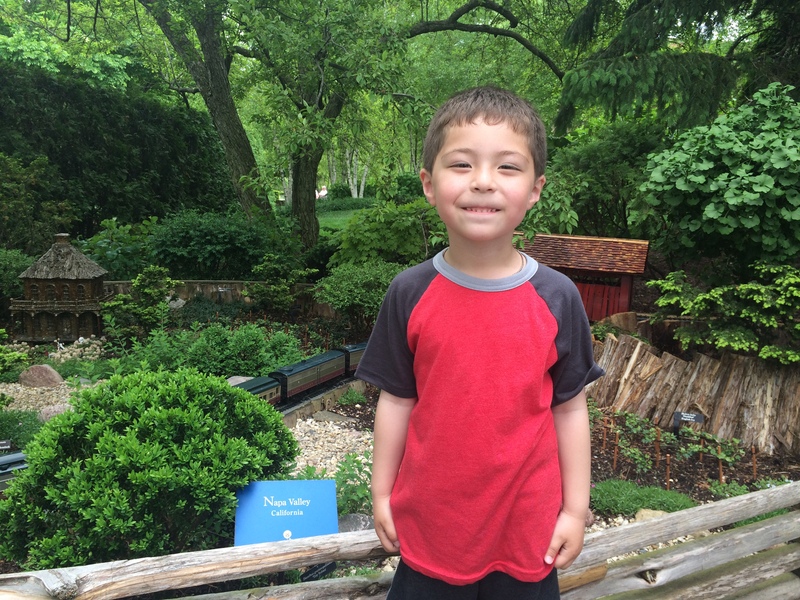 The gathering was held in the rain forest exhibit, and most of Alan’s kindergarten class was there, including Xavier. 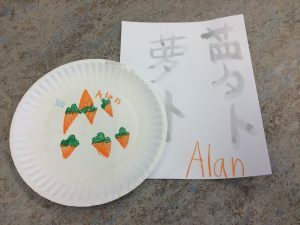 Artwork from Chinese Class. 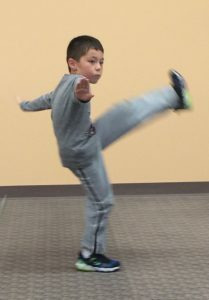 Plus a video from martial arts. Alan’s 3-story house and parking lot! 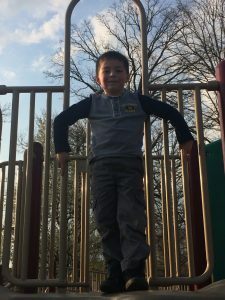 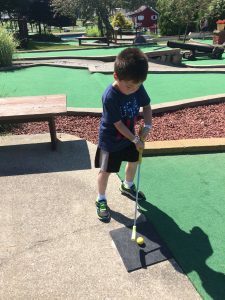 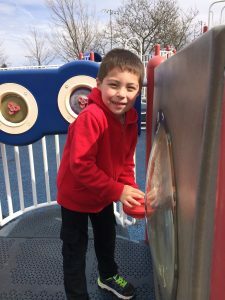 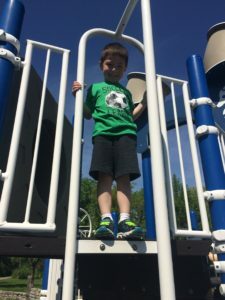 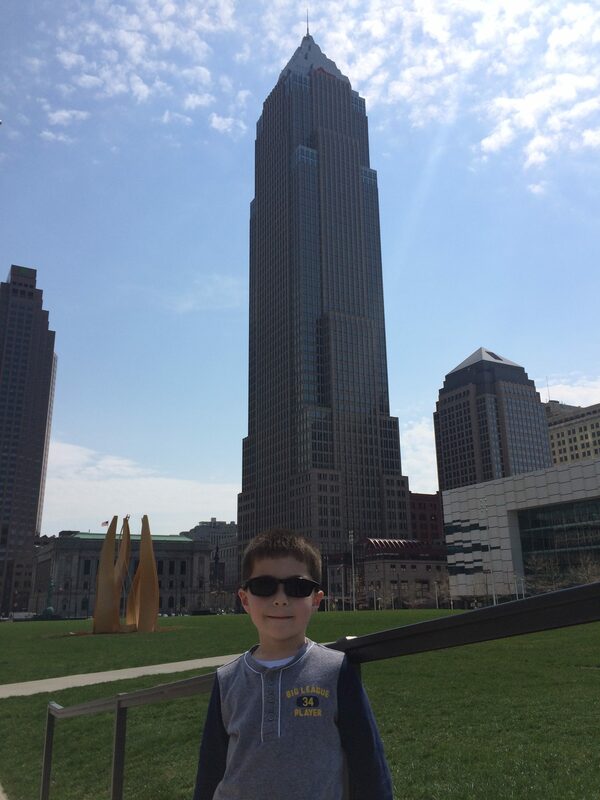 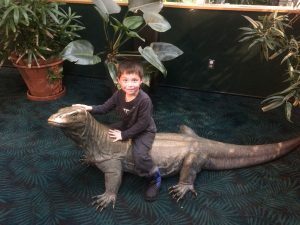 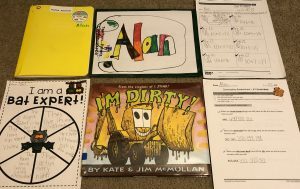 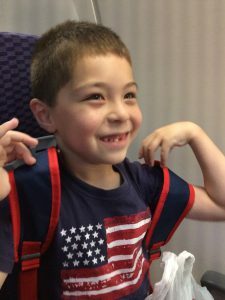 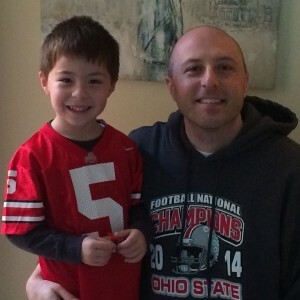 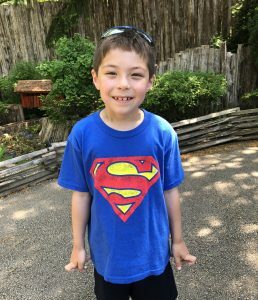 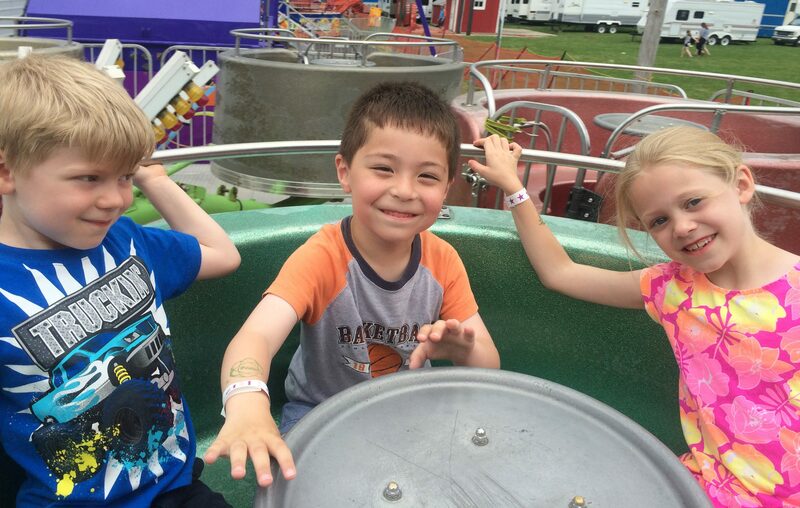 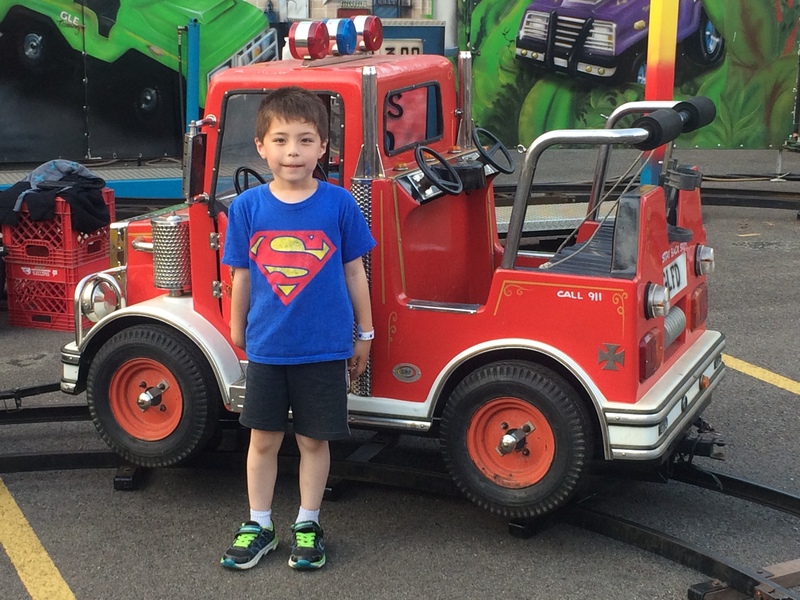 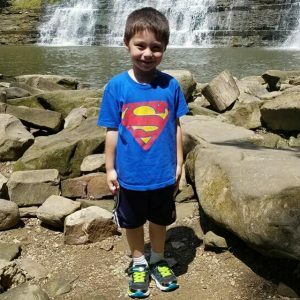 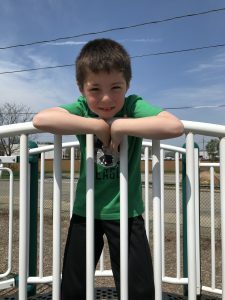 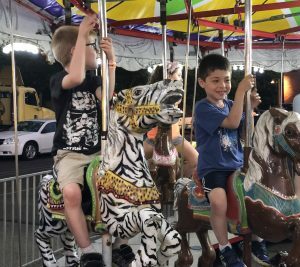 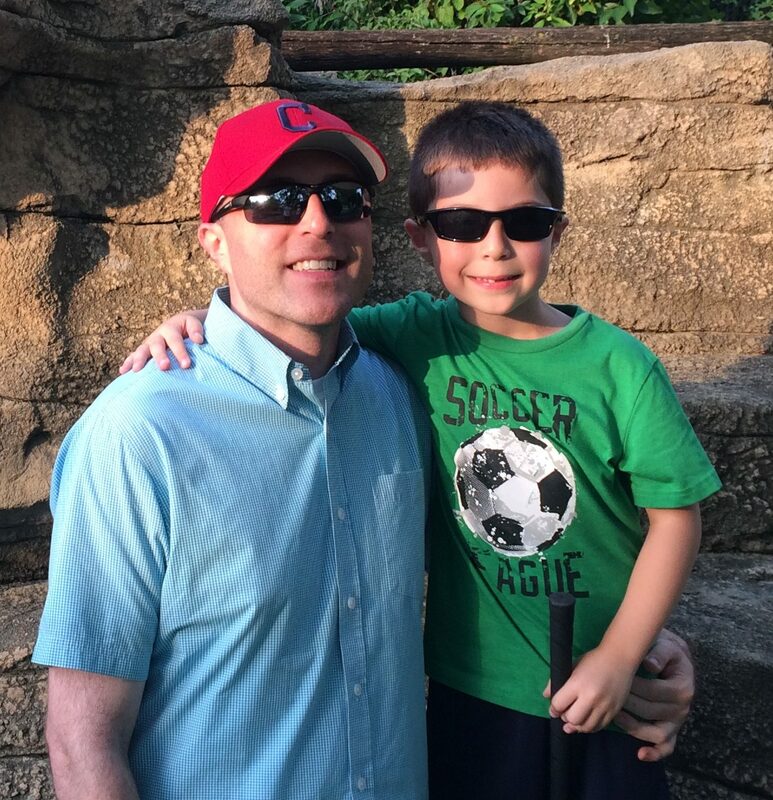 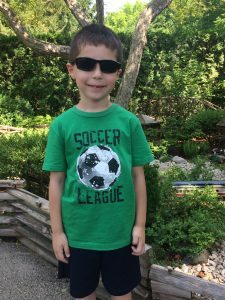 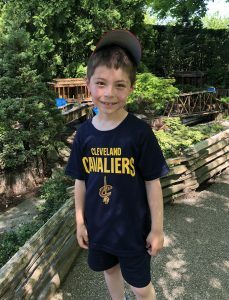 With kindergarten just two weeks away, here’s a look at the highlights of Alan’s summer! 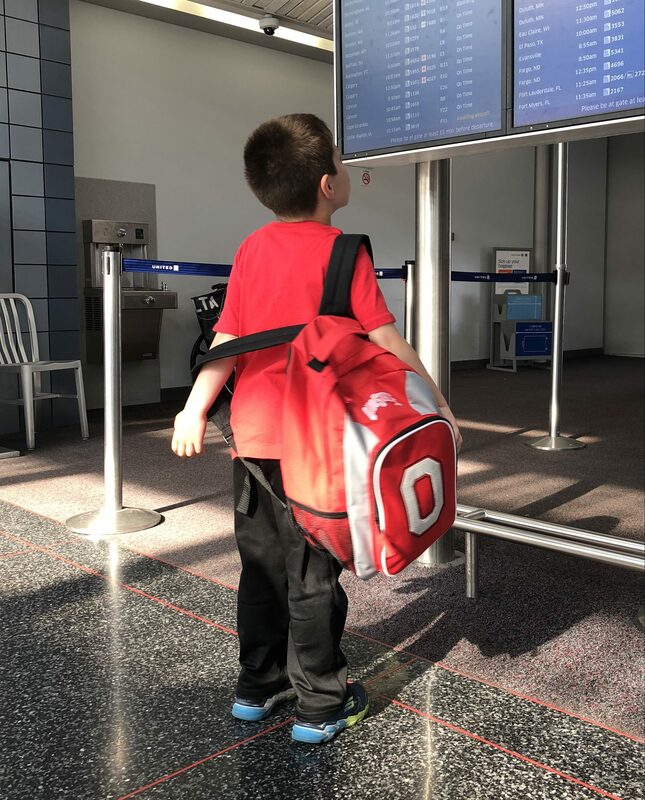 Alan saw both of his uncles, including Uncle Josh and Uncle Bobby — plus Meghan, Tyler, and Carleigh — on separate visits this summer. 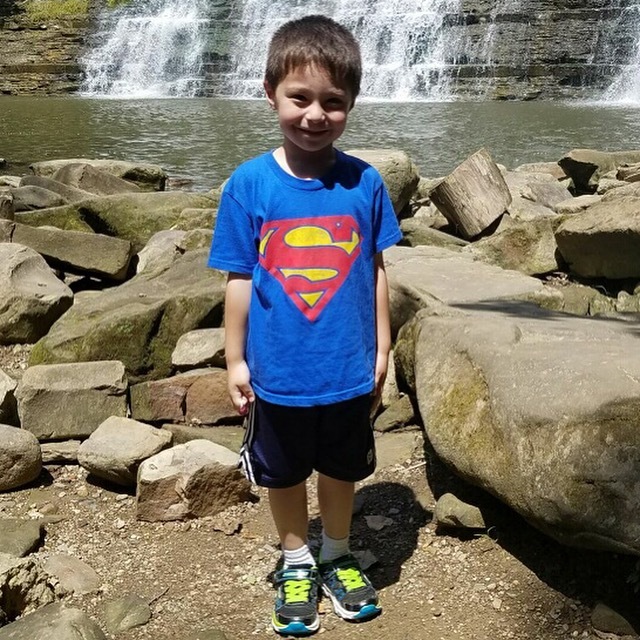 Josh took the photo above, from down on the rocks at Chagrin Falls. 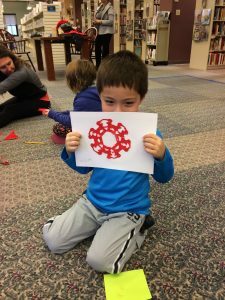 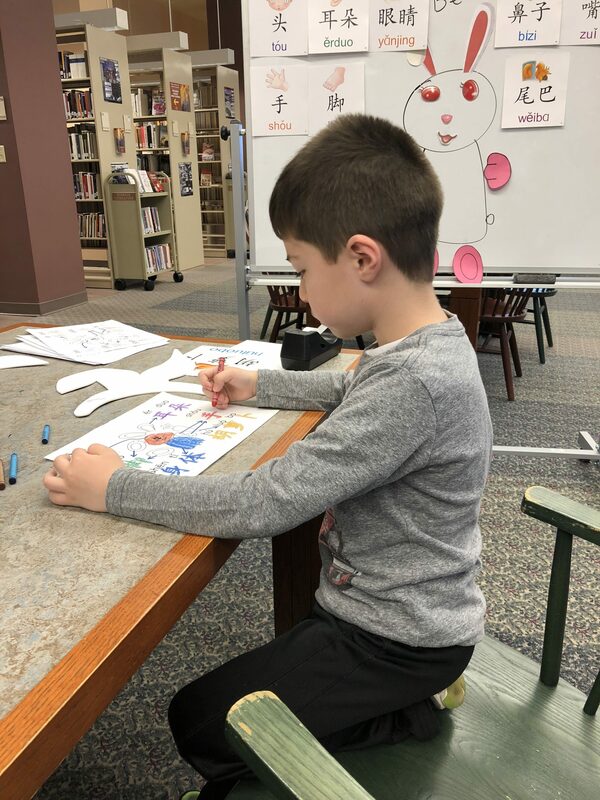 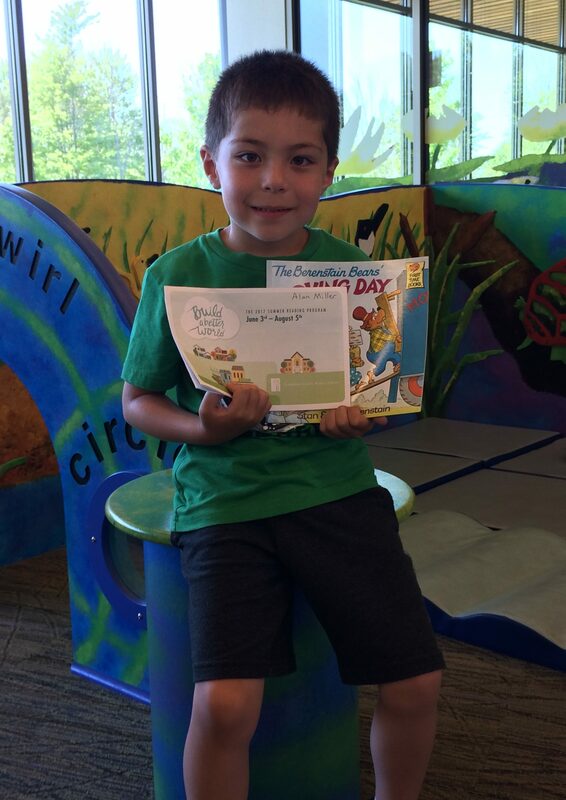 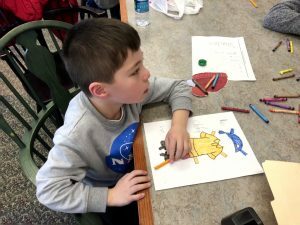 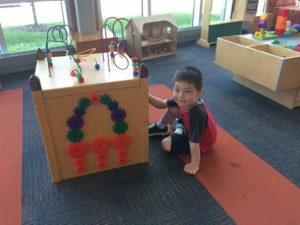 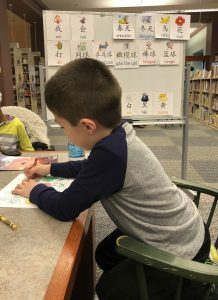 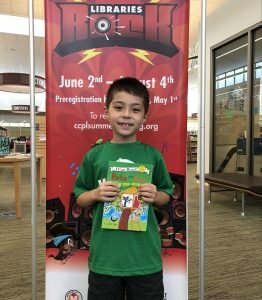 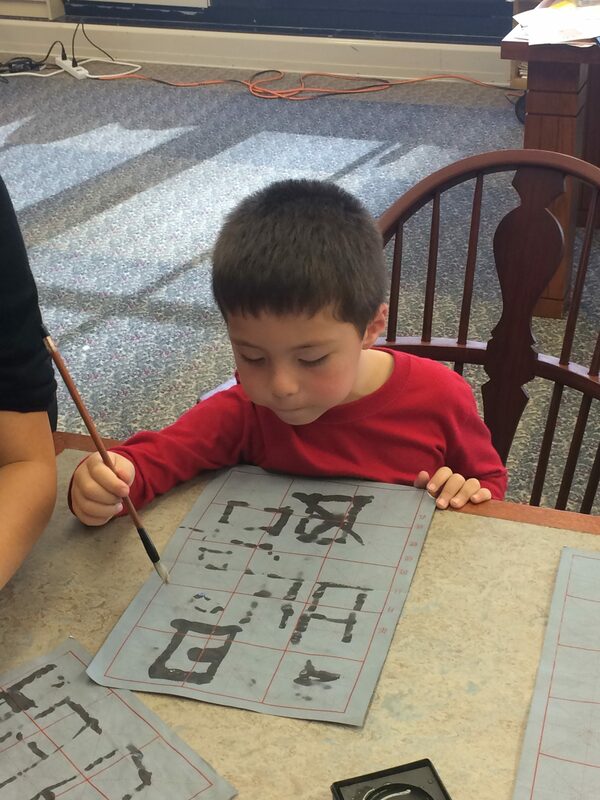 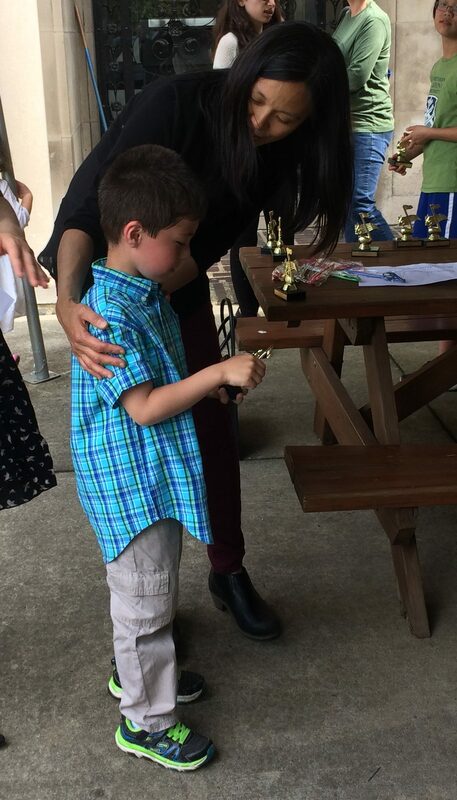 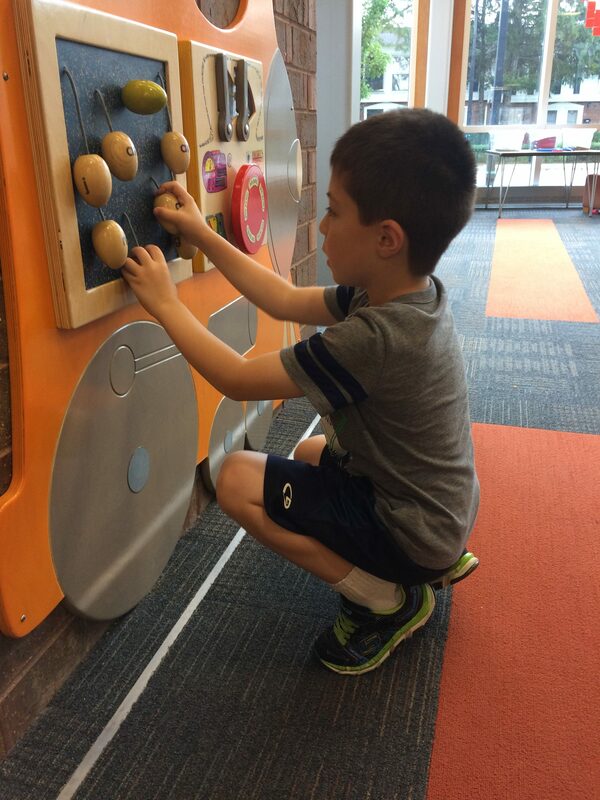 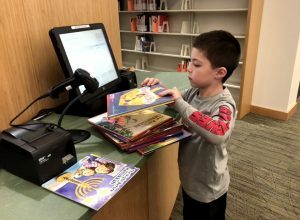 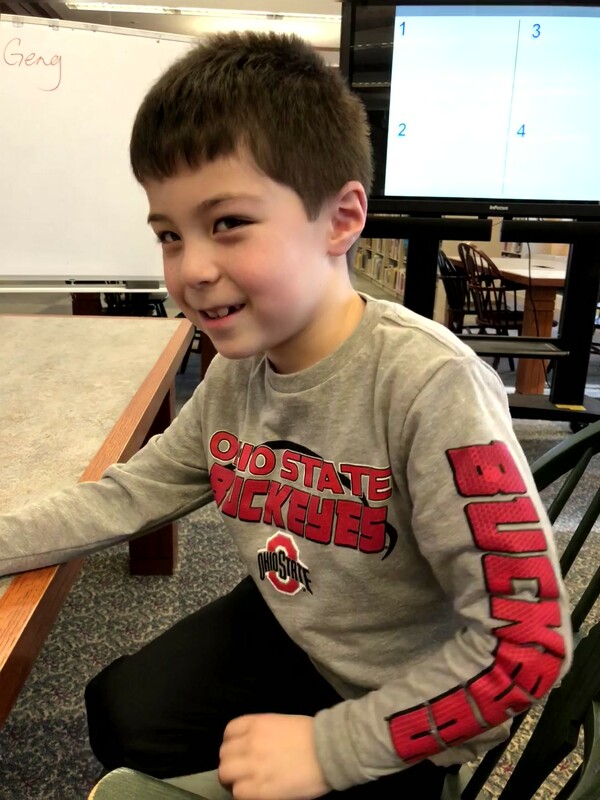 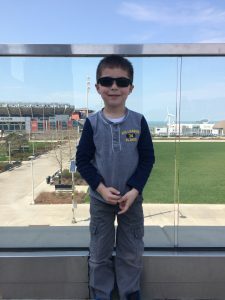 To prepare for kindergarten, Alan completed his first summer reading program at the Solon library. 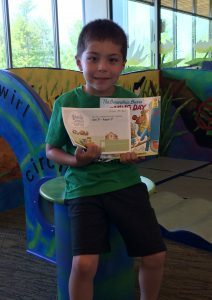 And he graduated from Safety Town! On the baseball field, Alan completed his first baseball season. 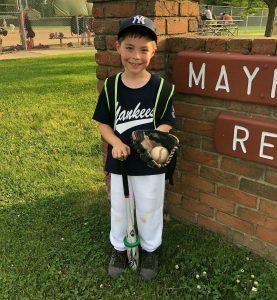 He made great strides in learning to catch a ball with his glove, and he successfully learned to hit a ball without the aid of a tee! 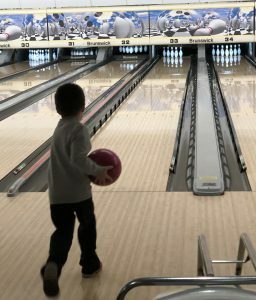 Alan also picked up a new hobby. He loves building with legos, and he even learned how to follow the instructions on his own (when he’s not creating awesome wrecking ball trucks with his imagination). 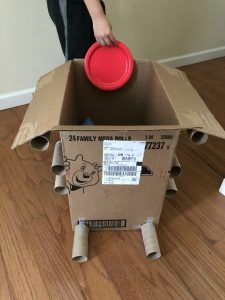 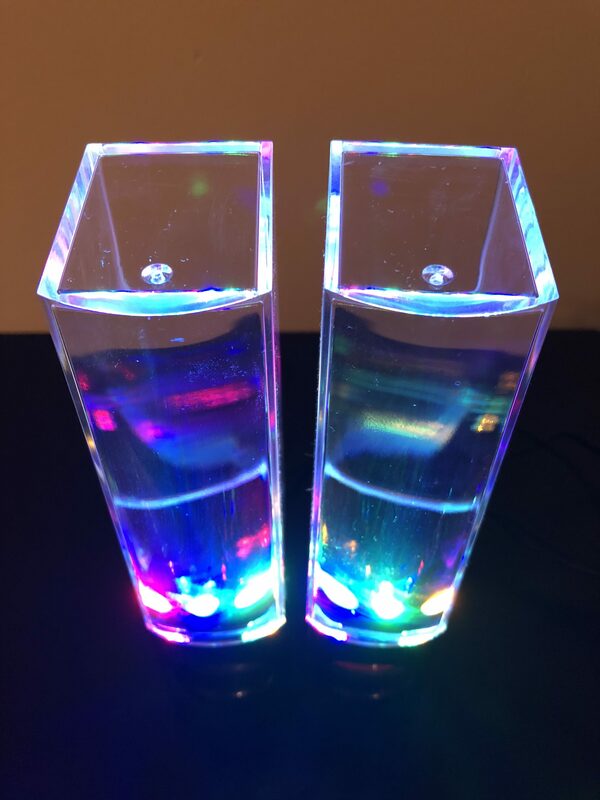 Bonus videos: Alan’s solar system and homemade tunnel! 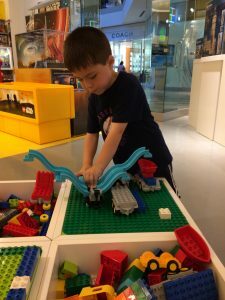 When Alan visits Beachwood Place, the first stop is at the Lego Store. And when he’s there, he loves to build. Check out the house he made today! Tonight Alan’s first season of baseball came to a close after a very successful six weeks. 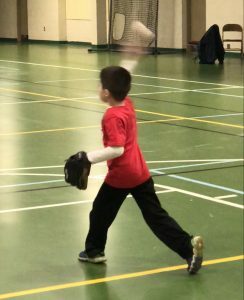 Alan really showed improvement in hitting (both with and without a tee), throwing, and – most especially – catching balls in his glove. 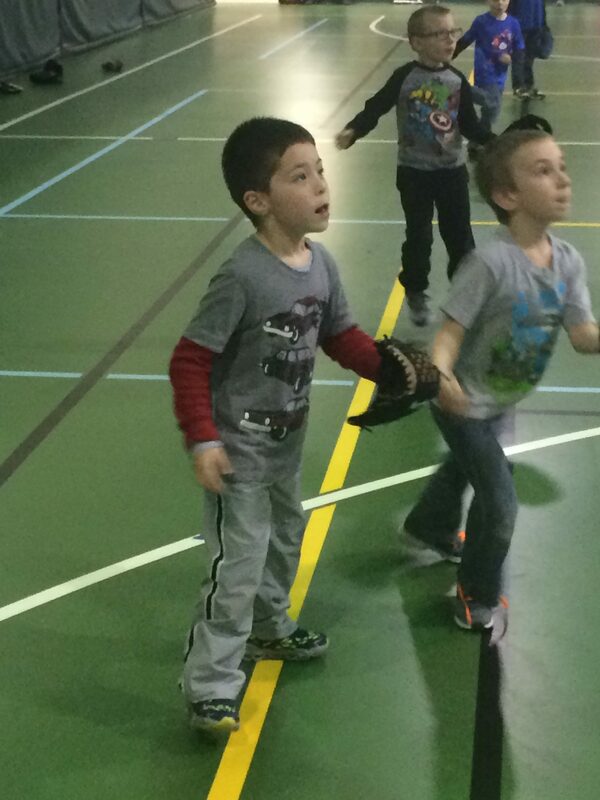 He also learned the “ready position” for fielding and started to pick up the rules of the game. Most importantly, his interest and enthusiasm for the game has continued to grow. 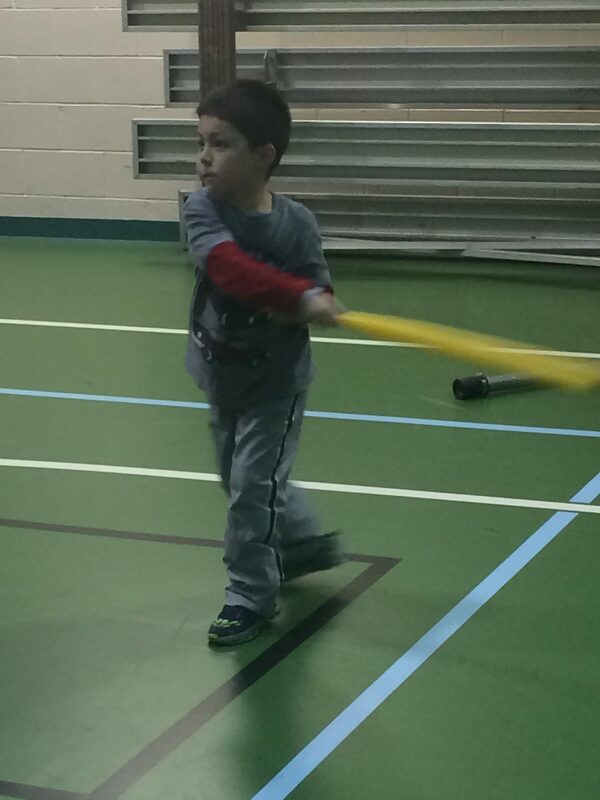 Alan got to hit leadoff the past two games because he was the quickest to get in line to hit. He also got to pick his position in the field by always being the first one to run out of the dugout. 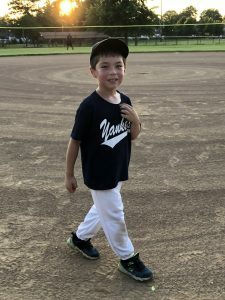 I personally loved getting to play the field and run the bases with Alan during games. 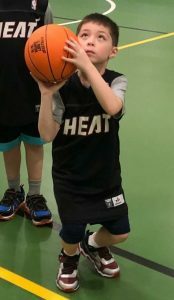 We’ll continue to practice together this summer, but I already can’t wait for next season! Note 1: Just over Alan’s shoulder you can see his fan club: Debbie, Papa, Tata, Papa, and Lulu. 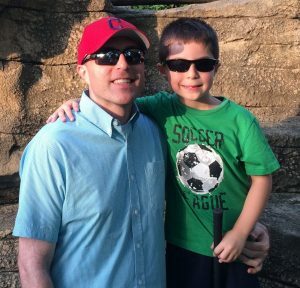 Note 2: Pictures were taken 6/9/16; Video of handshake line recorded 6/2/16. 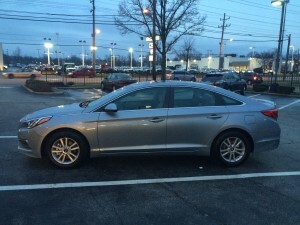 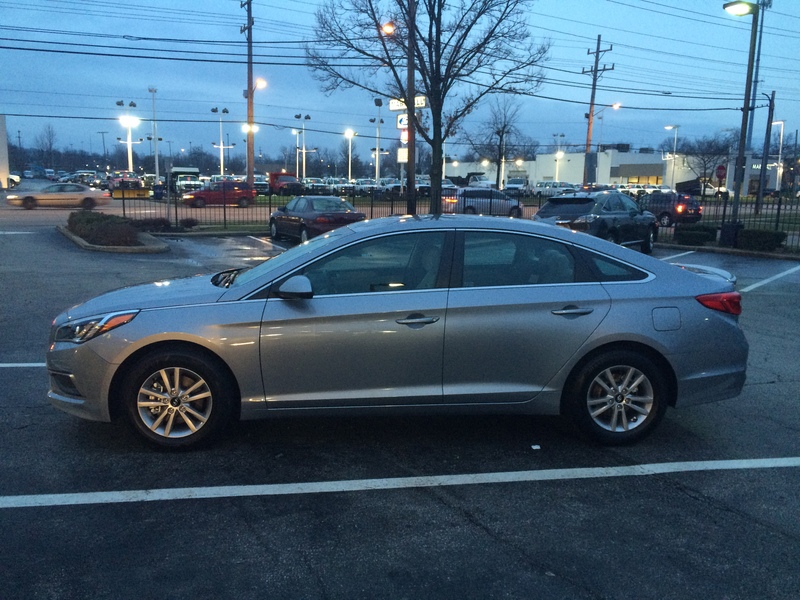 I leased a new car this month — a 2016 Hyundai Sonata — and Alan told me that he’ll be in charge of inspecting the wheels this winter to make sure that there’s not too much ice and snow on them before we start driving. As indicated by the picture below, it’s an important job when you live in Cleveland!! 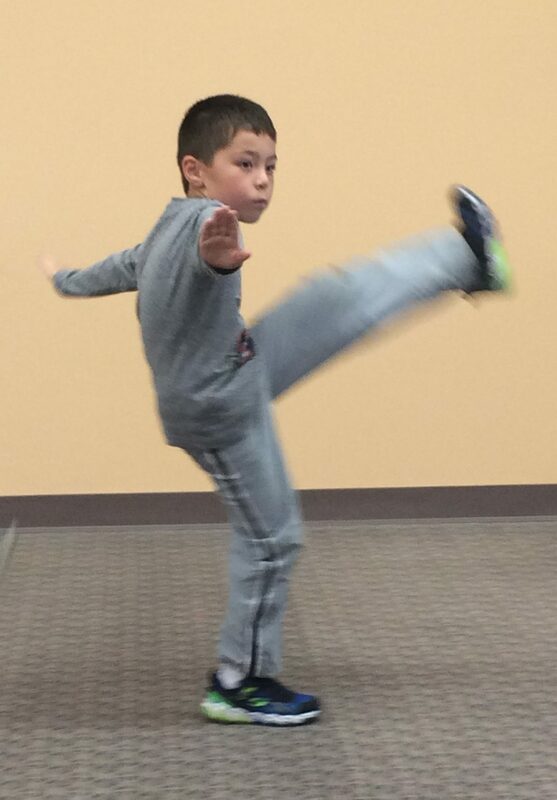 Lately Alan has really been impressing me with his maturity. He’s always been a good-mannered and well-behaved kid, but now he seems even more grown-up. 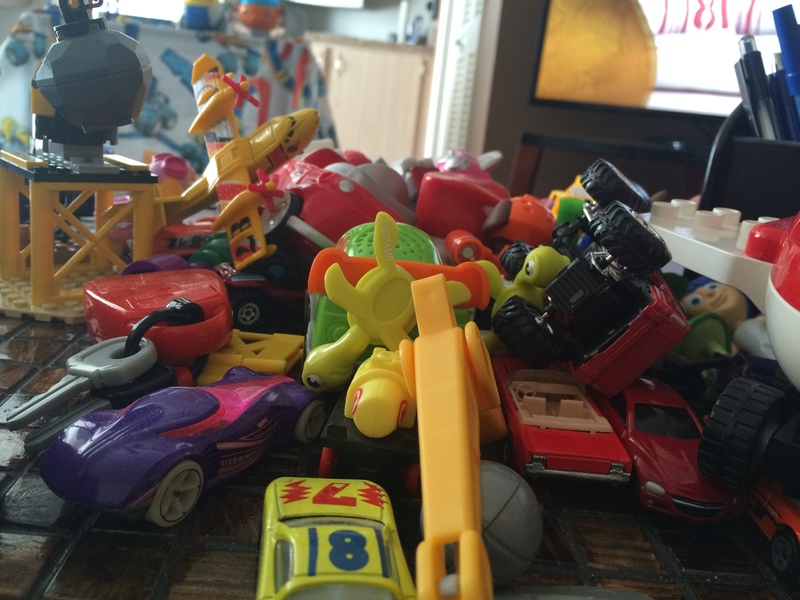 Within the last month, he’s asked to donate some of his old toys to kids who don’t have what he does. He also fully accepted that Ruby went to Dog Heaven so she didn’t have to be sick anymore. And he’s done very well at his piano lessons. 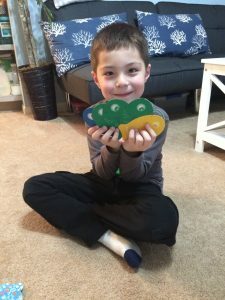 He had already been a good Chinese-English translator, but he’s continuing to develop his language skills too. 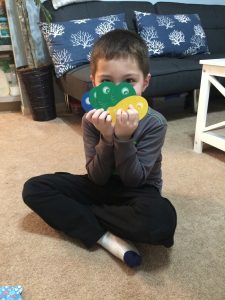 He has even picked up sign language from his class at school. 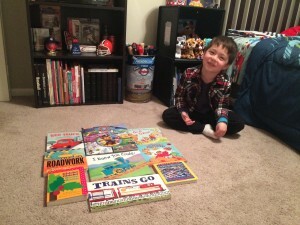 He doesn’t fall asleep in his car seat as much anymore. And speaking of car seats, he’s at a weight where he can transition to a booster seat now. 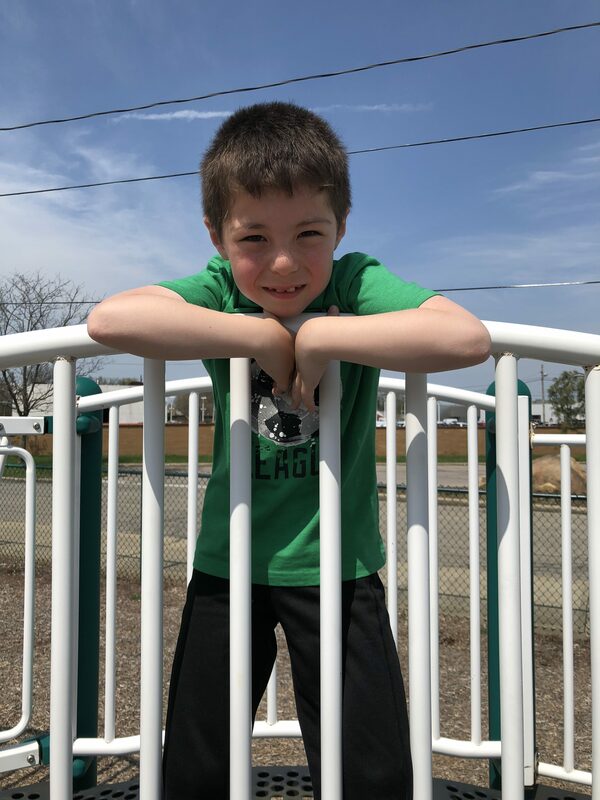 He thinks about more complicated subjects, such as where babies come from (He currently believes parents go to the hospital to pick out their favorite babies from a nursery…and that I picked him because he’s my favorite). 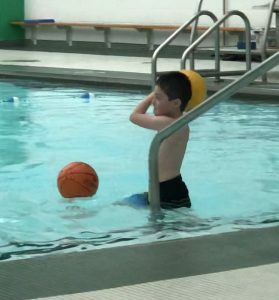 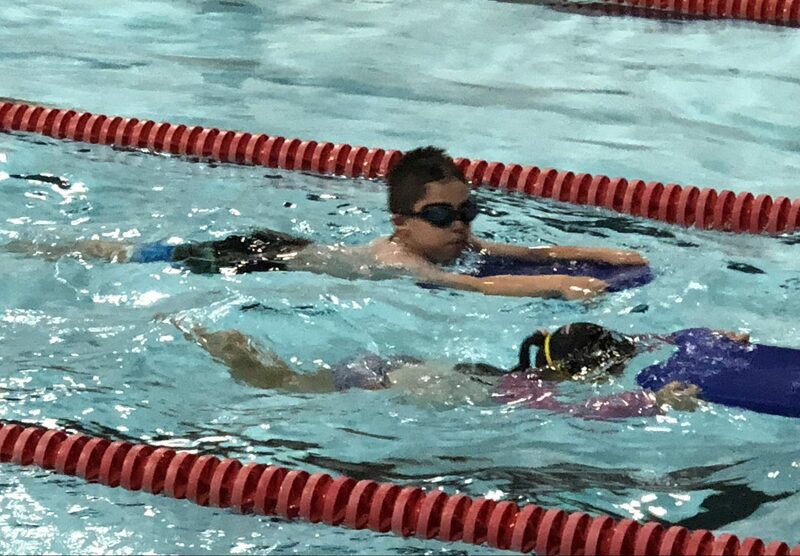 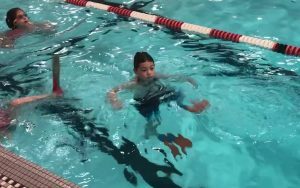 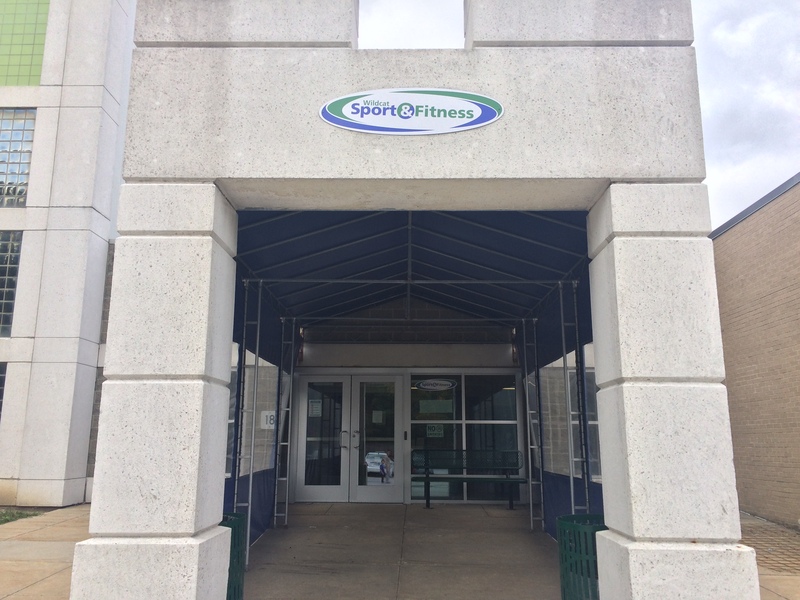 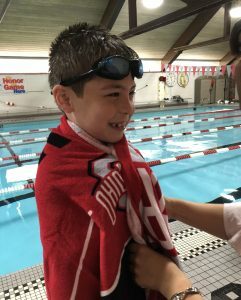 -Swimming at the Mayfield Heights indoor pool – with a flotation device, but by himself! -Learning at school and playing tag at recess! 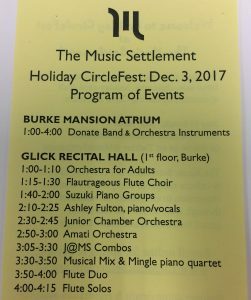 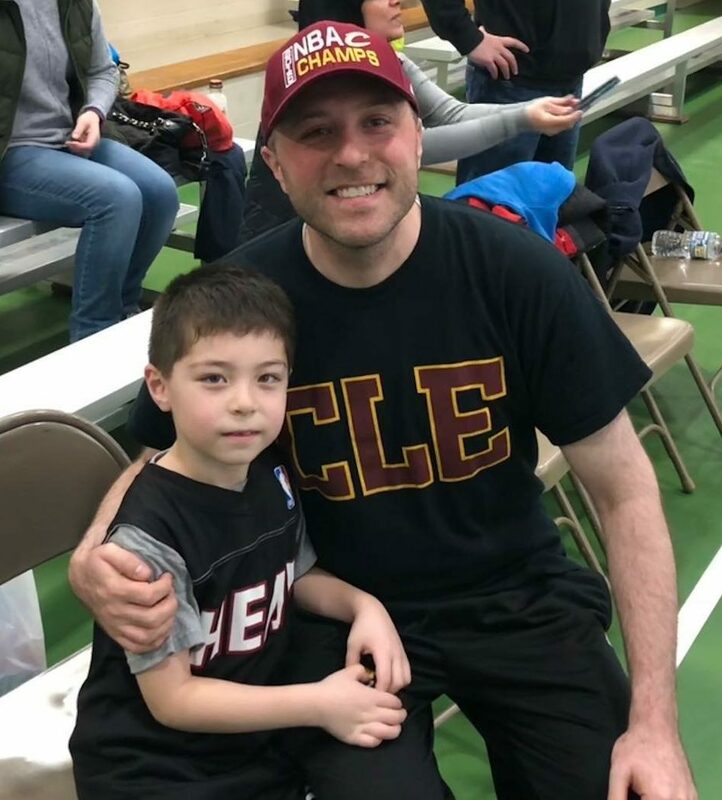 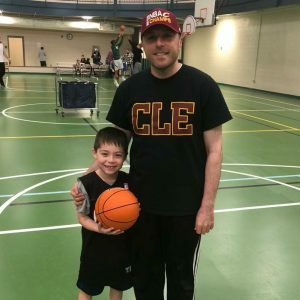 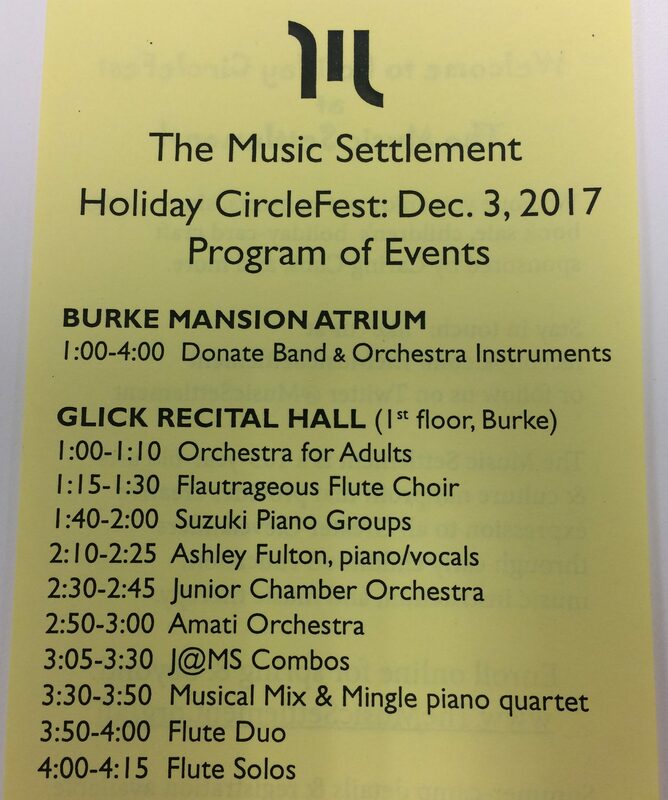 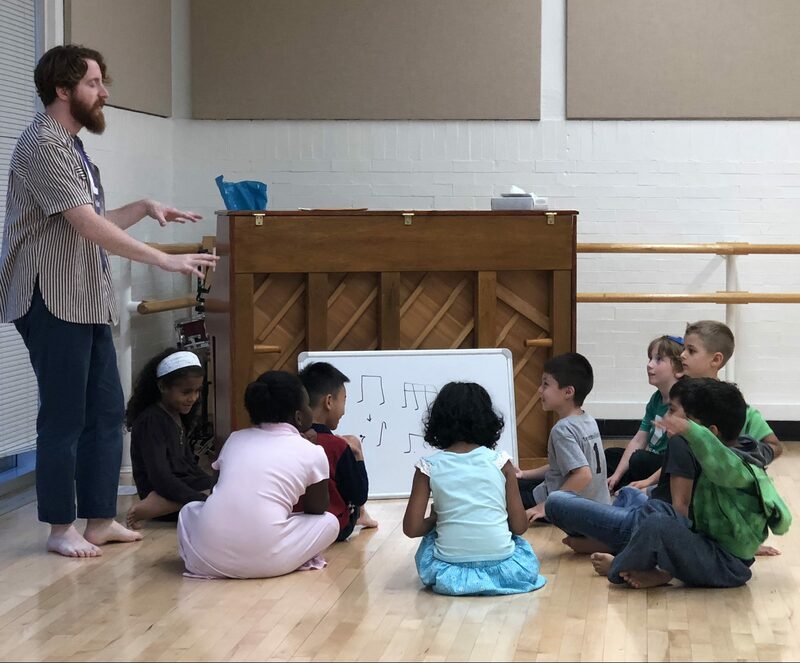 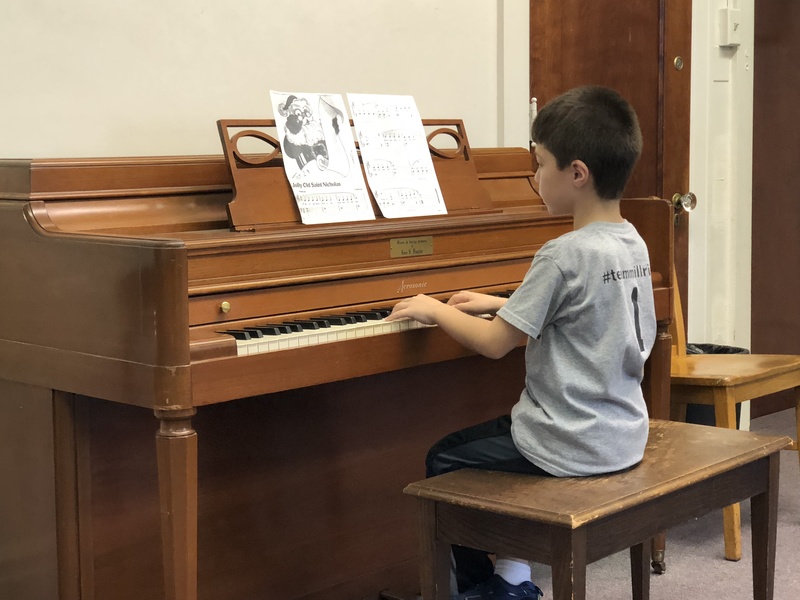 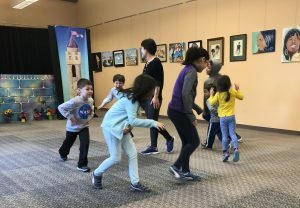 In addition to attending Chinese language and Martial Arts classes (pictured above) on Saturdays at the Cleveland Public Library, Alan is also now taking piano lessons on Saturday mornings at Case Western with a couple other students. 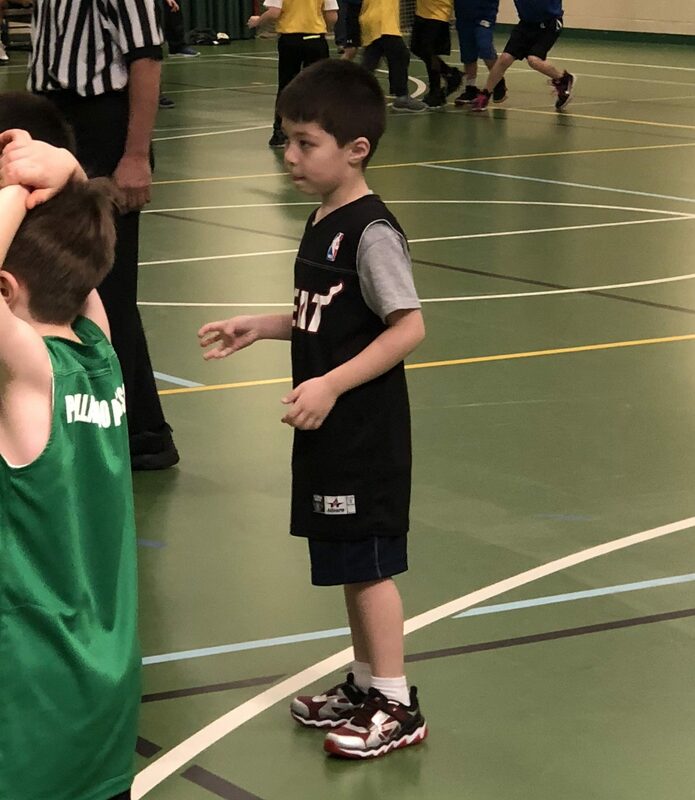 So far he’s off to a great start. 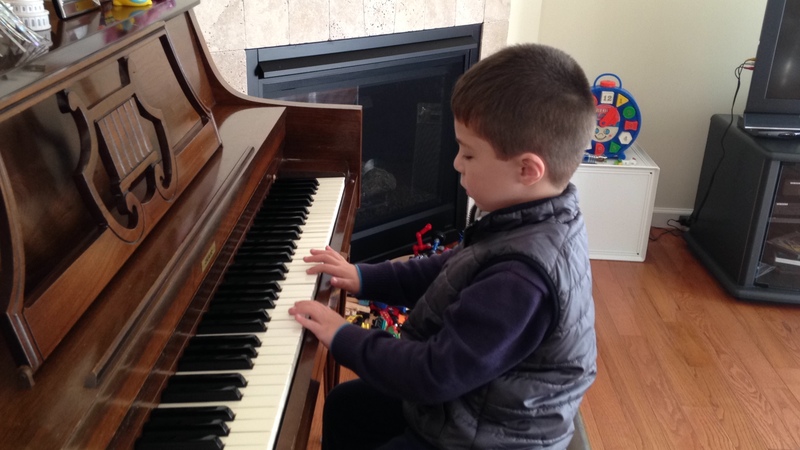 He’s learning all the notes and has been practicing at home. 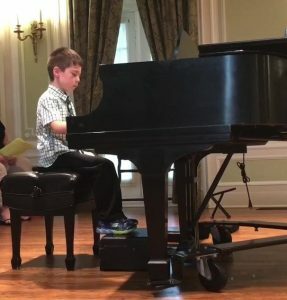 On October 10th he was chosen by the teacher to demonstrate how to play the notes to the other students! 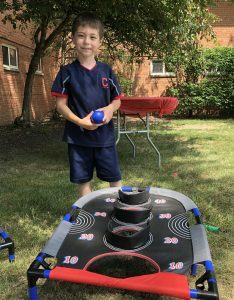 For the past few months, Alan has been taking batting practice (video) in the bocce ball pit at Oakville Park. 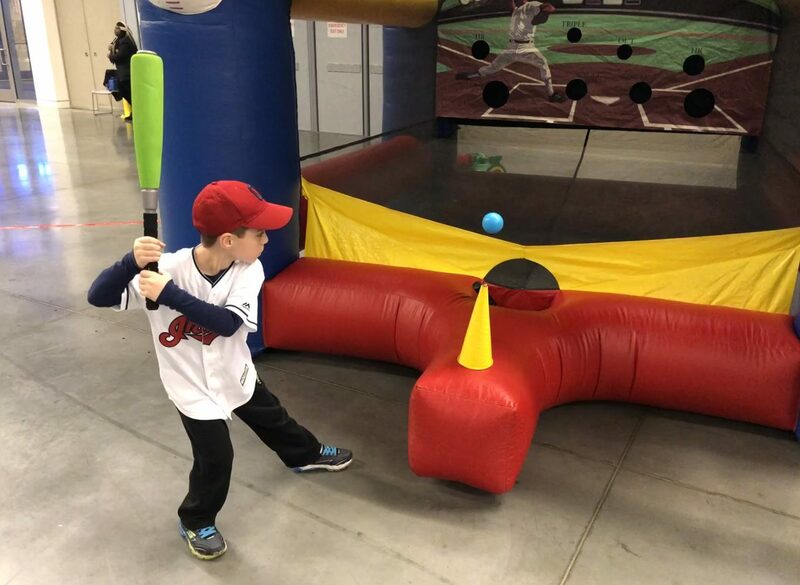 We consider hitting the back wall of the pit a home run. 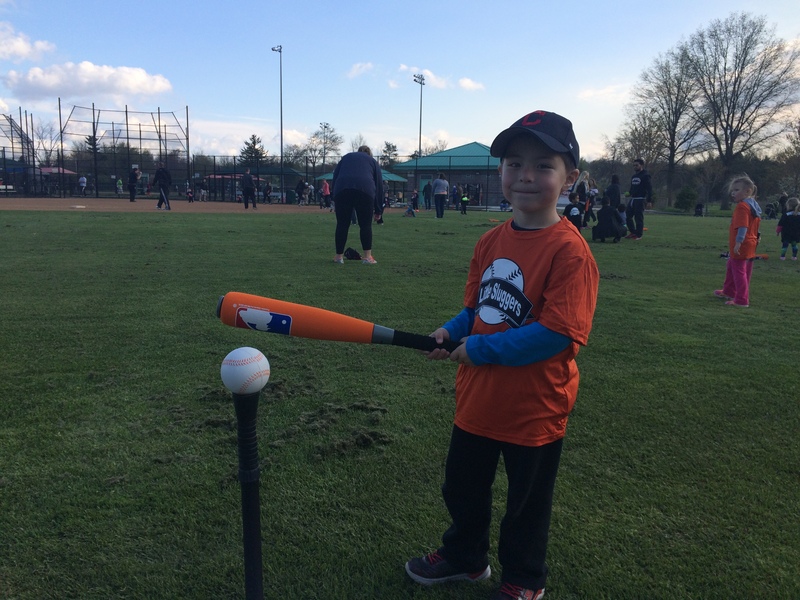 Alan’s homeruns-to-swings ratio is getting pretty good! 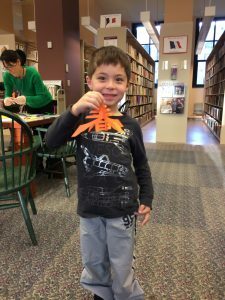 This fall Alan will be busy on Saturdays. 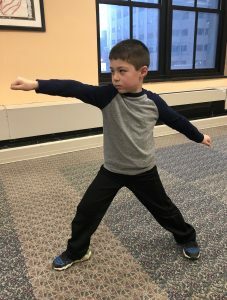 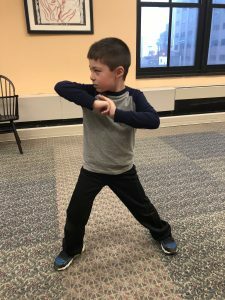 He’s participating in Chinese language lessons and martial arts every Saturday from 3 to 5 at the Cleveland Public Library. 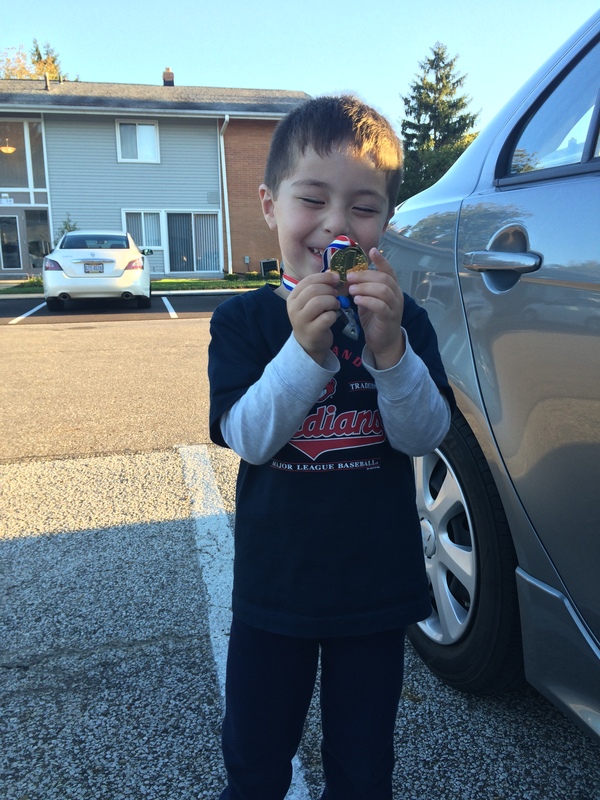 In just his second class yesterday, he earned a medal (pictured above) for best participation in the class! 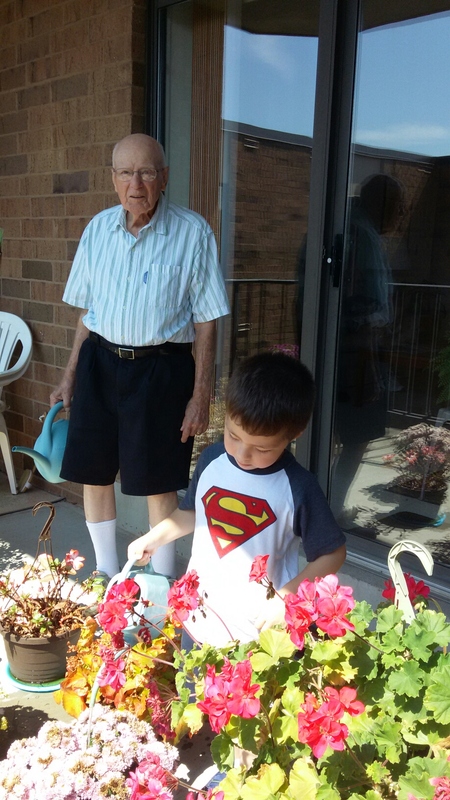 Alan’s new job: Plant waterer! 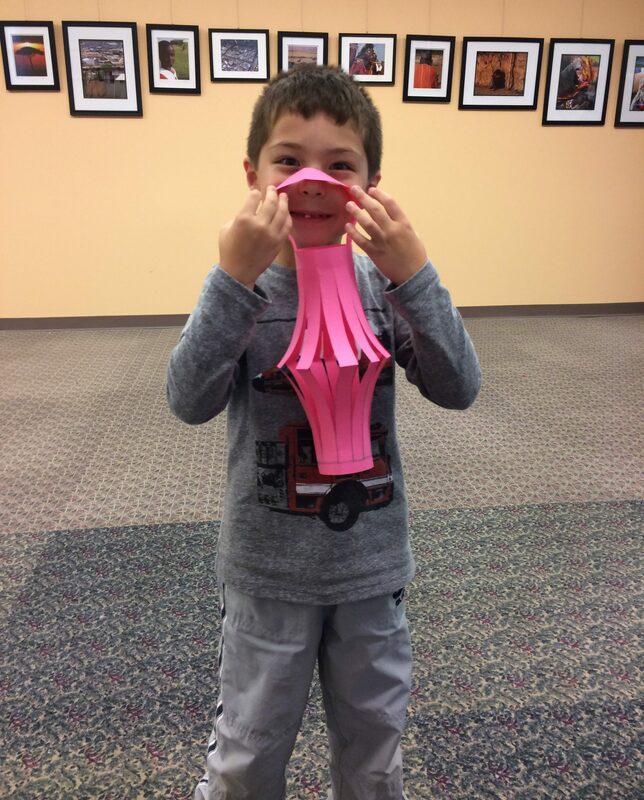 Today Alan saw Swifty the Clown at the Richmond Heights Library, and he did not leave empty-handed. He’s wearing a jet pack while holding a dolphin and a bicycle! 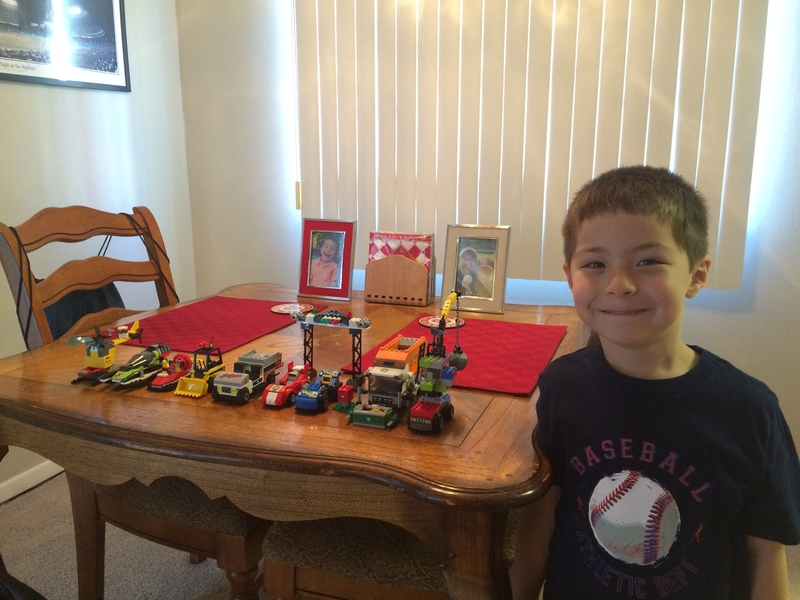 The days of Alan wanting to buy two Matchbox cars from Discount Drug Mart every weekend are officially over. 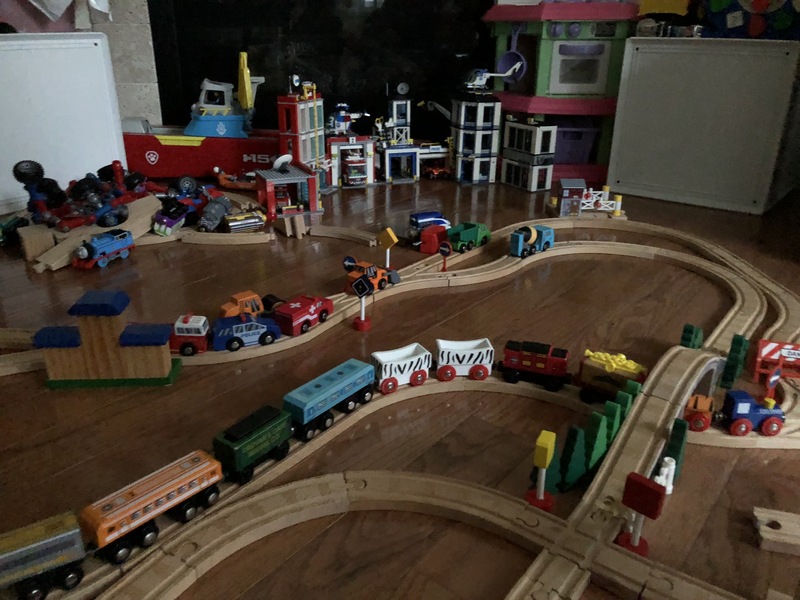 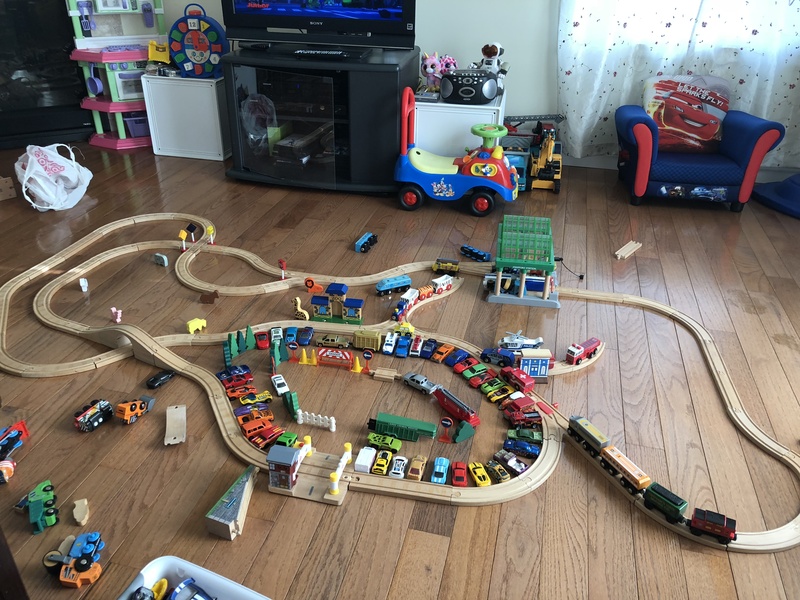 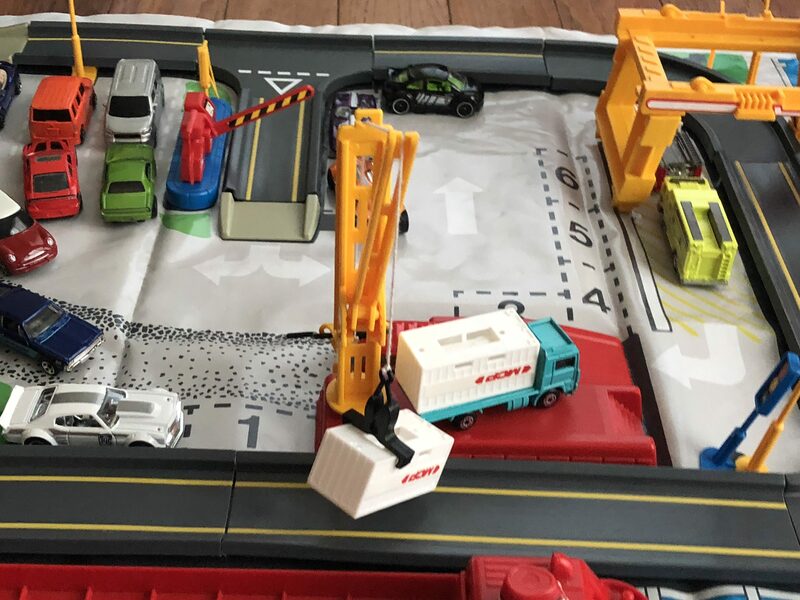 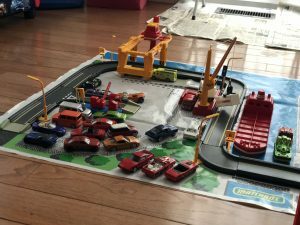 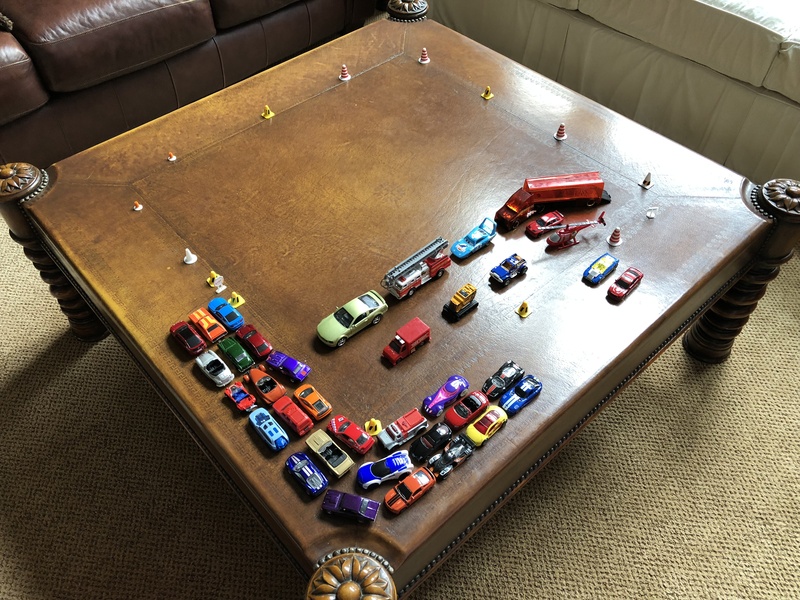 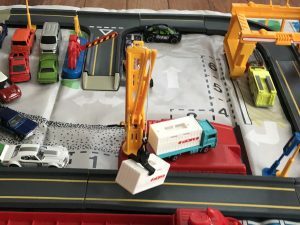 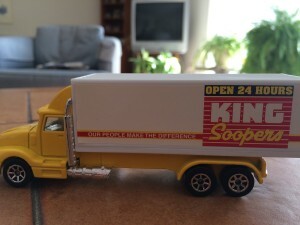 He still loves cars (and trucks, trains, planes, helicopters, etc for that matter), but his interests in toy collection are now much more diverse. 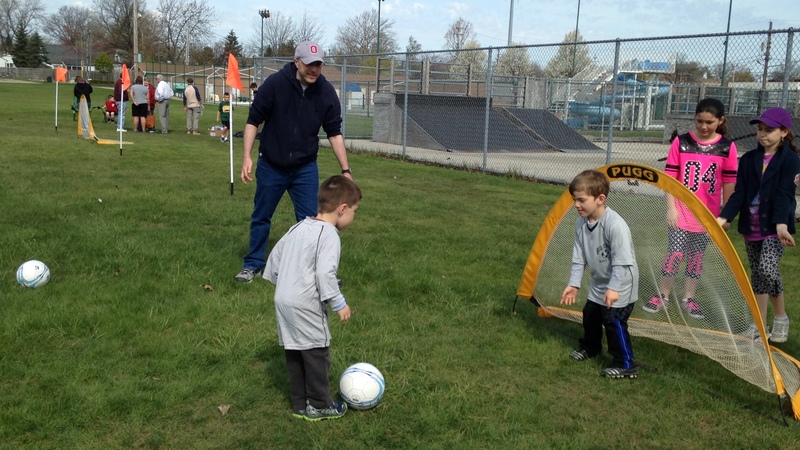 On Saturday, April 25th Alan made his soccer debut in the Mayfield “Red Devil” 4-year old league! 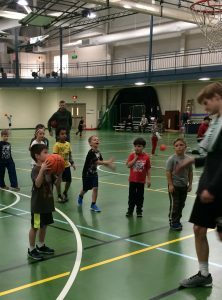 The season consists of six 1-hour Saturday morning practice and game sessions. 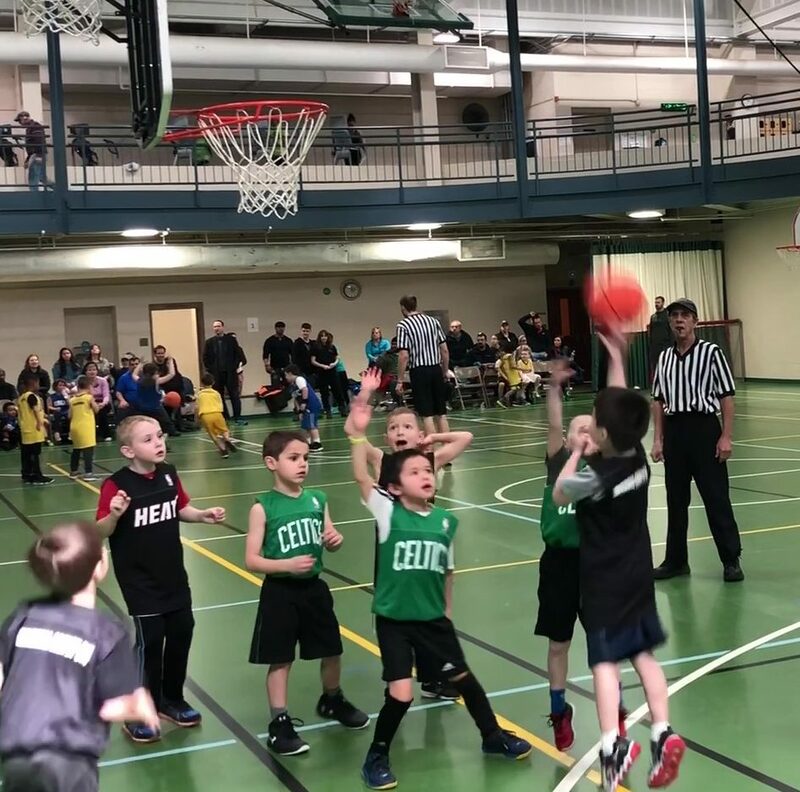 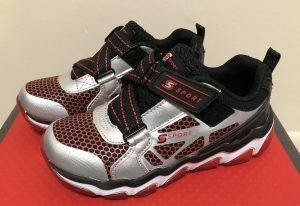 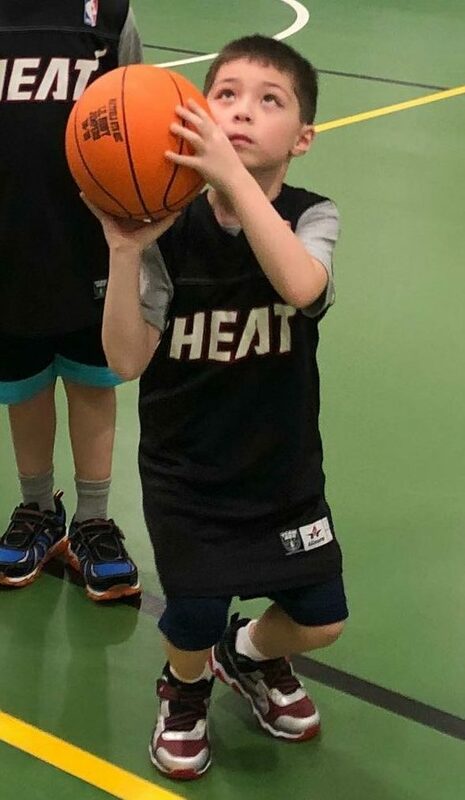 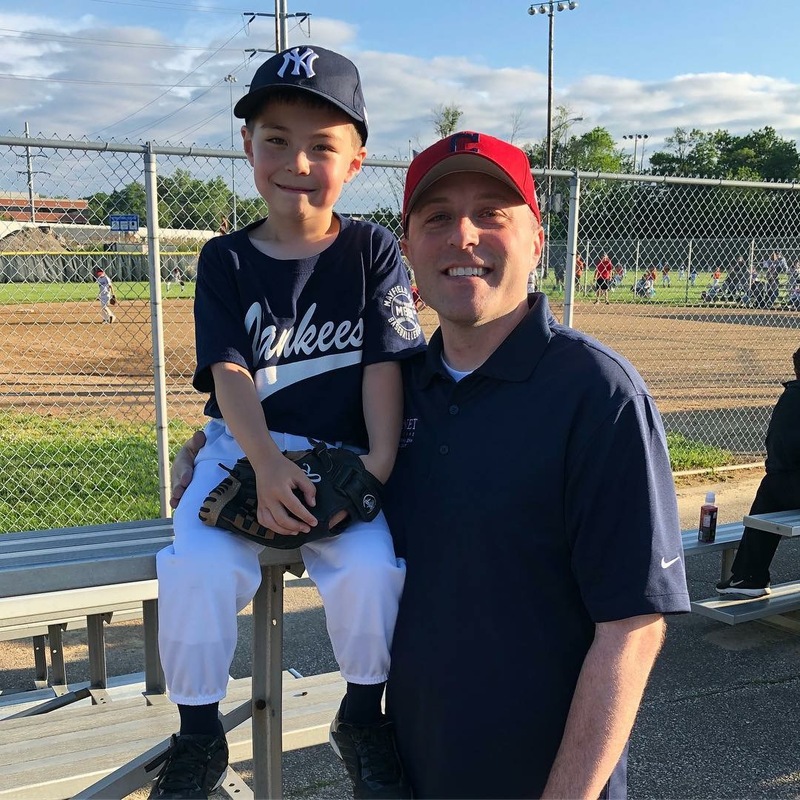 While most of the kids aren’t that into the games at such a young age, the league does give the kids their first taste of sports and being on a team. 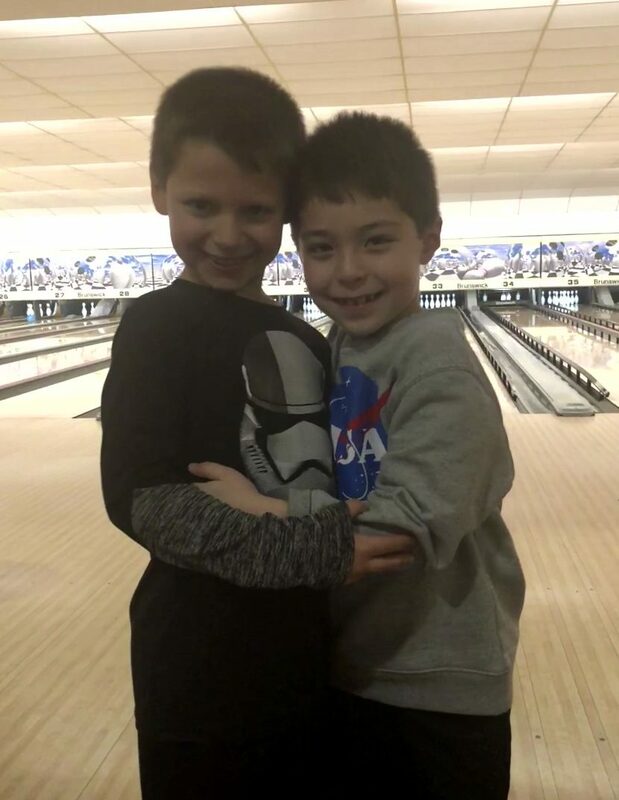 Alan is a member of the gray team and was happy to learn that his classmate, Dominic (the goalie in the first picture below), is on the gray team as well. 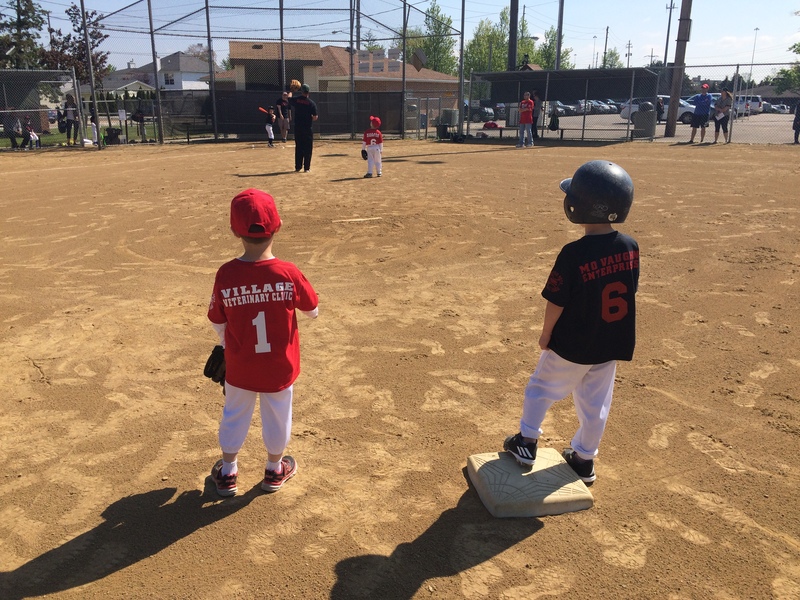 Alan’s friend and neighbor, Xavier, is also in the league, but plays for the red team. 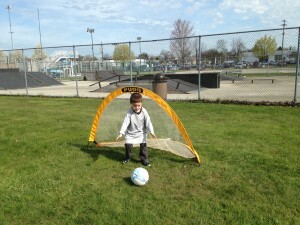 I’m getting to coach Alan this season and be with him out on the field. 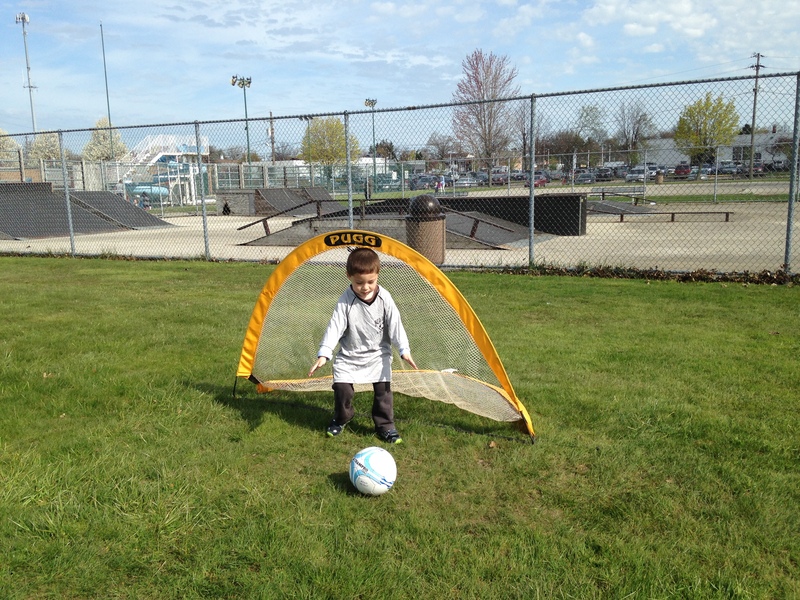 I’m proud of Alan for giving soccer a shot! 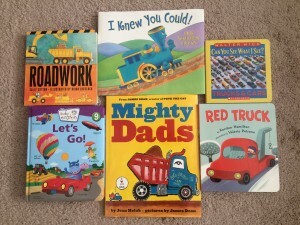 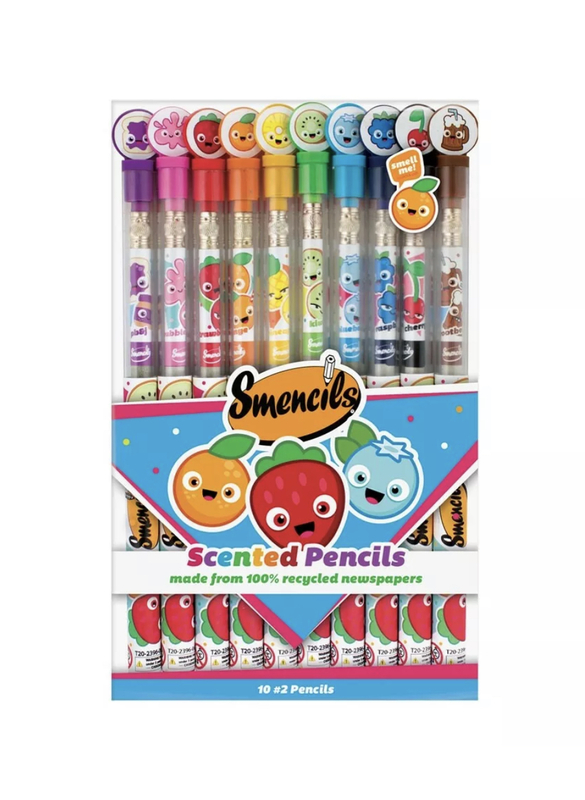 Six of Alan’s absolute favorites! 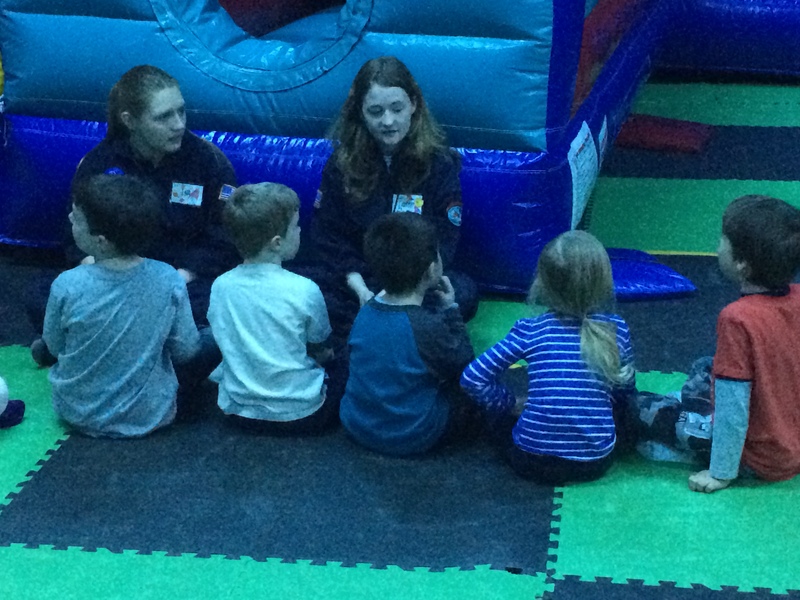 Today Alan went to a birthday party for Anthony (next to Alan above) at Zero Gravity Space Station in Eastlake. 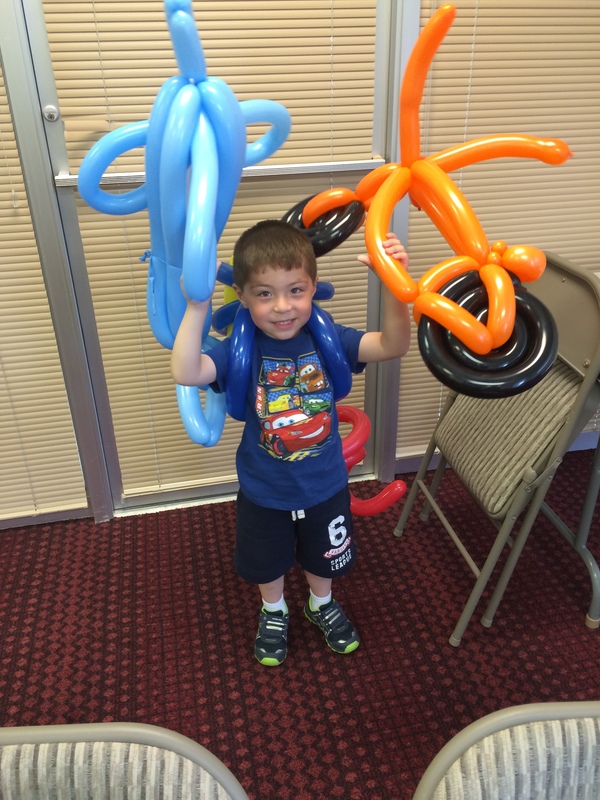 Alan enjoyed the day with his preschool classmates and had a blast on the inflatable slides. 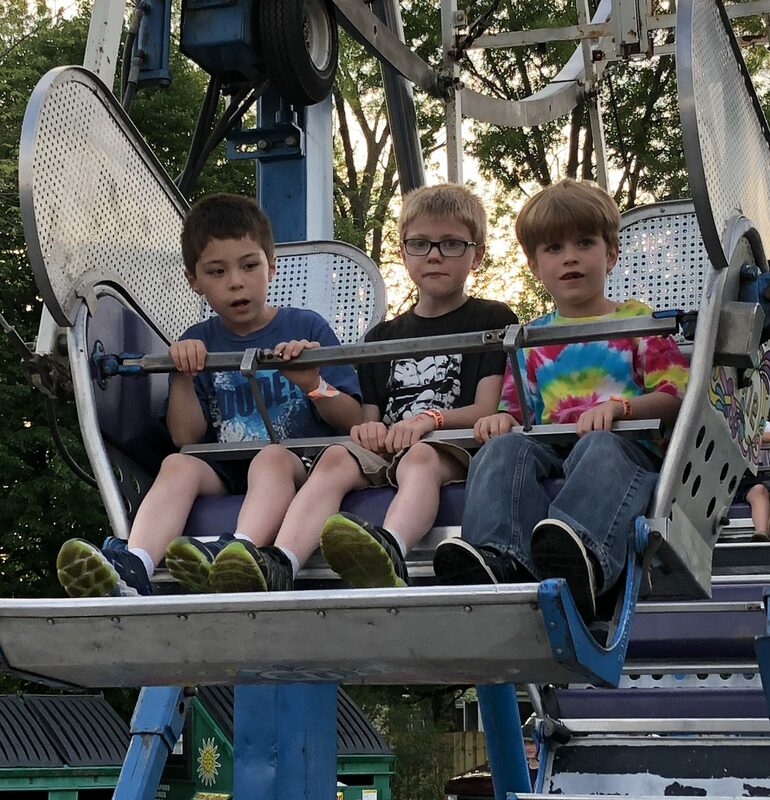 Alan was very happy Grady and Lilly (seated to his left and right below) were there too! 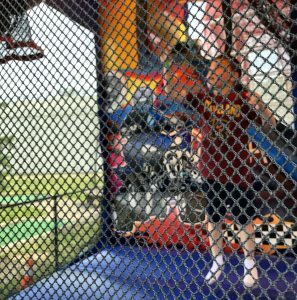 Alan in action on the inflatable slide (click for video). 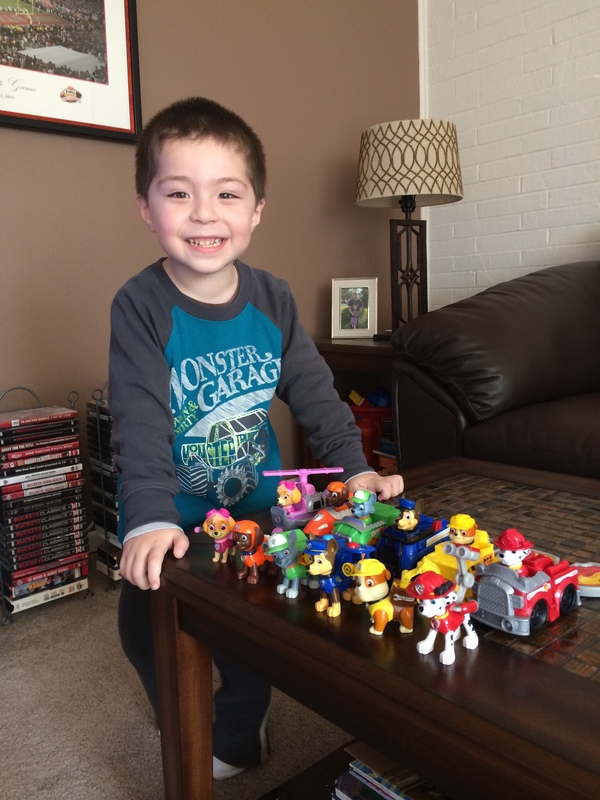 The biggest fan of Nick Jr.’s “Paw Patrol” now owns all 6 pup characters–including their badges–and couldn’t be happier. 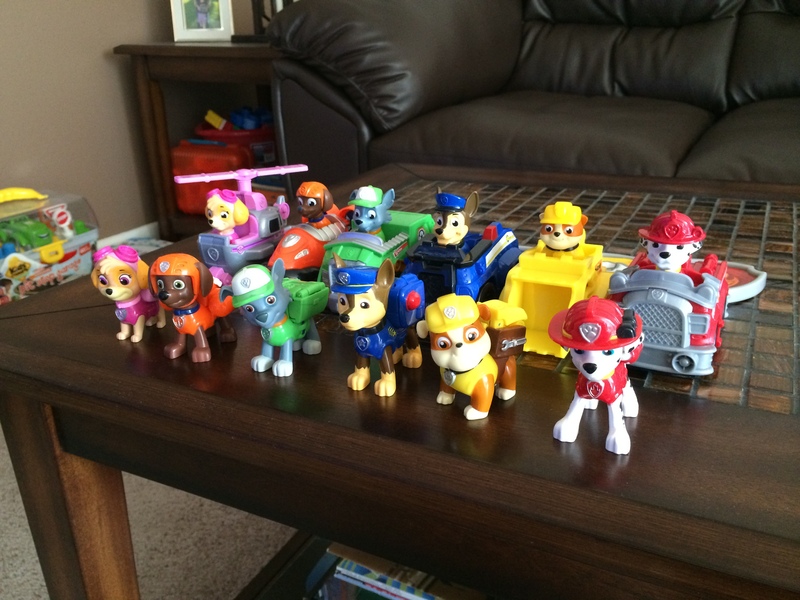 Marshall (red), Chase (blue), & Rubble (yellow) were easy to find in stores; Zuma (orange) was a little tougher. 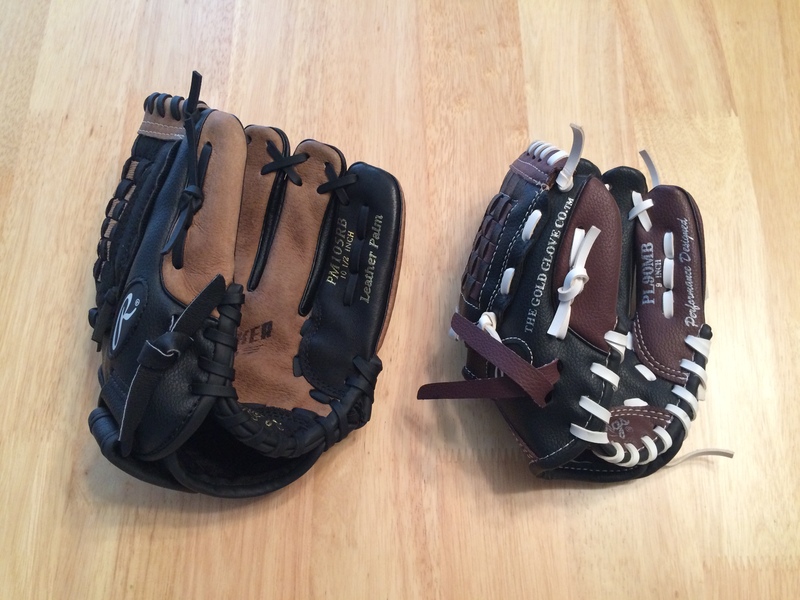 Rocky (green) & Skye (pink) were impossible to find, so we bought them on eBay. 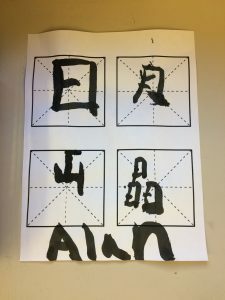 The last two days Alan learned that the mail only comes once per day, and it can feel like forever to wait for that time. 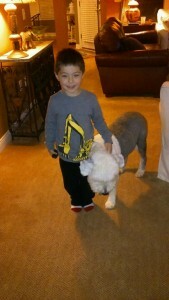 But he managed, and yesterday he was overjoyed to open up the mailbox and see Skye! He even used his new cutting skills to open up the package. Alan lined up the characters on the coffee table according to the order in which they appear during the show’s into. 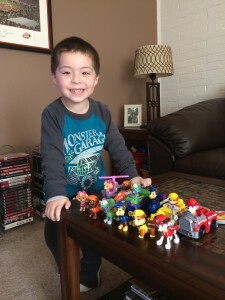 He loves to look at them while he sings along with the show’s theme song (He remembers most of the words).